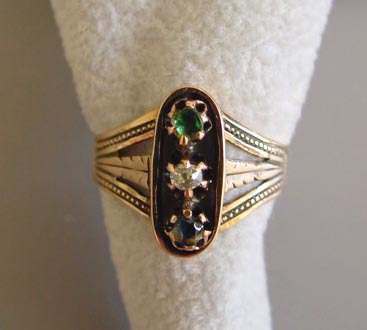 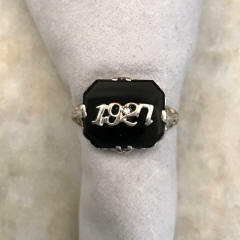 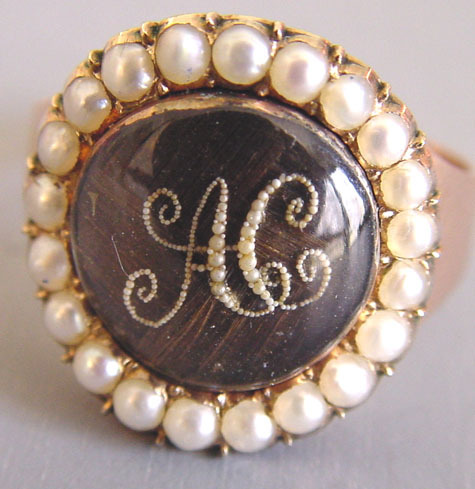 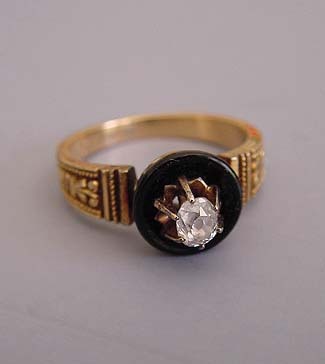 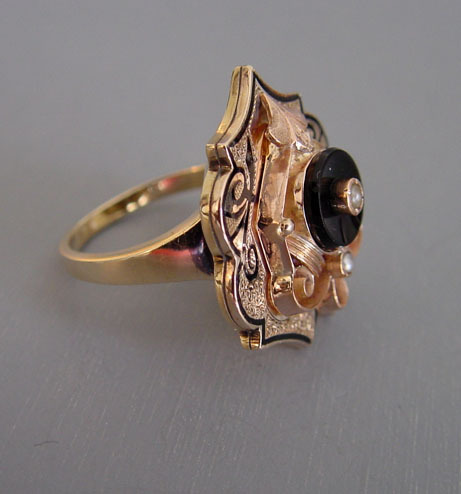 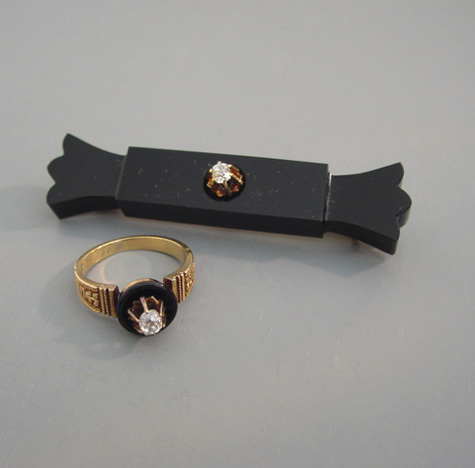 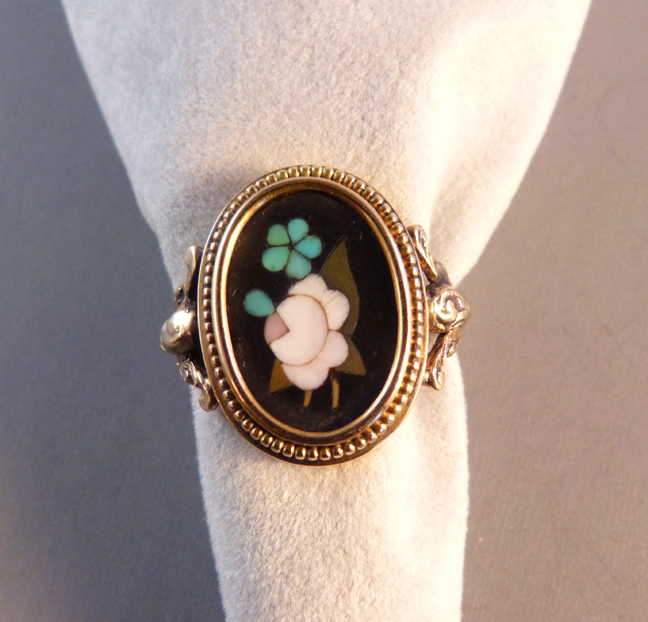 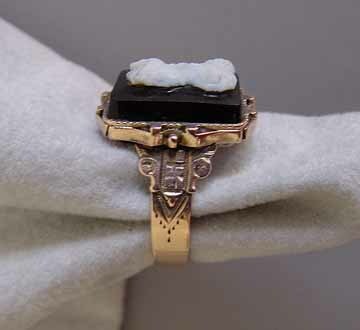 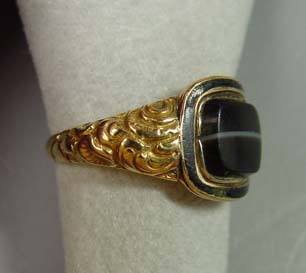 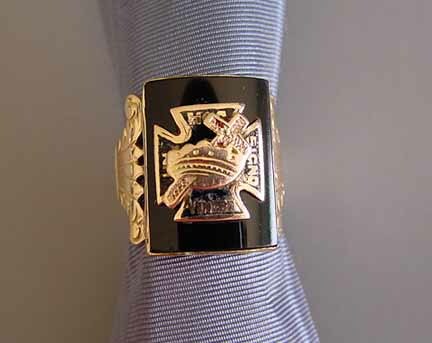 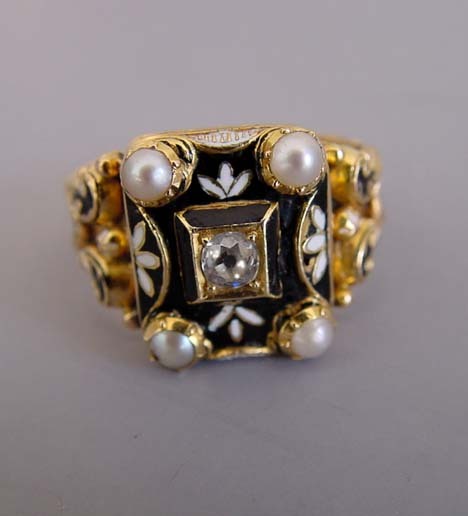 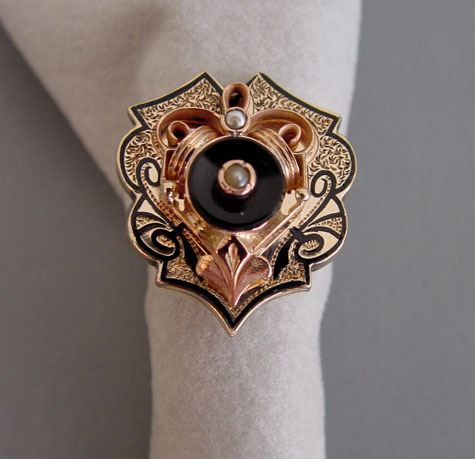 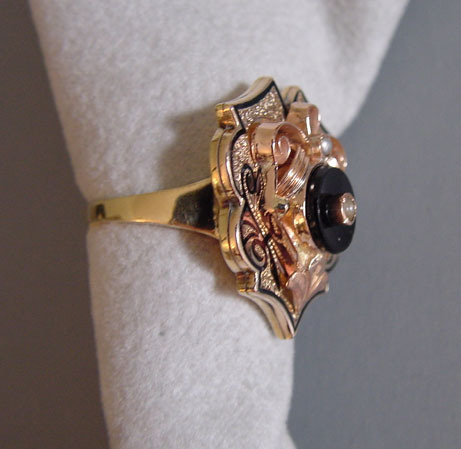 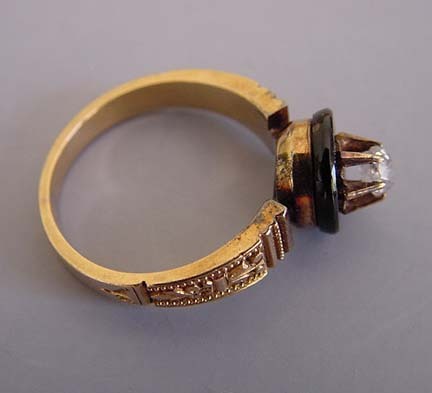 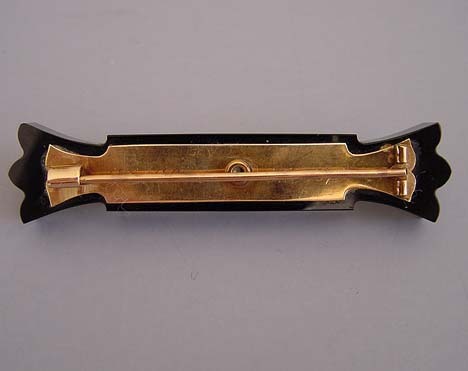 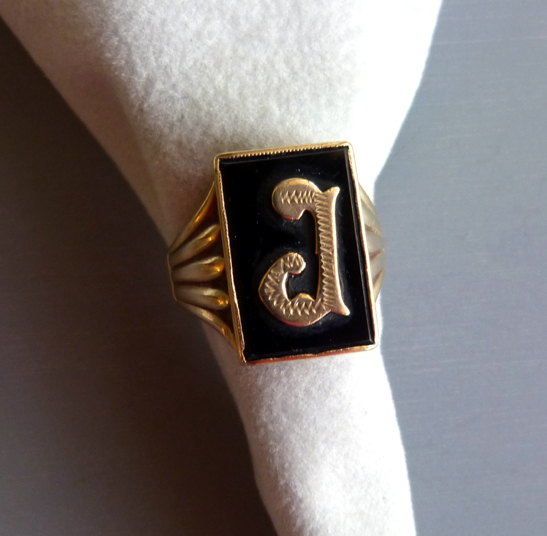 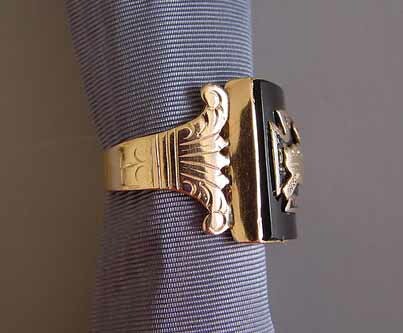 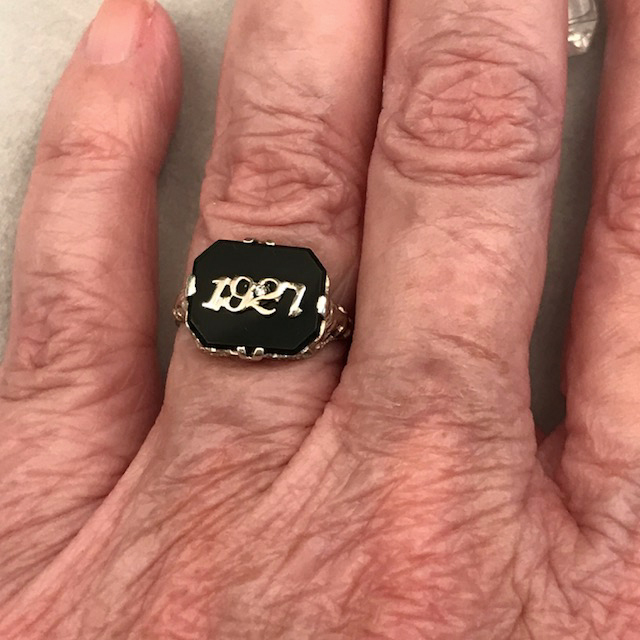 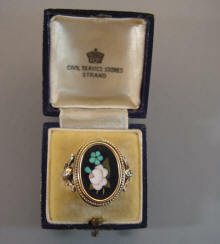 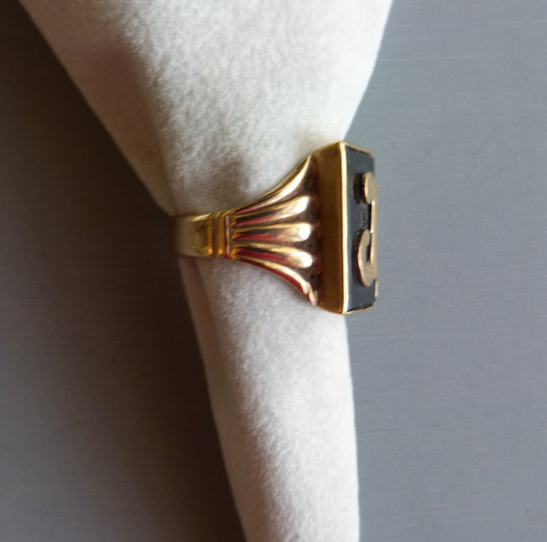 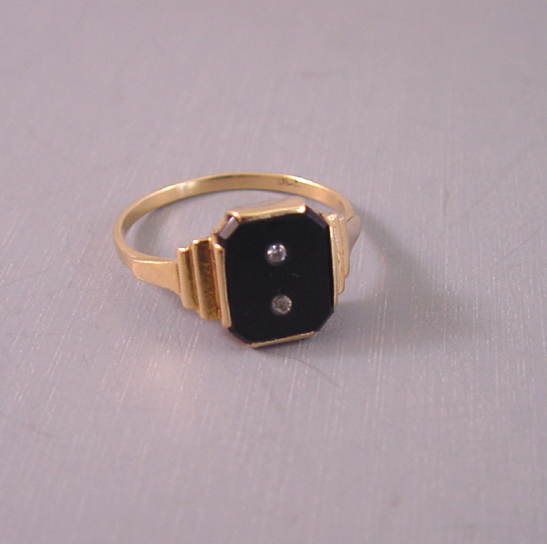 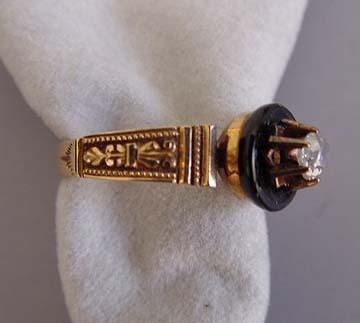 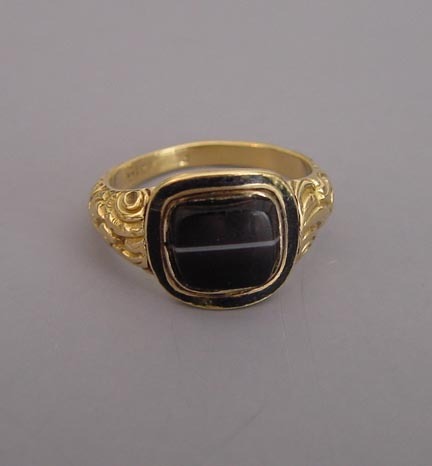 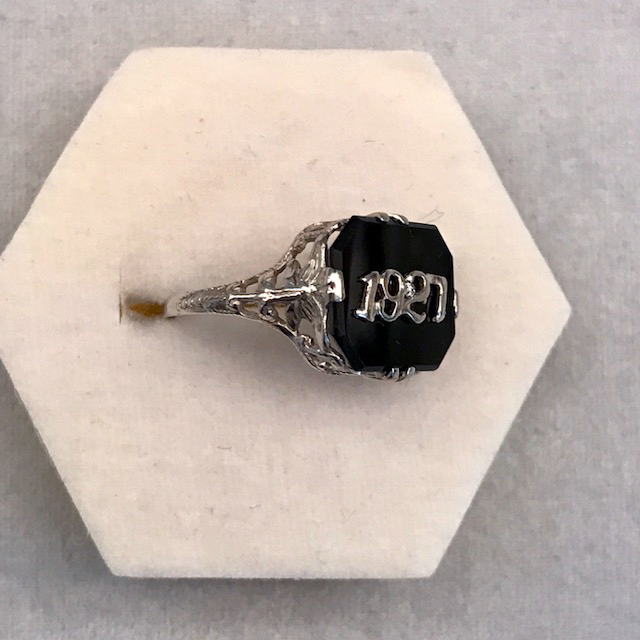 VICTORIAN Civil War era 1876 McClure ring and bar pin set with provenance: a 12 karat yellow gold, mine cut diamond and black onyx (dyed black chalcedony) bar pin and ring engraved "A.K.Mc to E.G. 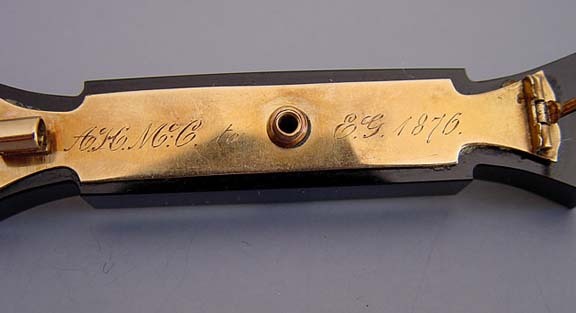 1876". 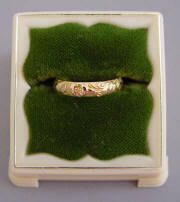 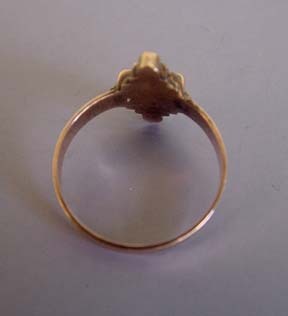 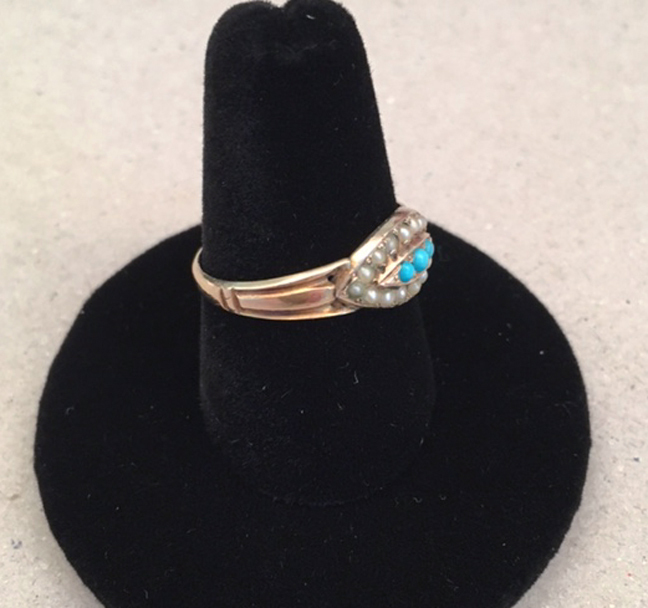 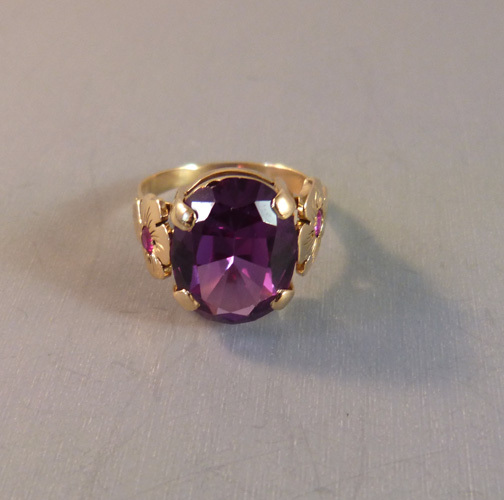 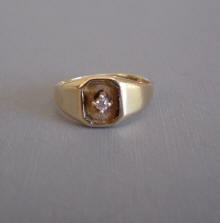 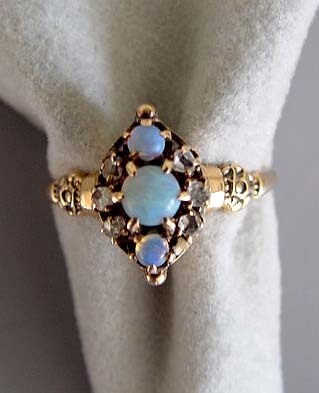 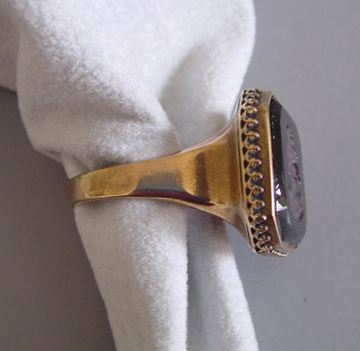 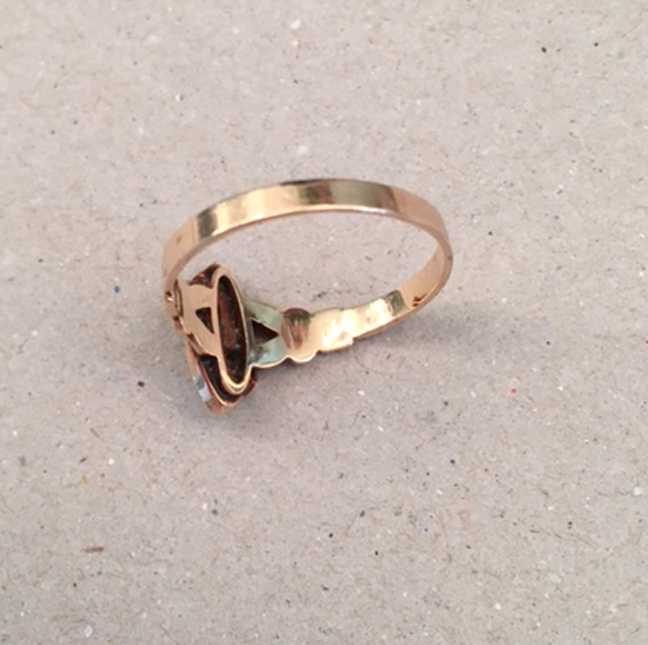 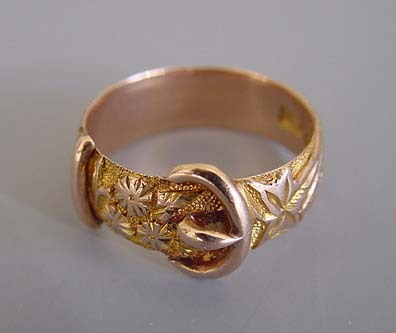 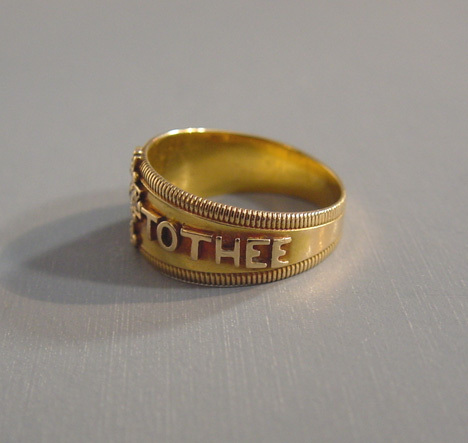 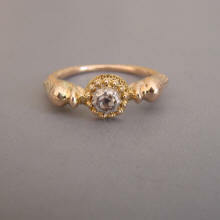 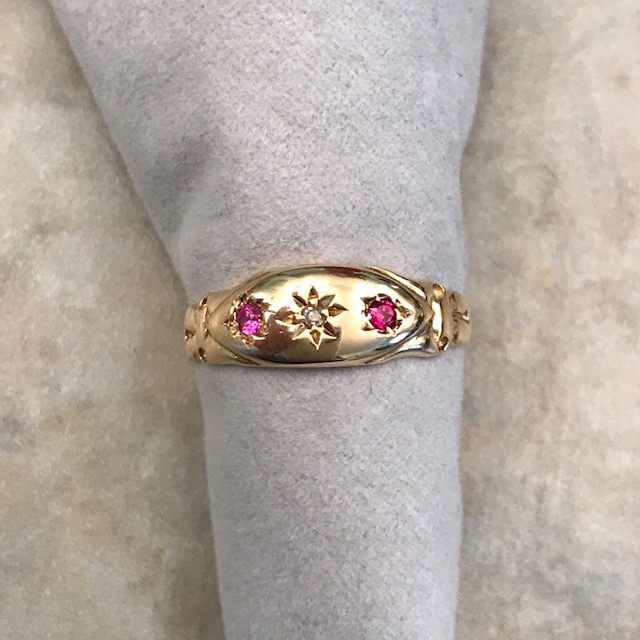 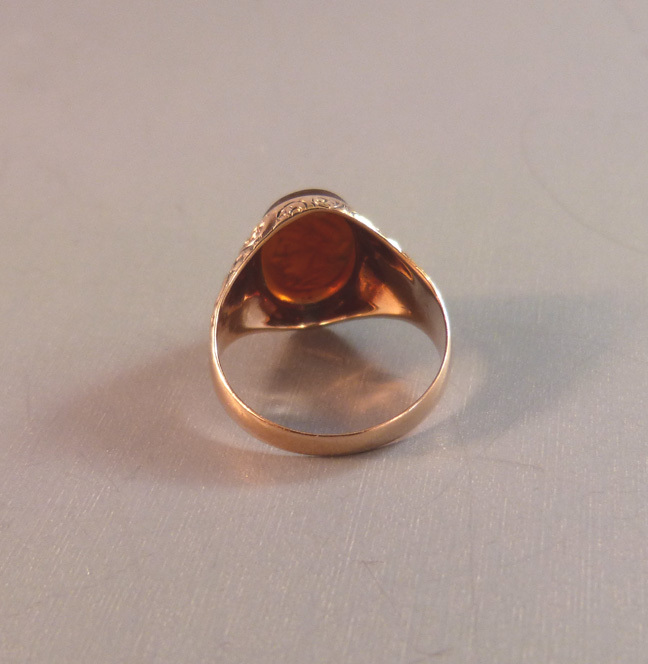 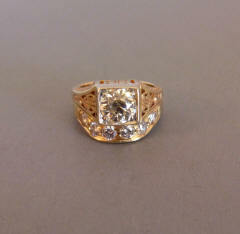 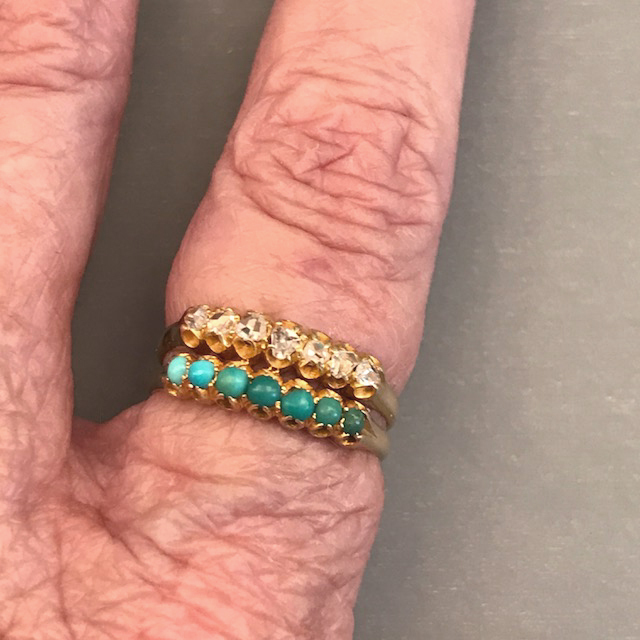 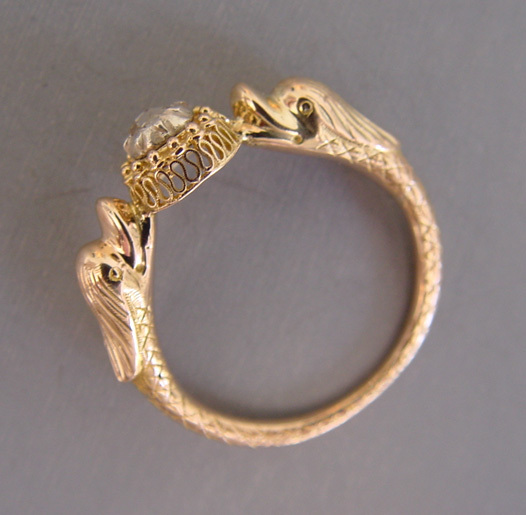 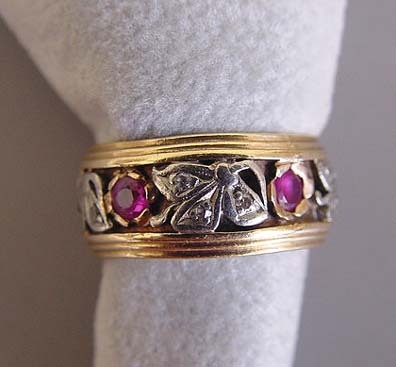 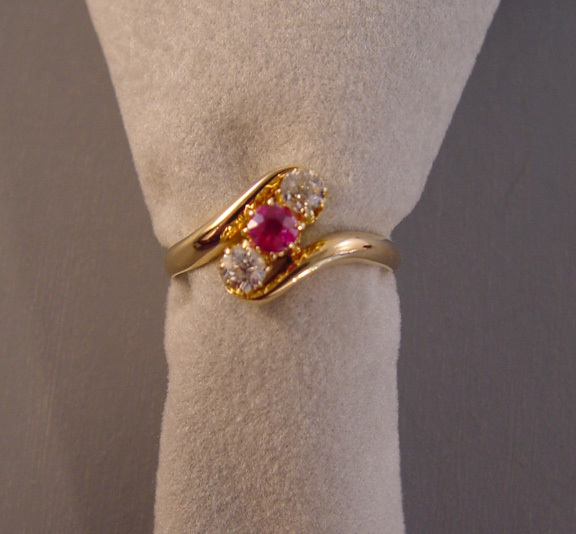 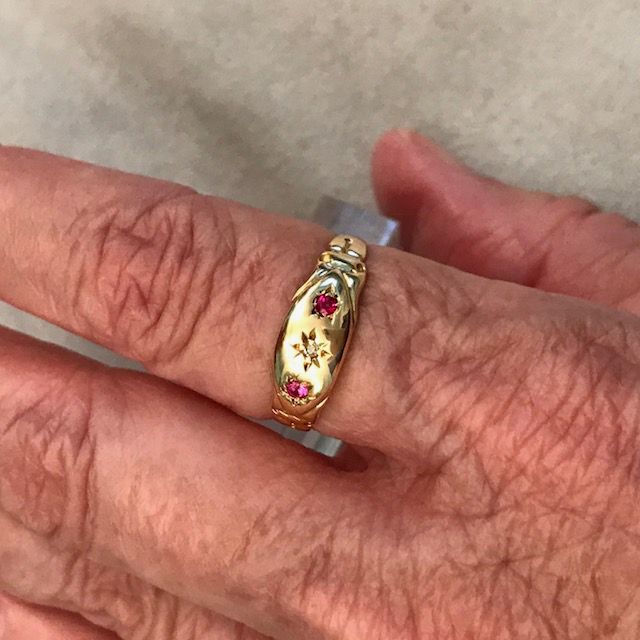 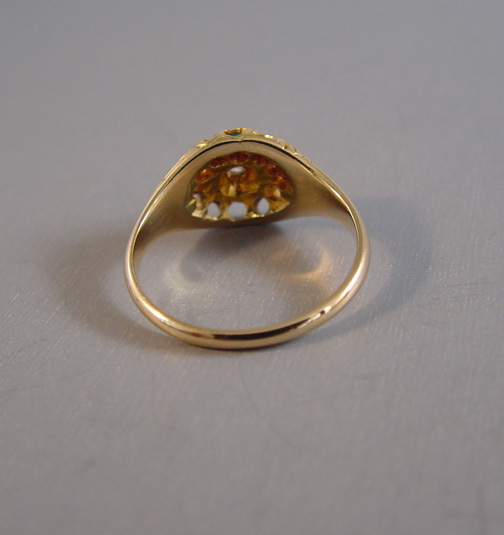 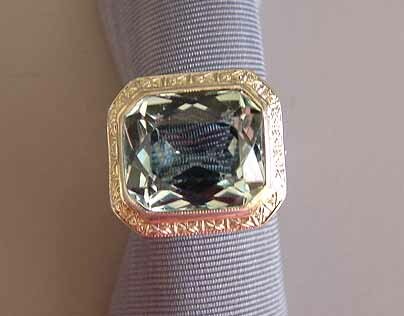 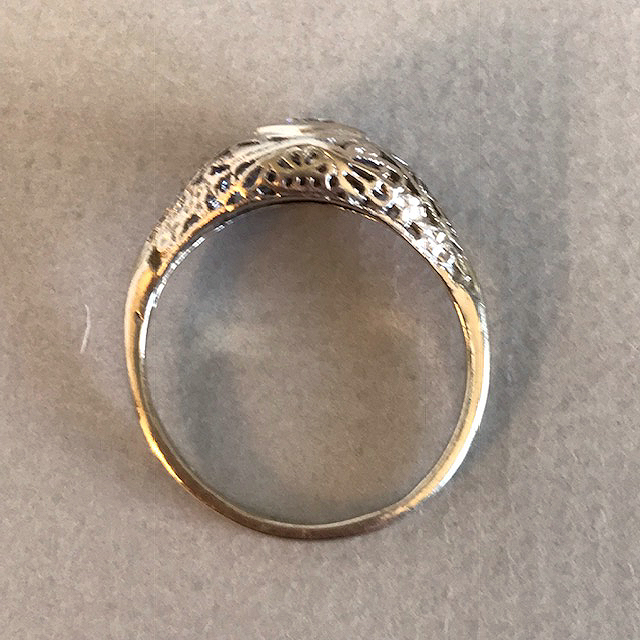 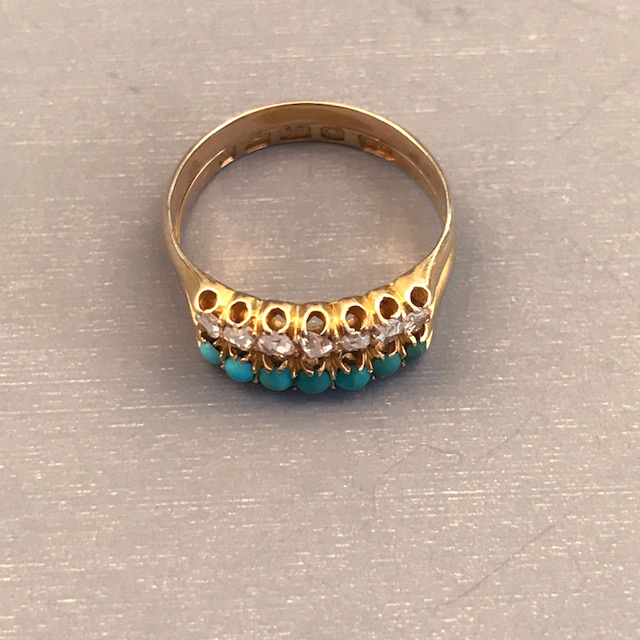 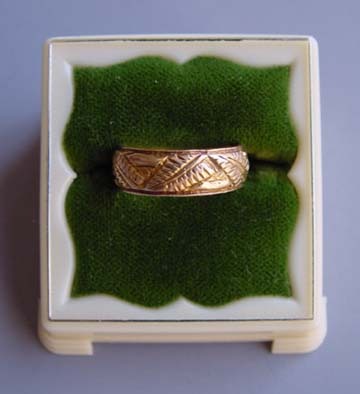 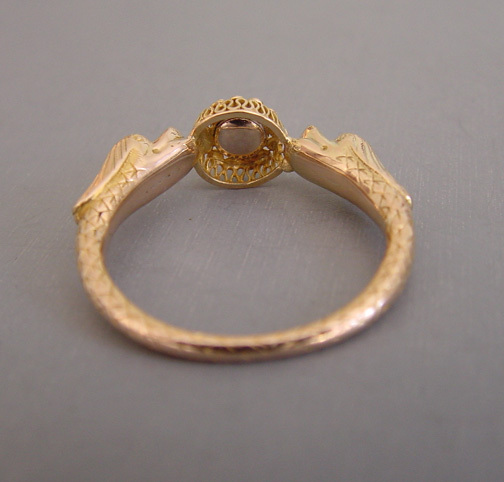 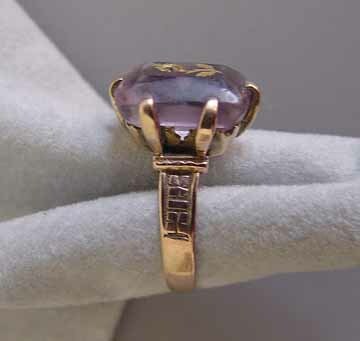 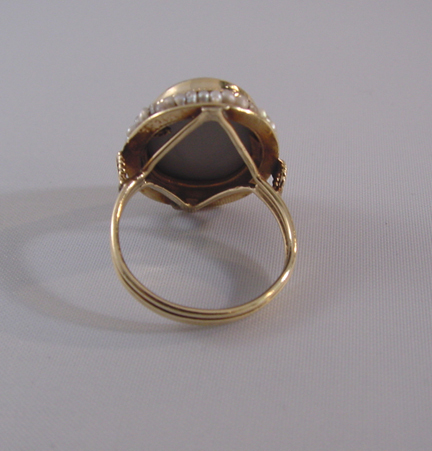 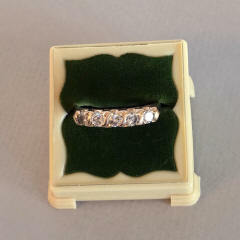 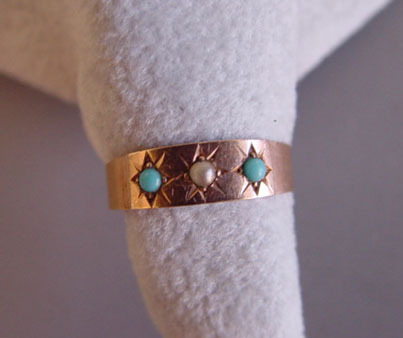 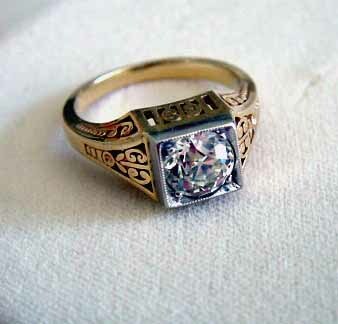 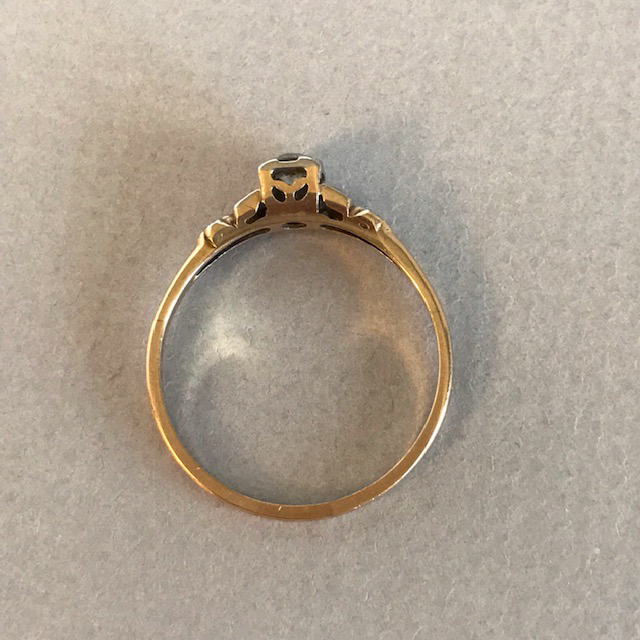 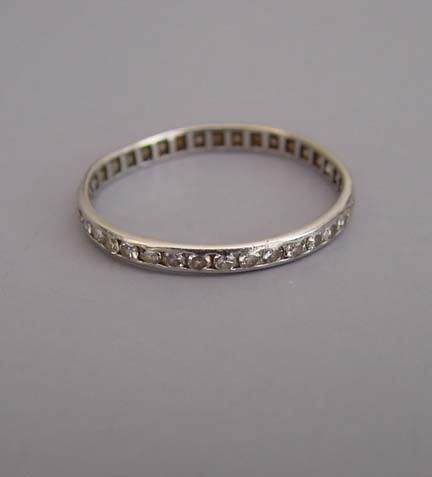 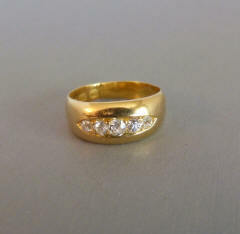 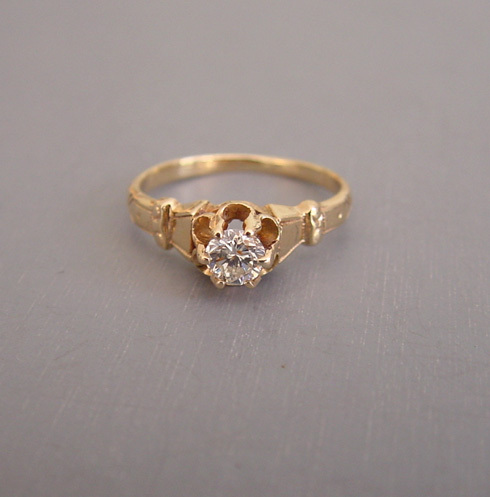 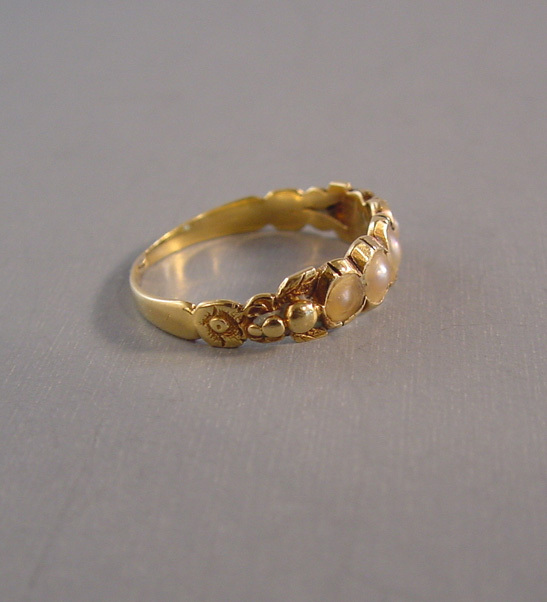 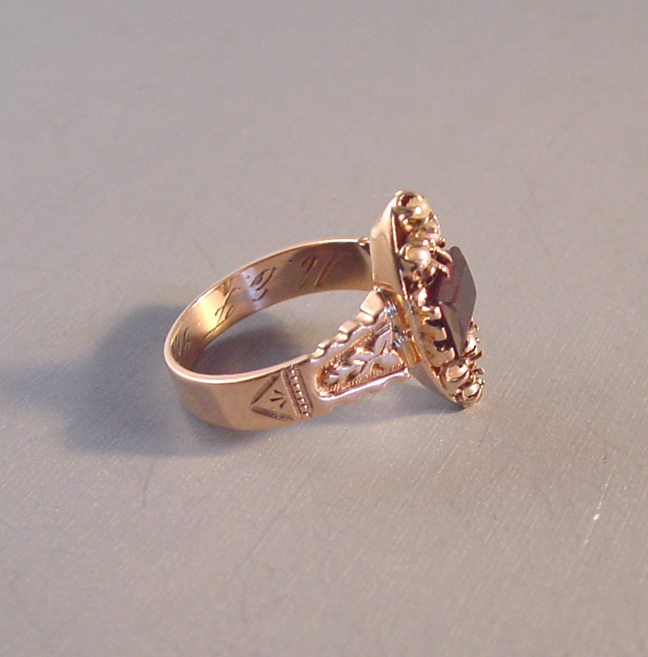 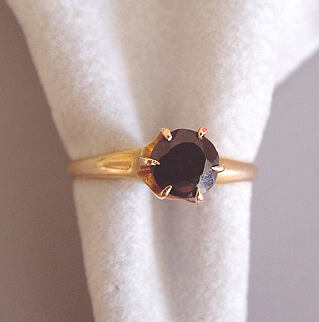 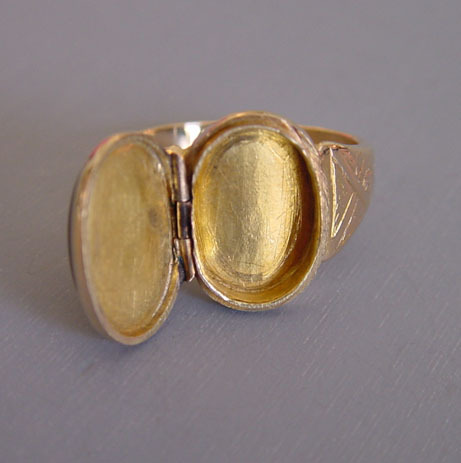 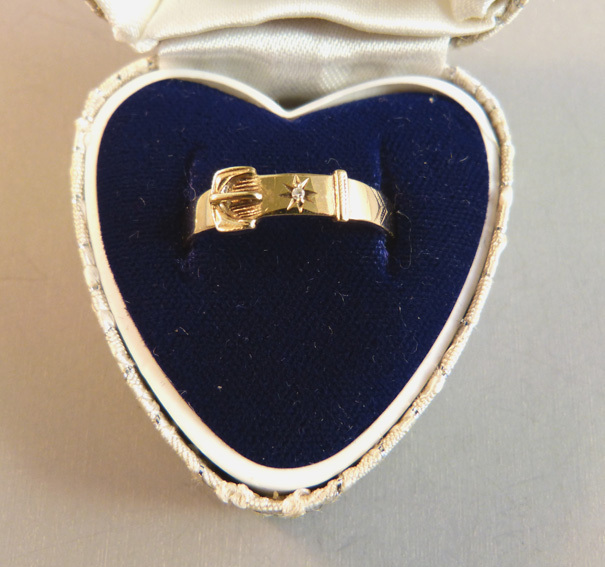 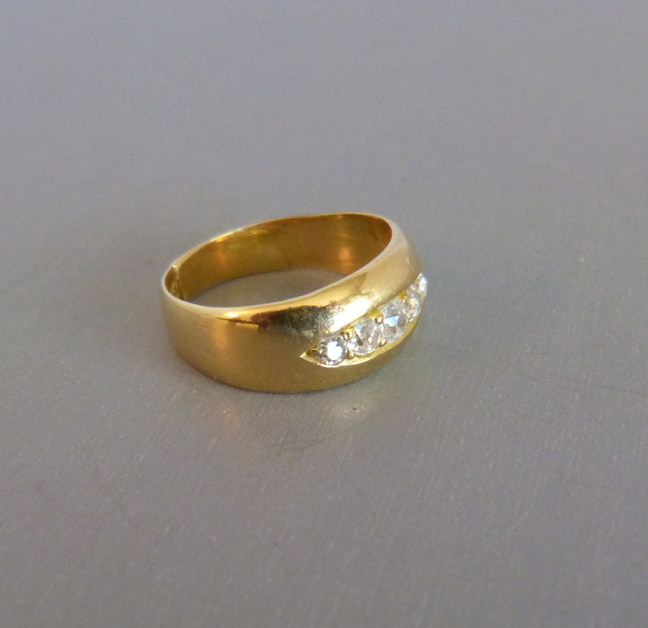 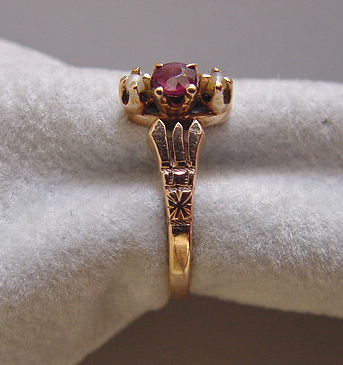 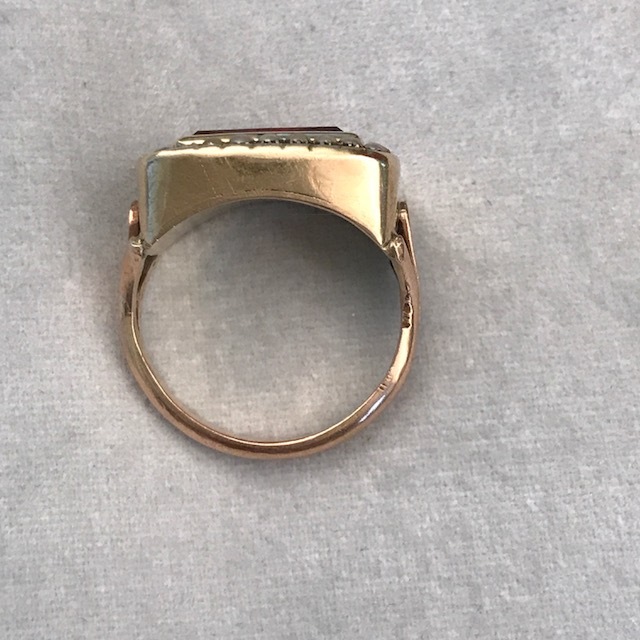 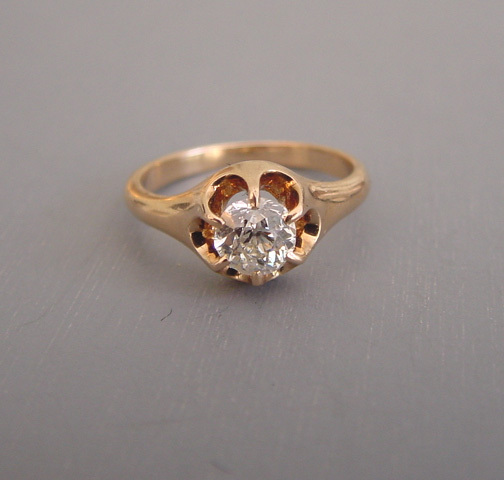 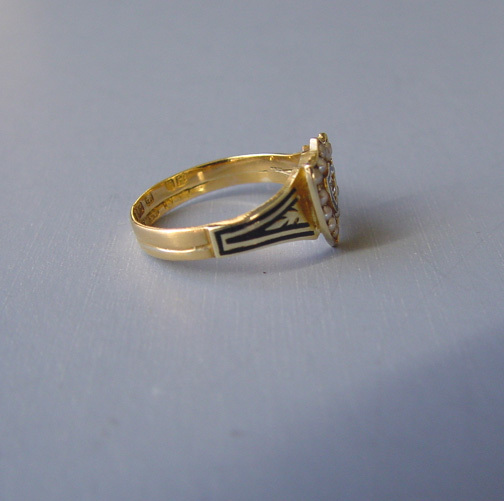 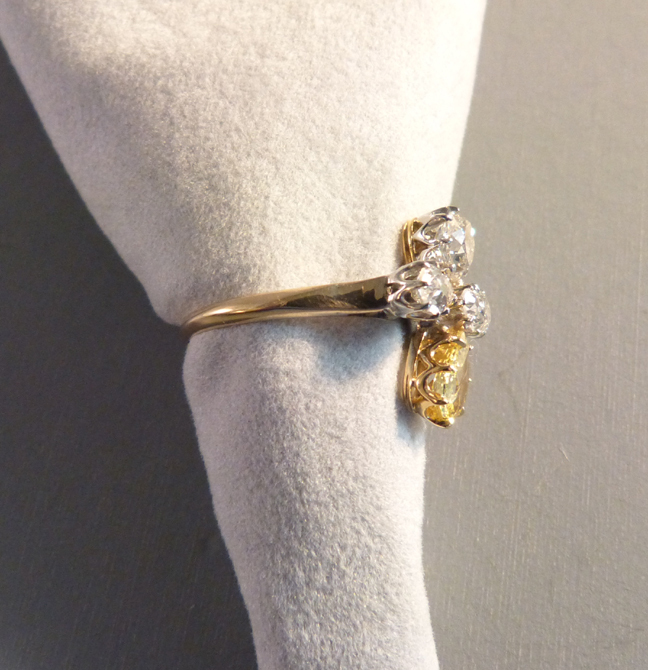 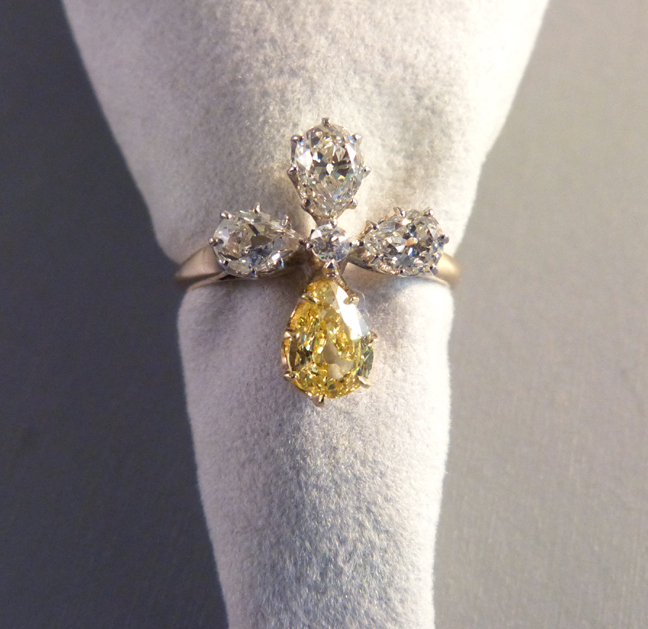 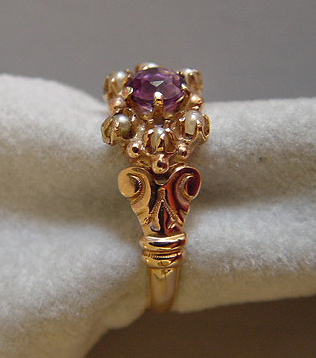 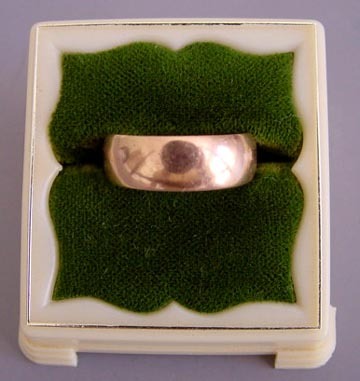 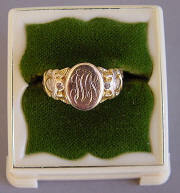 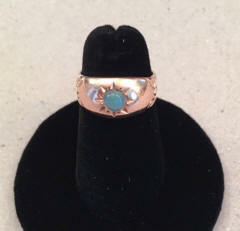 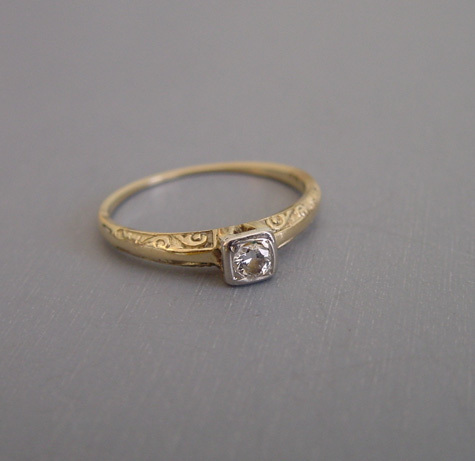 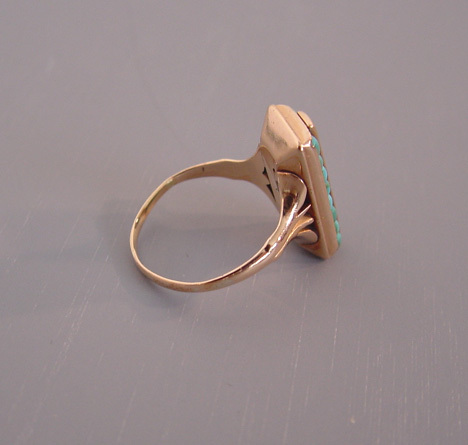 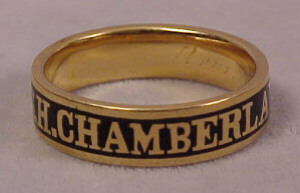 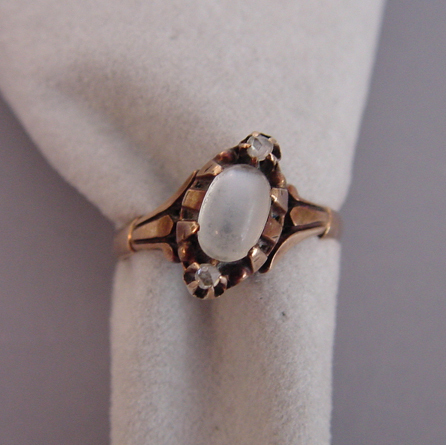 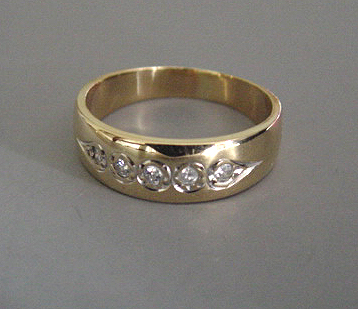 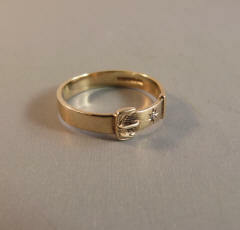 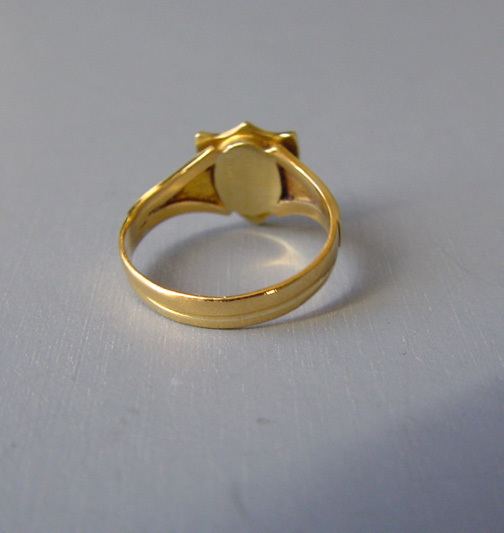 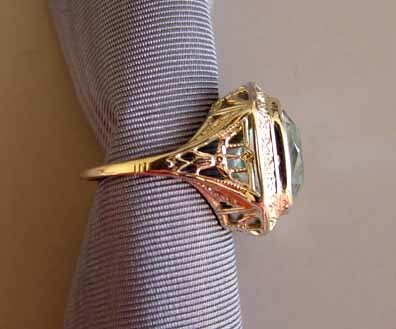 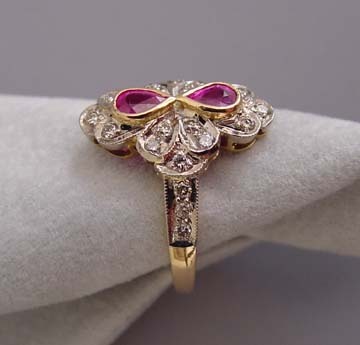 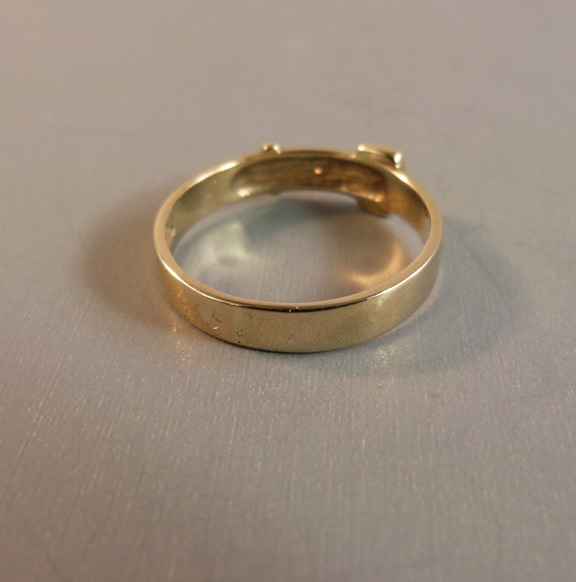 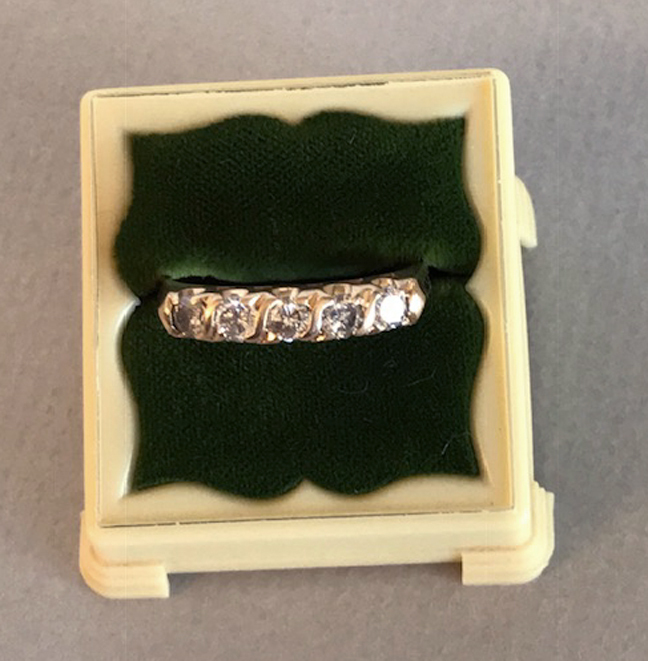 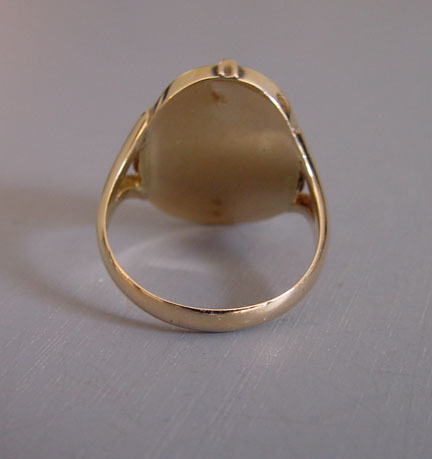 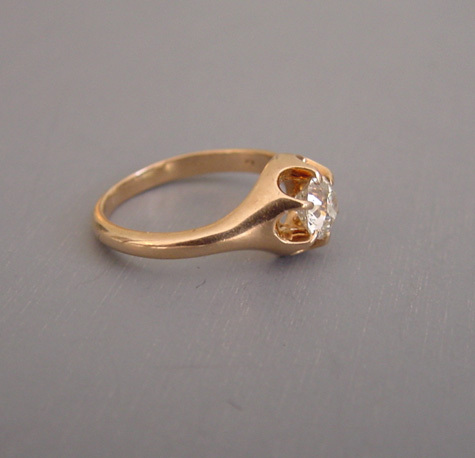 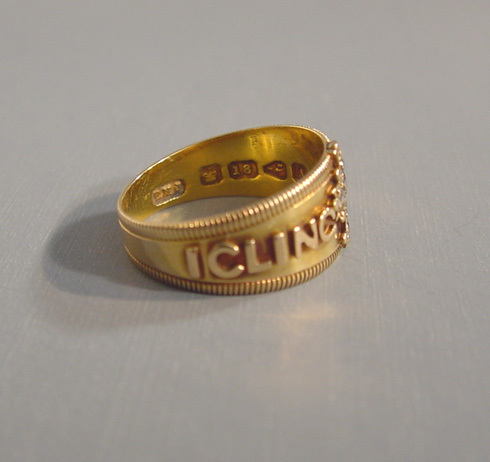 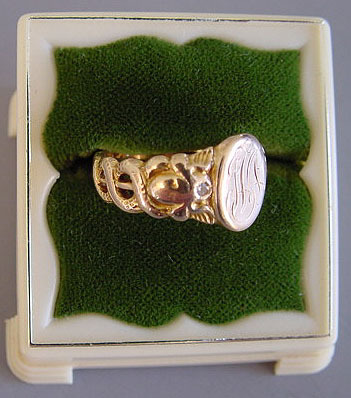 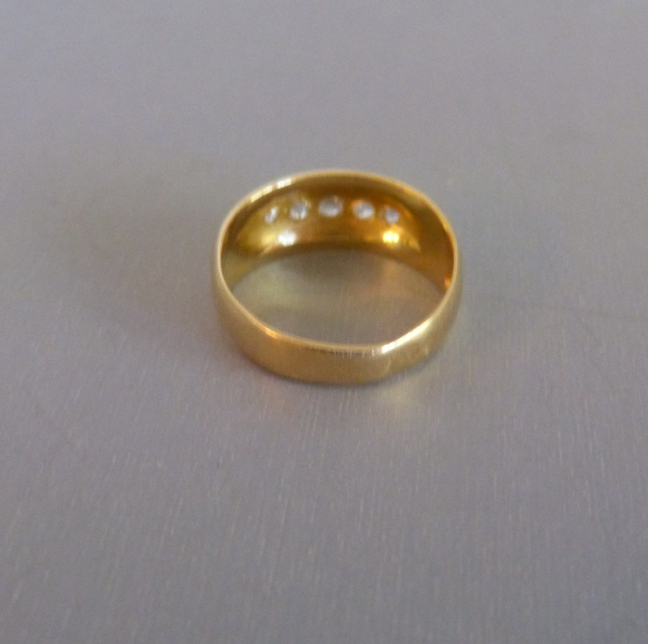 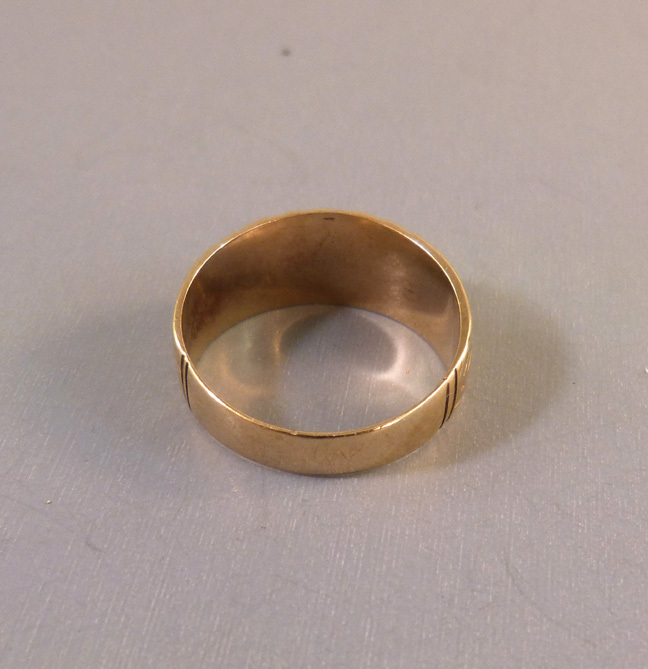 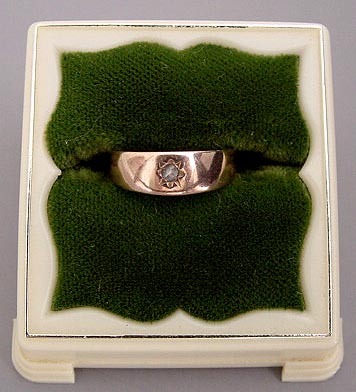 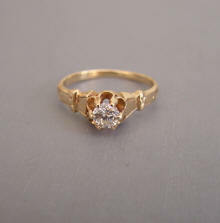 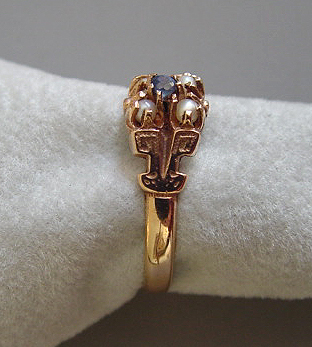 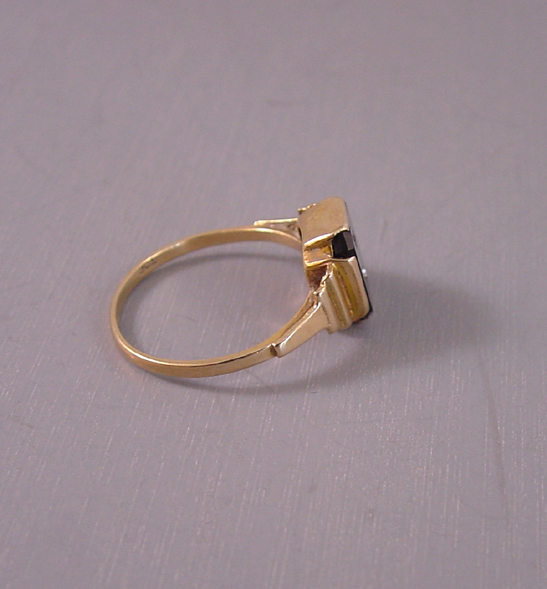 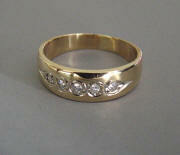 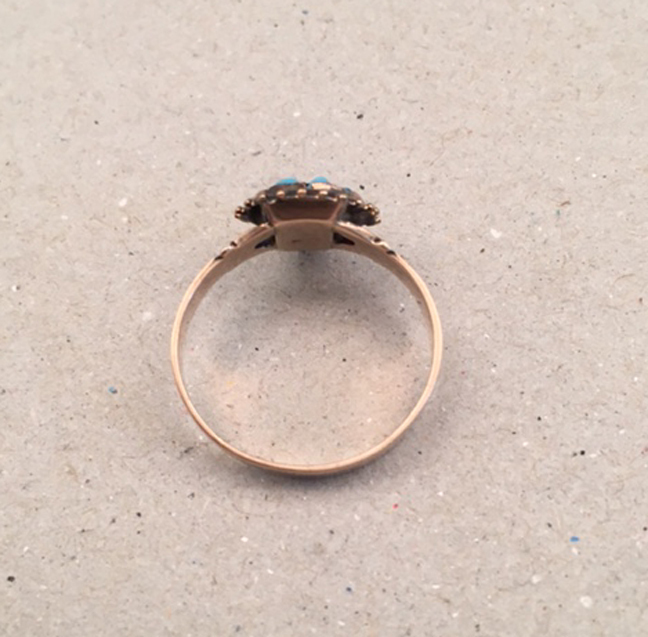 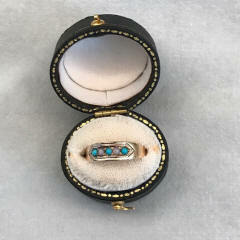 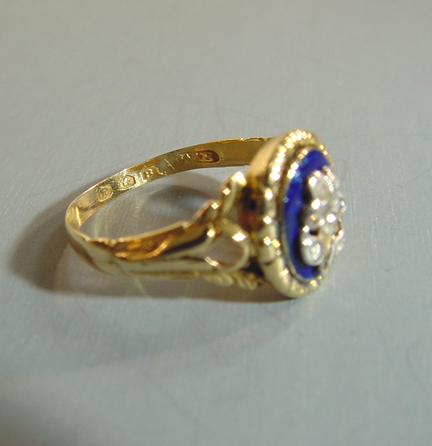 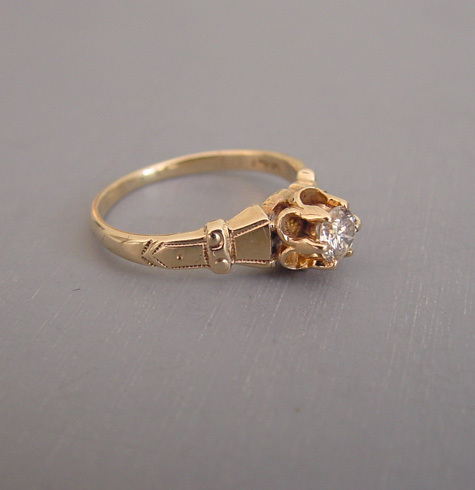 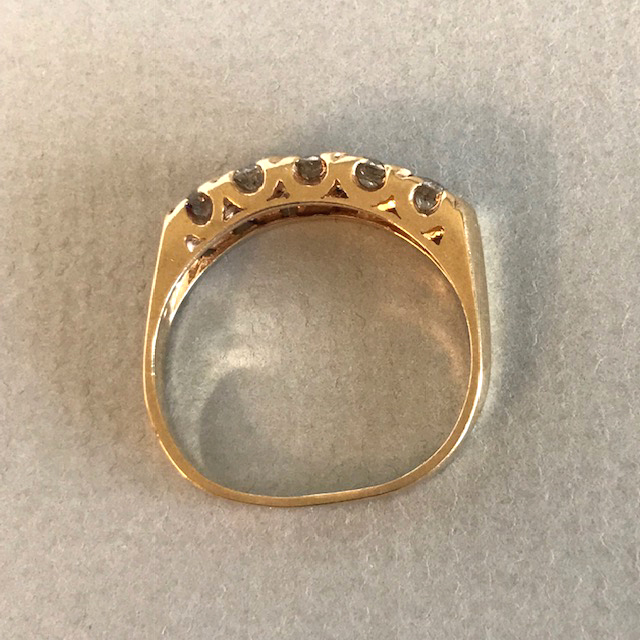 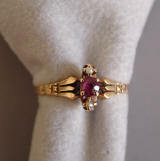 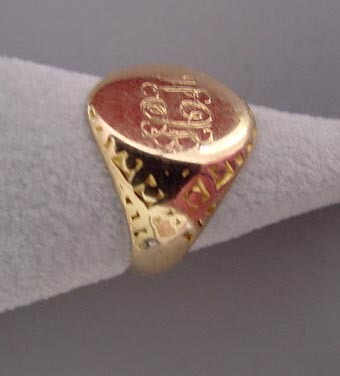 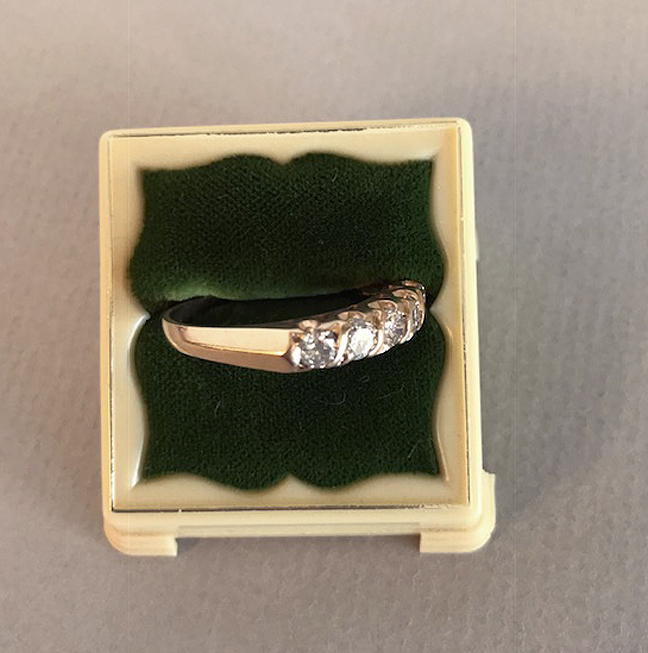 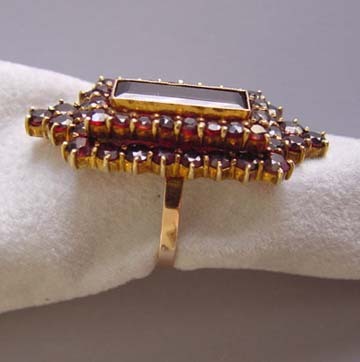 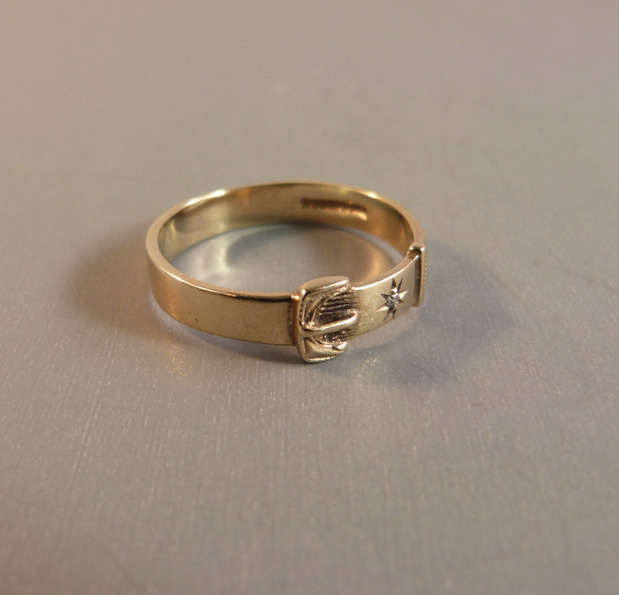 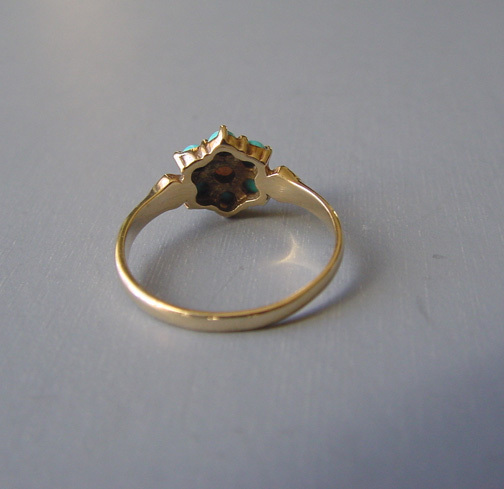 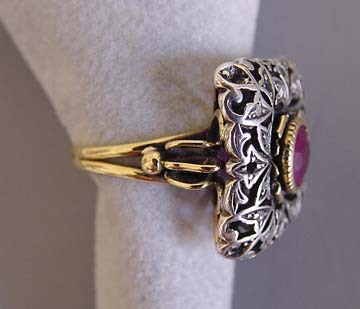 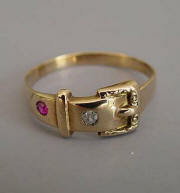 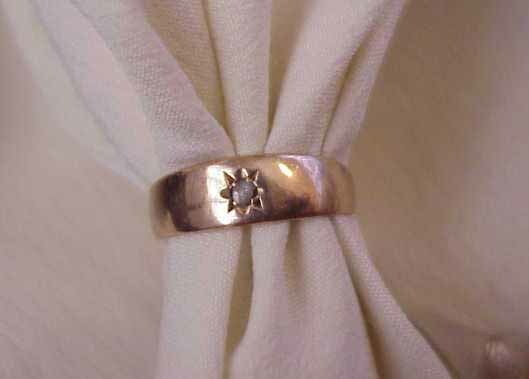 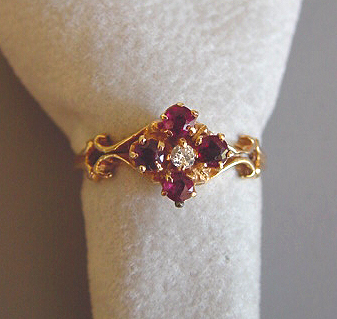 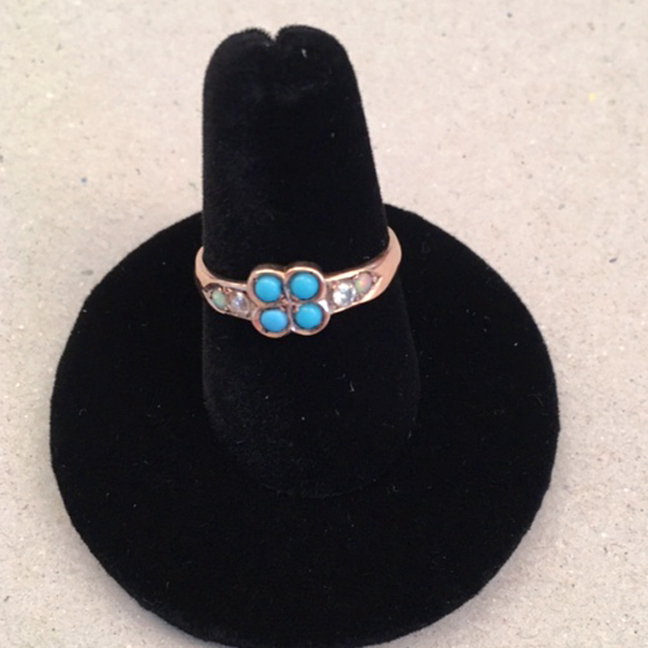 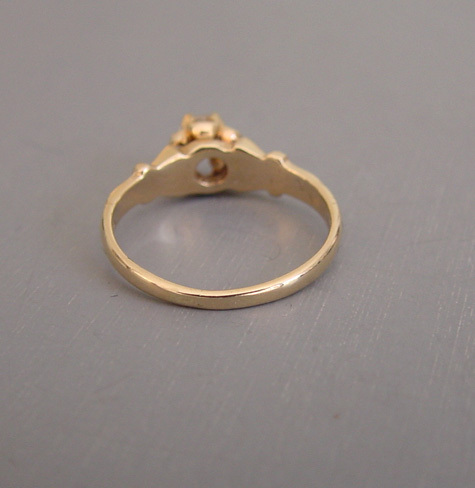 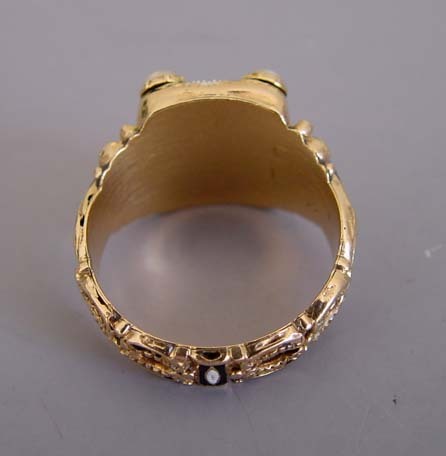 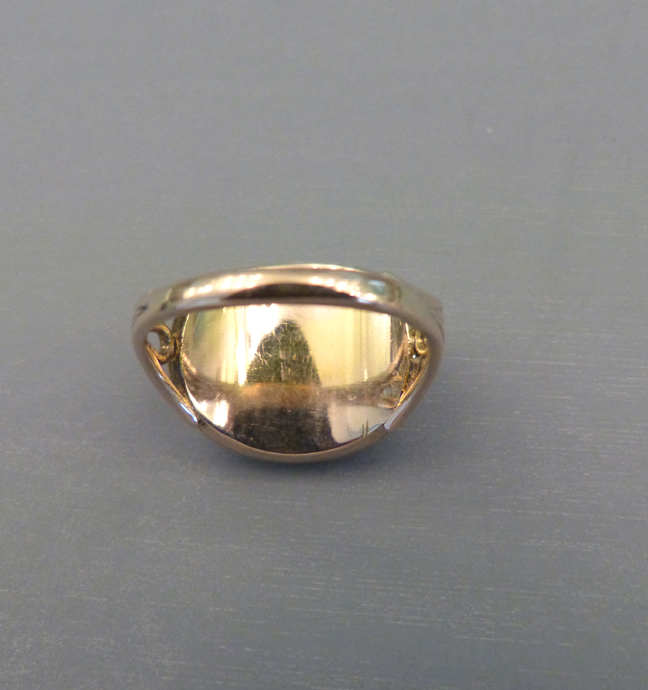 The ring is a 12 karat yellow gold size 7-1/4, has been sized in the past. 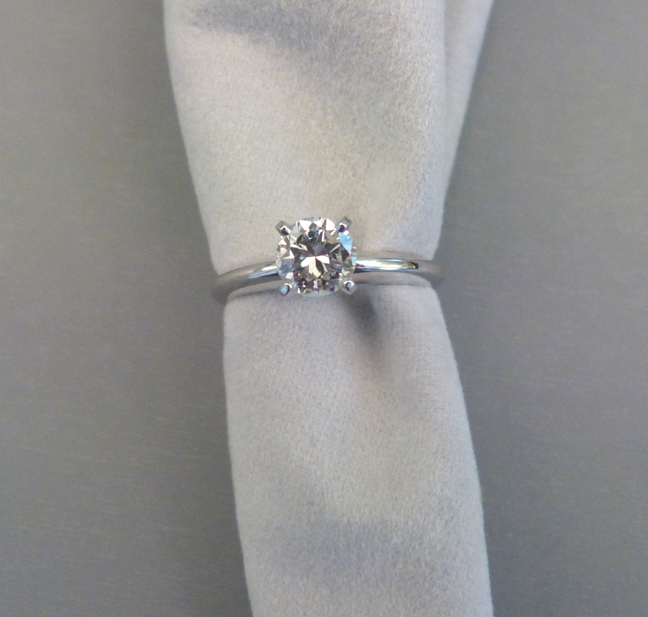 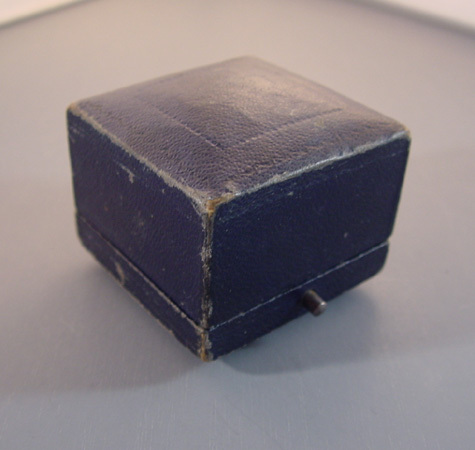 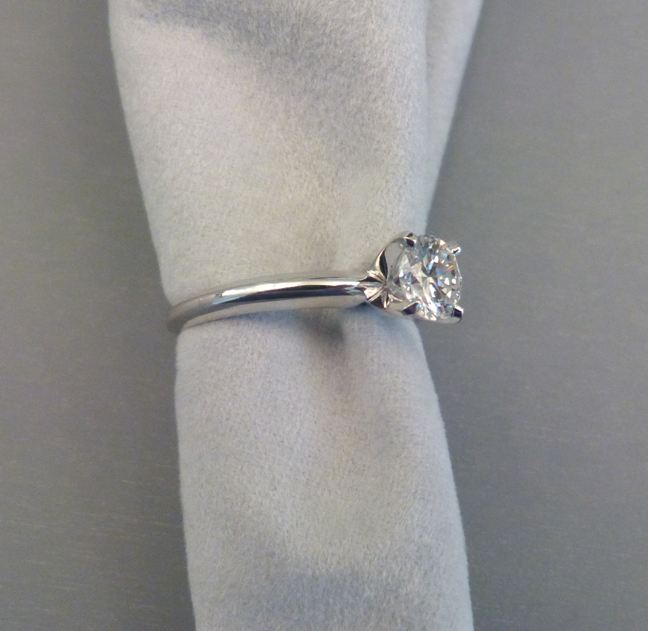 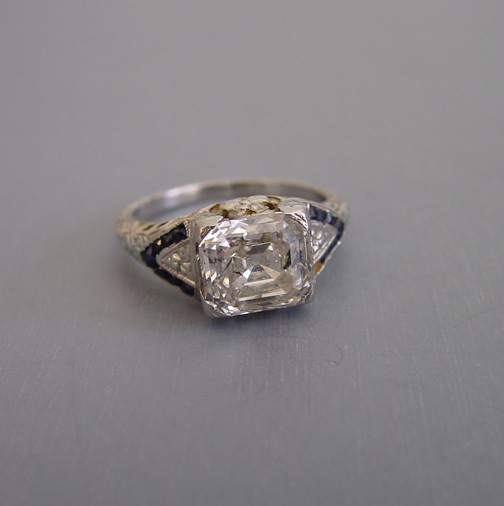 The diamond is a cushion shaped mine cut approximately 4.0 x 3.5 x 2.5 mm. 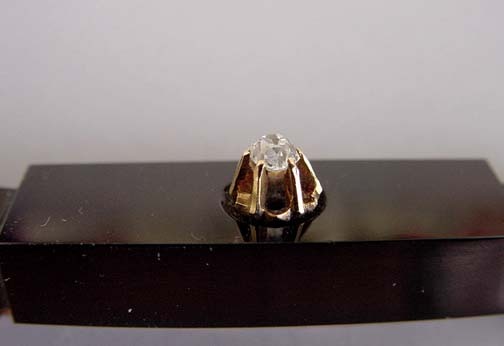 and about 0.25 carats, color I, clarity I-1 with a shallow chip under one prong visible under magnification. 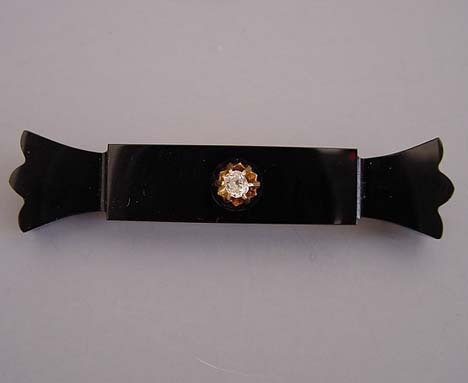 The brooch is 12k yellow gold, cushion shaped mine cut diamond and black onyx (dyed black chalcedony) bar pin engraved "A.K.Mc to E.G. 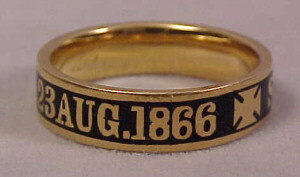 1876". 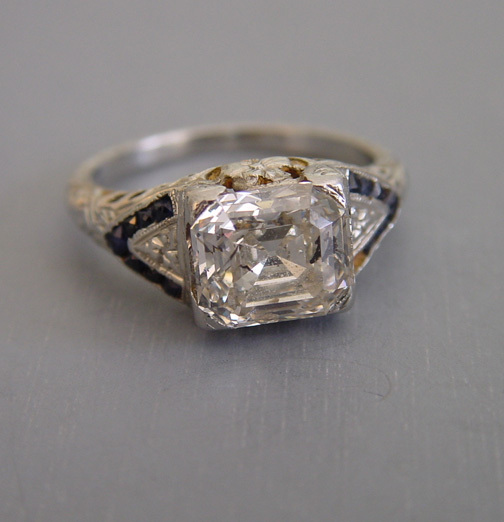 The diamond is approximately 3.2-3.8 x 2.55 mm, about 0.20 carats. 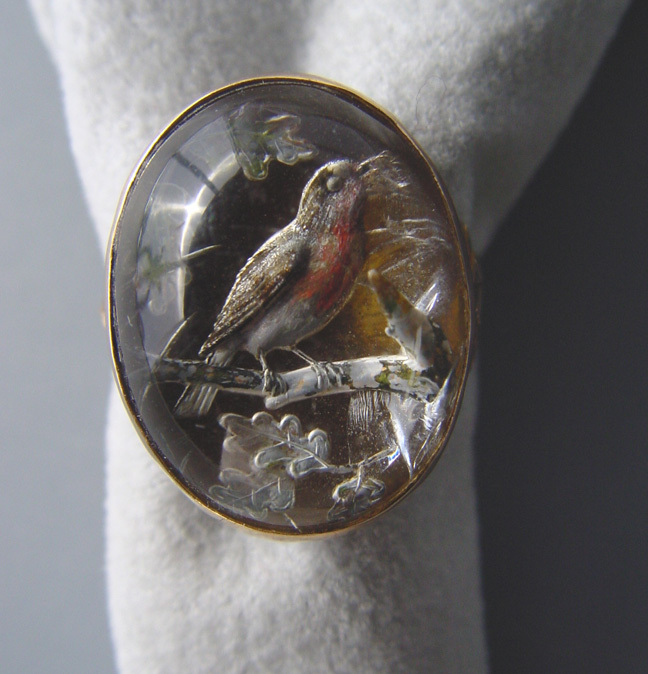 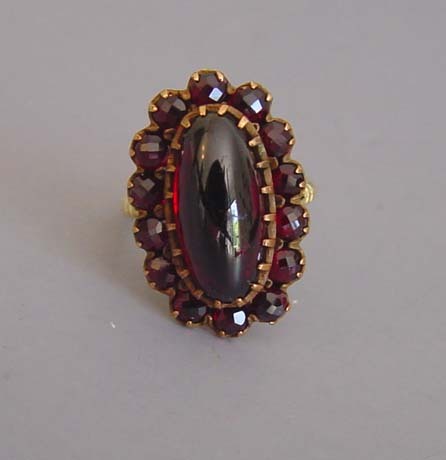 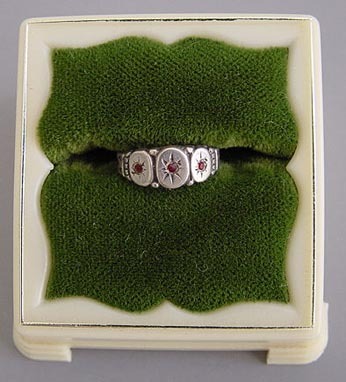 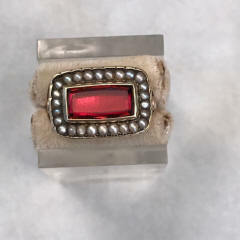 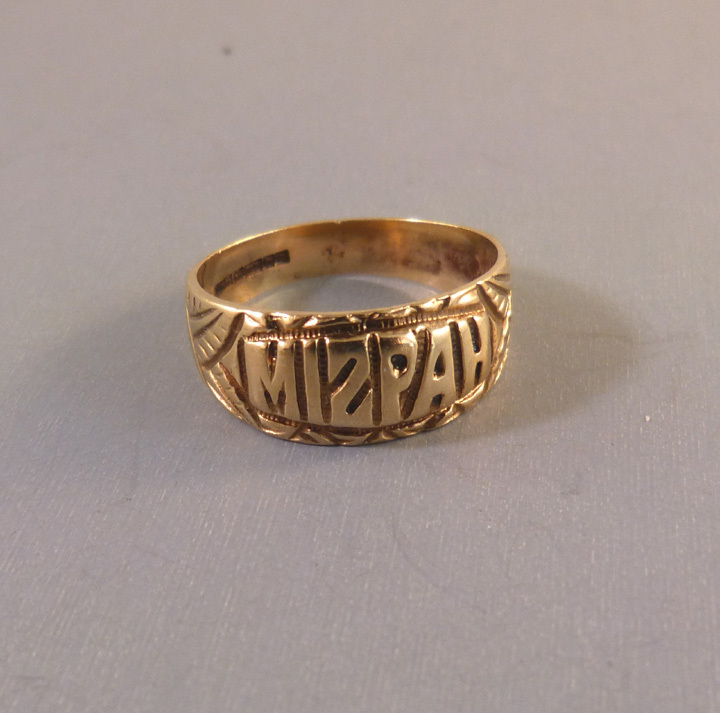 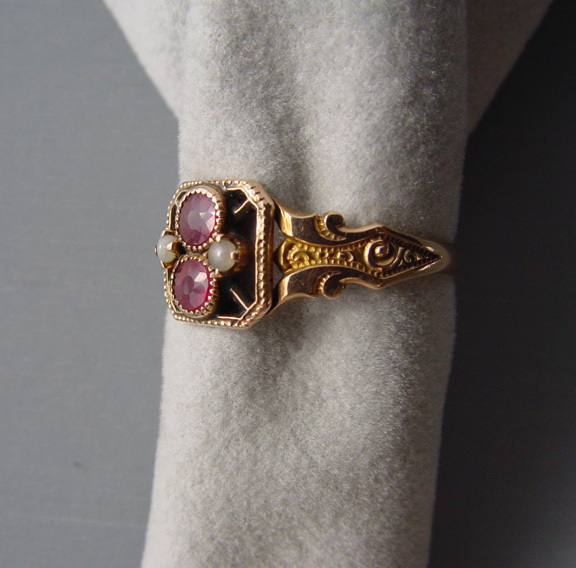 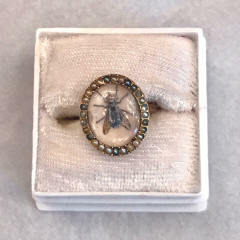 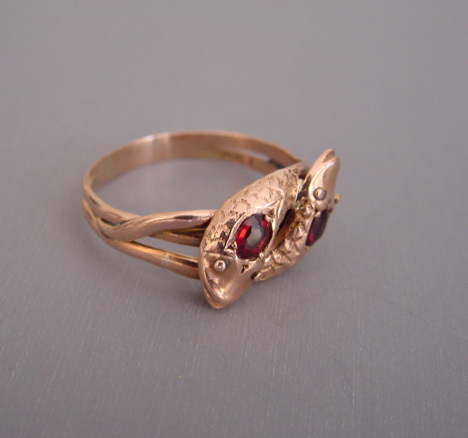 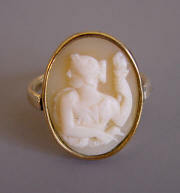 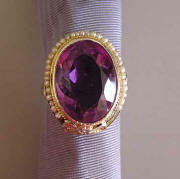 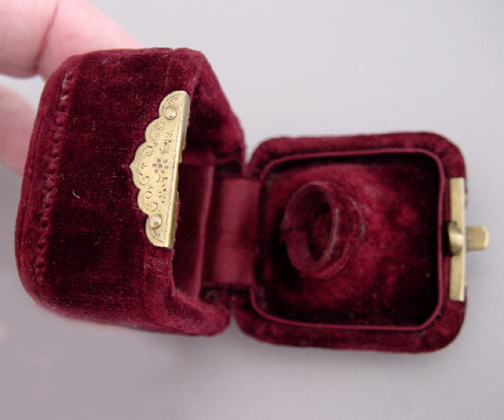 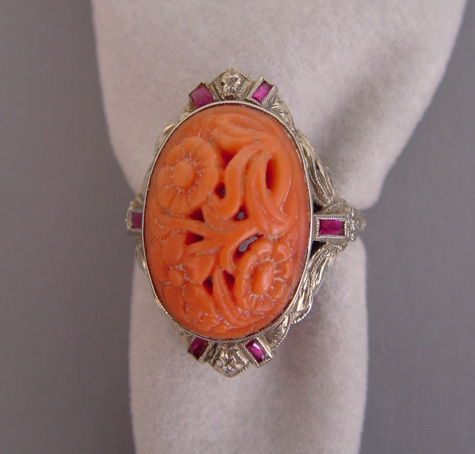 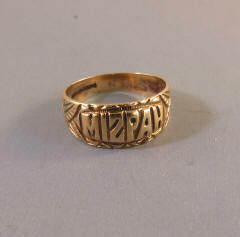 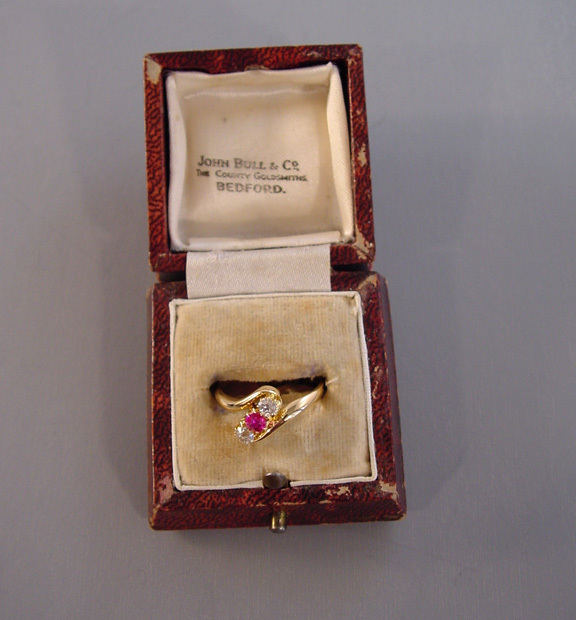 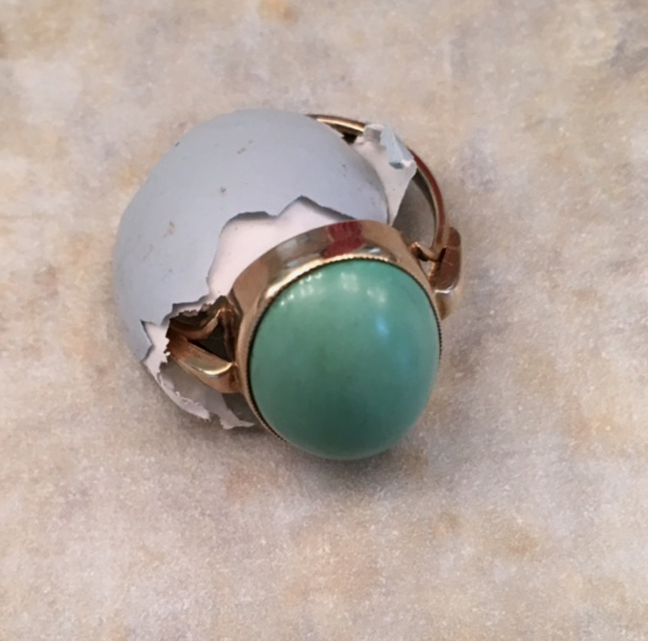 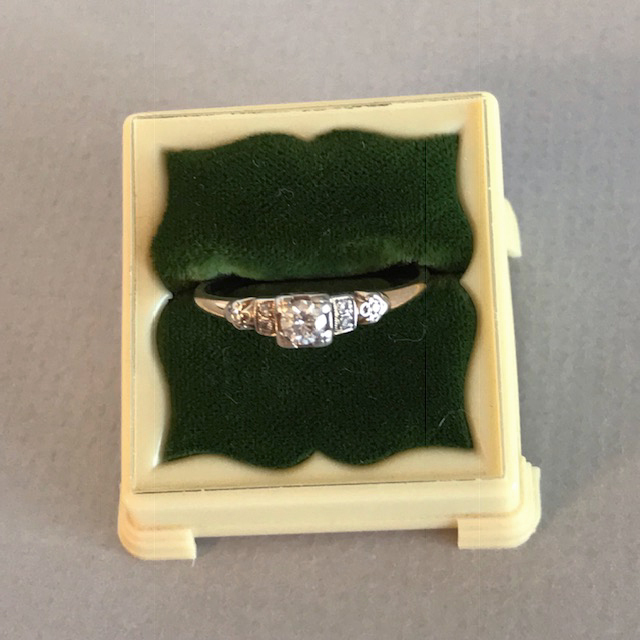 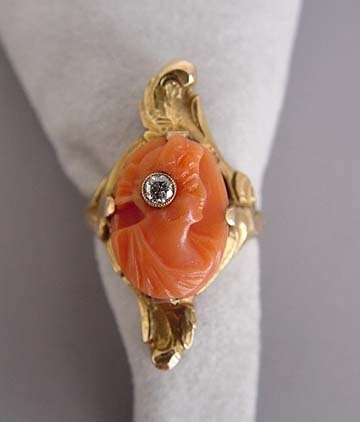 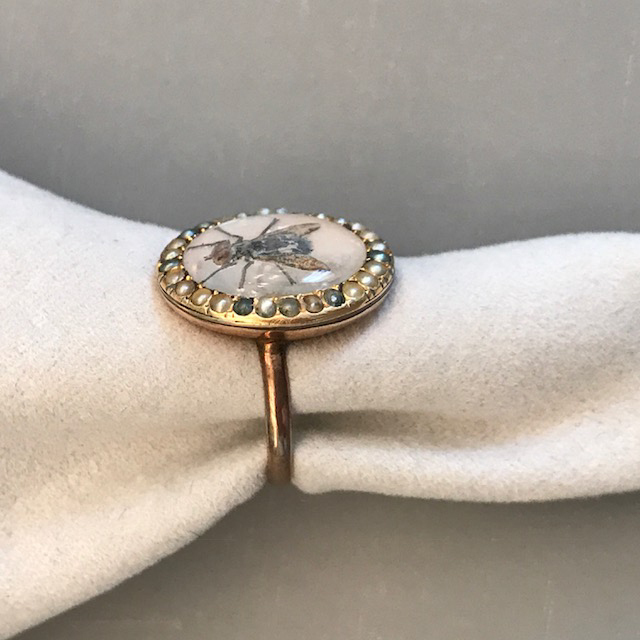 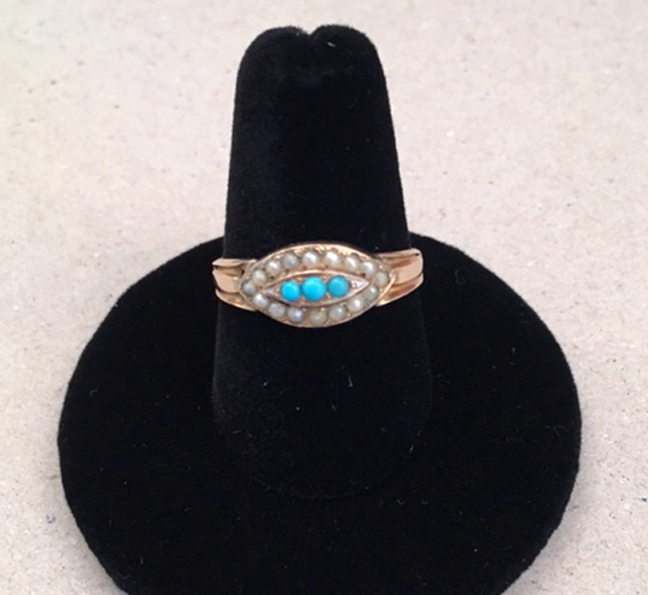 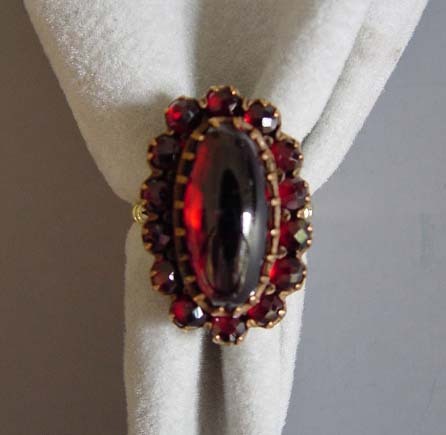 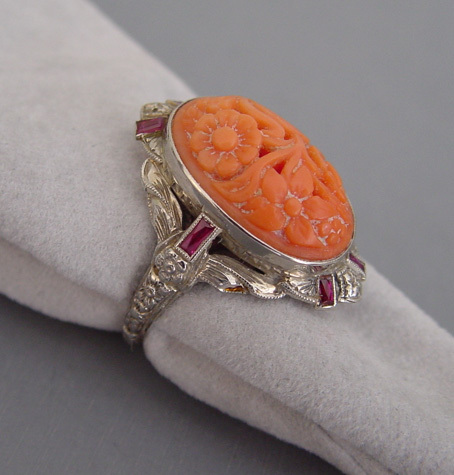 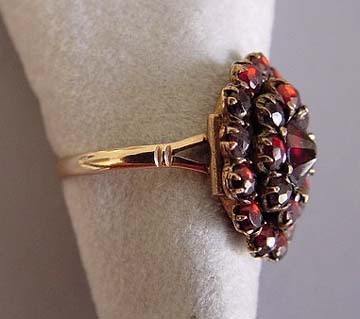 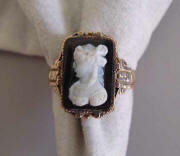 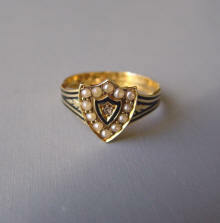 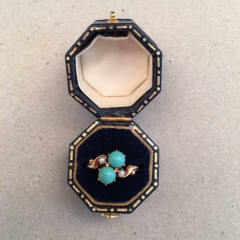 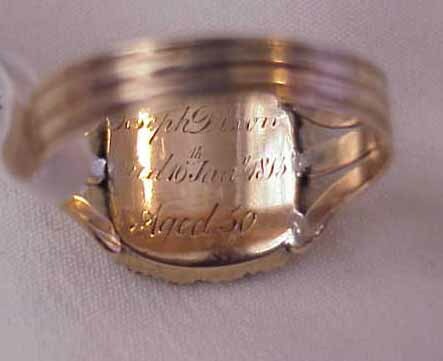 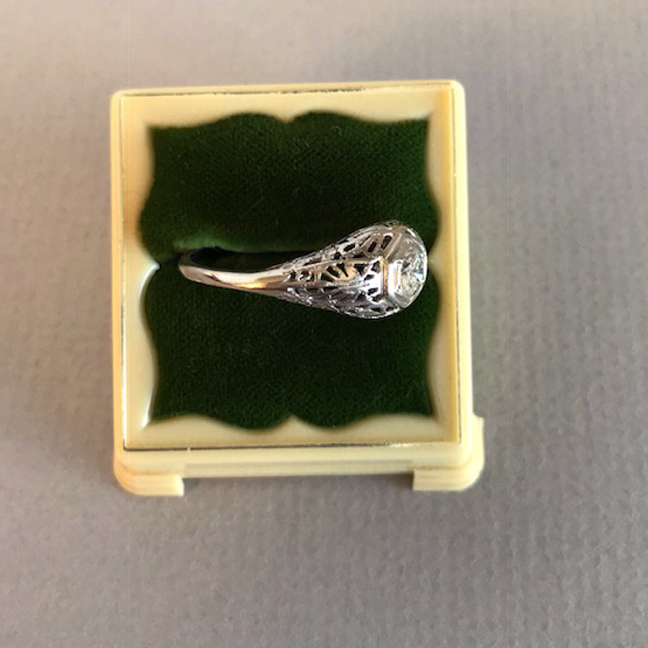 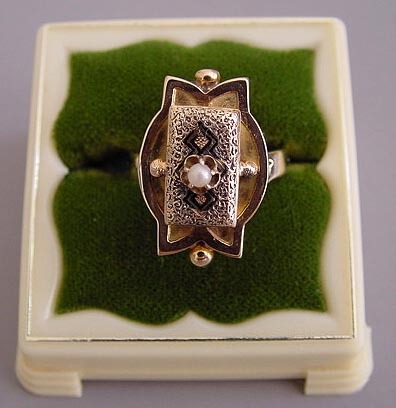 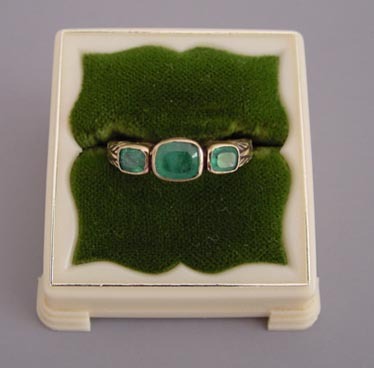 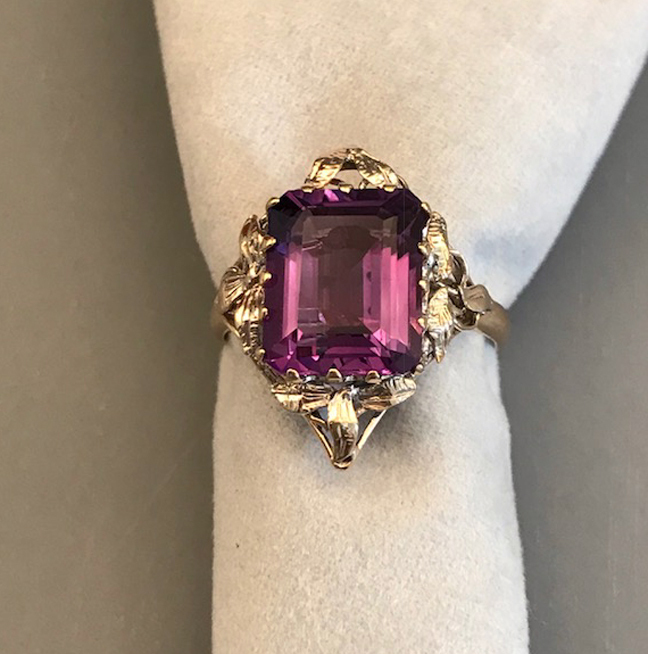 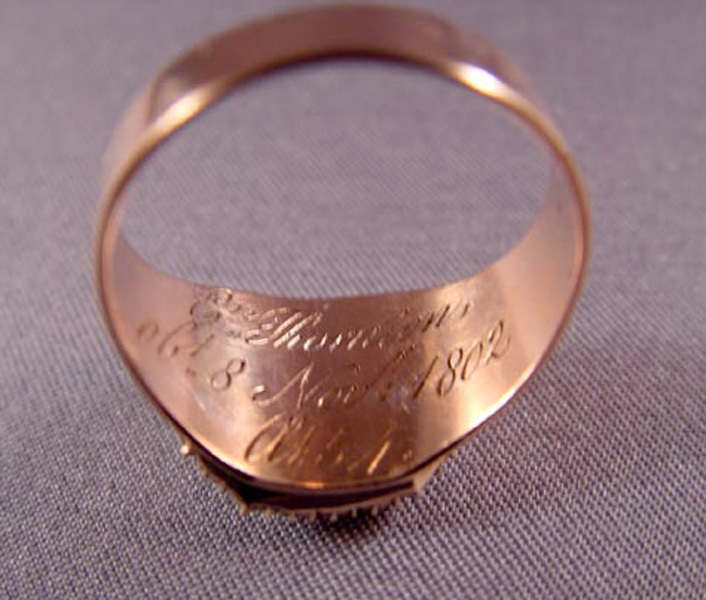 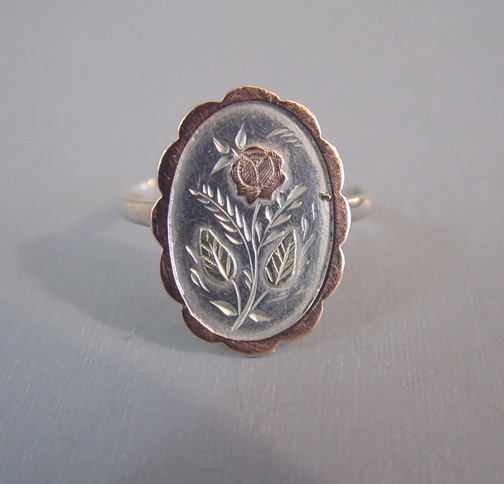 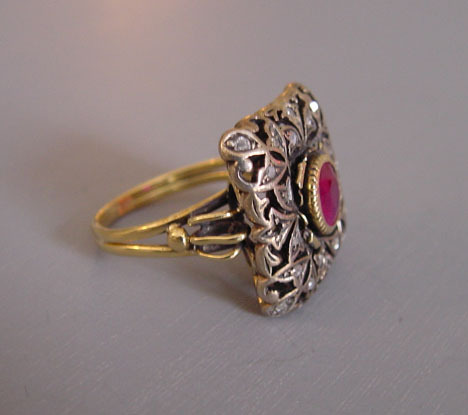 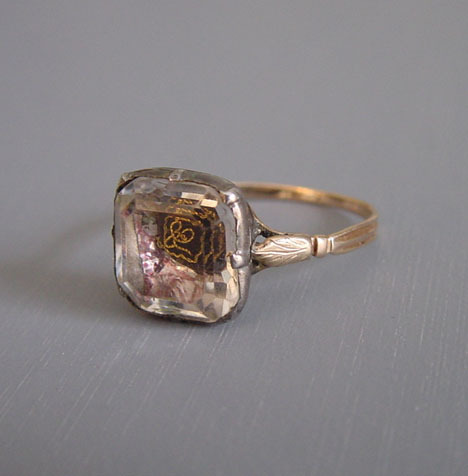 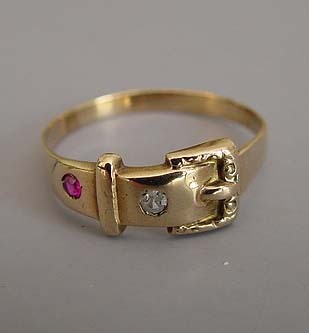 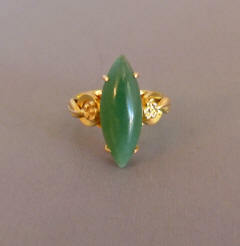 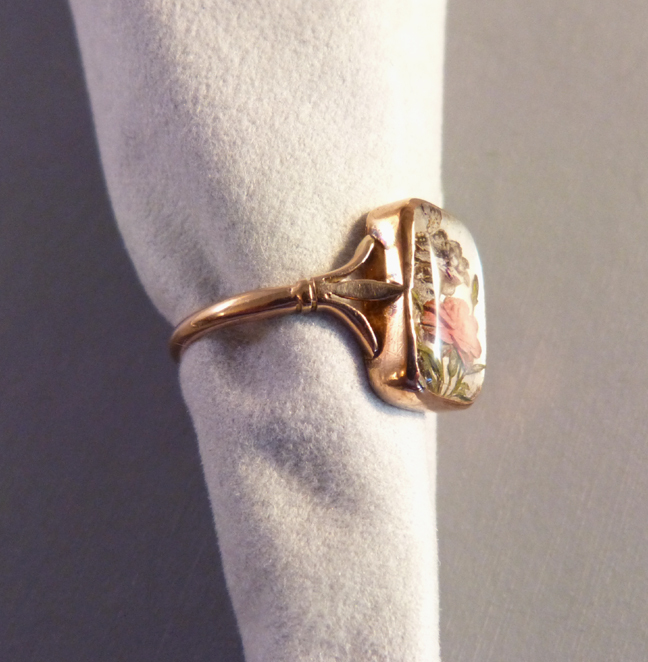 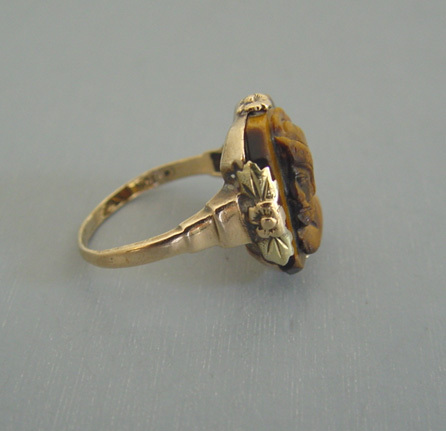 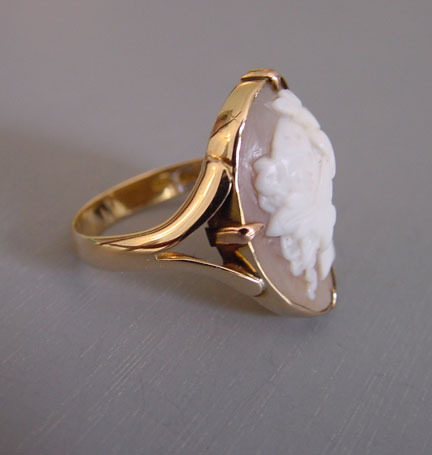 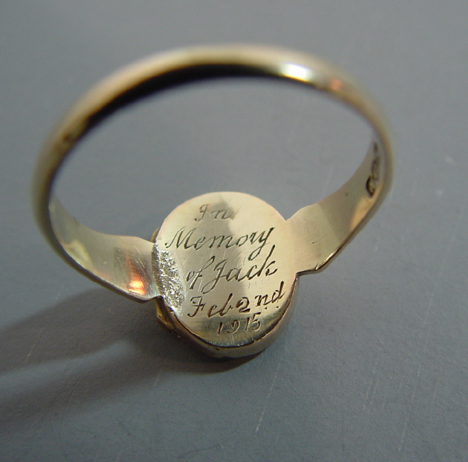 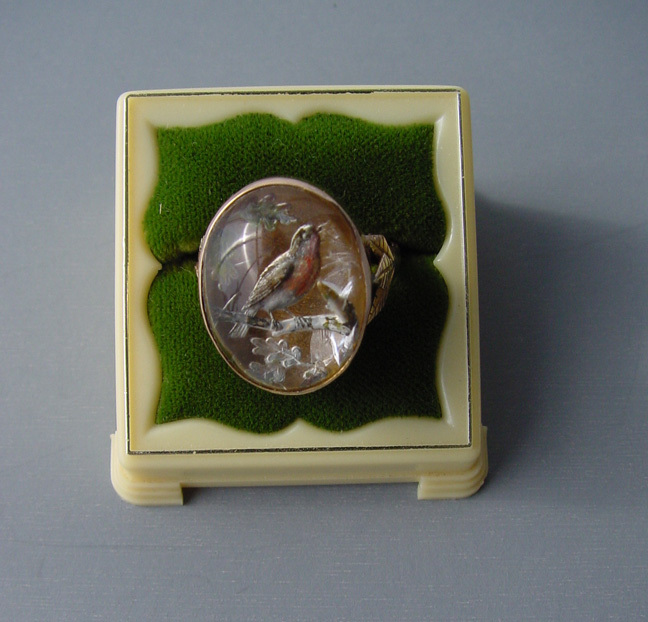 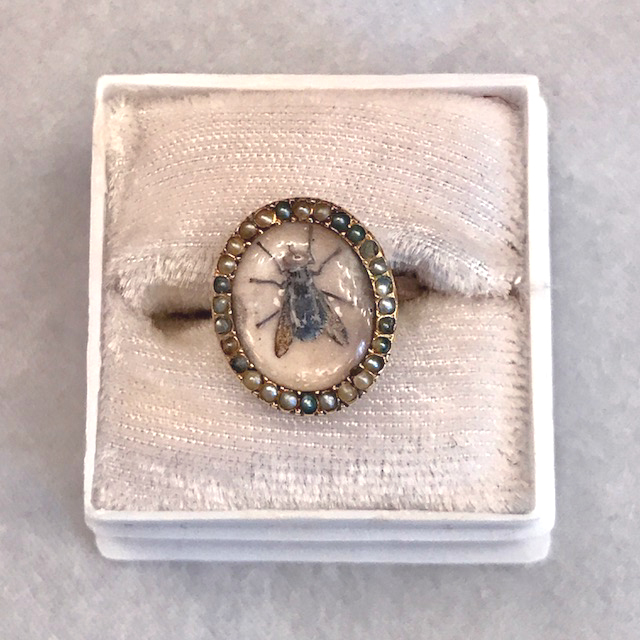 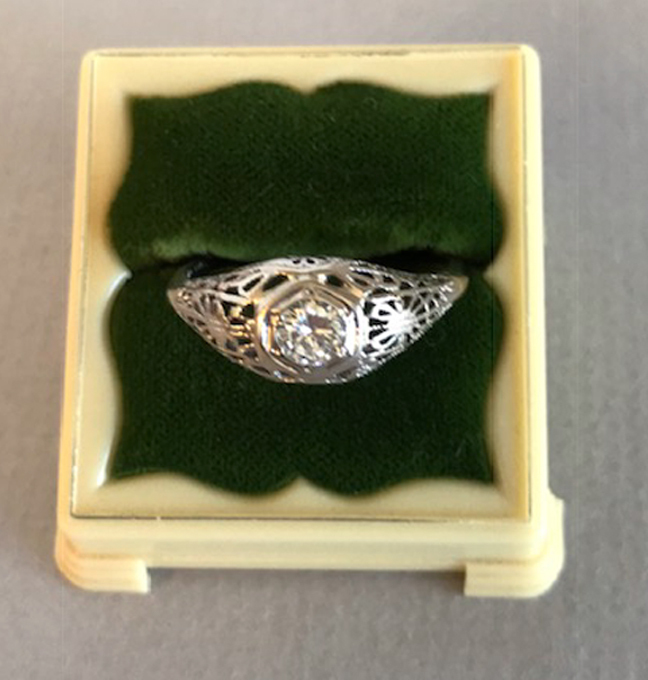 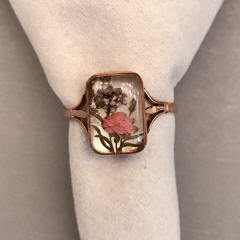 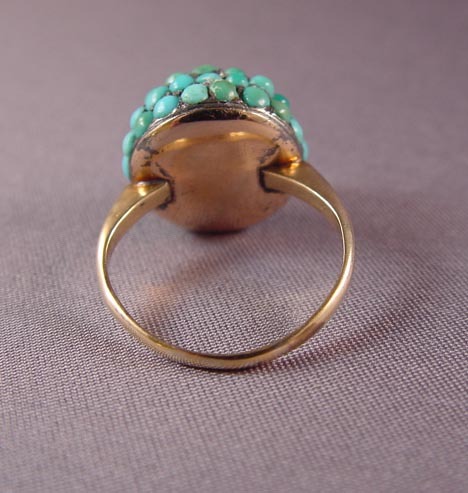 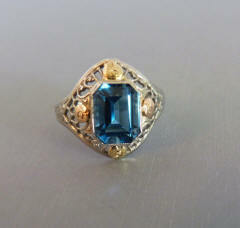 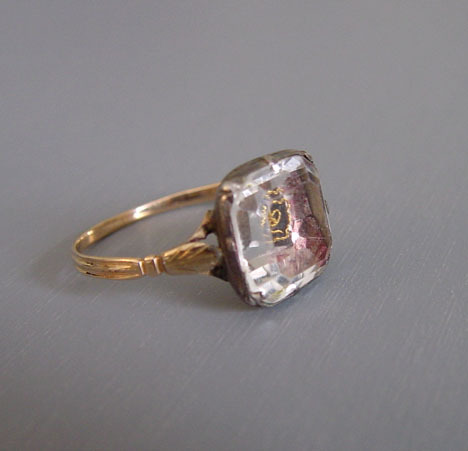 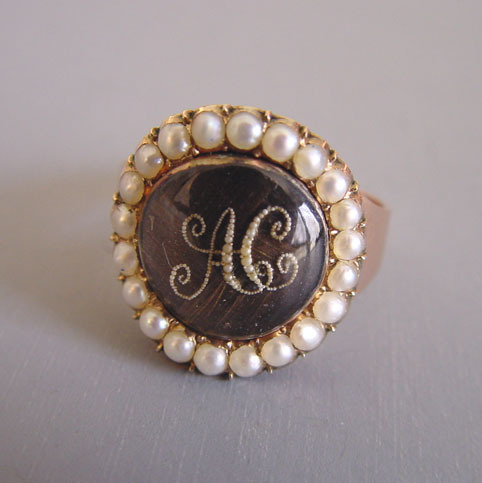 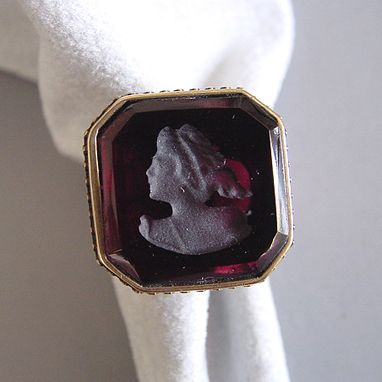 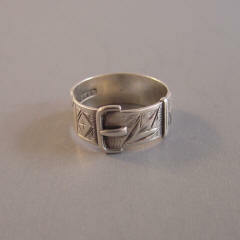 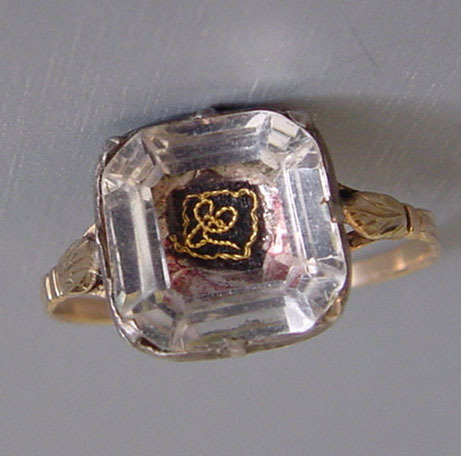 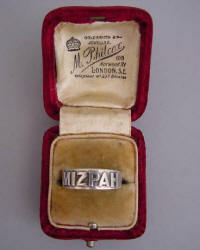 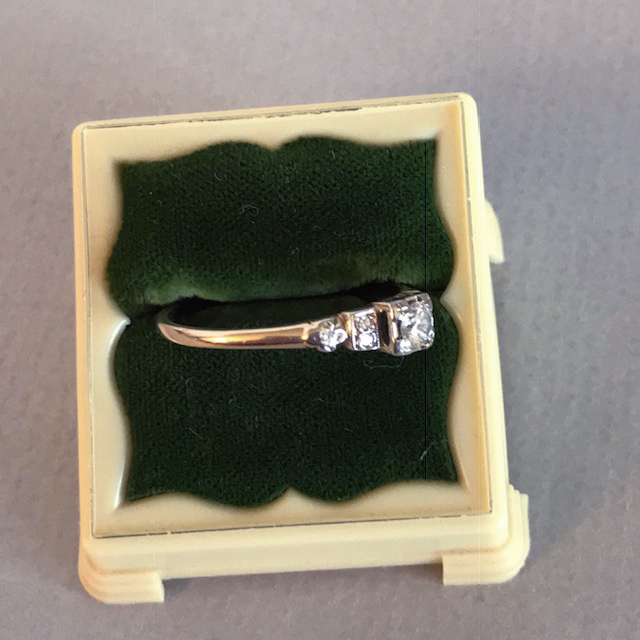 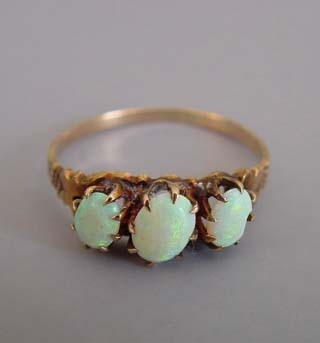 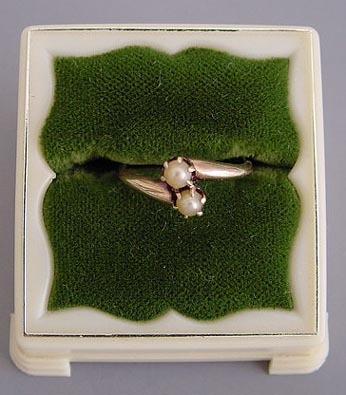 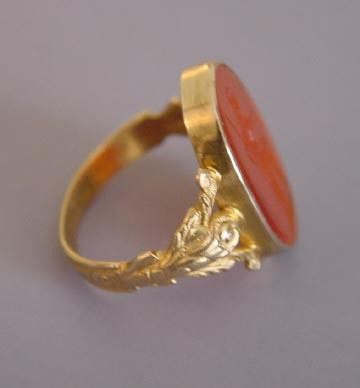 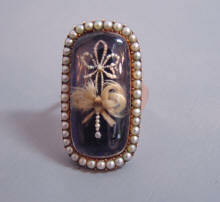 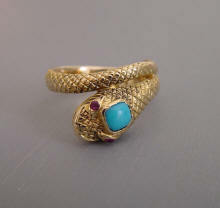 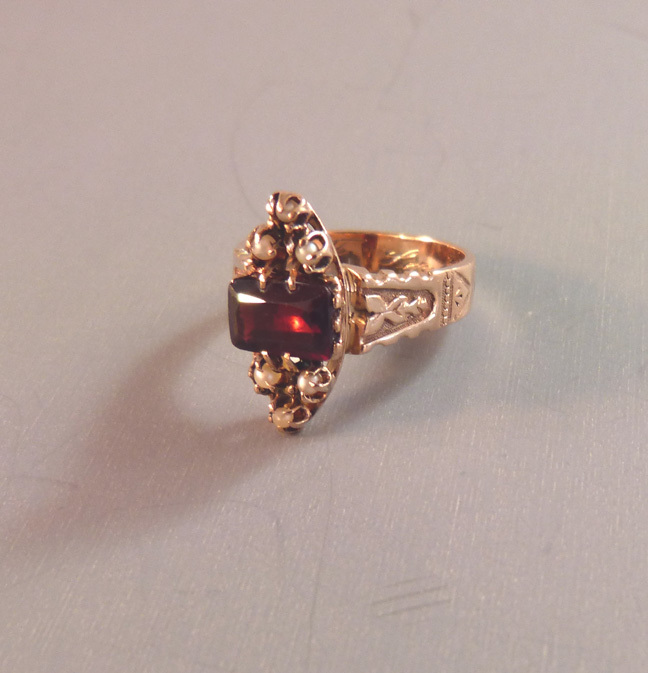 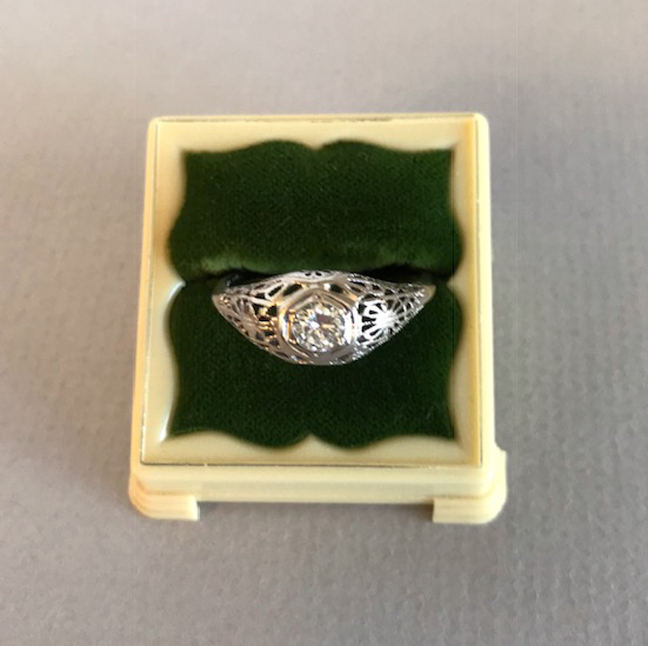 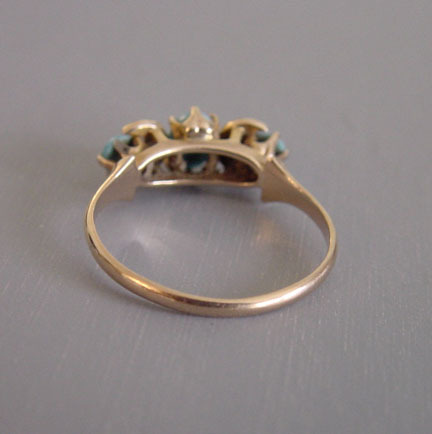 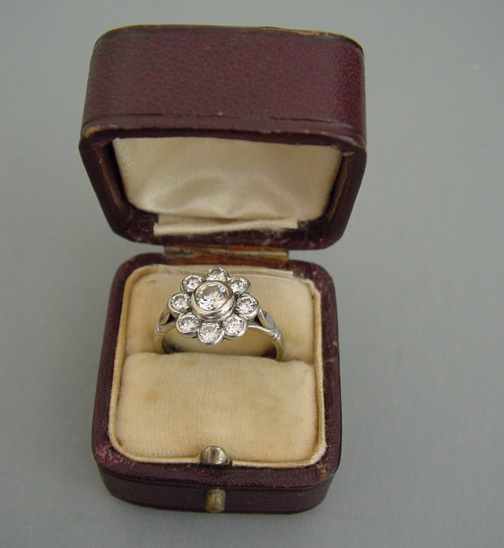 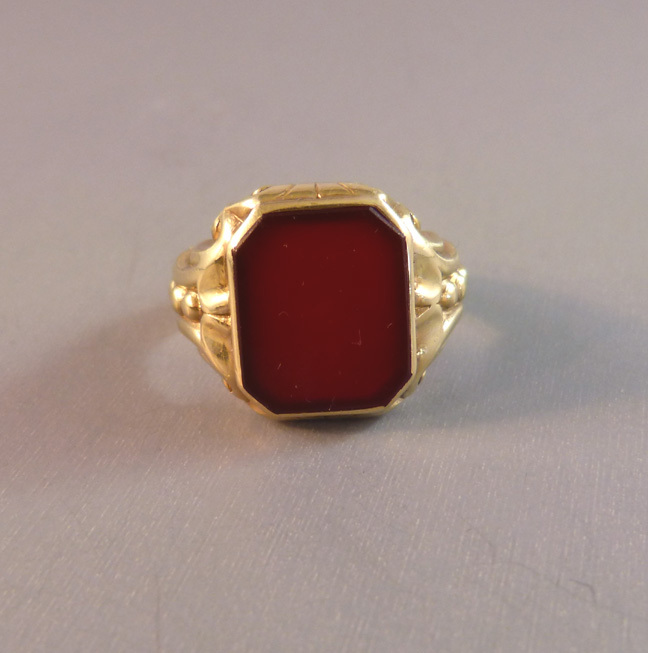 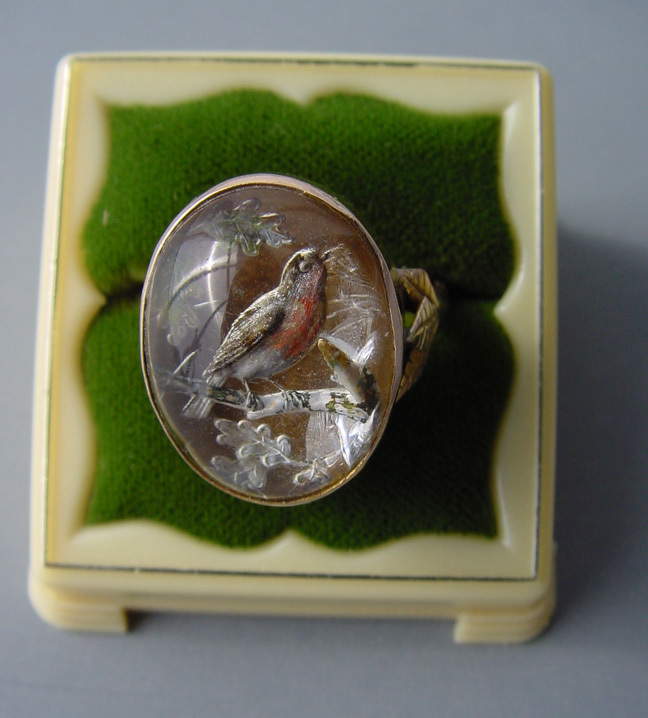 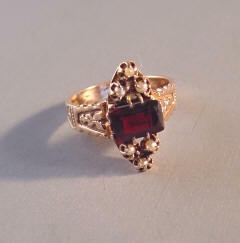 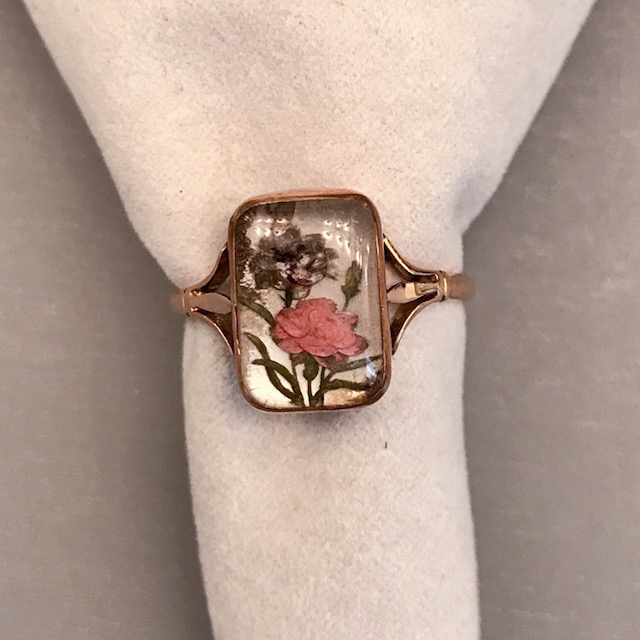 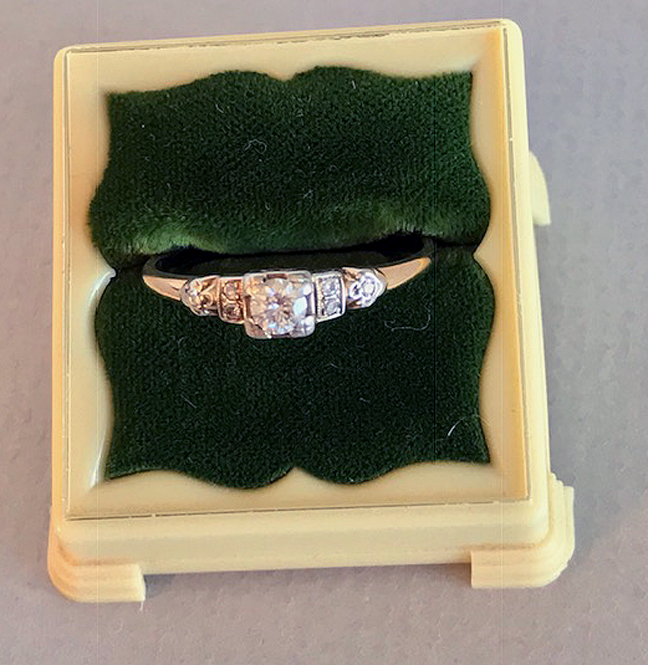 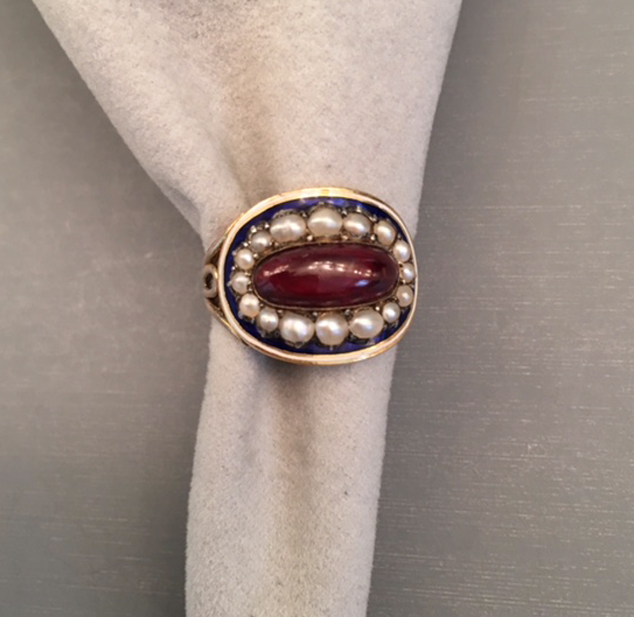 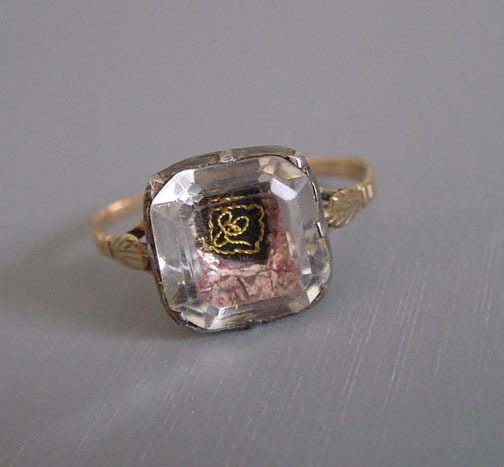 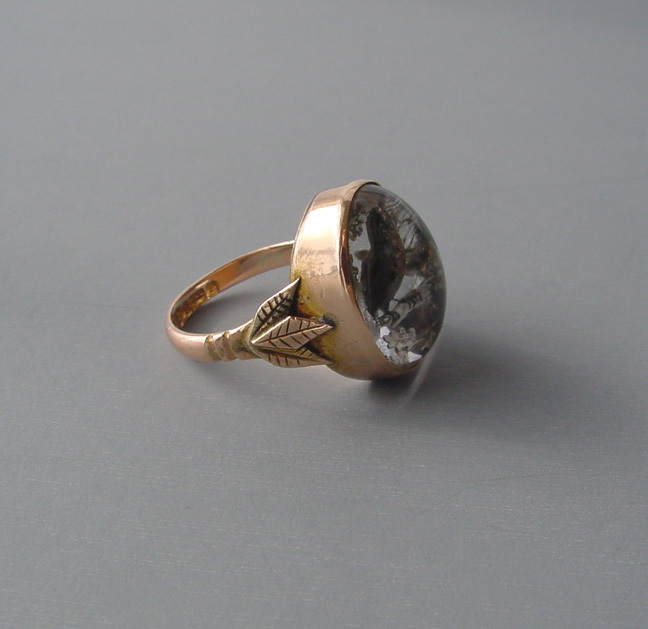 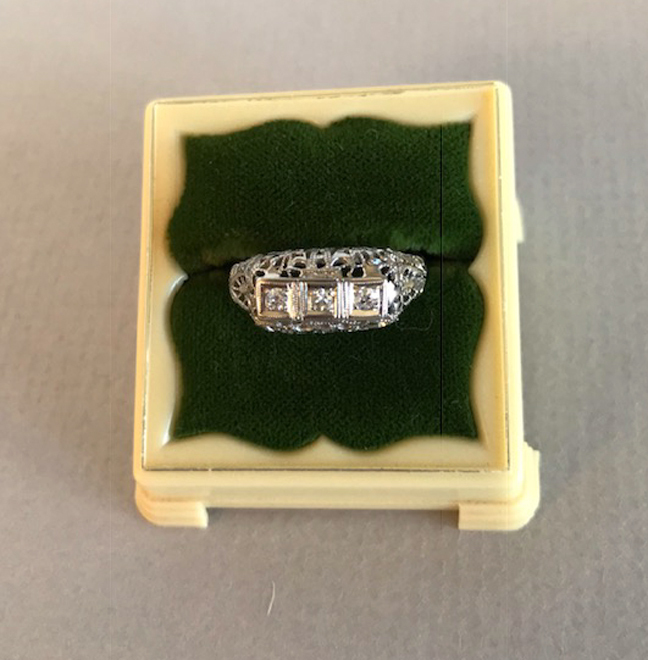 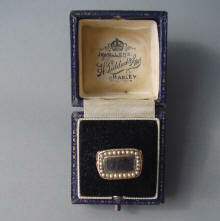 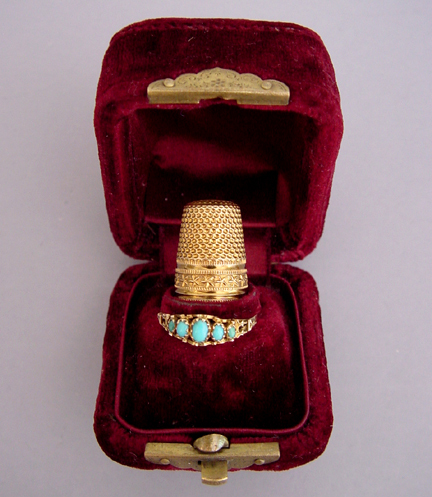 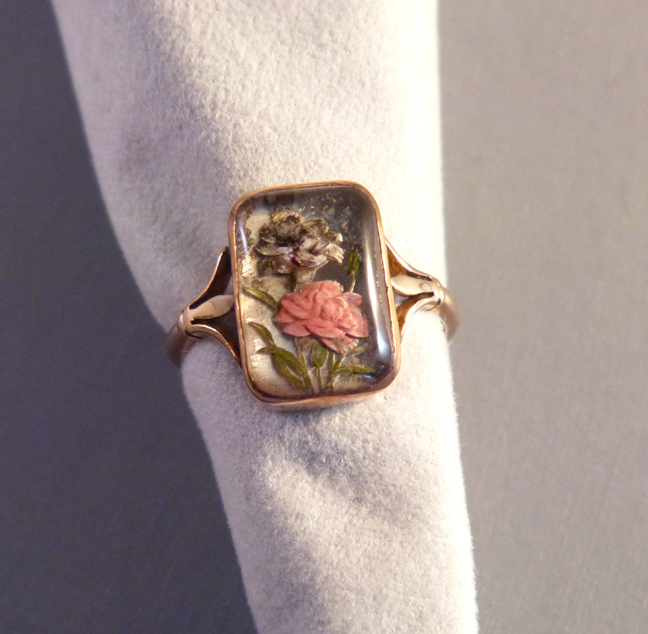 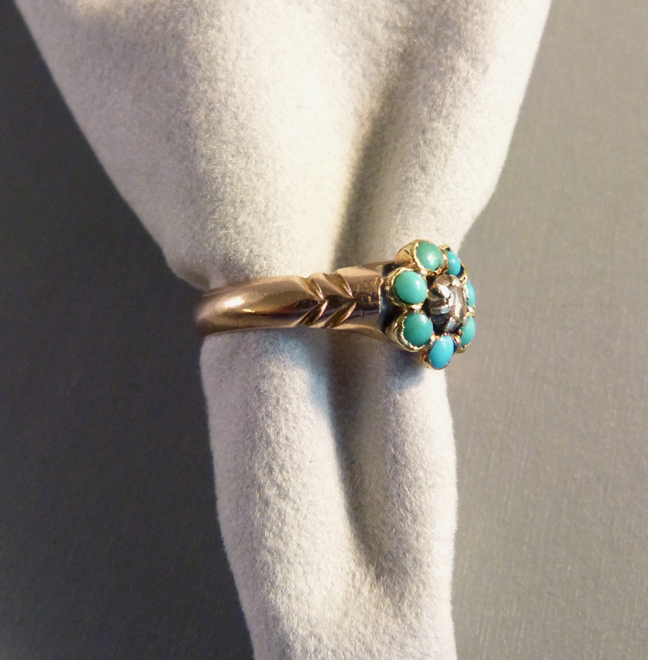 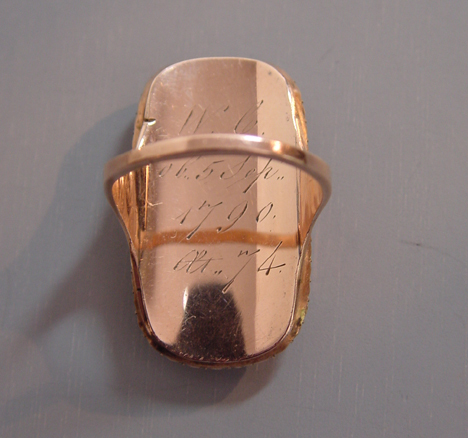 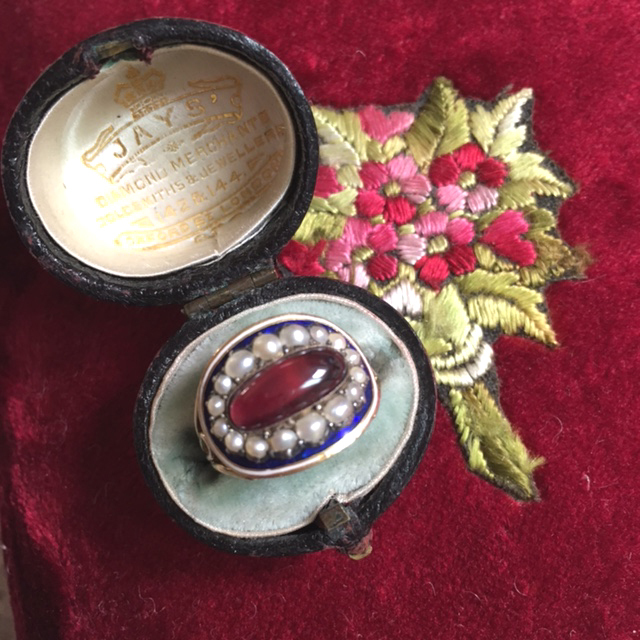 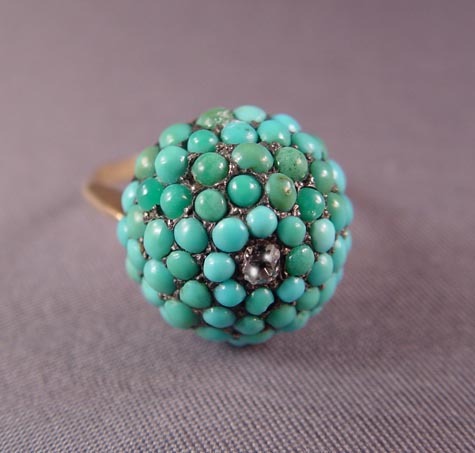 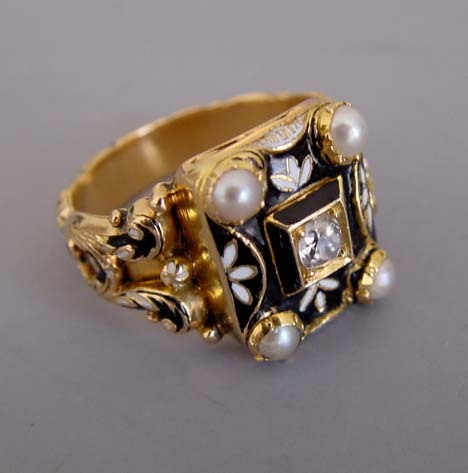 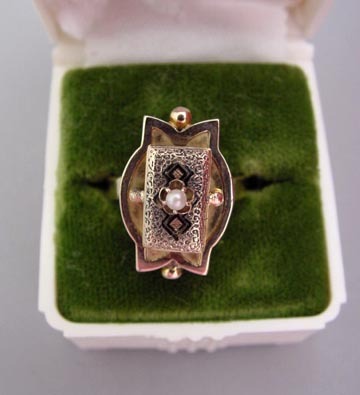 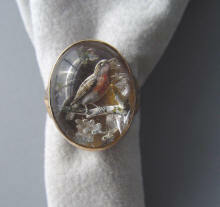 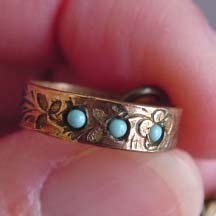 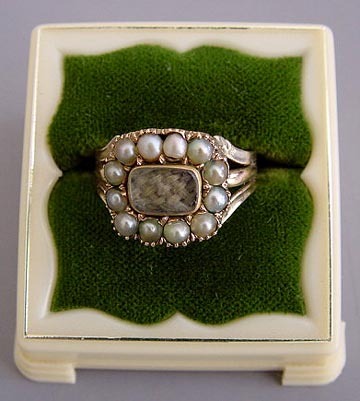 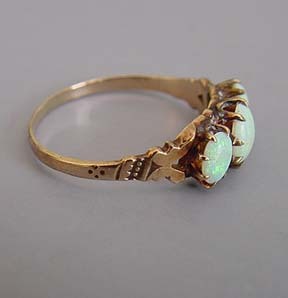 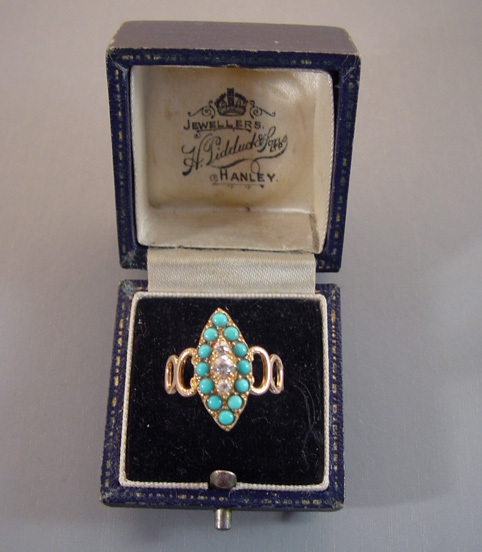 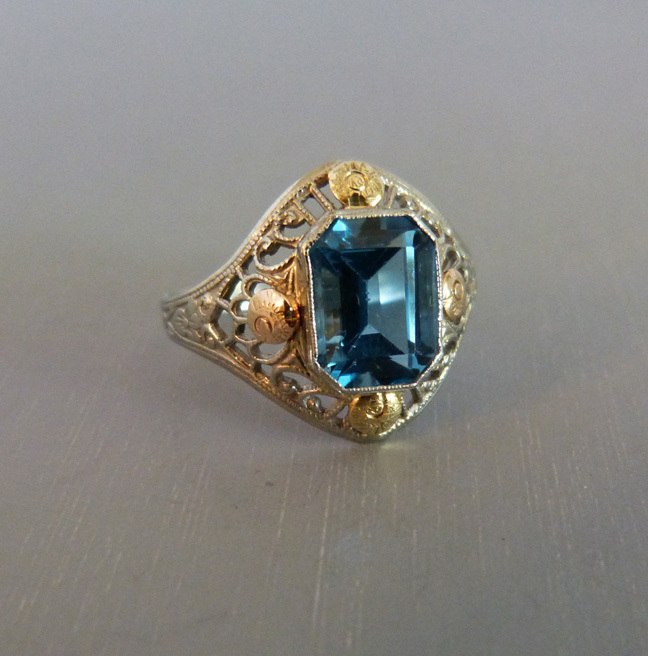 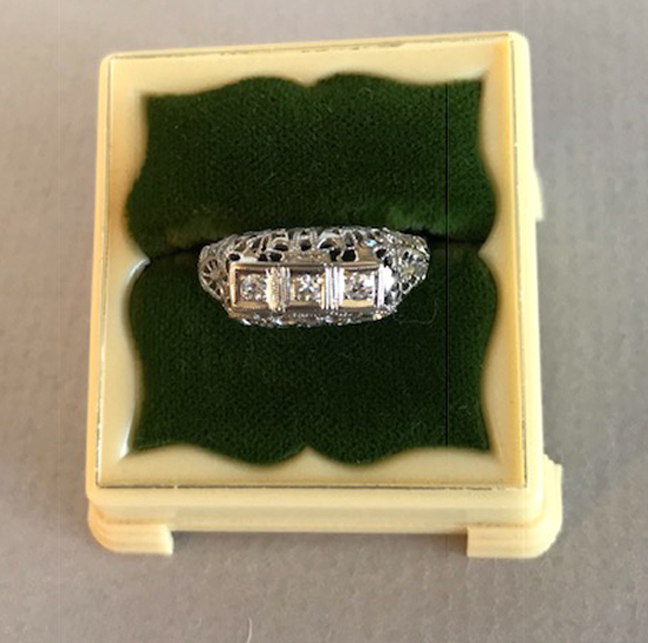 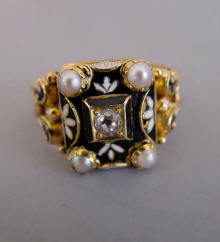 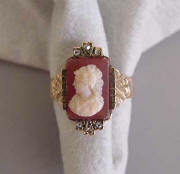 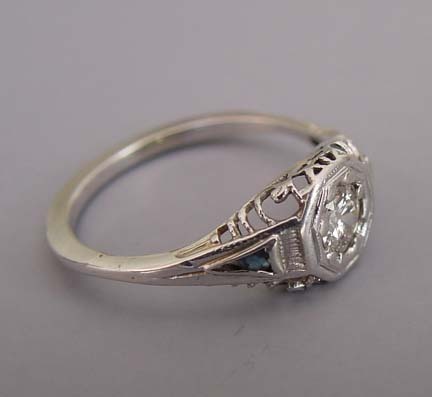 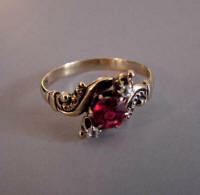 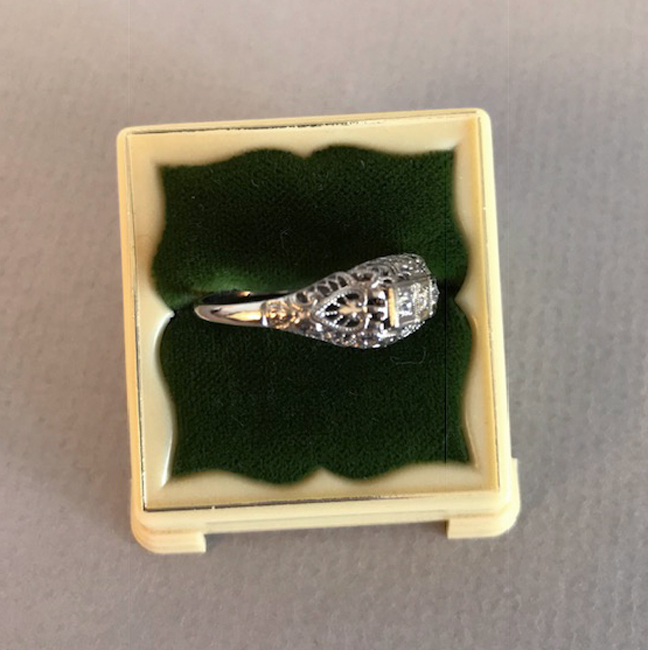 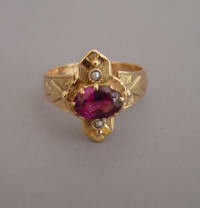 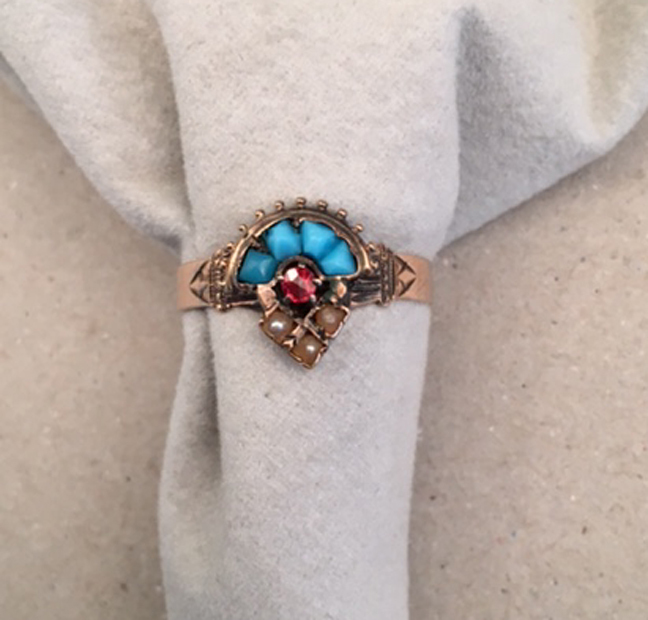 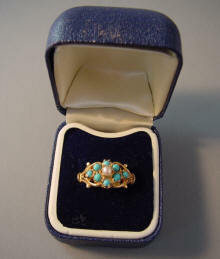 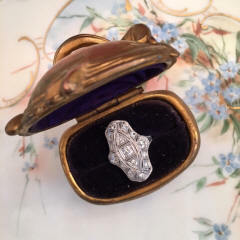 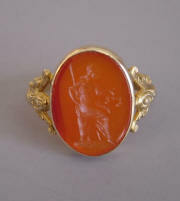 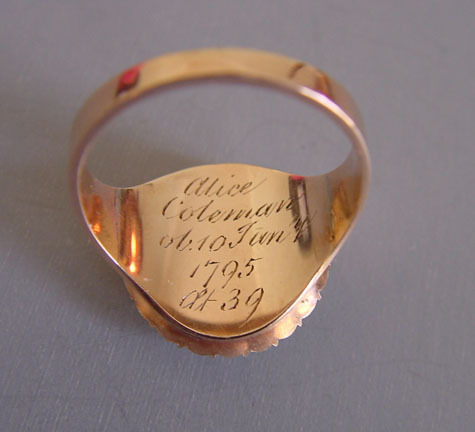 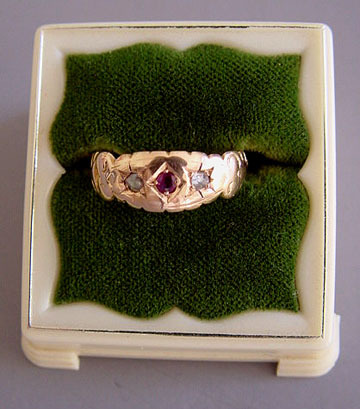 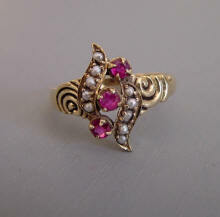 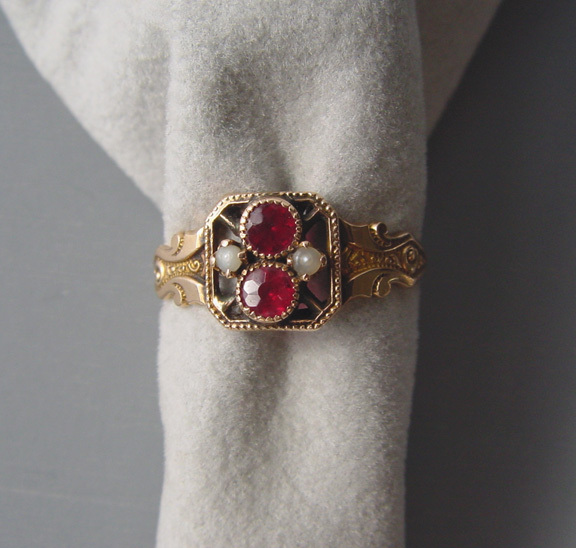 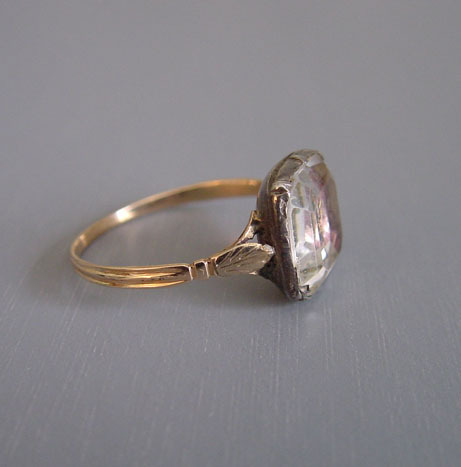 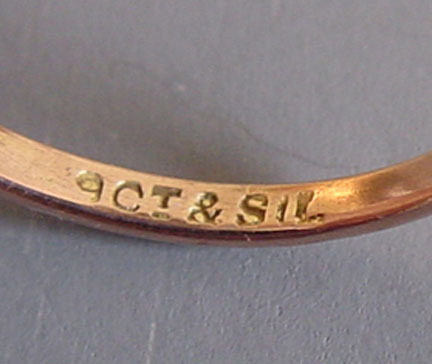 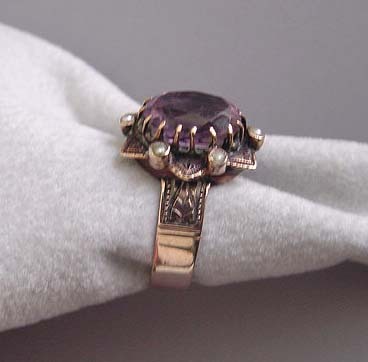 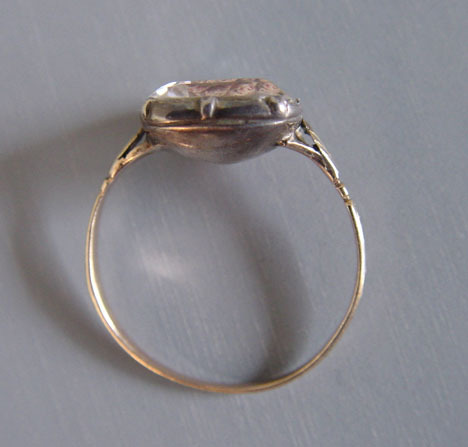 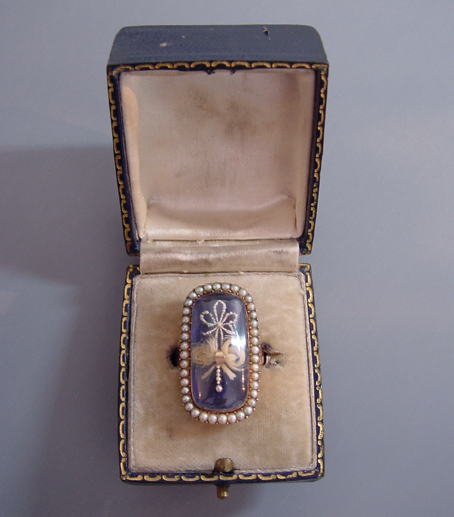 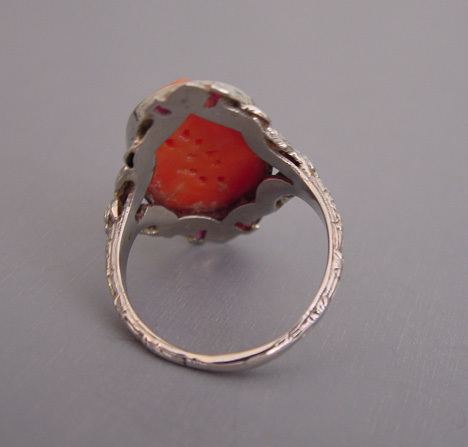 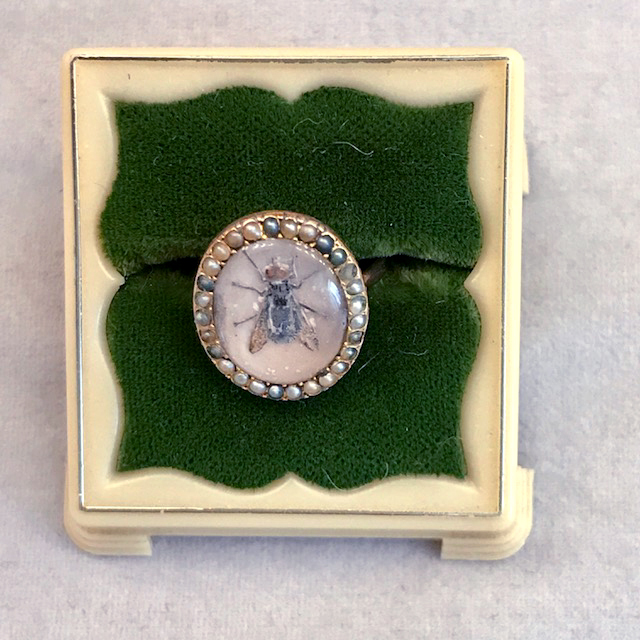 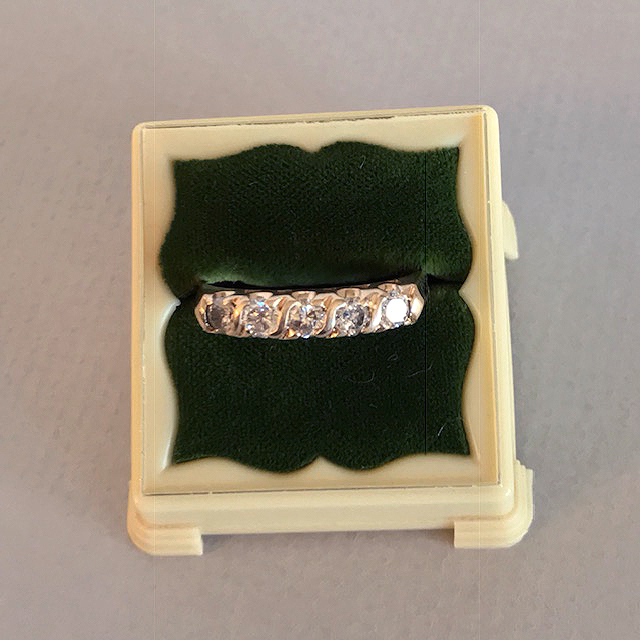 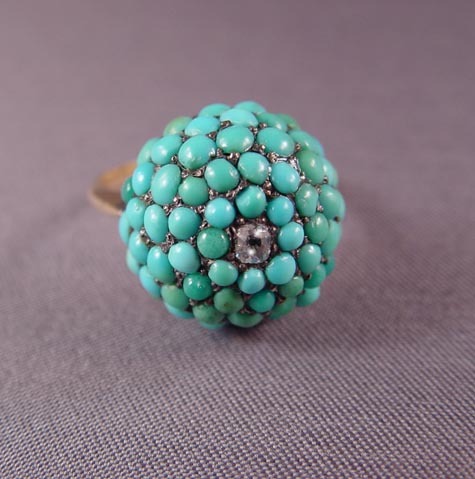 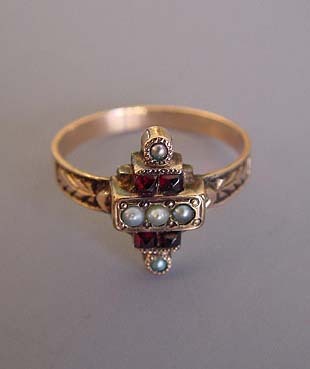 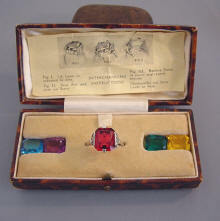 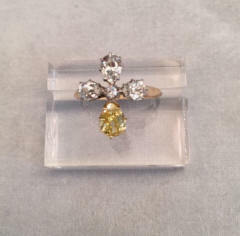 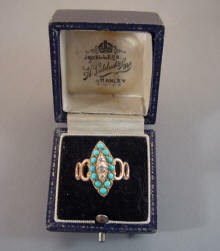 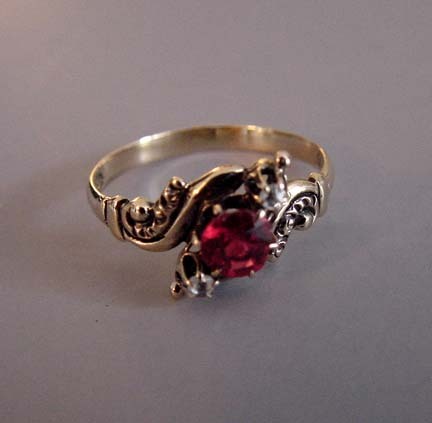 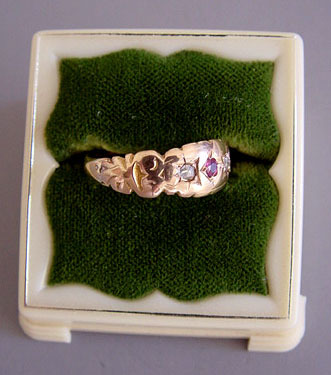 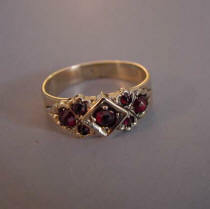 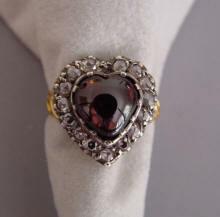 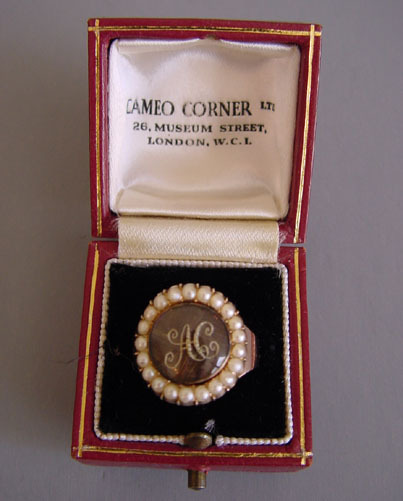 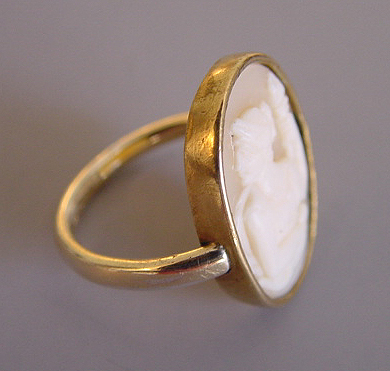 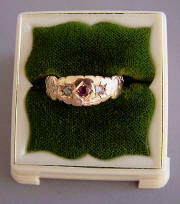 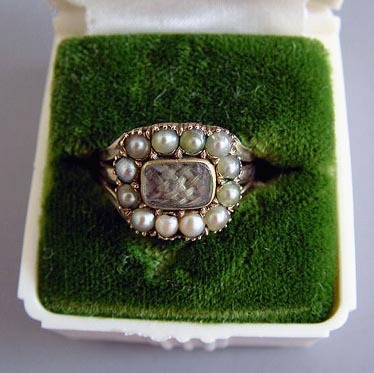 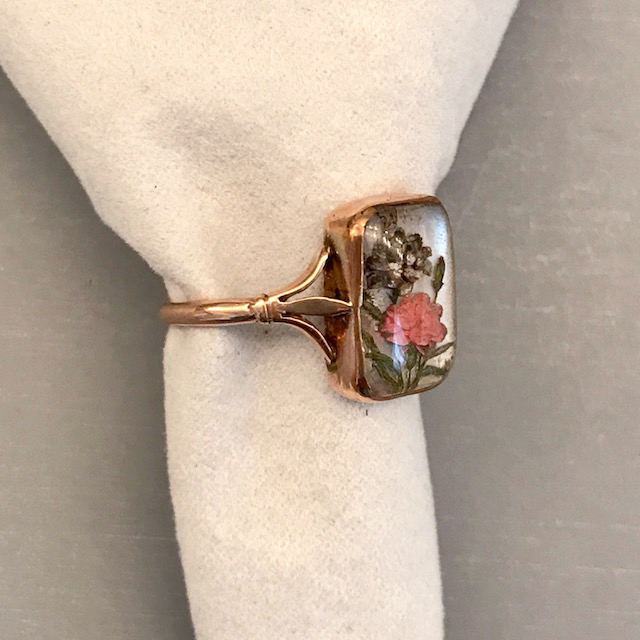 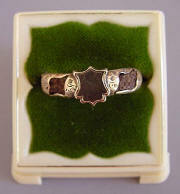 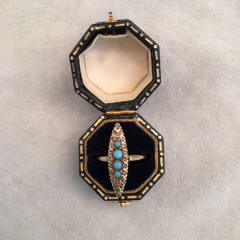 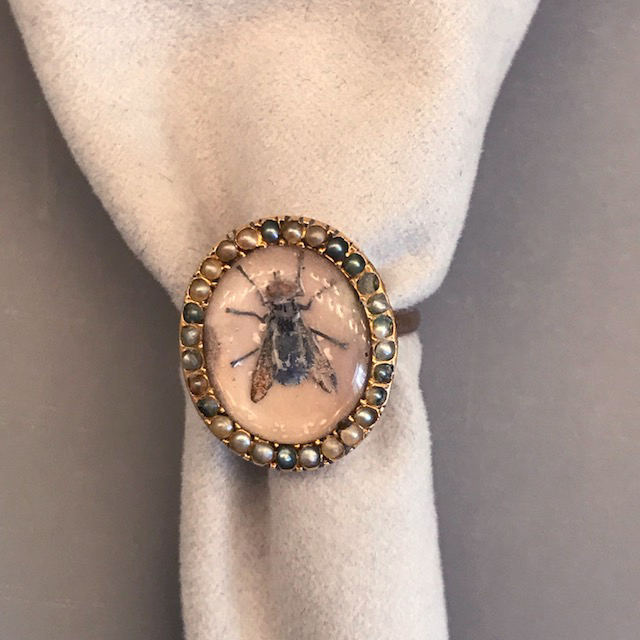 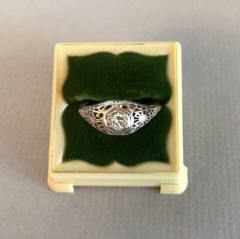 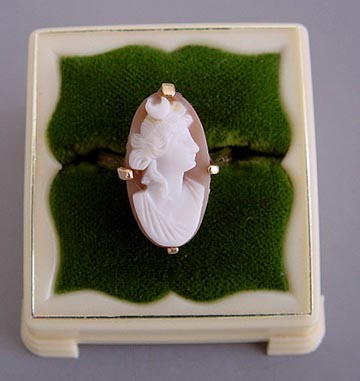 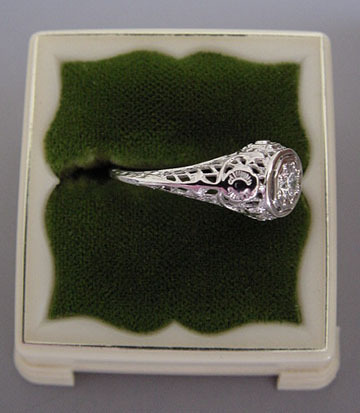 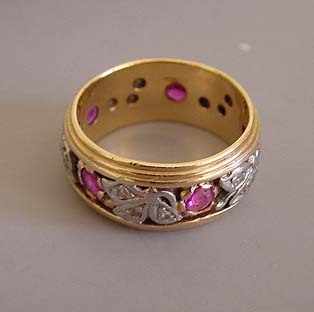 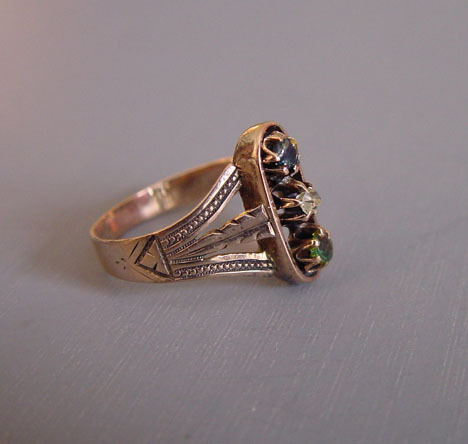 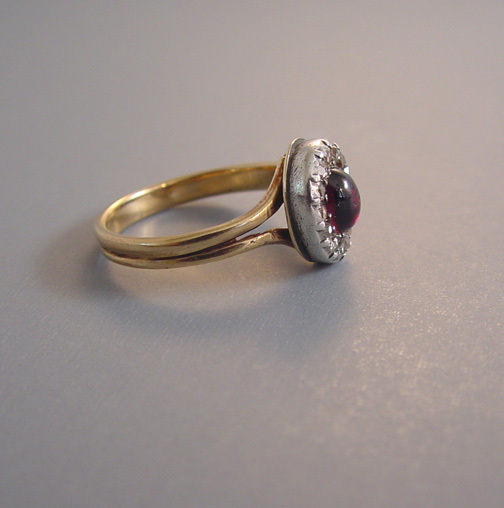 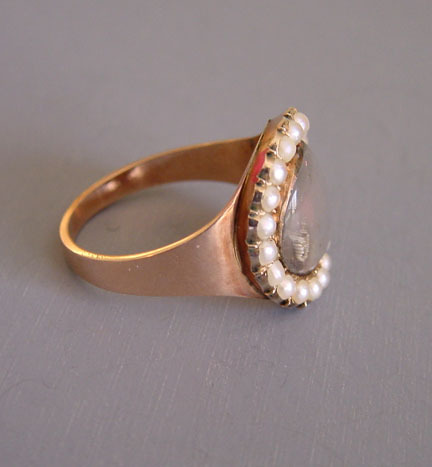 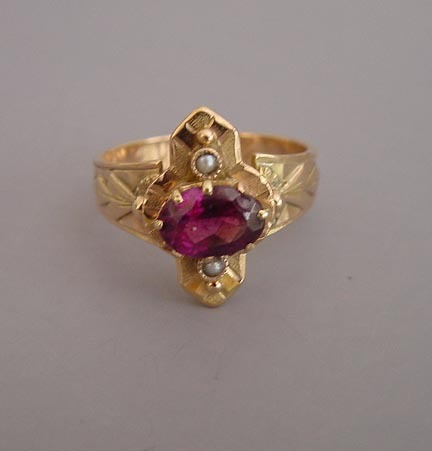 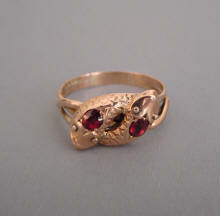 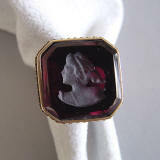 This ring and brooch were given to Eliza Gray McClure in 1876 by her husband Alexander Kelly McClure (b.1828, d.1910). 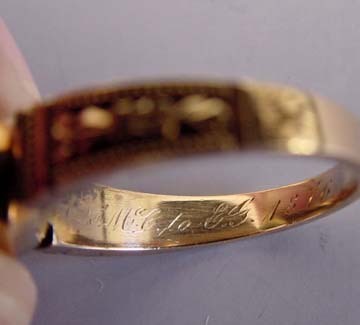 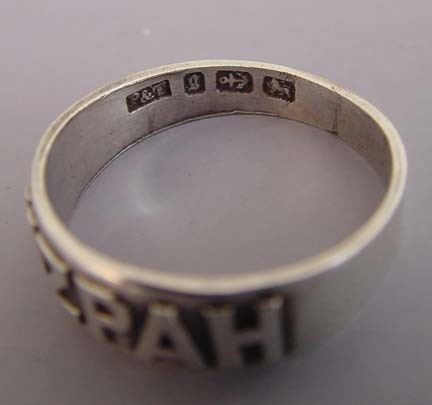 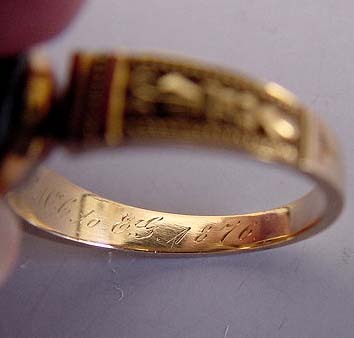 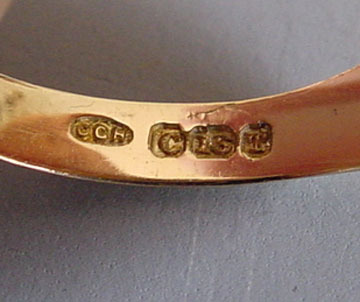 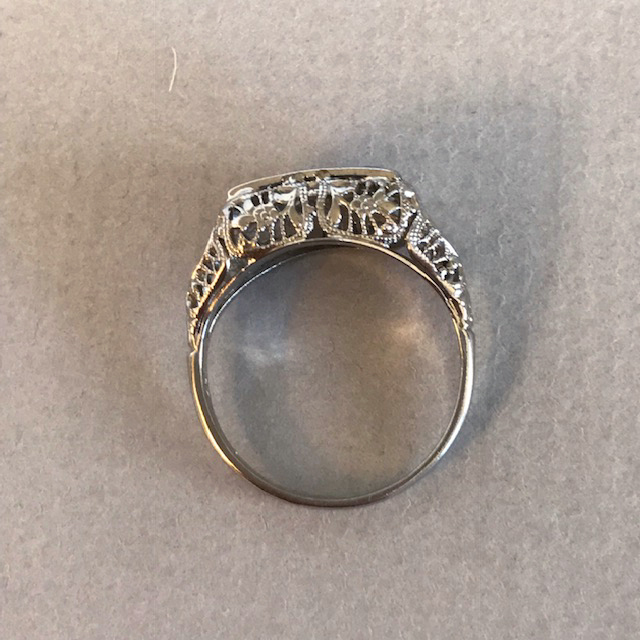 The jewelry is engraved on both pieces. 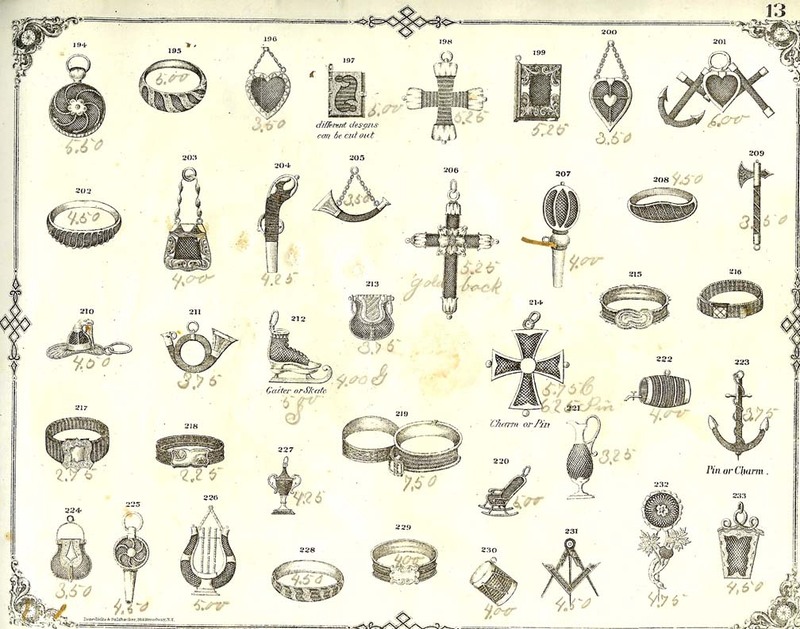 In the 1856 book "Inquire Within for Anything You Want to Know", by G.G. 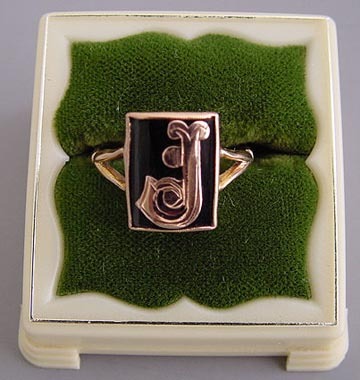 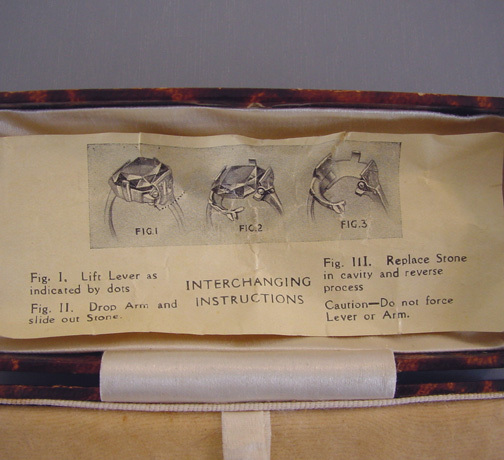 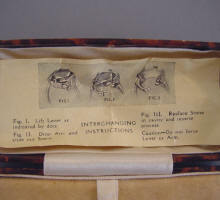 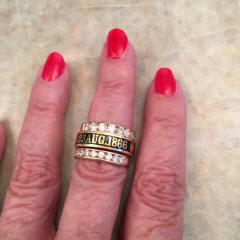 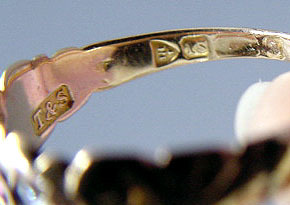 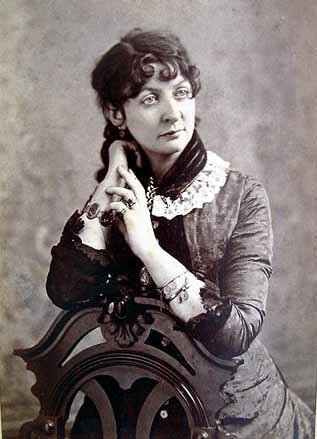 Evans, the symbolism of wearing rings on the left hand is described. 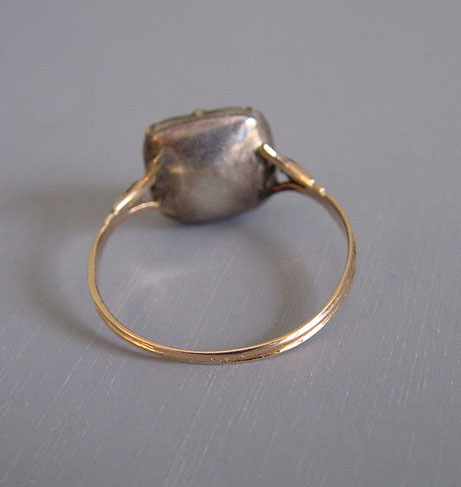 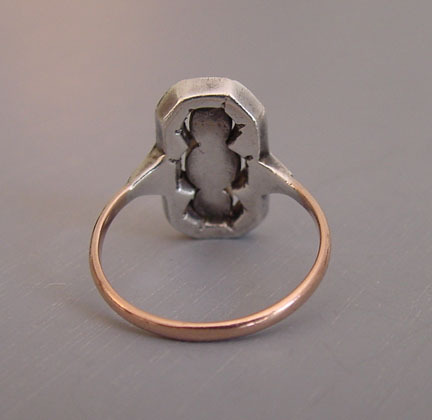 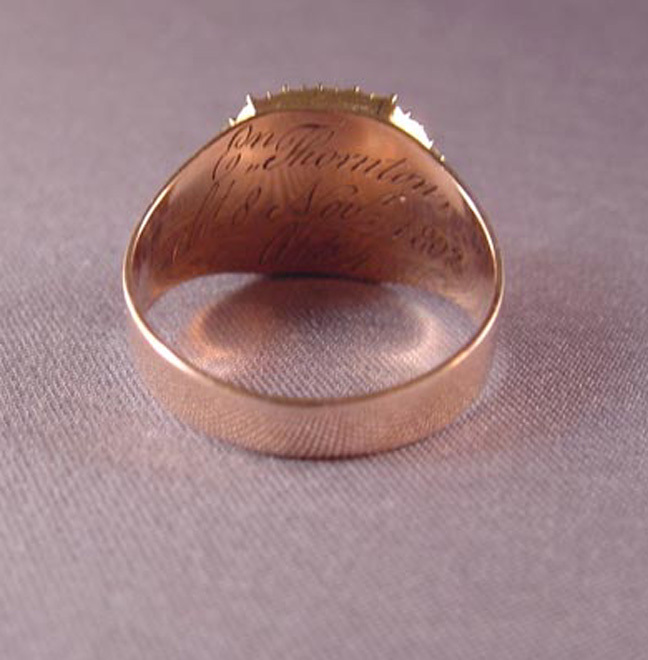 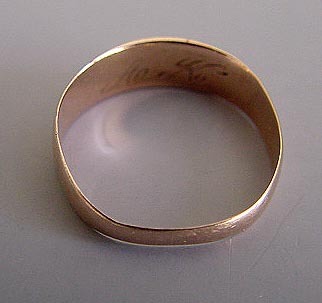 A ring worn on the first finger signals a man desiring a wife, or a woman not spoken for. 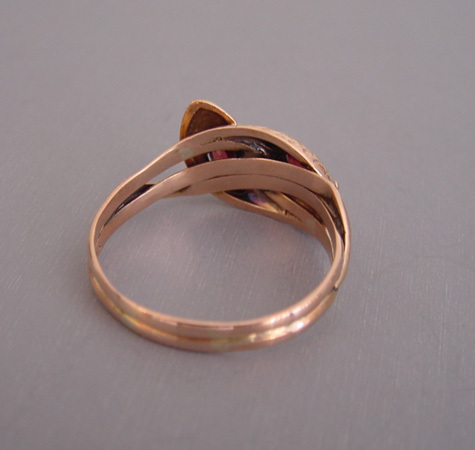 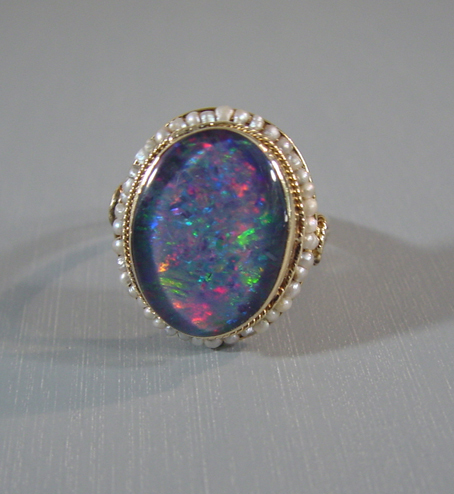 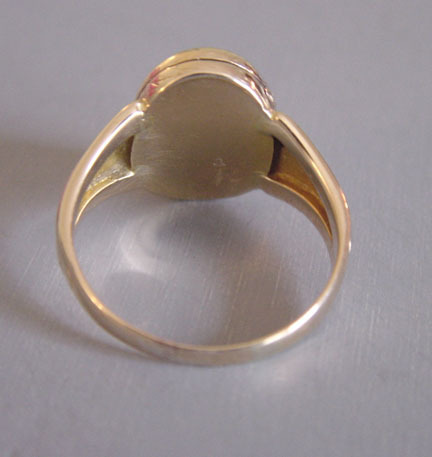 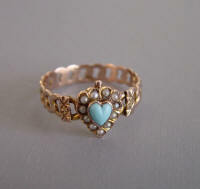 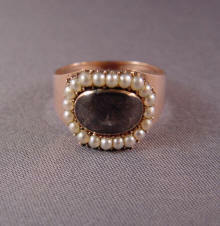 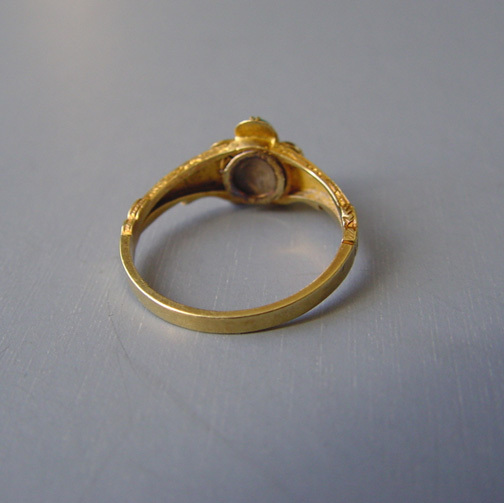 A ring worn the second finger signals an engaged person, and on the third finger a married person. 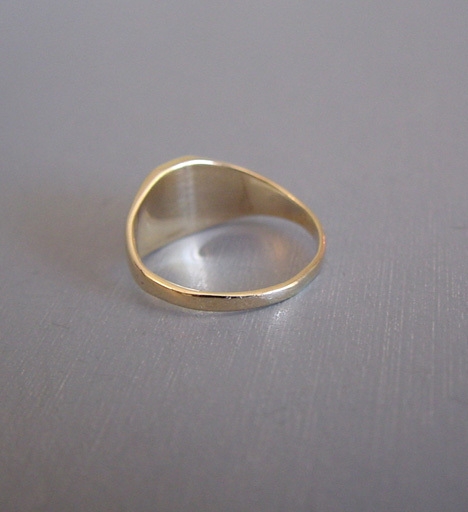 A person who plans never to marry wears a ring on the little finger. 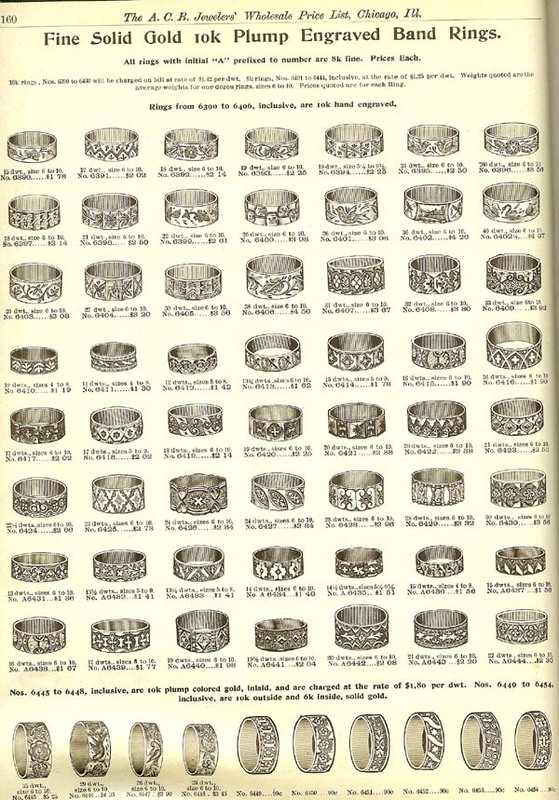 PAGE 61 of Victorian hair rings. 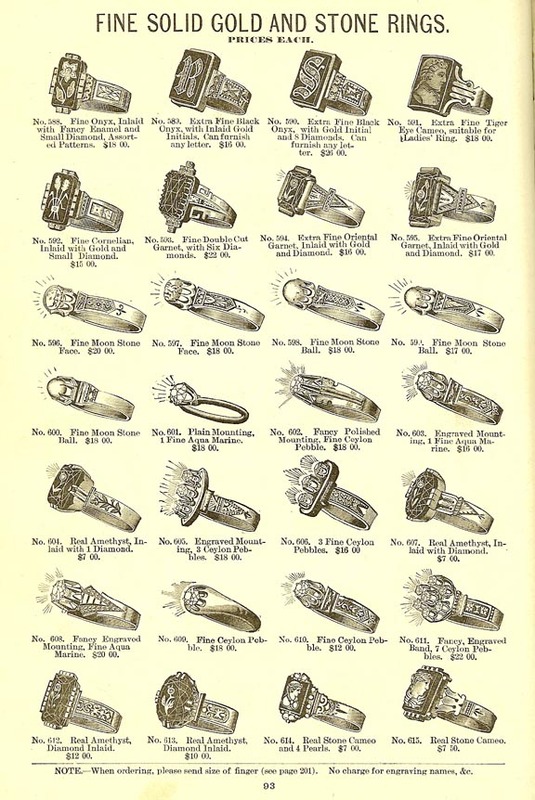 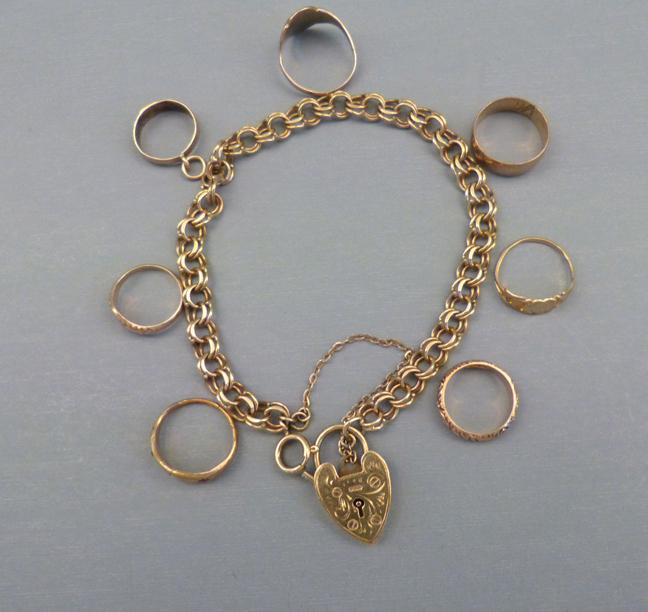 PAGE 13 of Victorian hair jewelry: bracelets, brooches, charms and pendants. 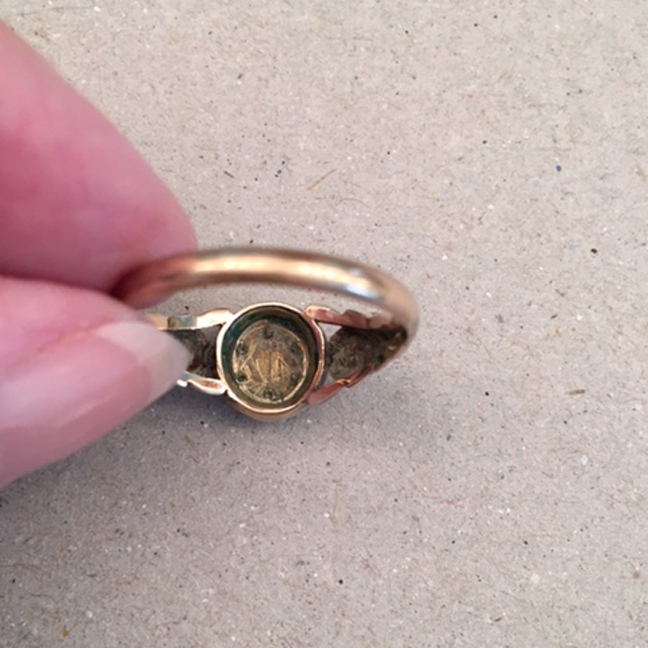 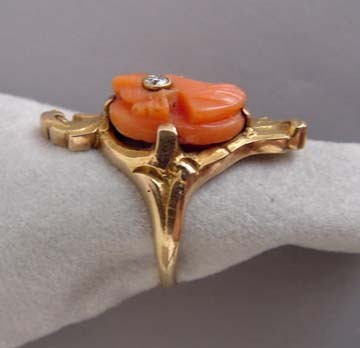 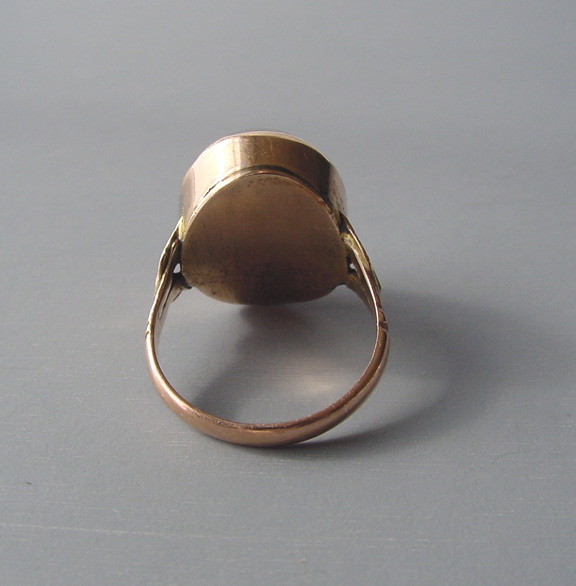 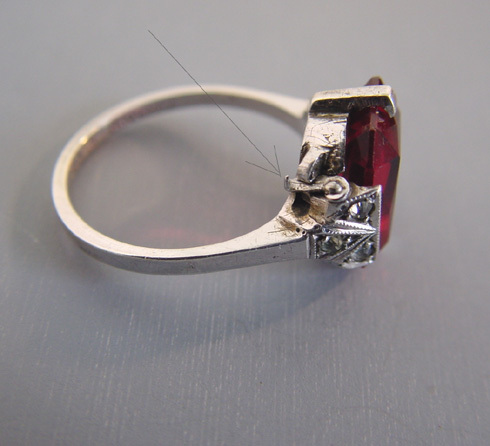 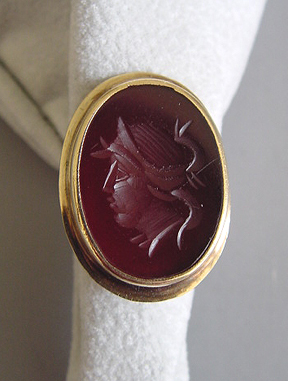 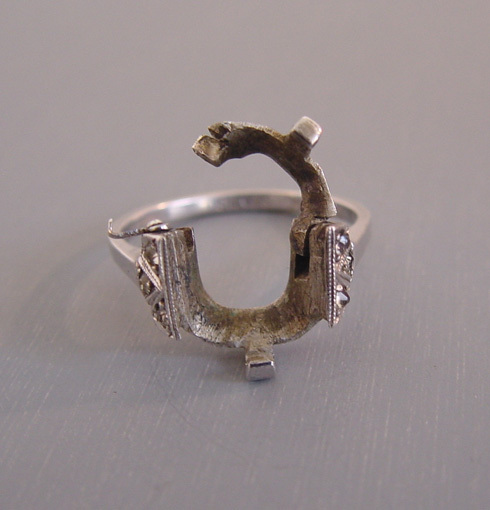 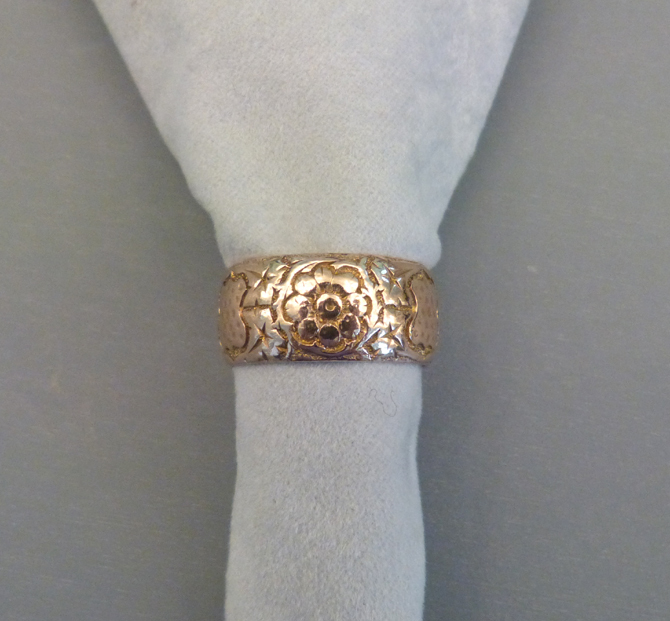 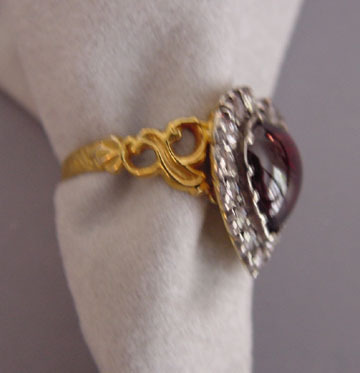 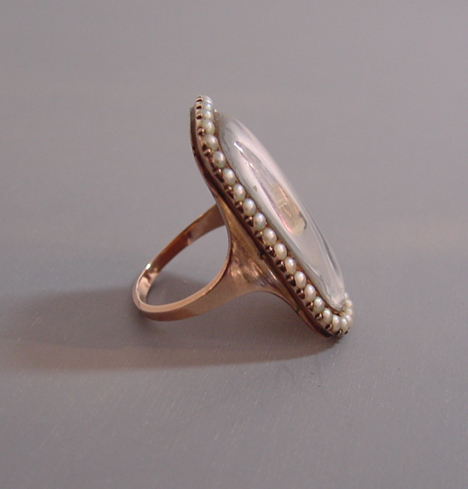 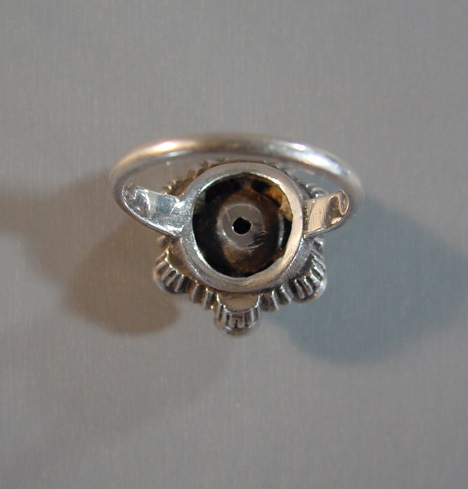 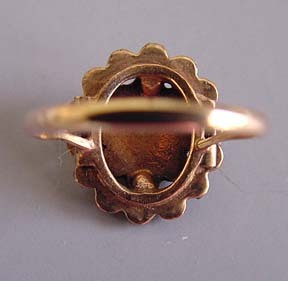 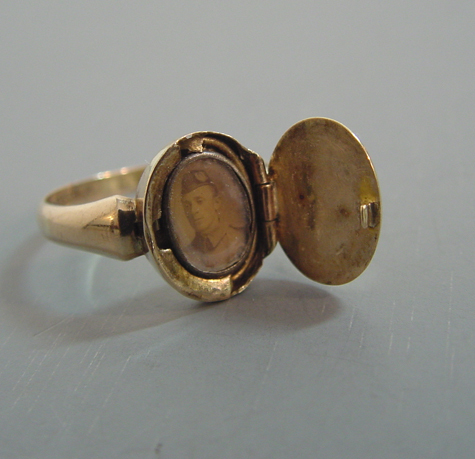 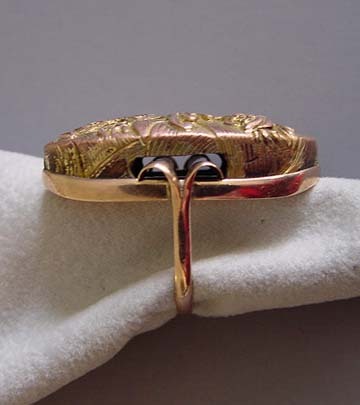 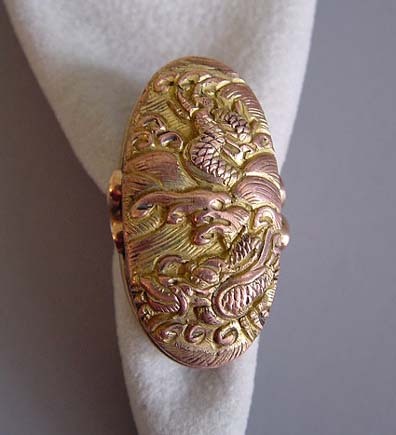 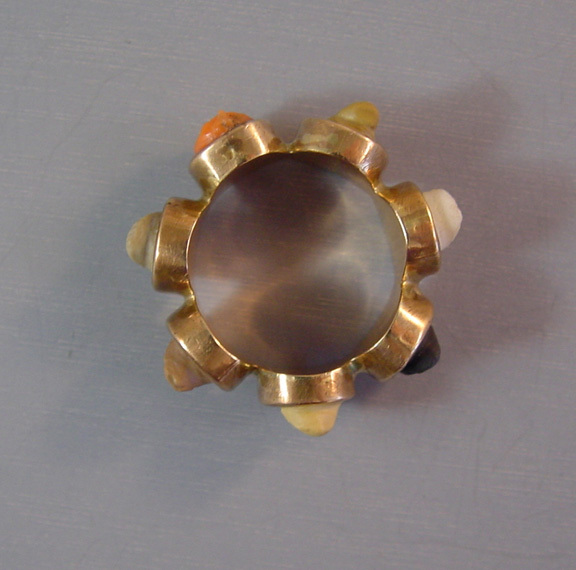 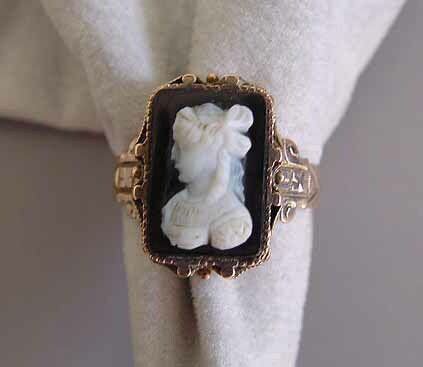 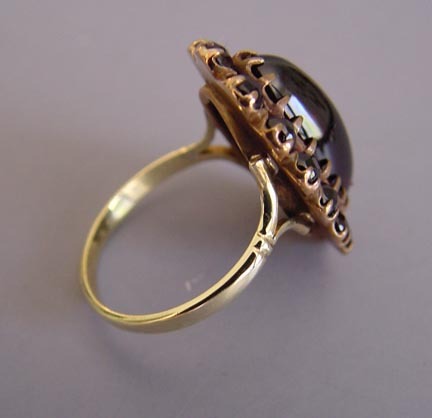 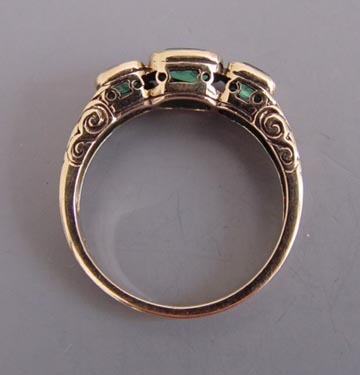 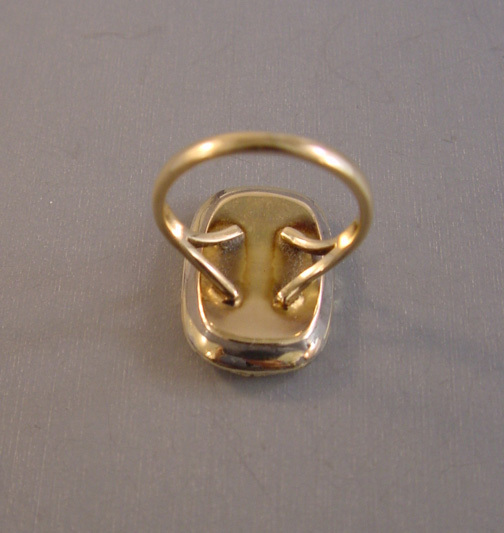 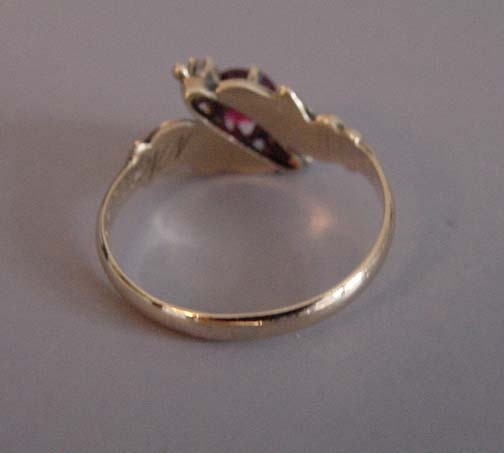 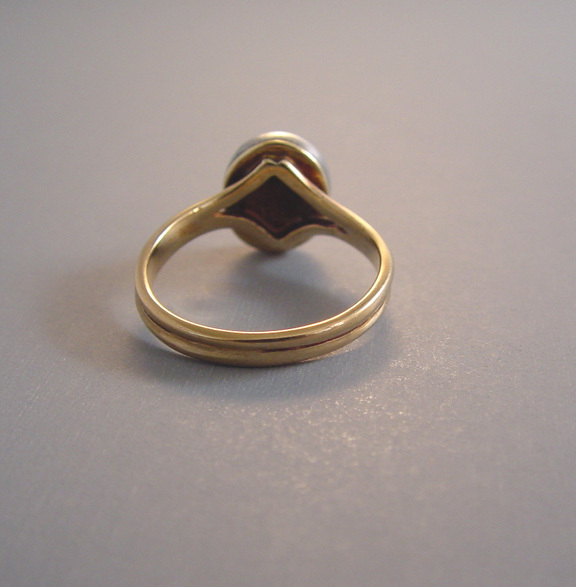 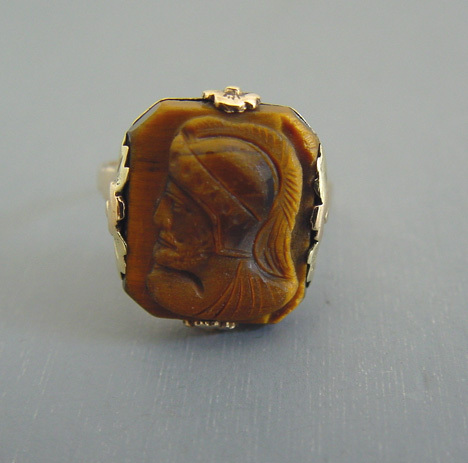 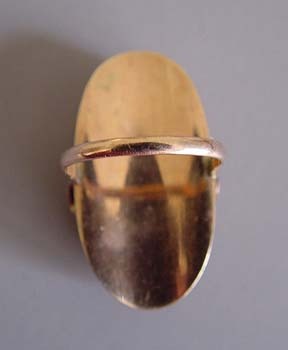 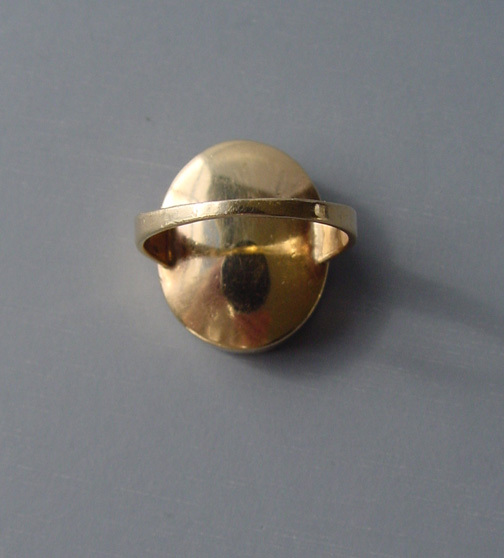 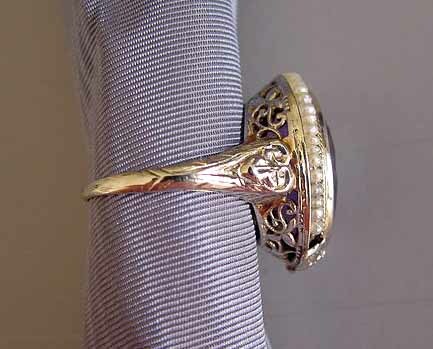 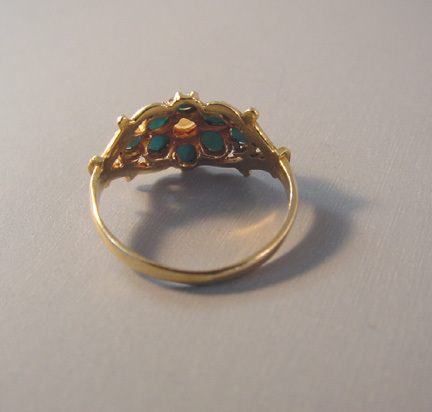 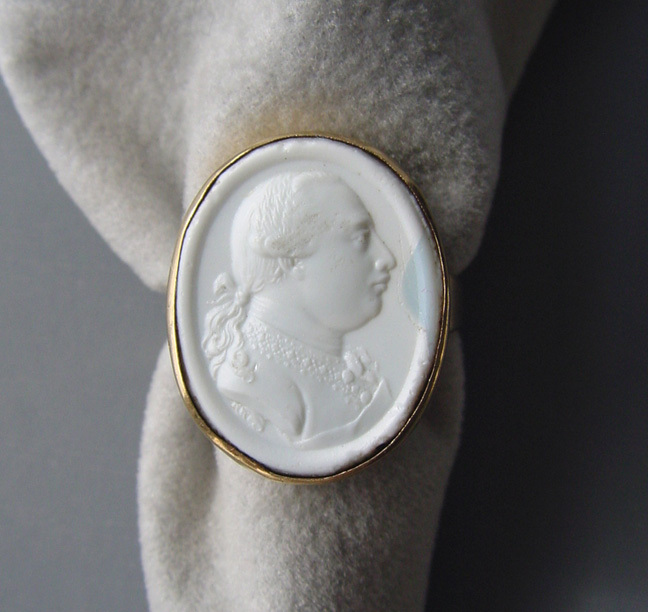 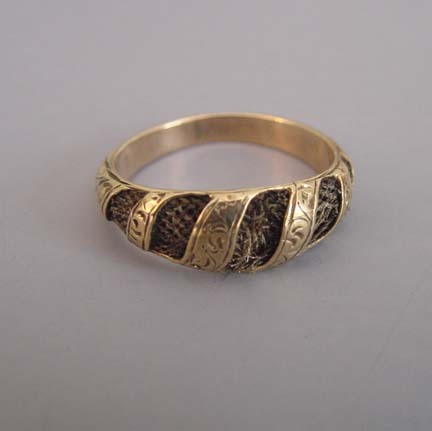 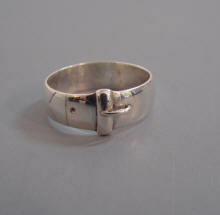 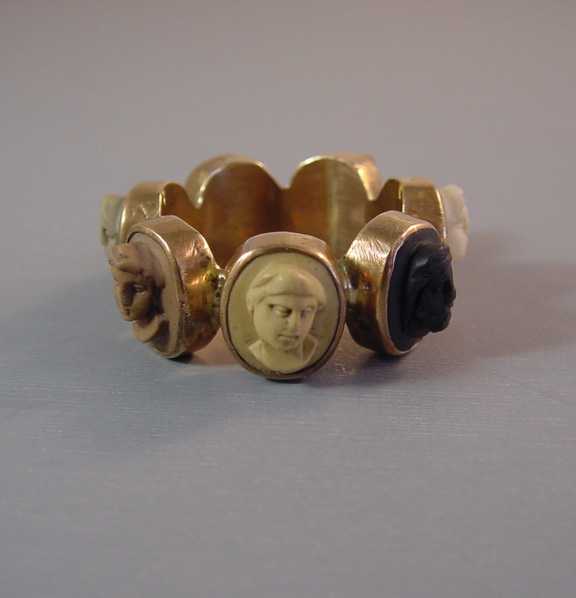 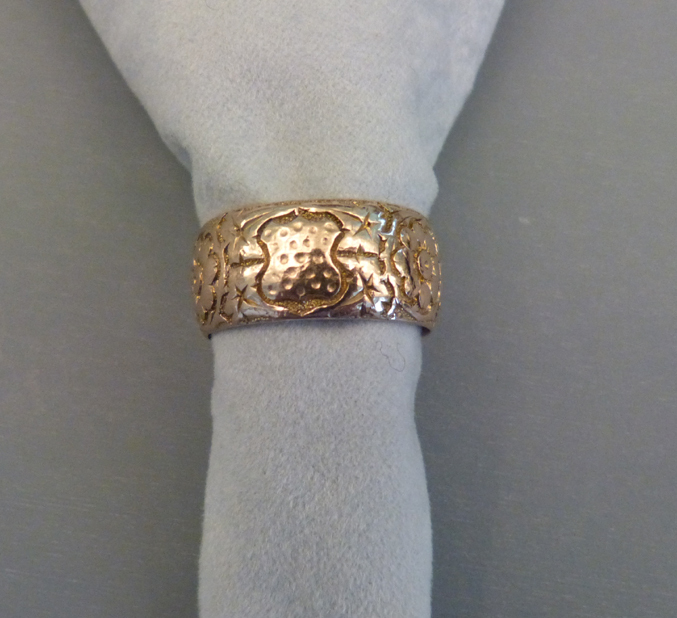 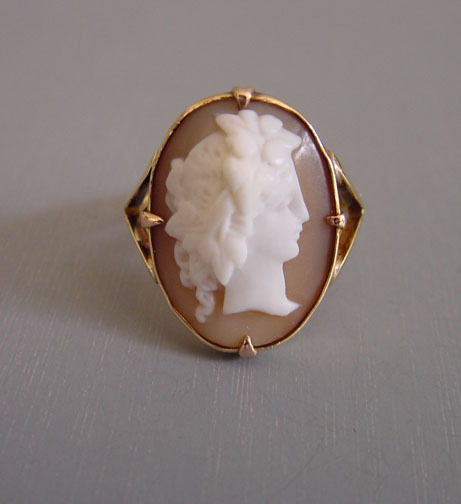 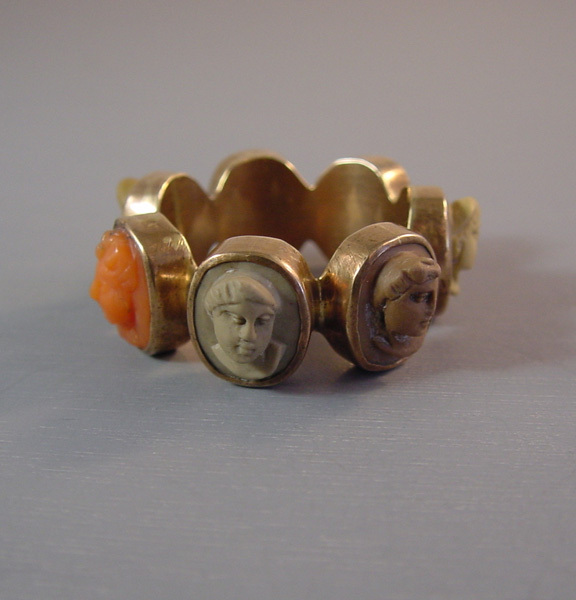 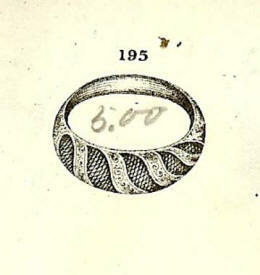 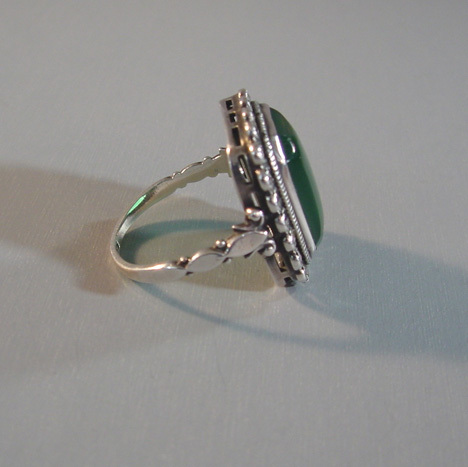 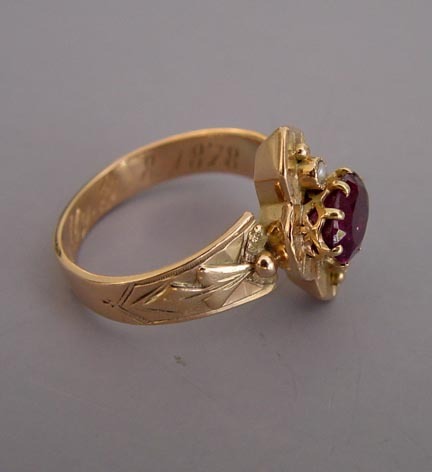 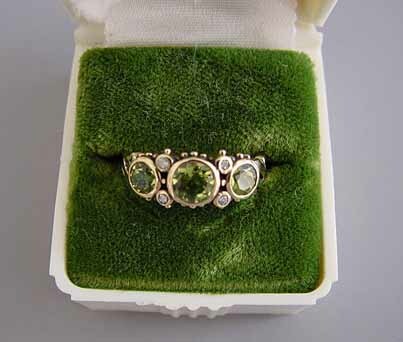 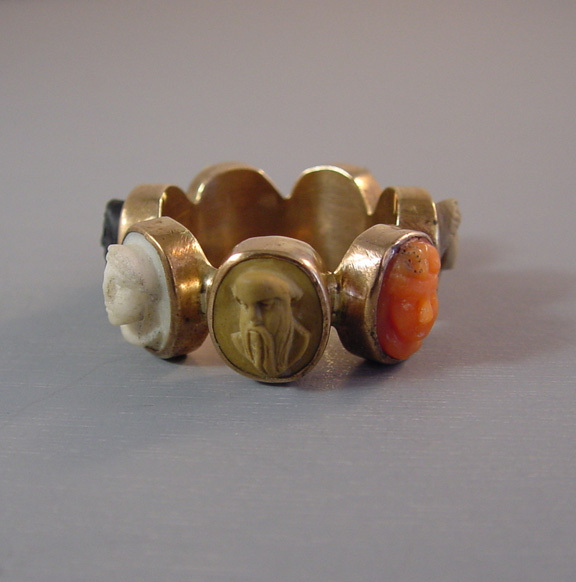 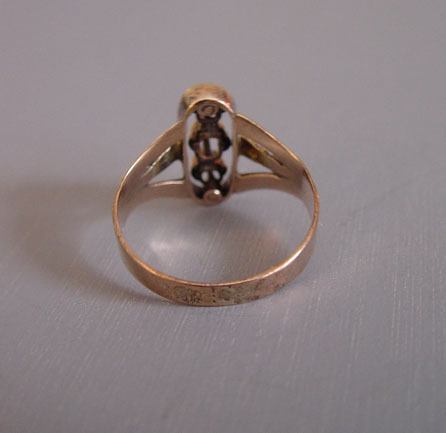 View Victorian hair ring as shown at right #V15258, and on page 13 of the catalogue. 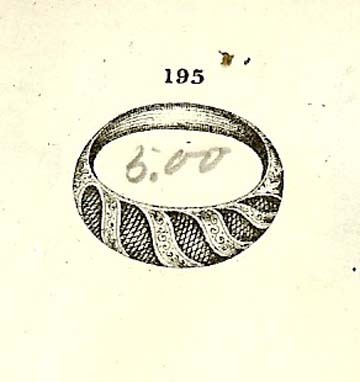 #V15458. 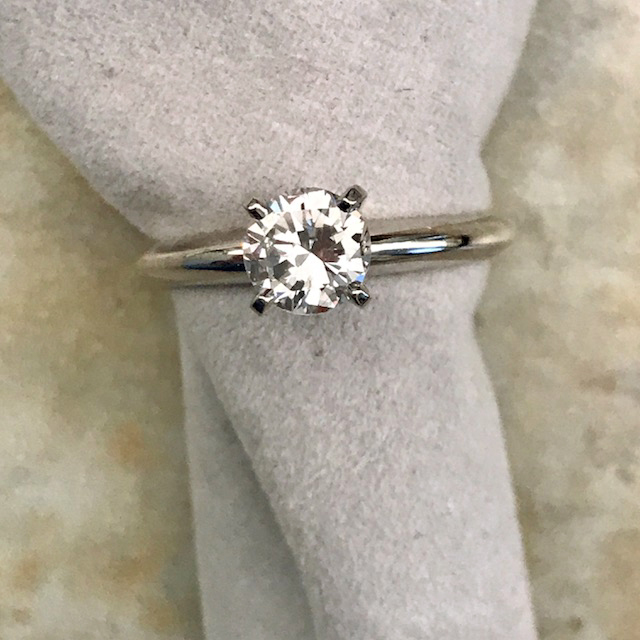 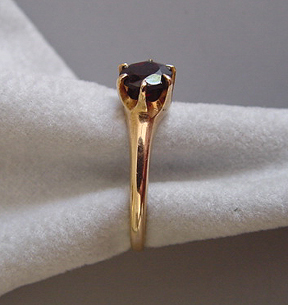 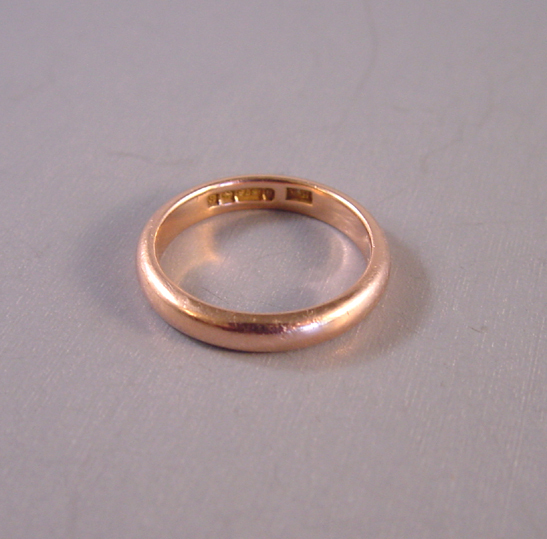 By custom, wedding rings are worn on the third finger of the left hand. 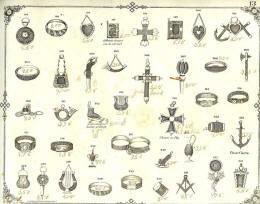 In the 1856 book "Inquire Within for Anything You Want to Know" by G.G. Evans, two explanations are given for this custom. 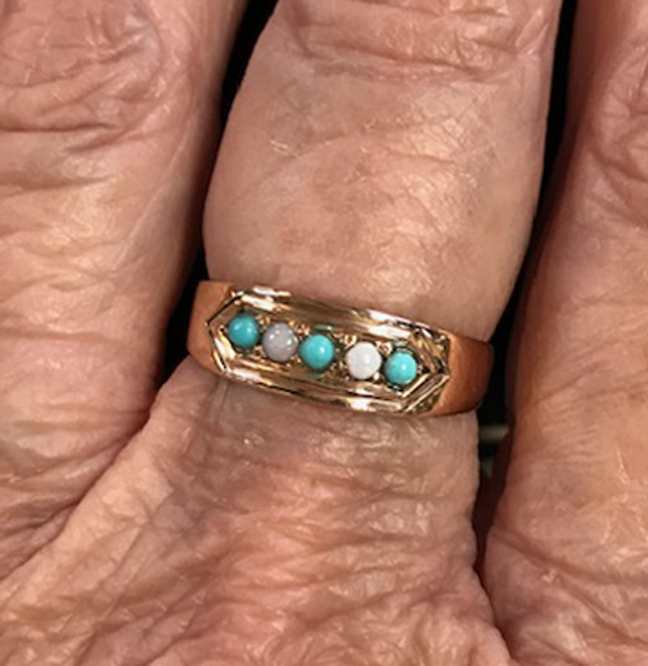 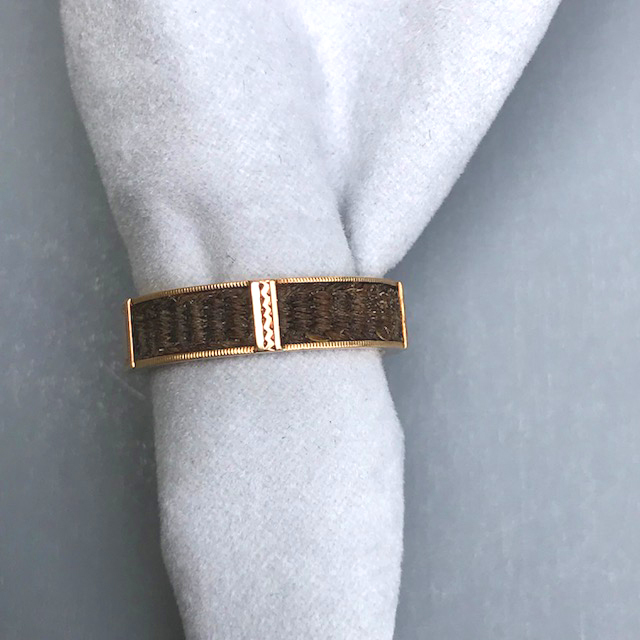 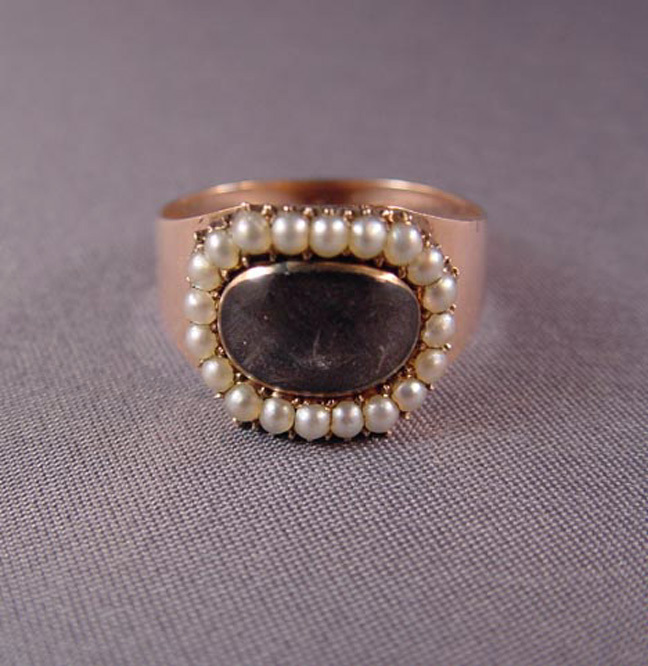 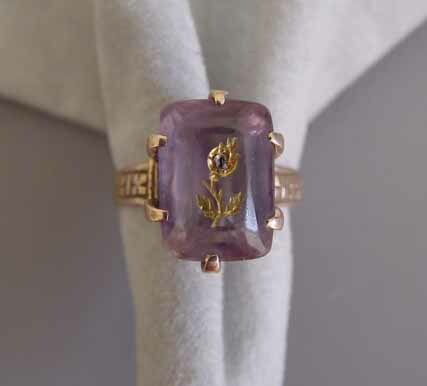 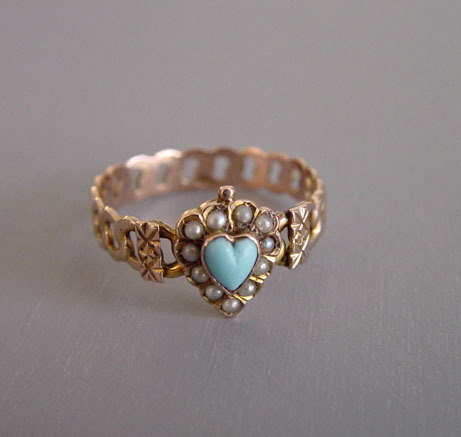 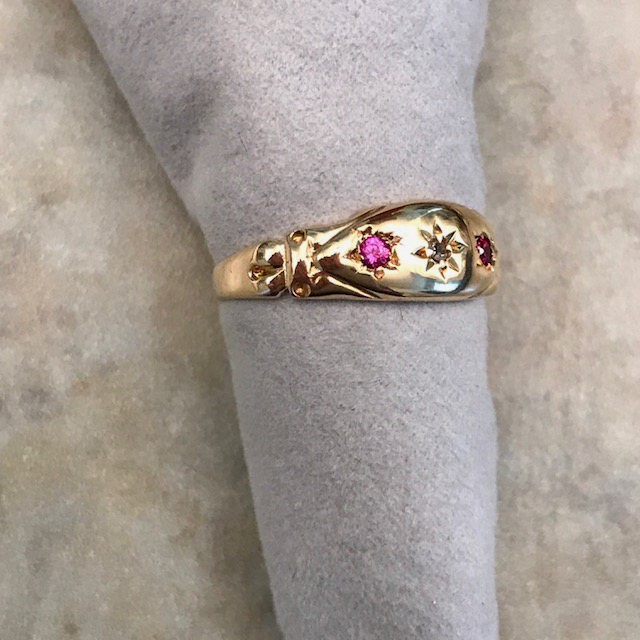 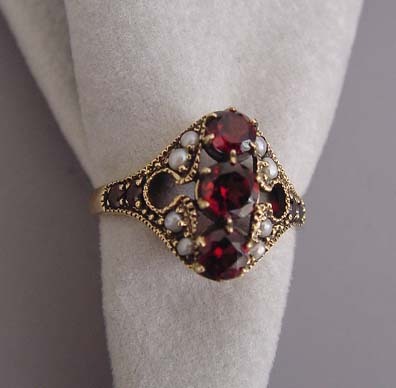 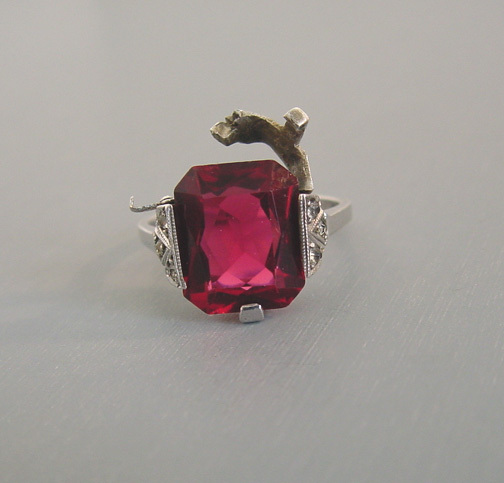 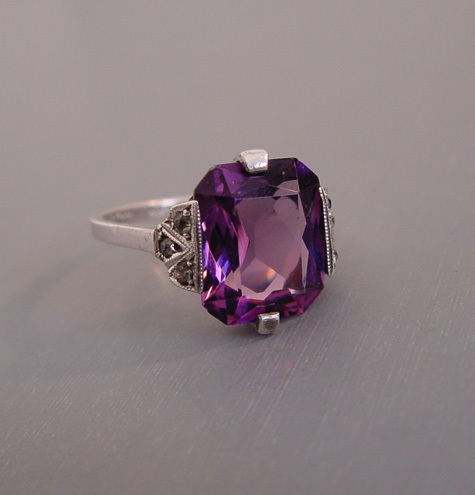 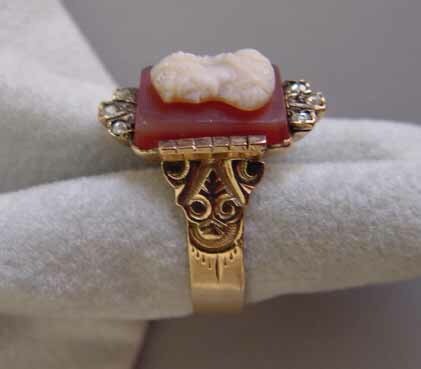 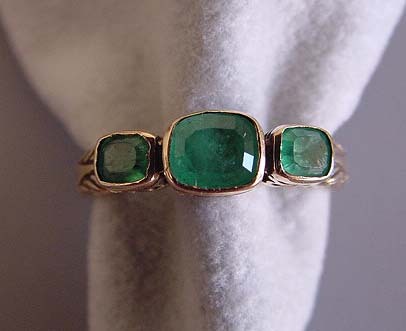 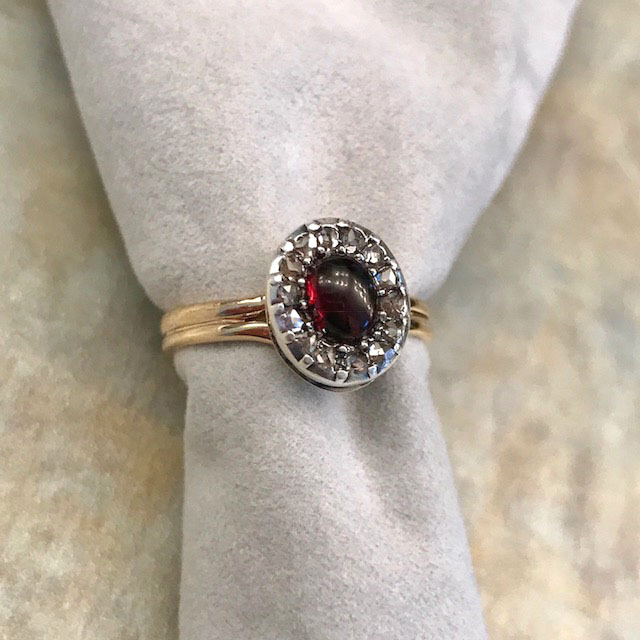 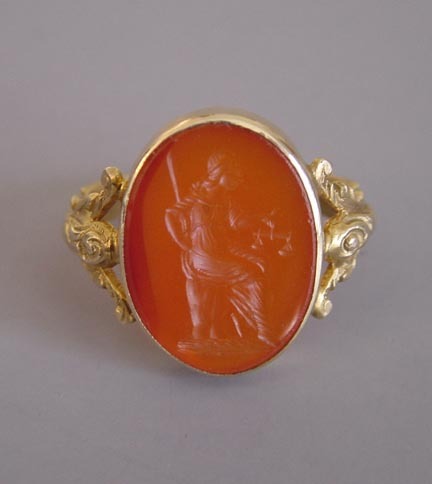 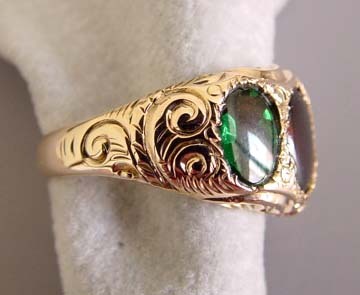 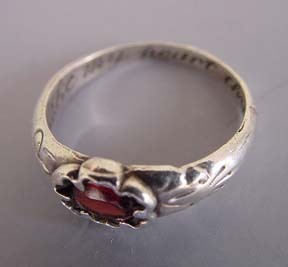 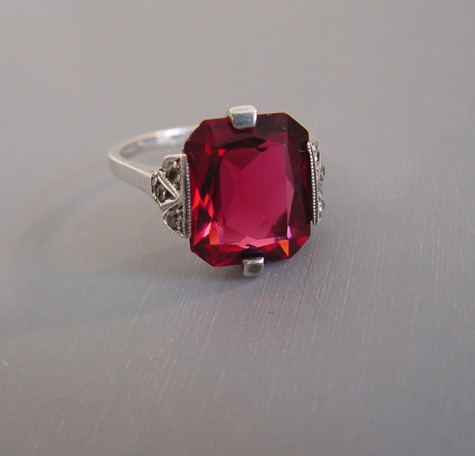 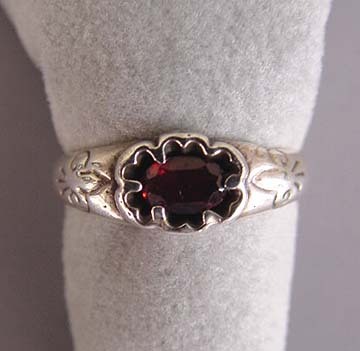 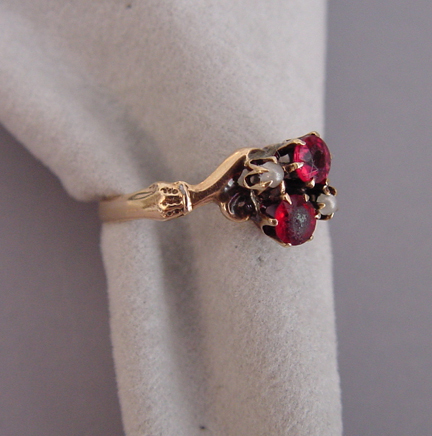 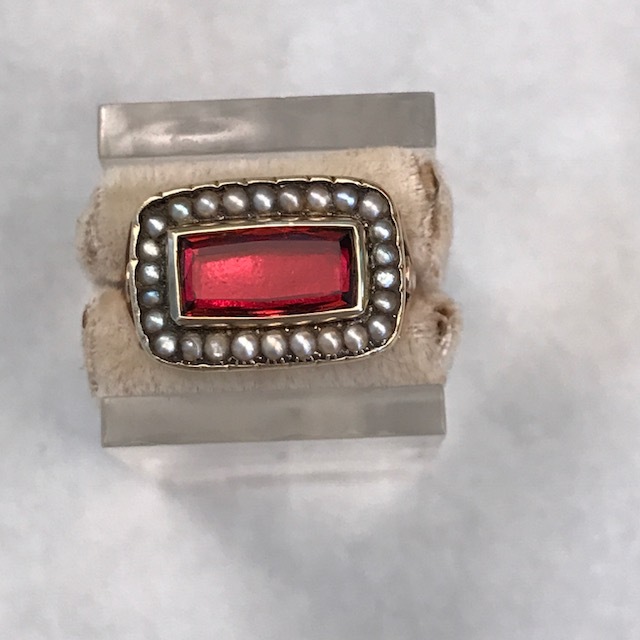 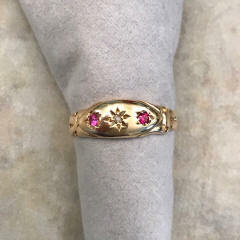 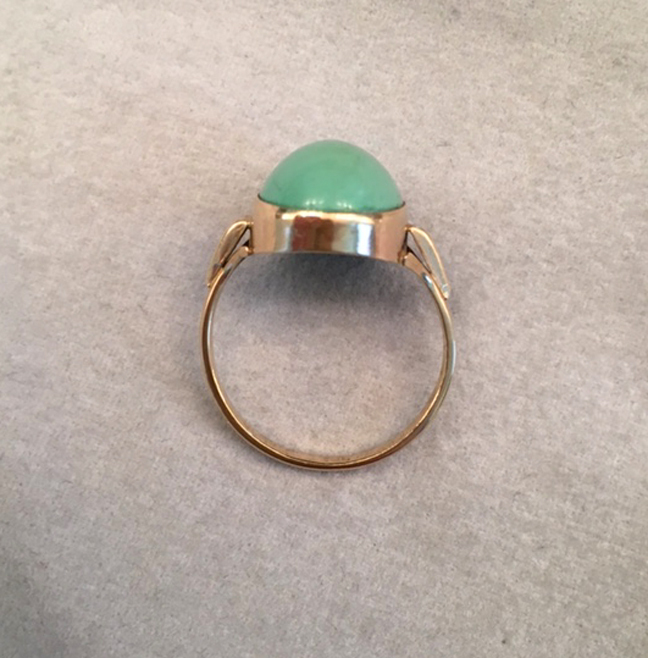 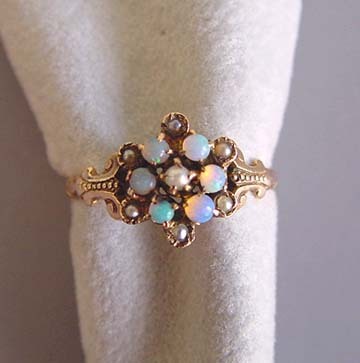 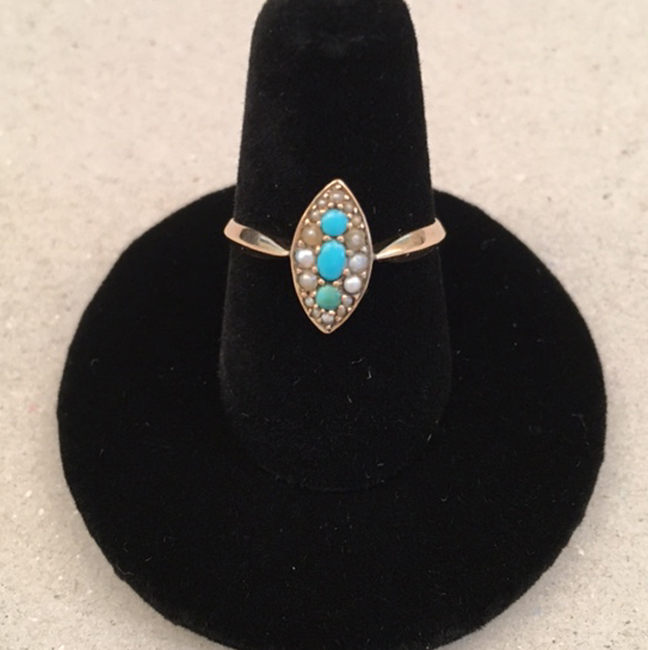 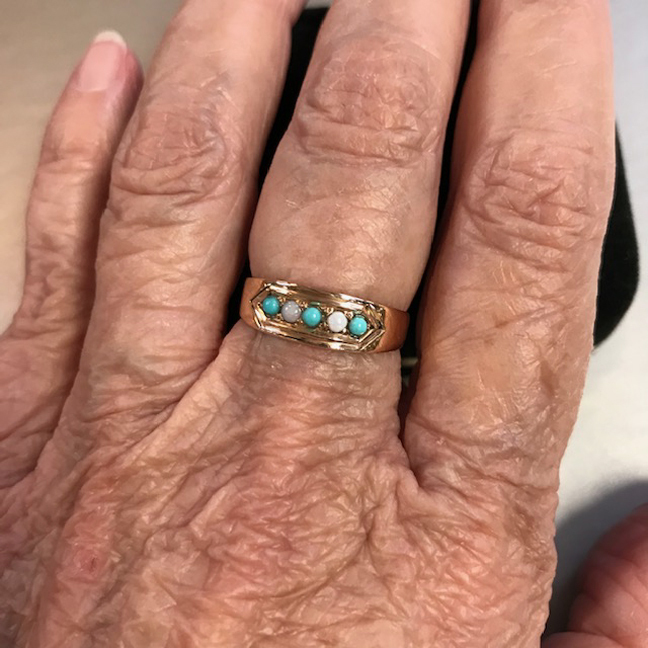 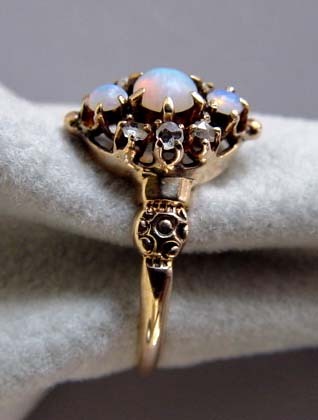 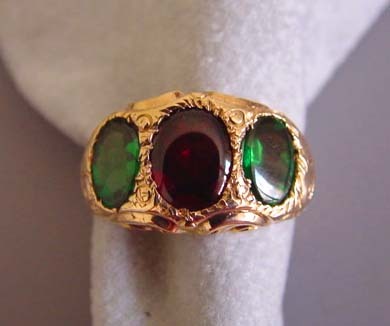 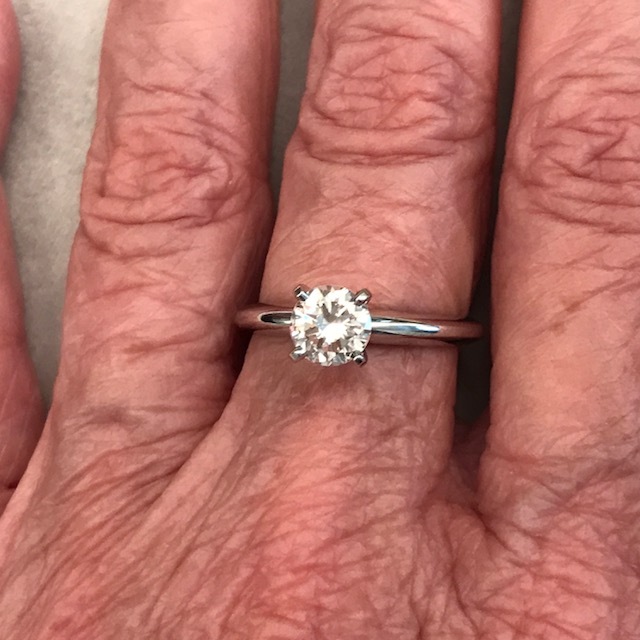 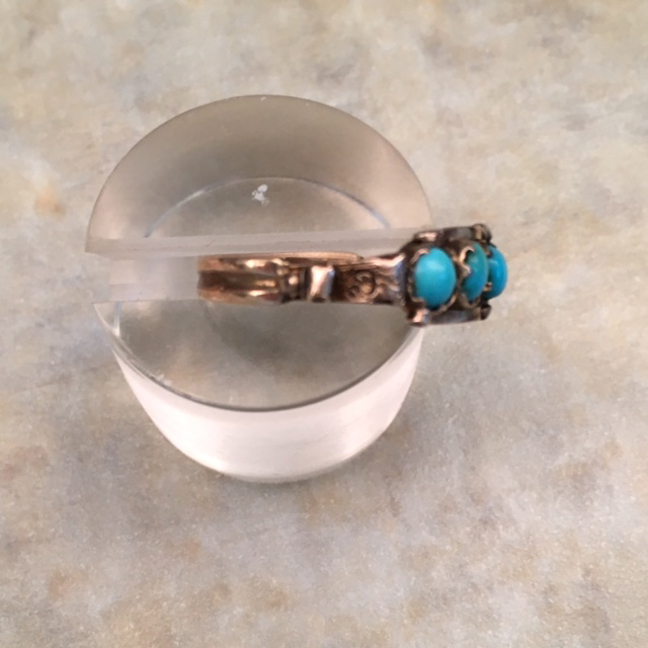 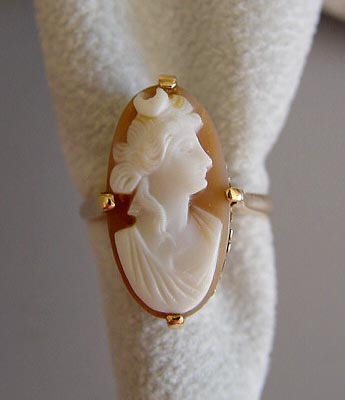 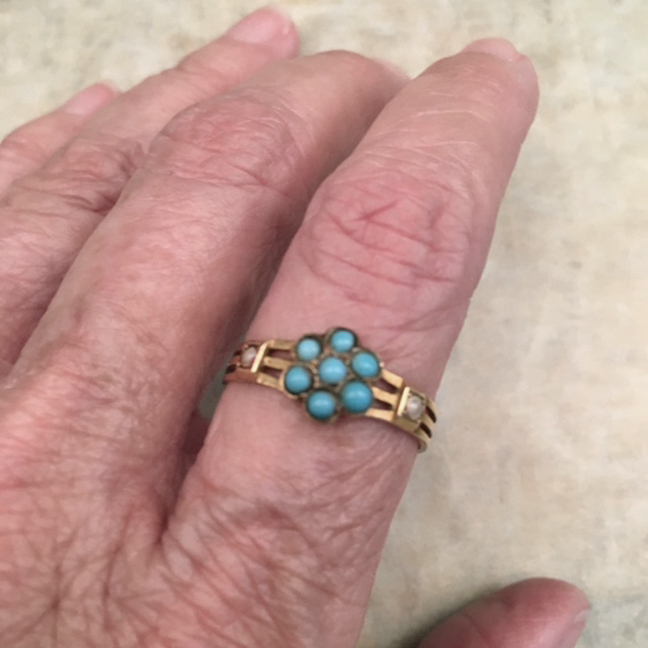 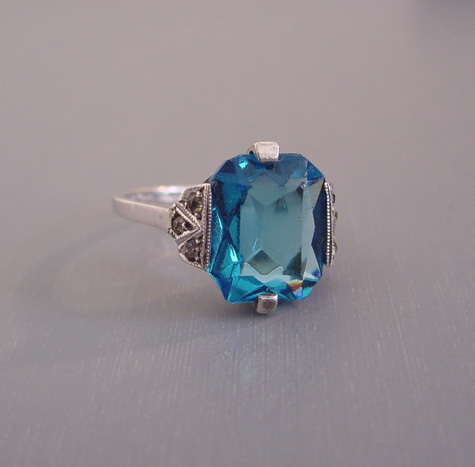 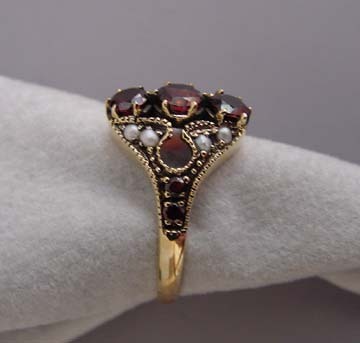 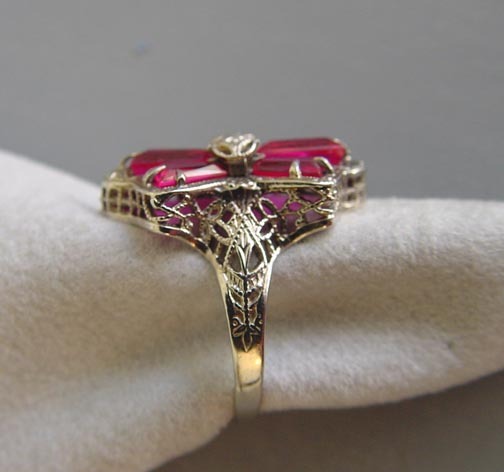 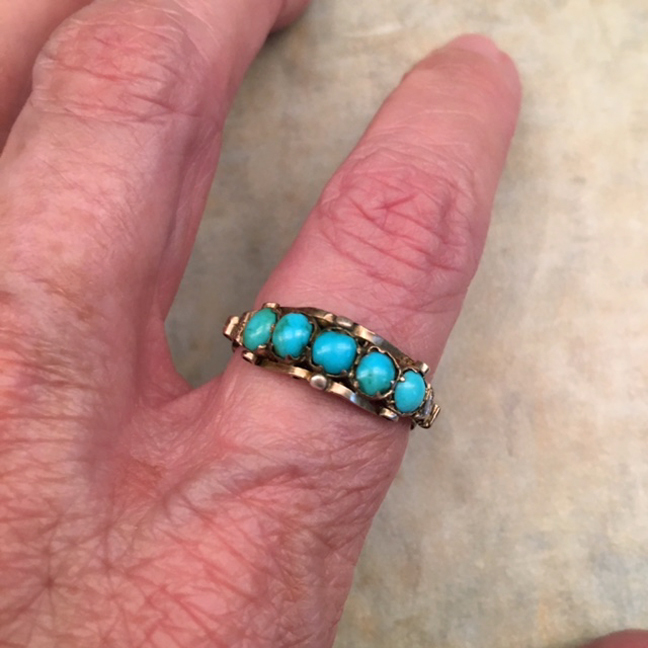 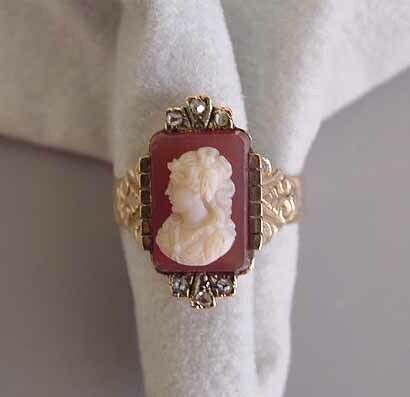 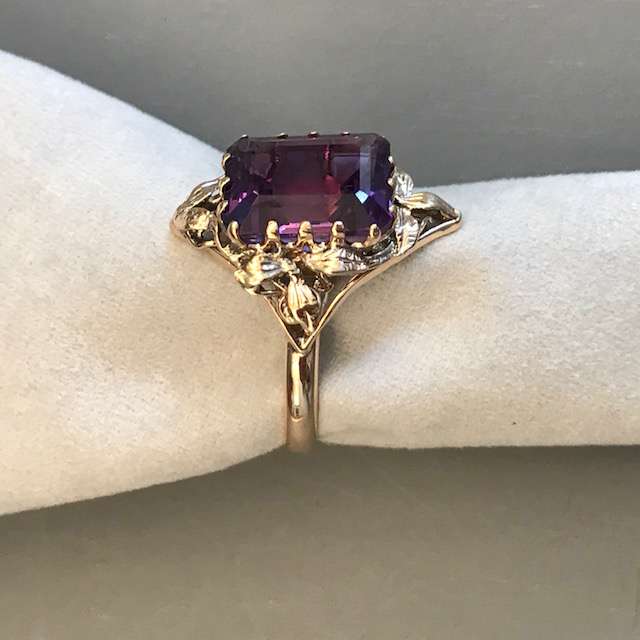 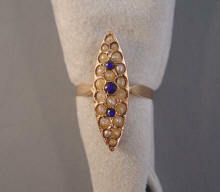 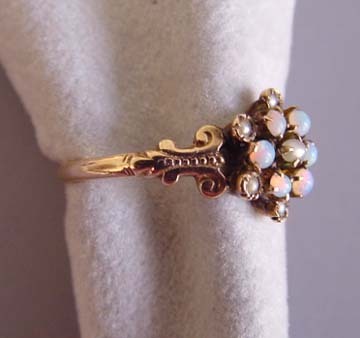 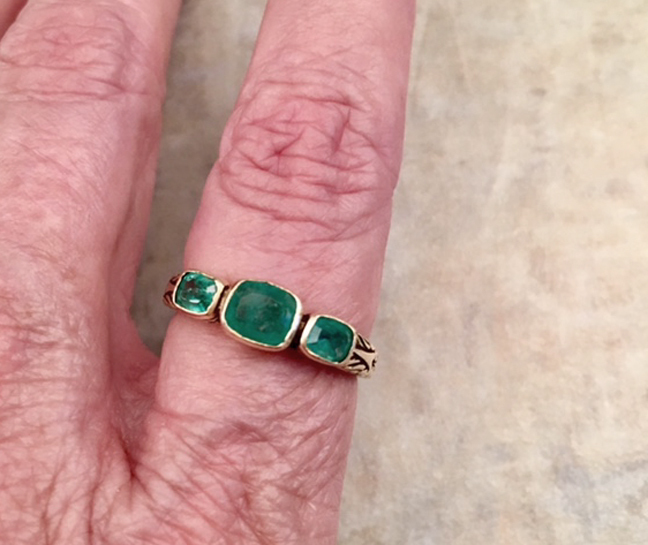 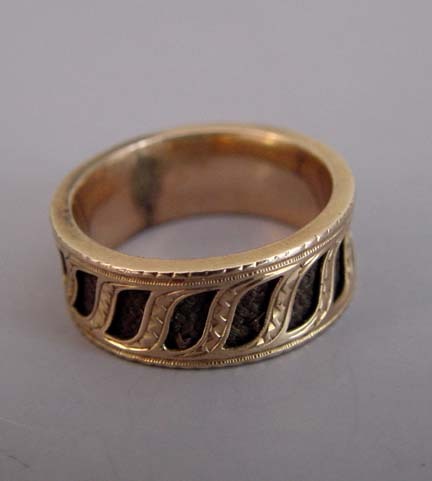 One goes back to Roman times, when a ring was worn on the fourth finger of the left hand because it was believed that a nerve ran from there to the heart. 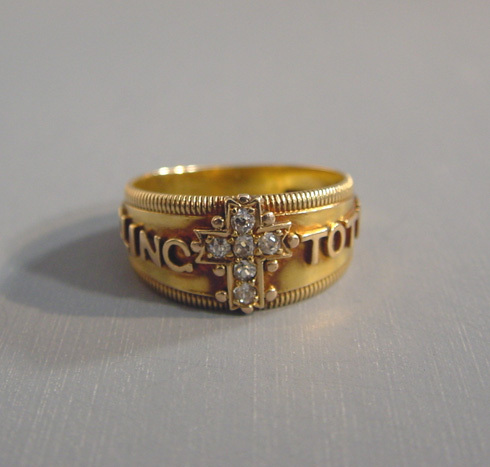 In Christian custom, the third finger symbolizes the Trinity. 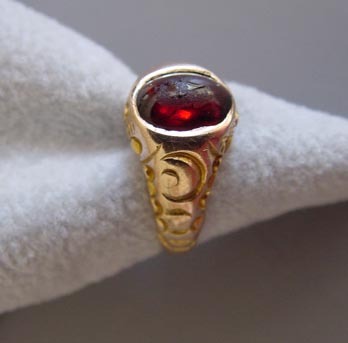 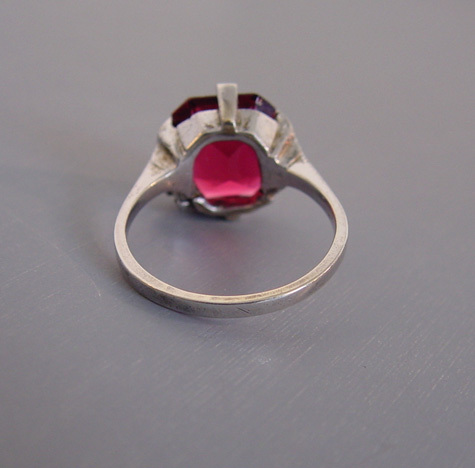 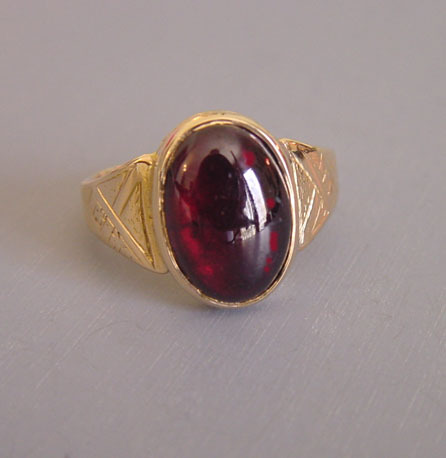 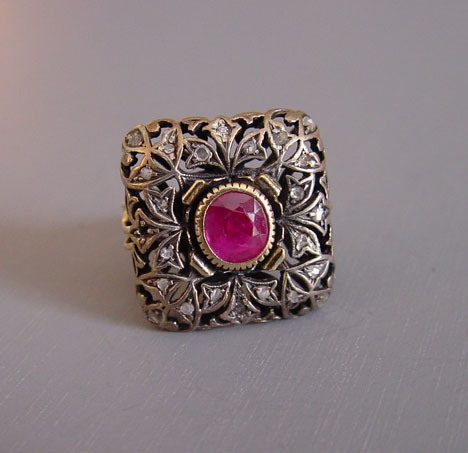 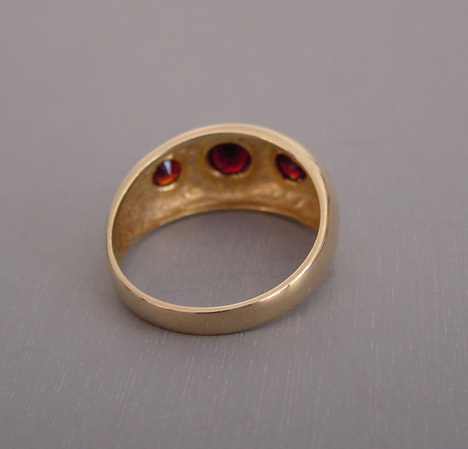 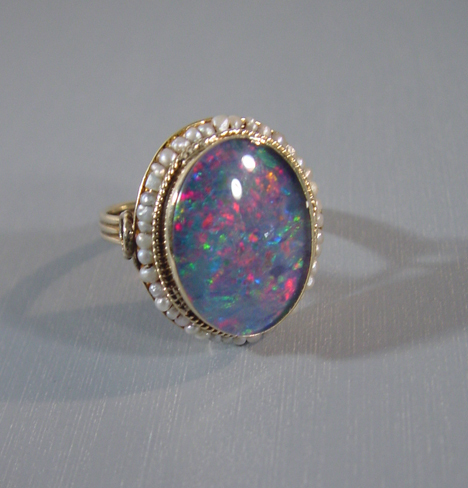 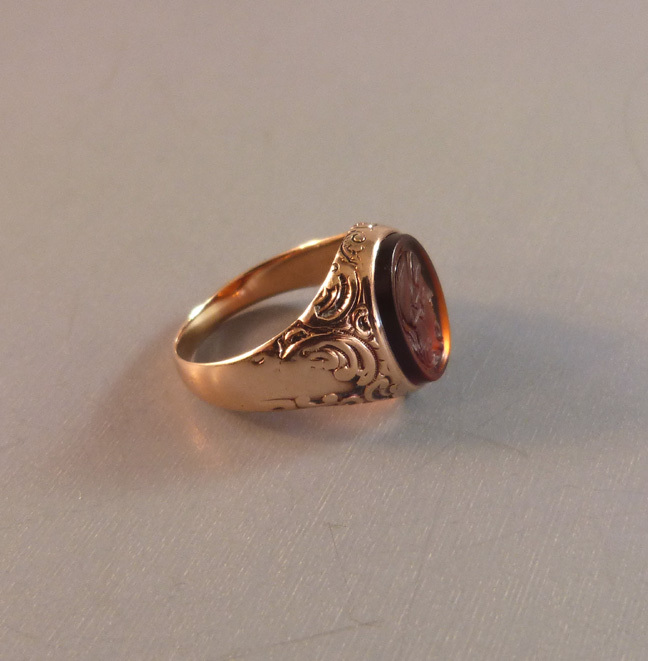 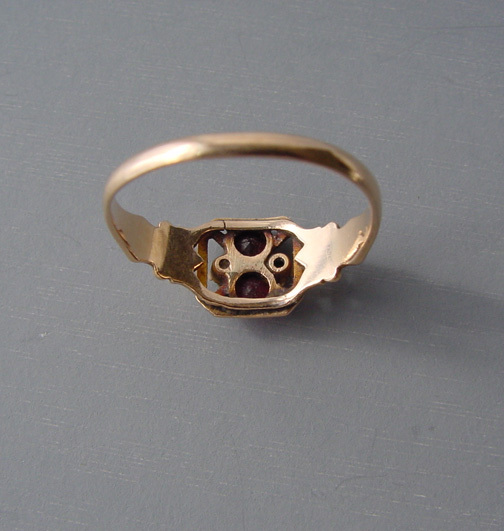 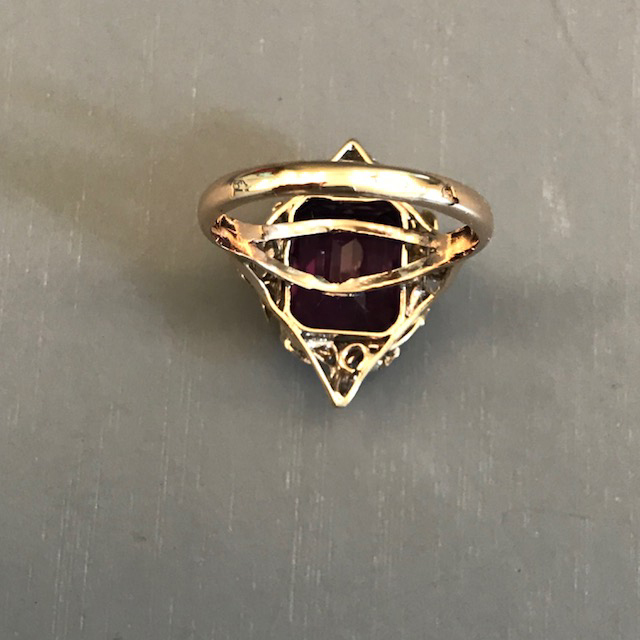 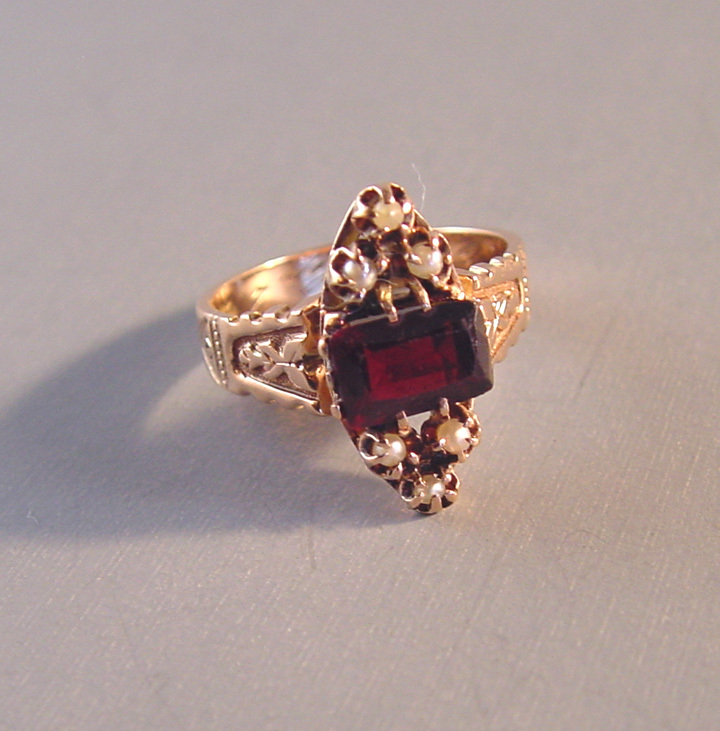 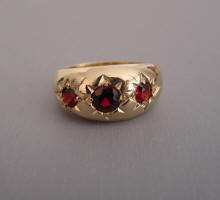 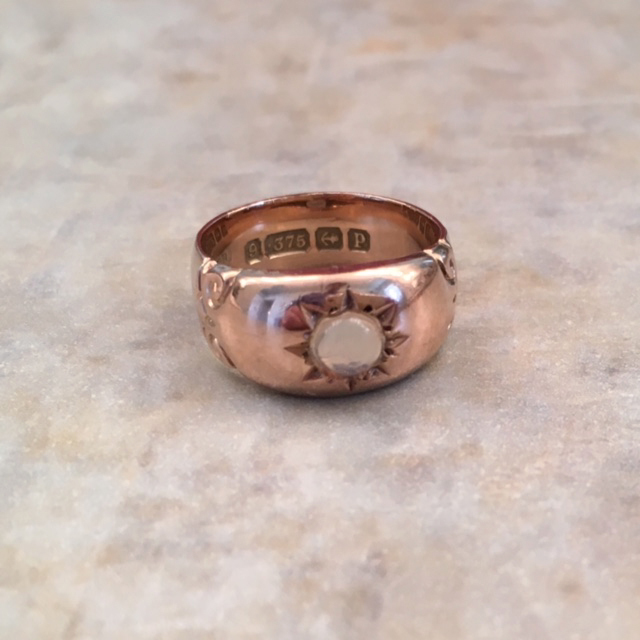 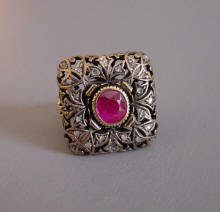 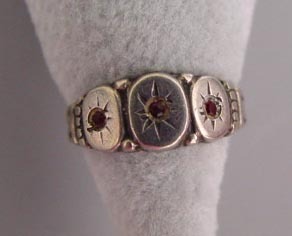 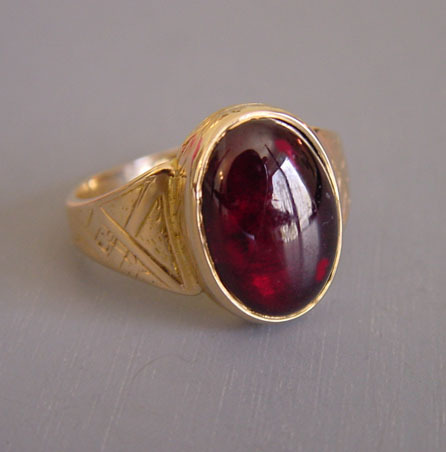 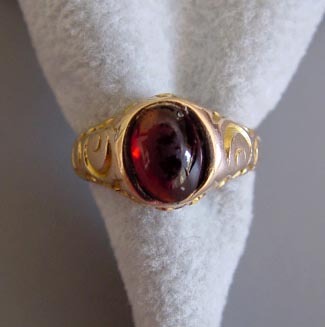 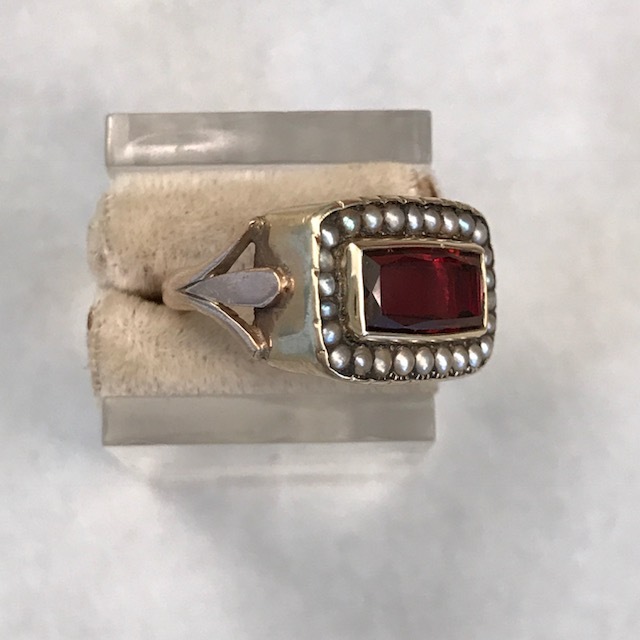 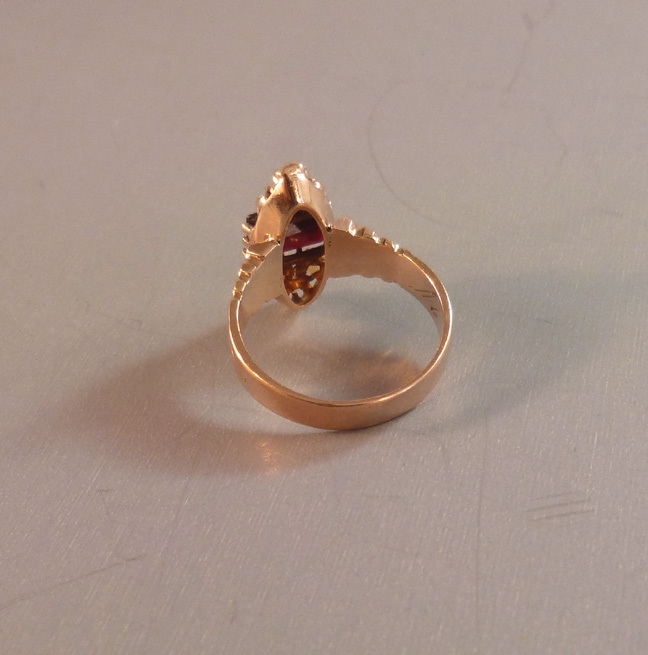 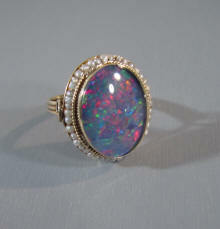 Men's seal, garnet and opal rings. 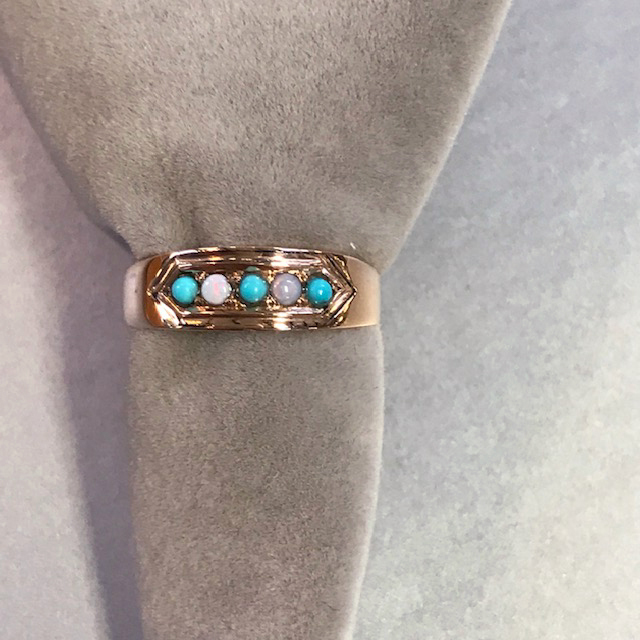 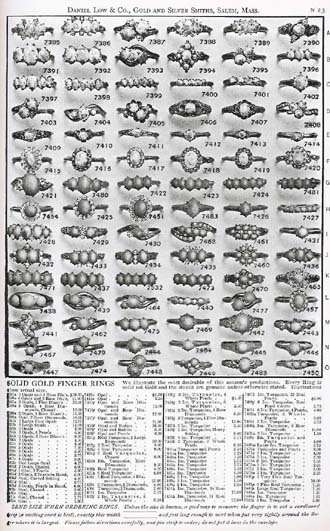 14k birth month rings, all real stones. 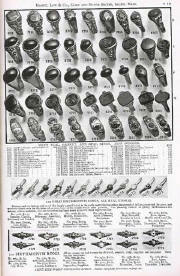 Priced in the catalogue from $1.60 to $18.00 each. 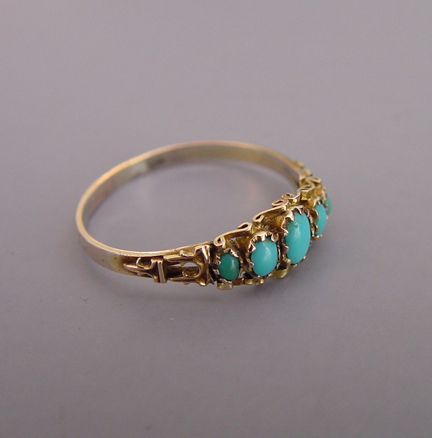 Persian turquoise is a turquoise with no matrix at all. 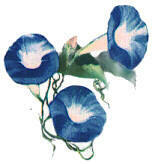 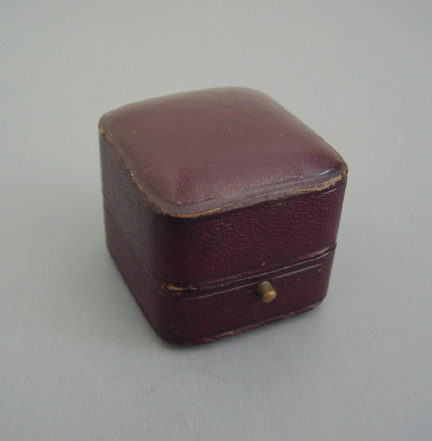 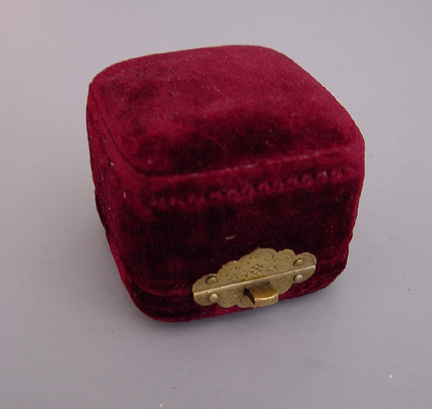 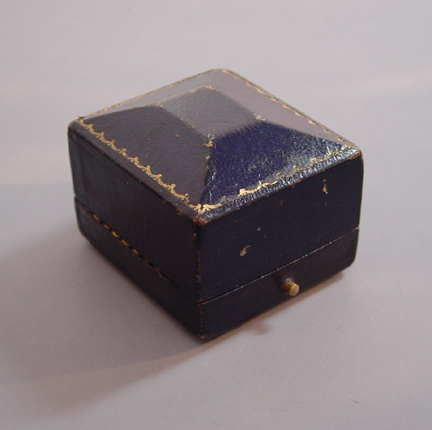 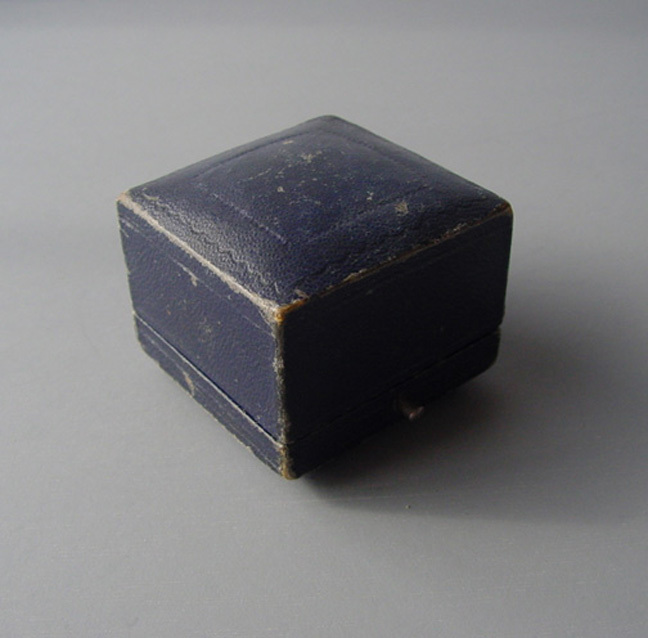 It was very popular in the Victorian era and even into the early 20th Century. 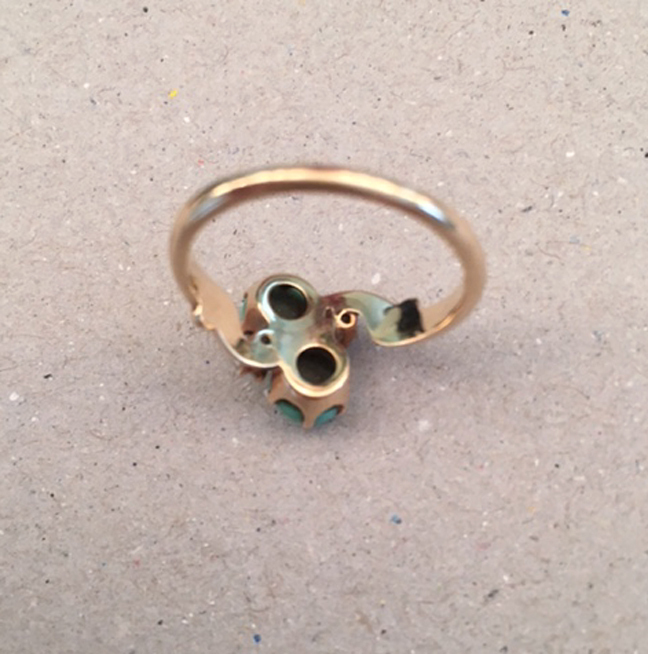 Often set in karat yellow or rose gold, the designs were almost endless, as you can see from the selection below. 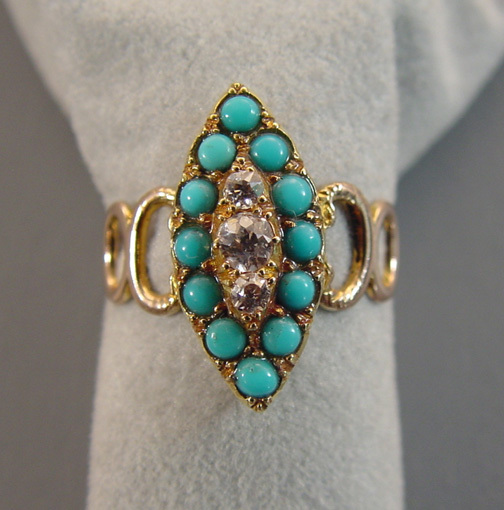 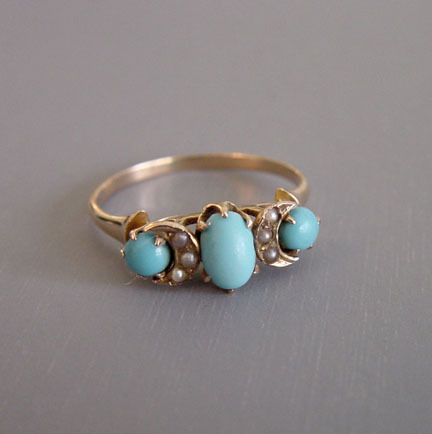 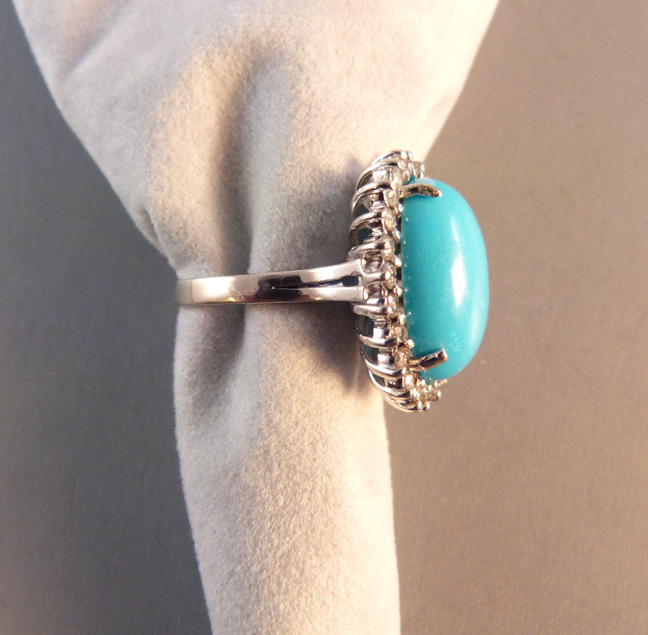 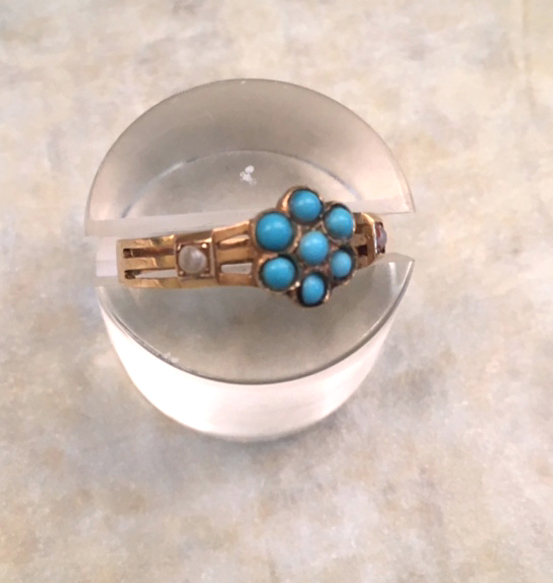 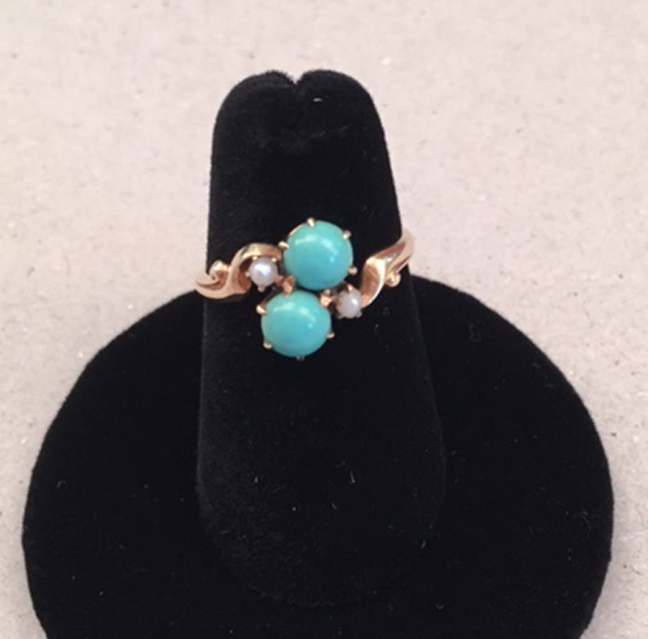 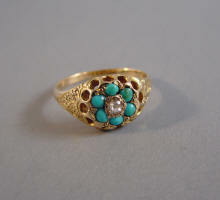 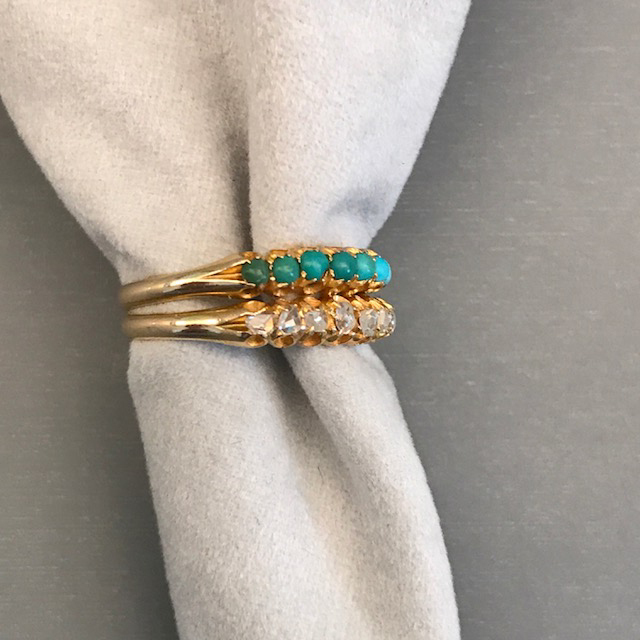 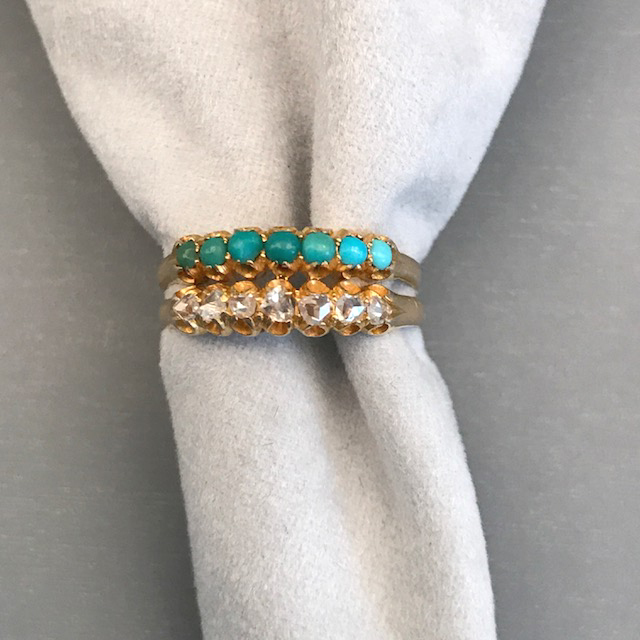 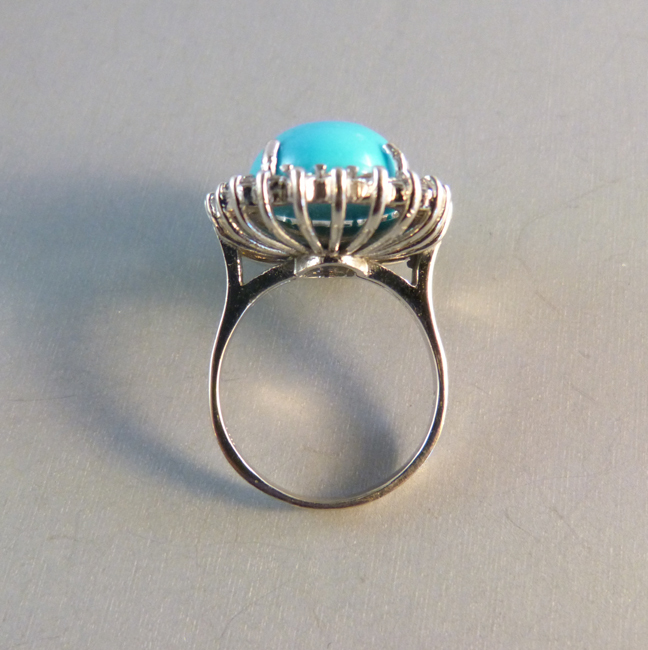 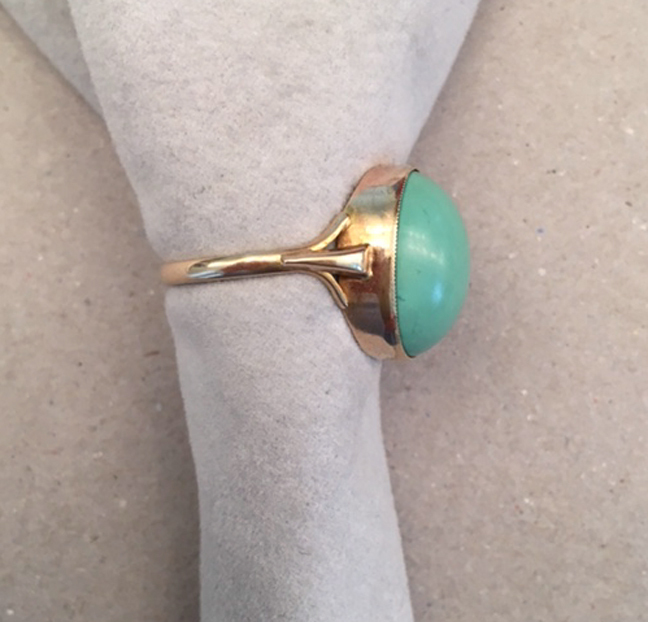 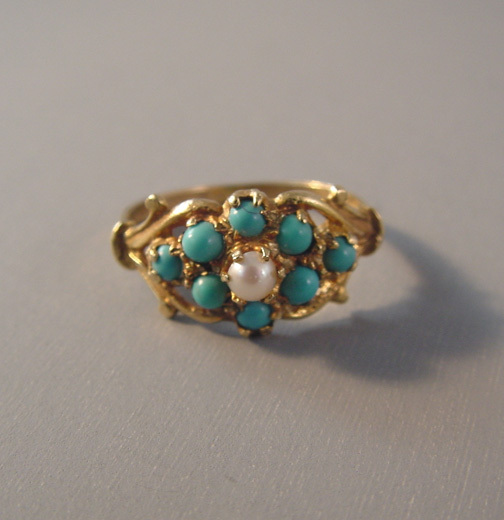 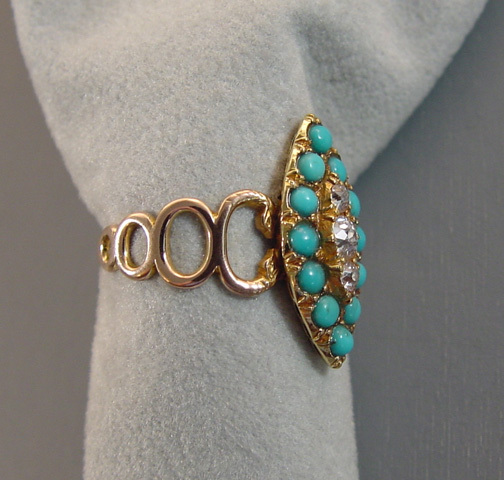 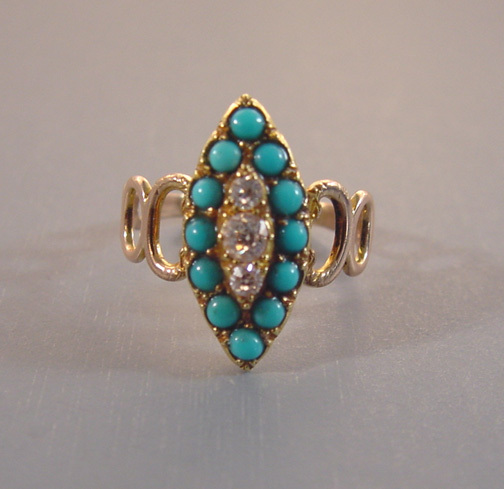 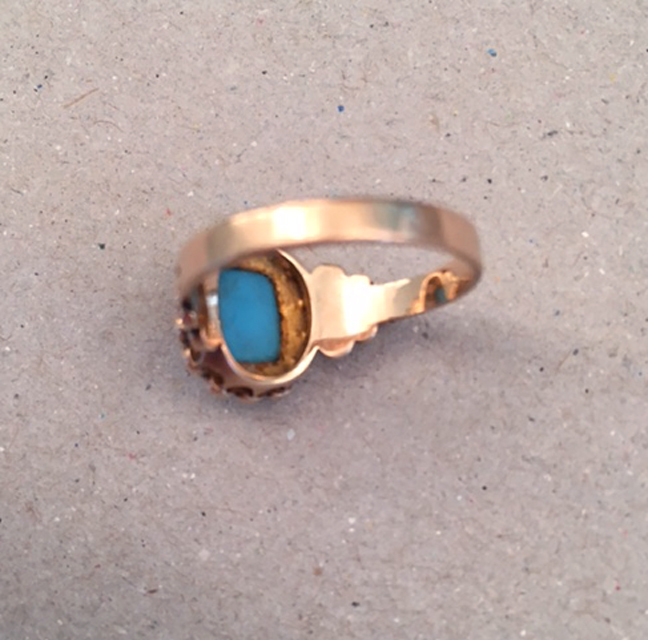 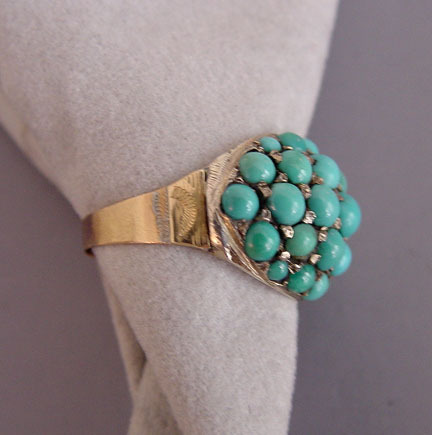 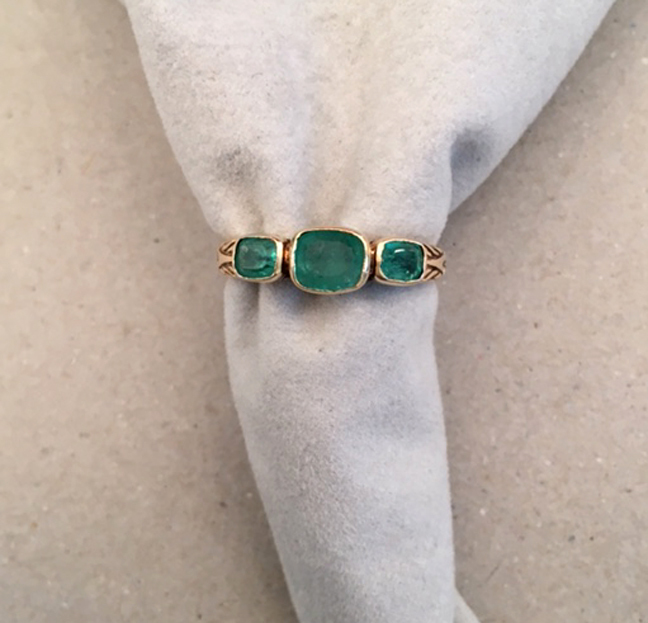 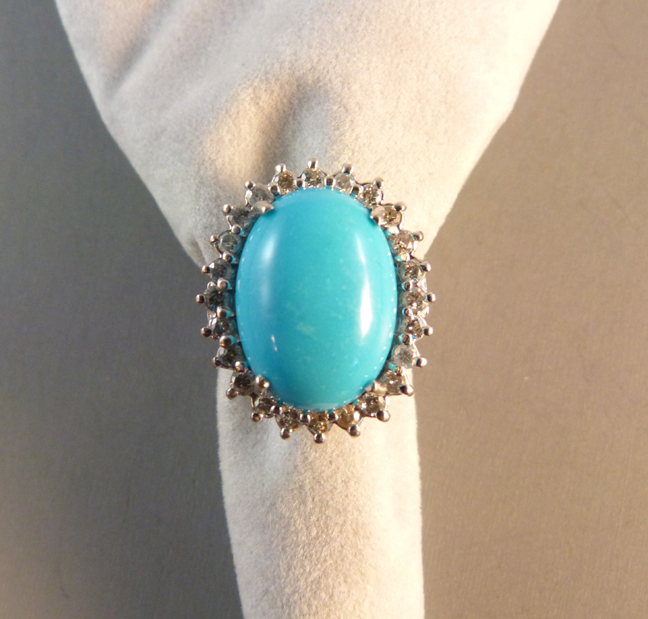 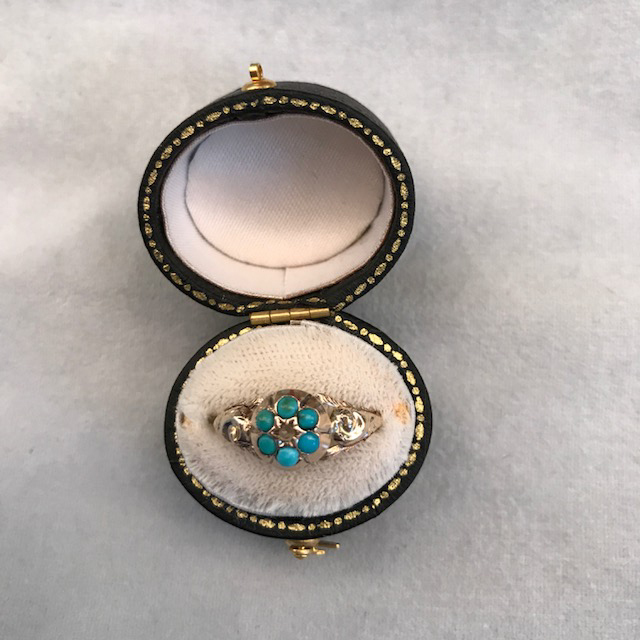 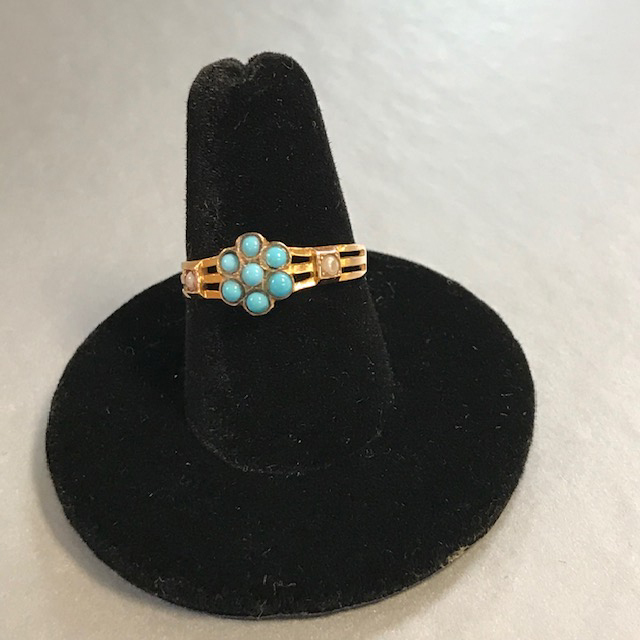 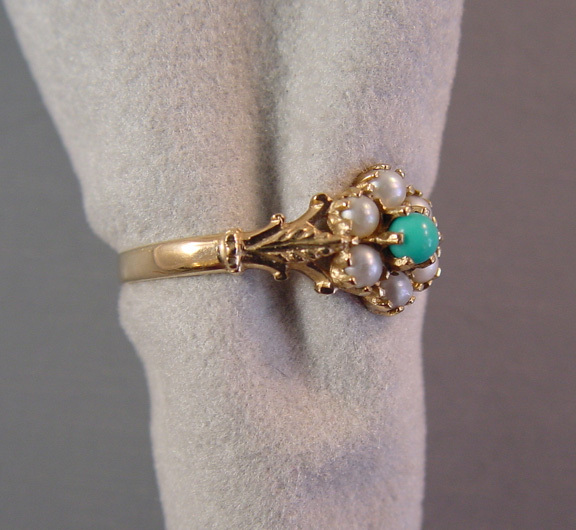 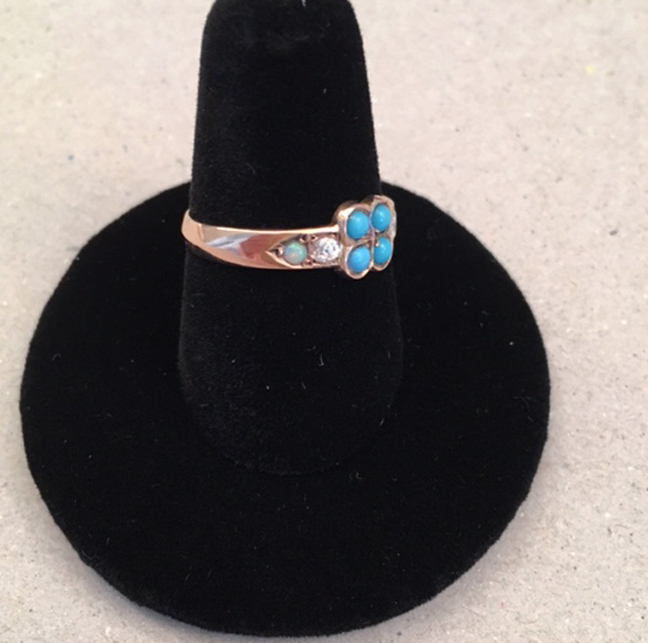 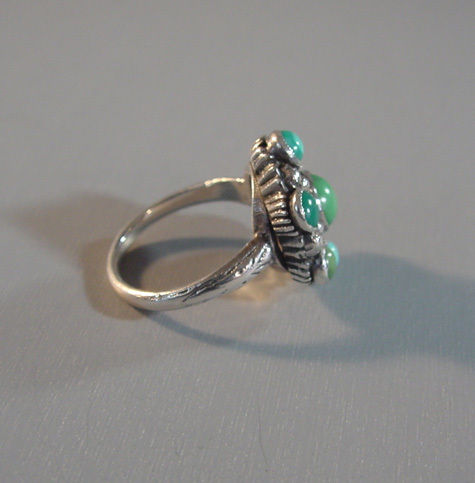 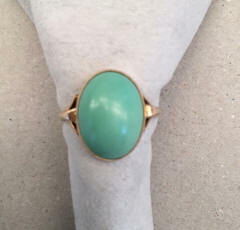 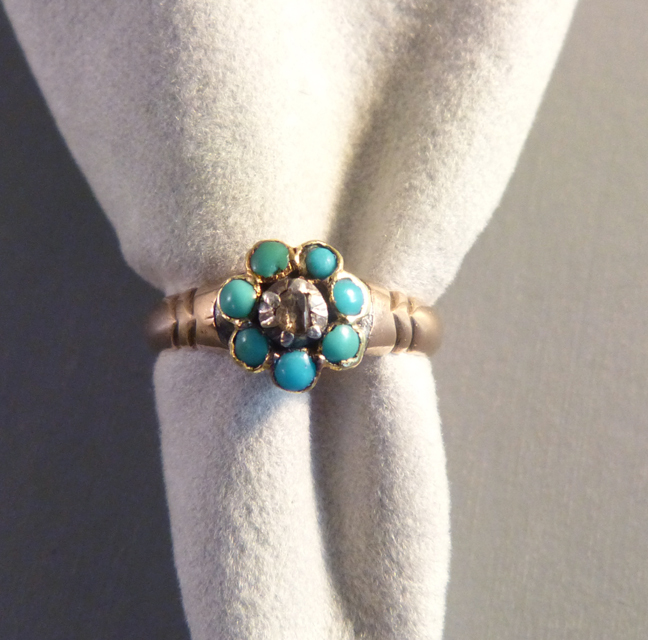 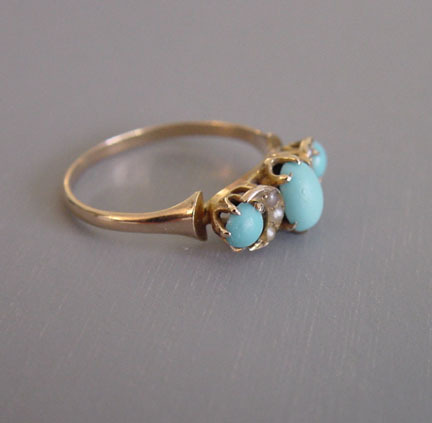 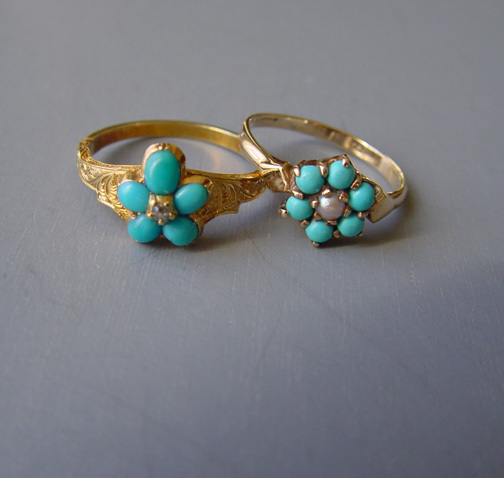 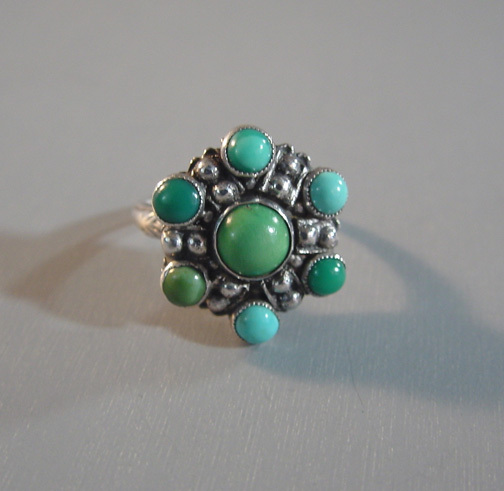 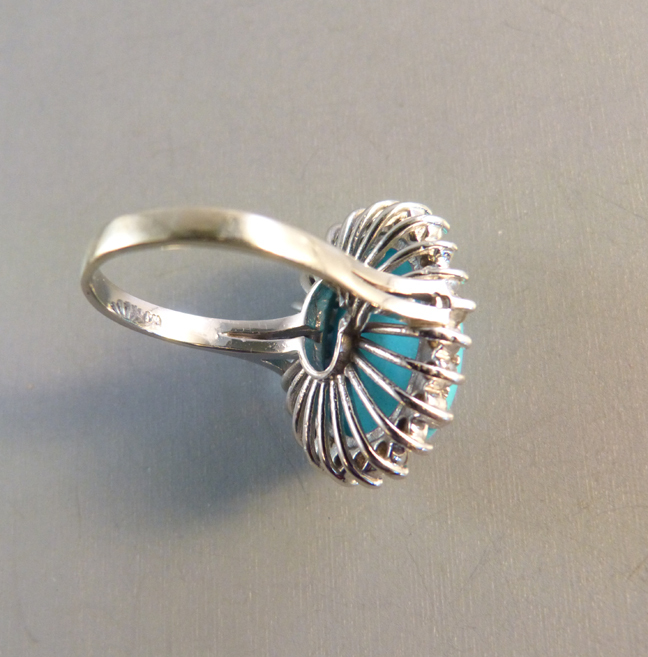 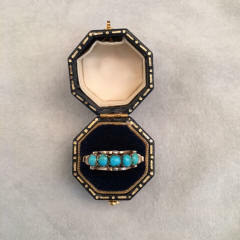 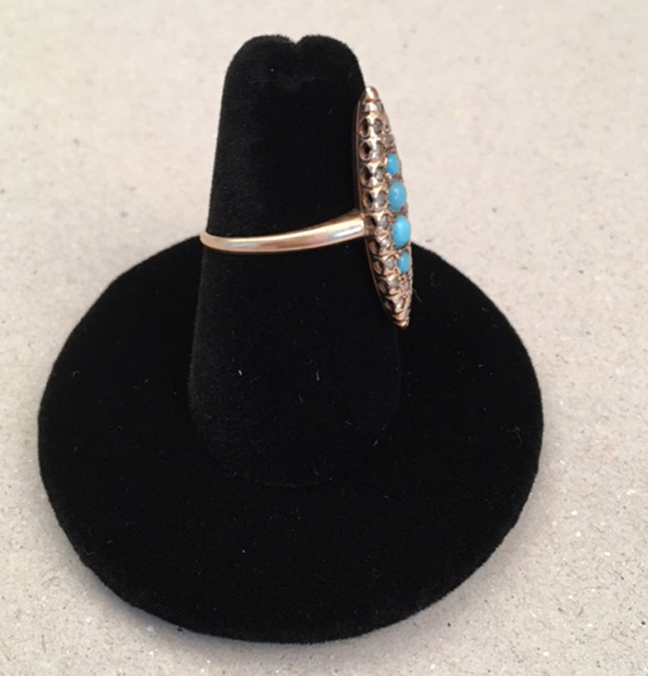 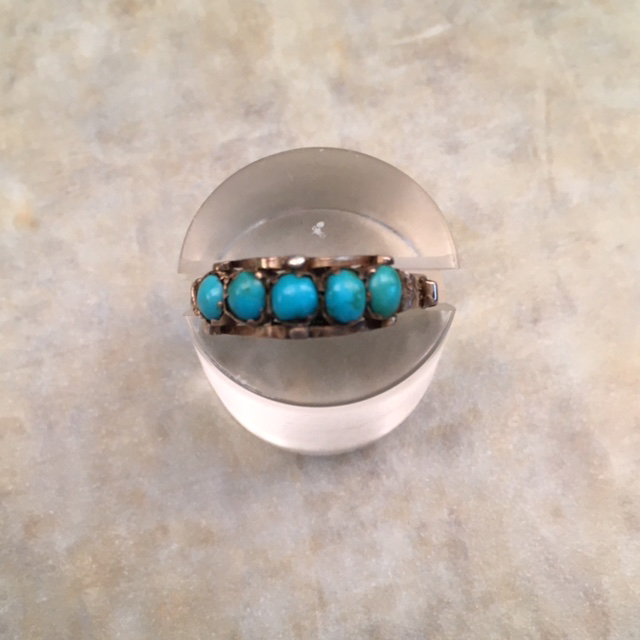 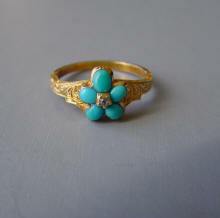 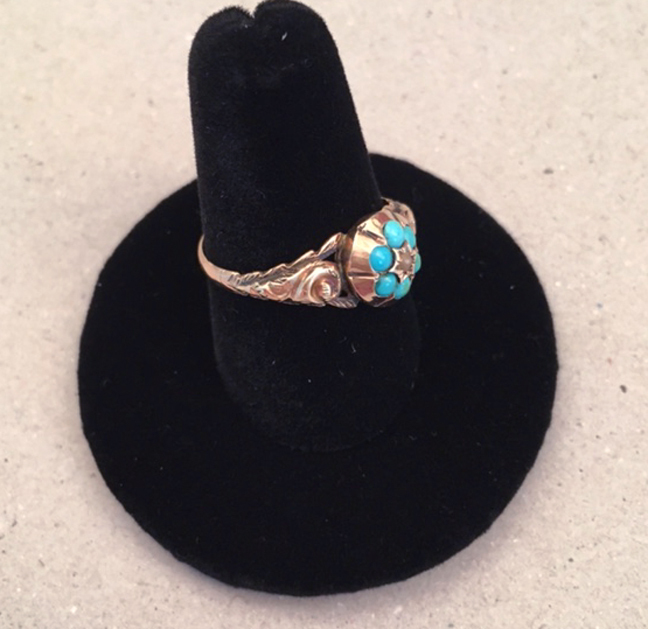 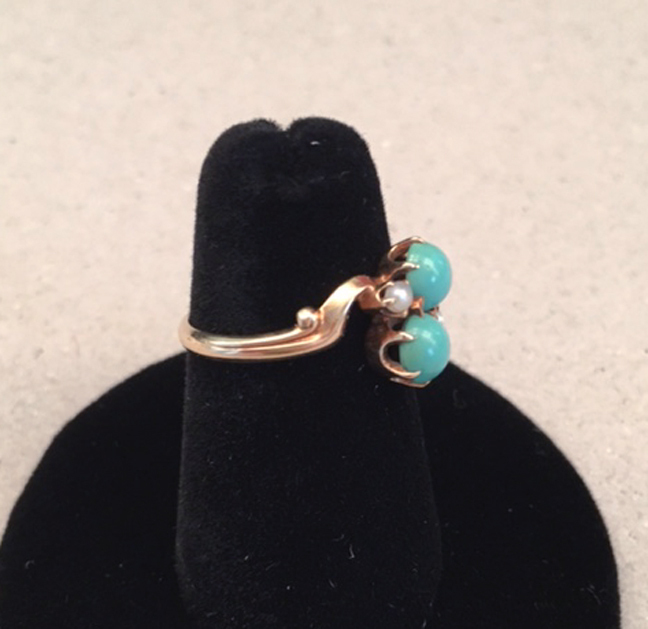 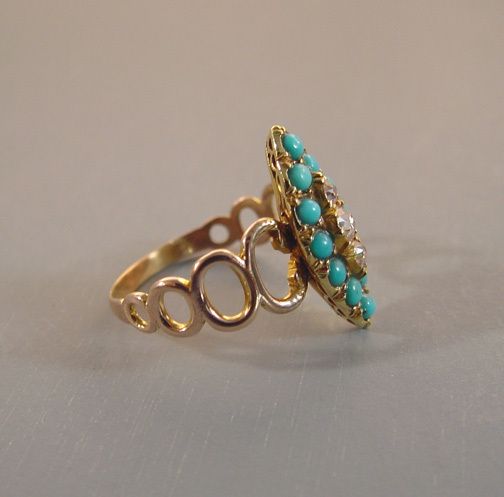 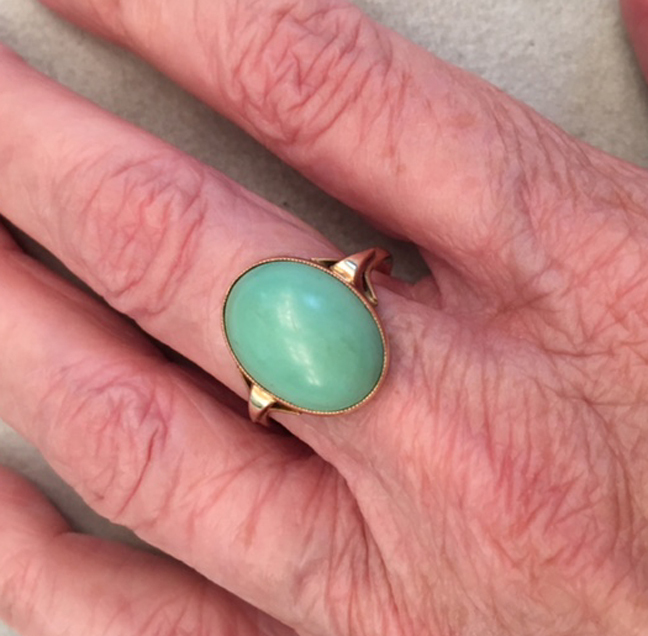 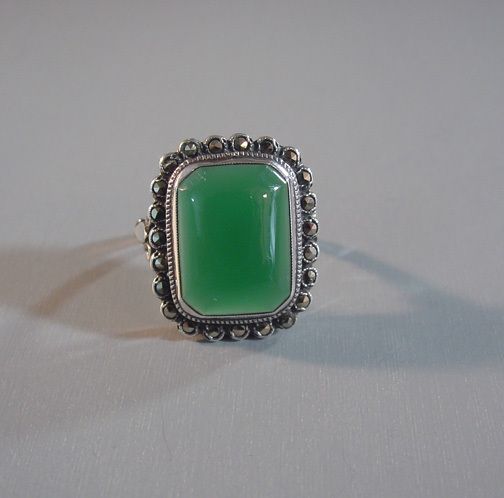 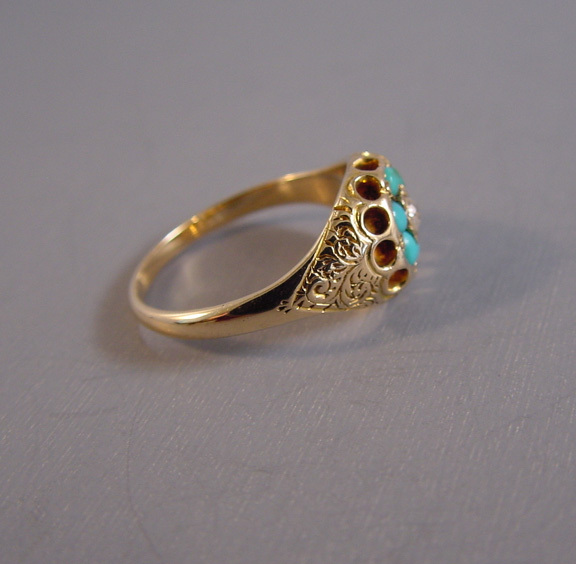 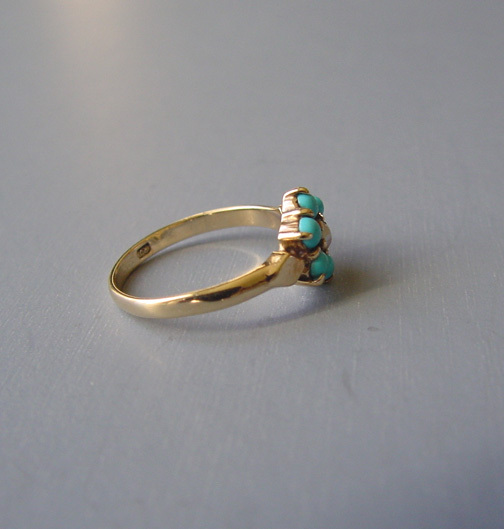 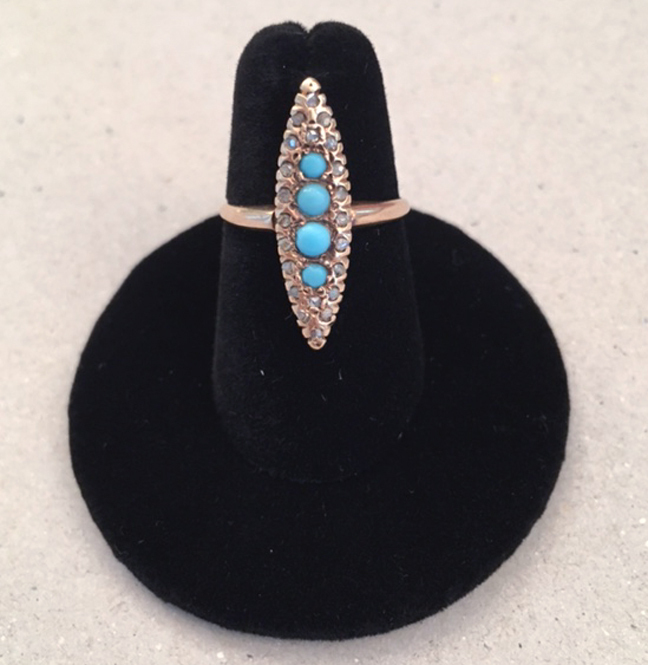 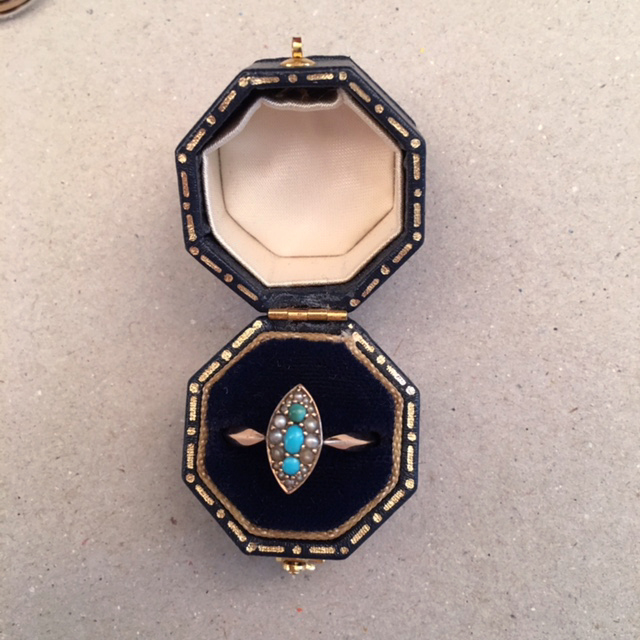 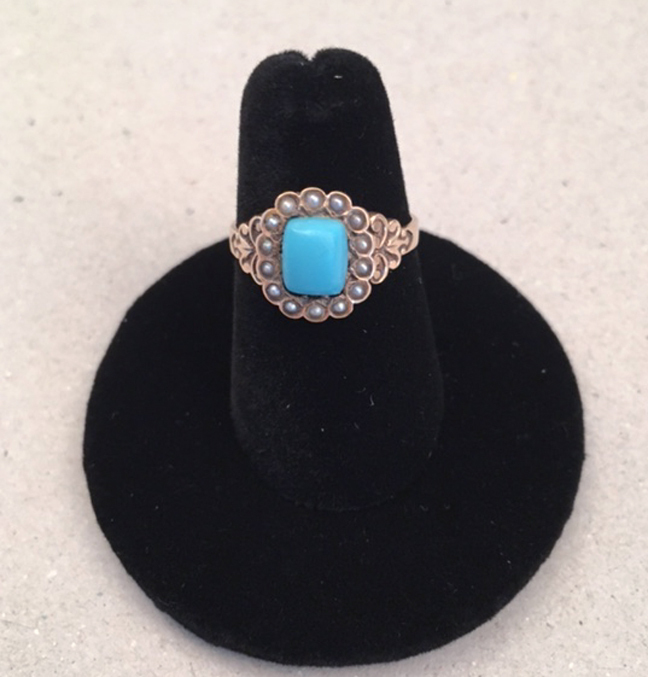 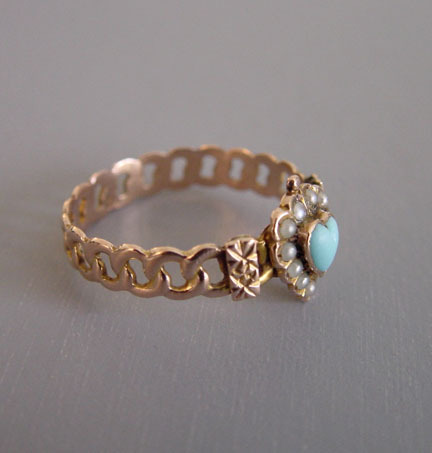 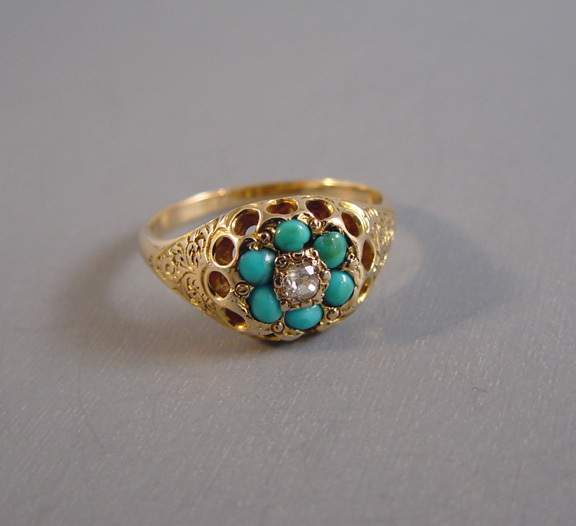 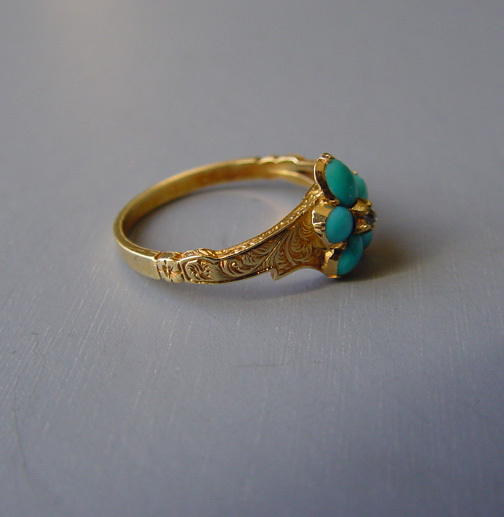 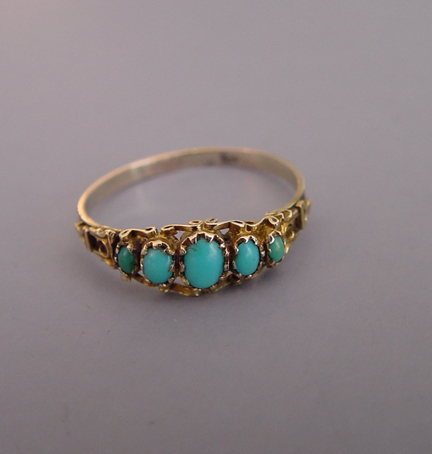 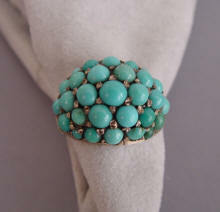 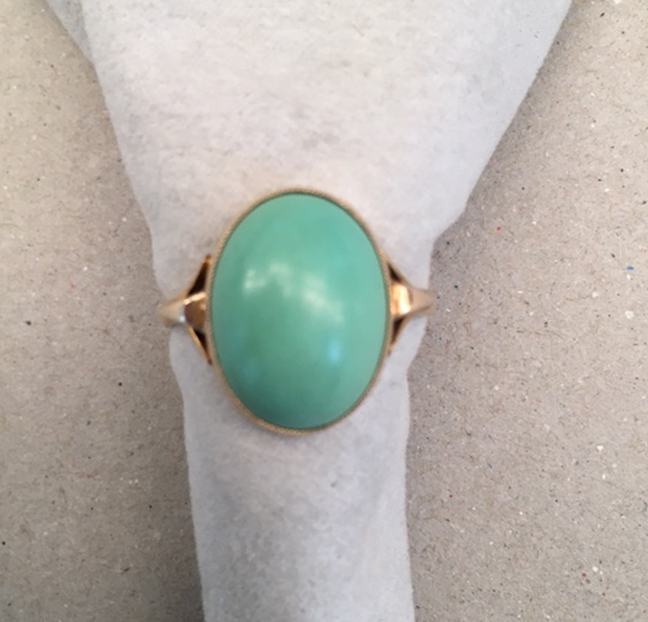 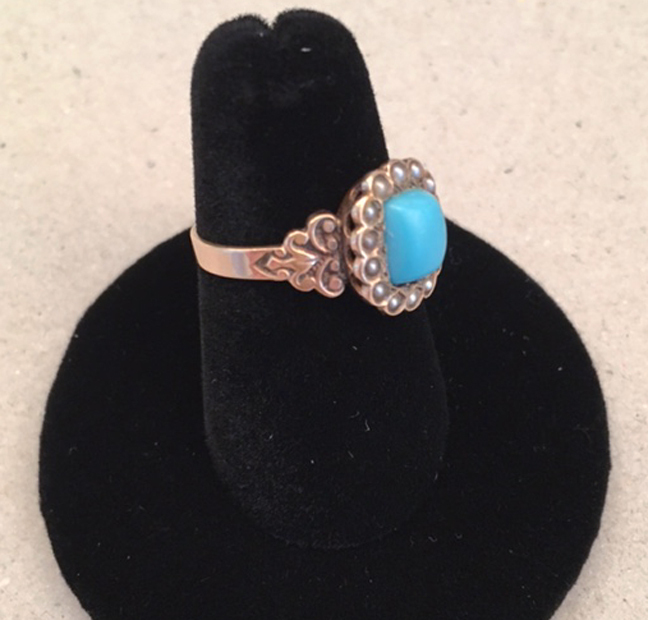 If you are looking for some Persian turquoise jewelry to purchase, please CLICK HERE. 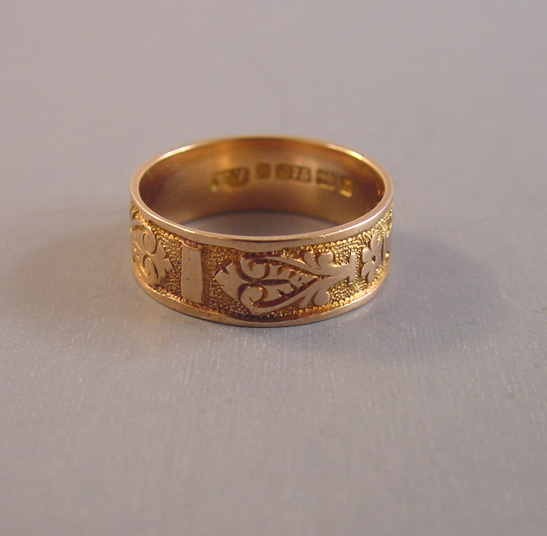 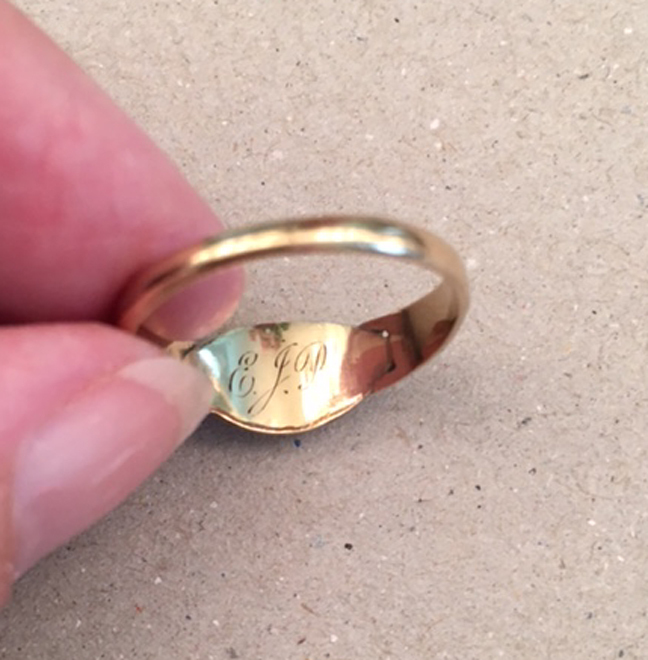 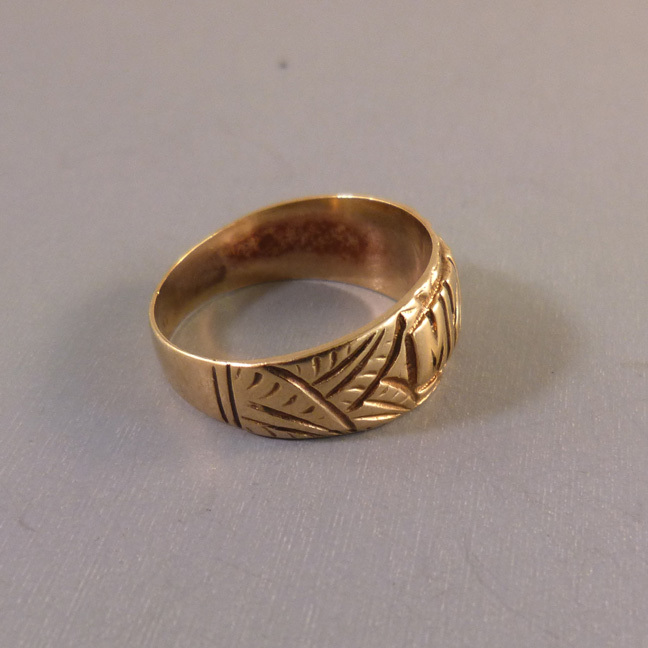 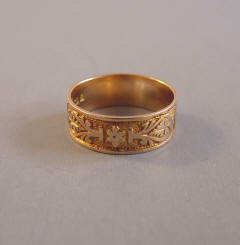 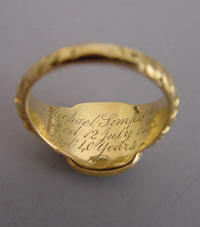 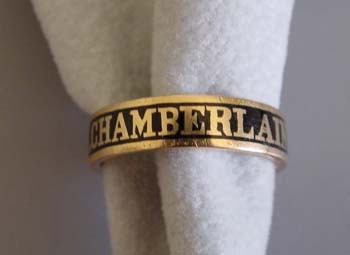 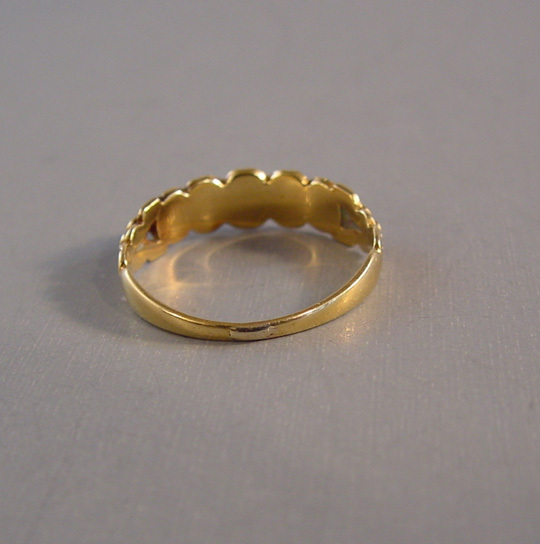 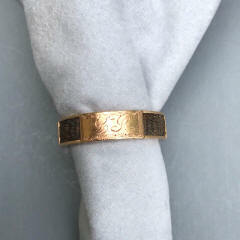 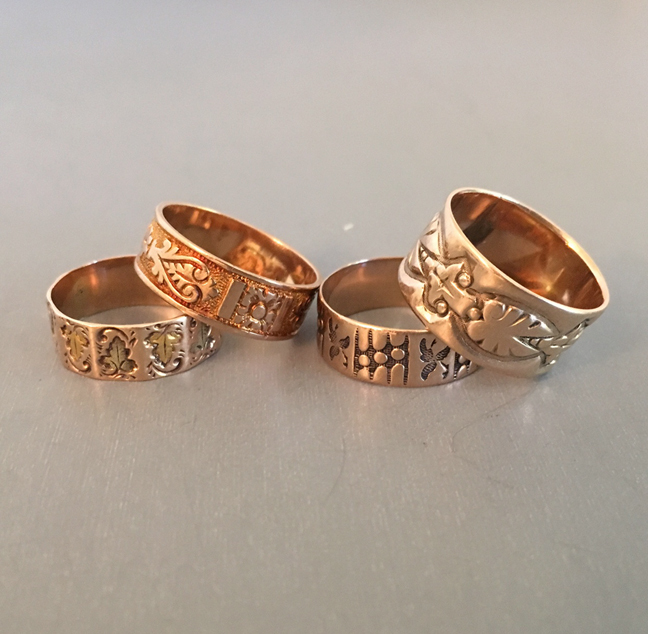 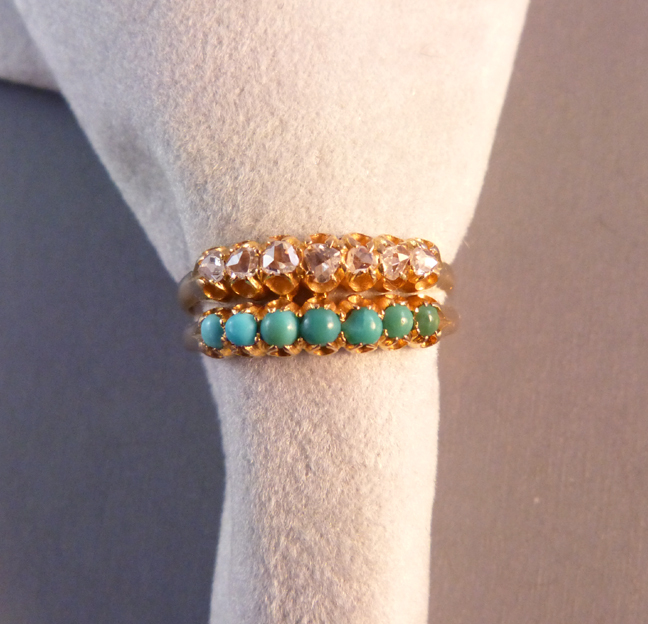 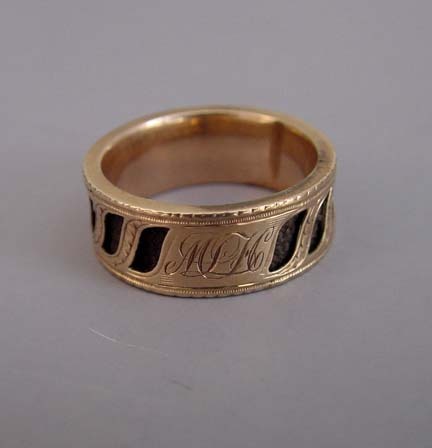 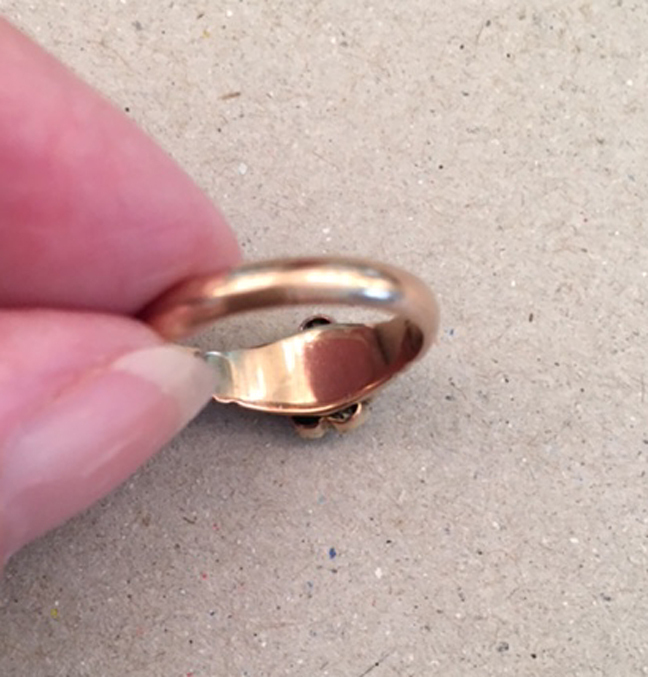 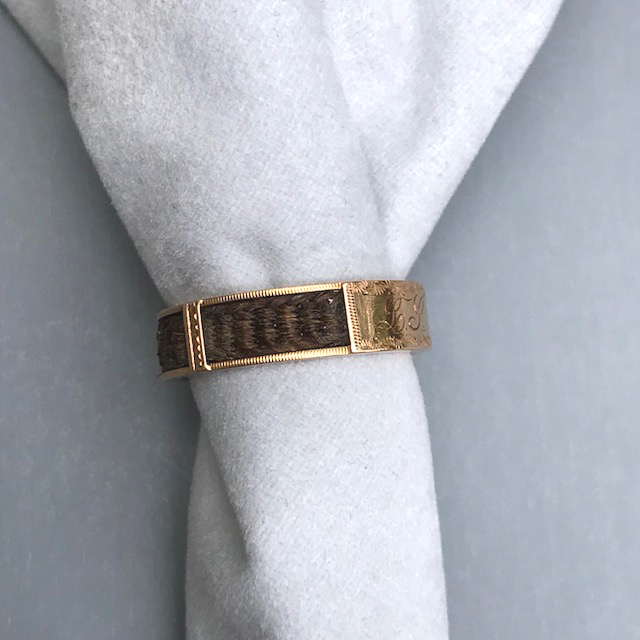 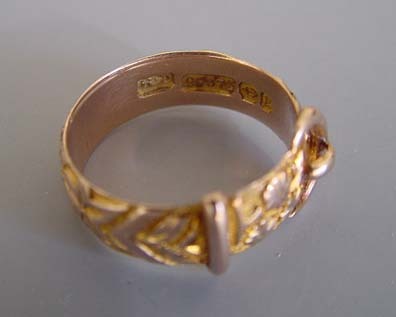 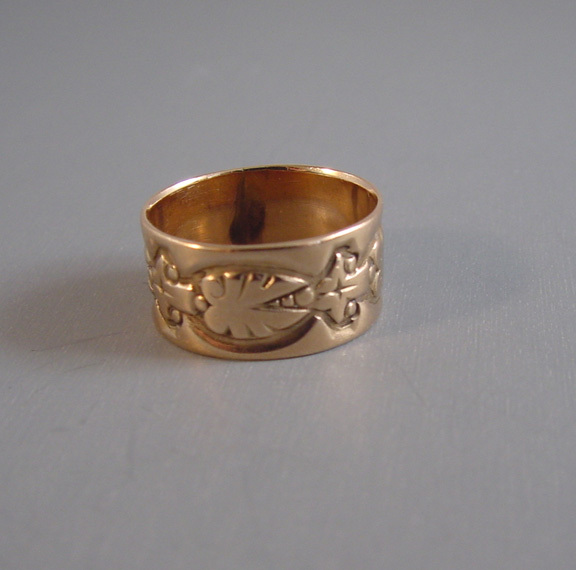 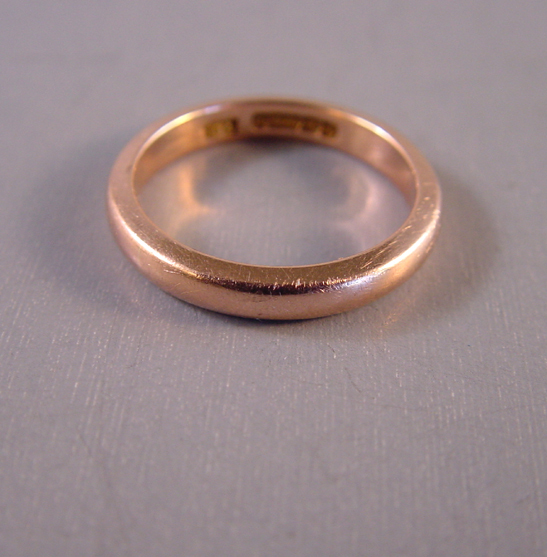 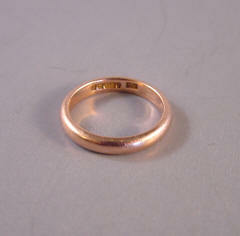 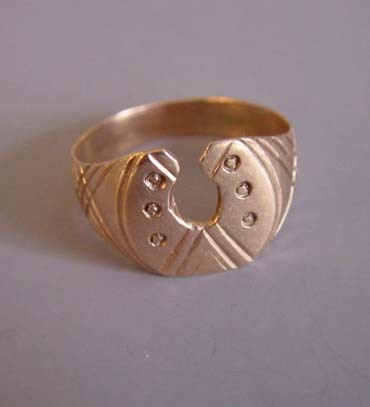 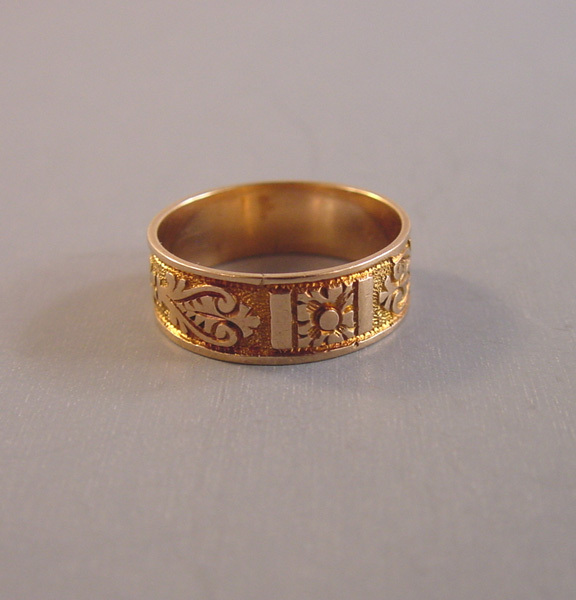 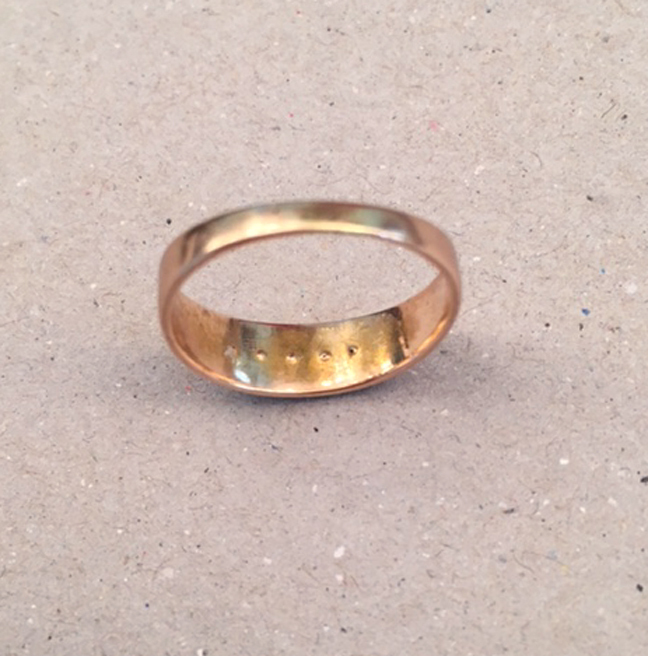 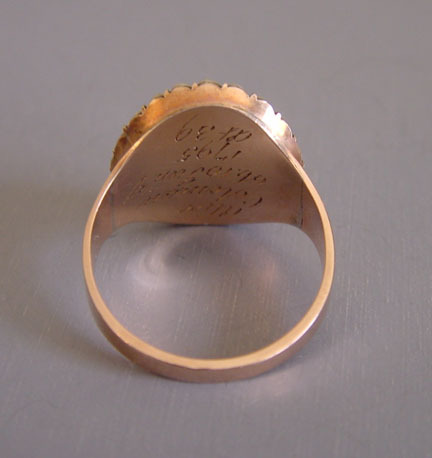 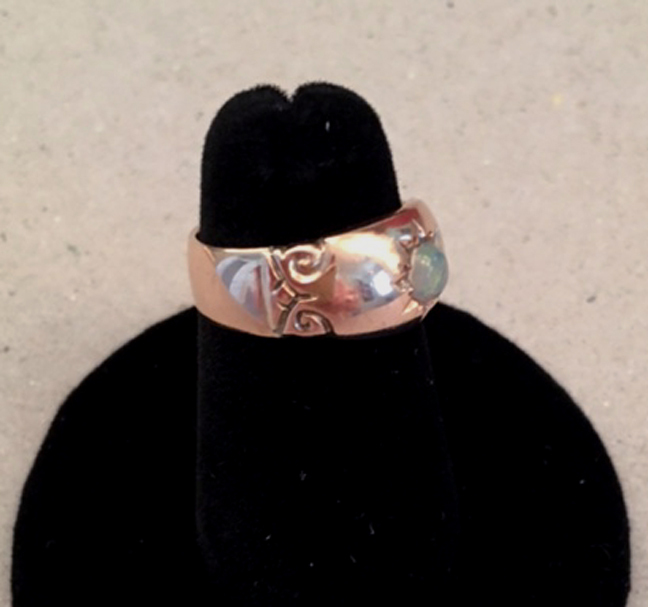 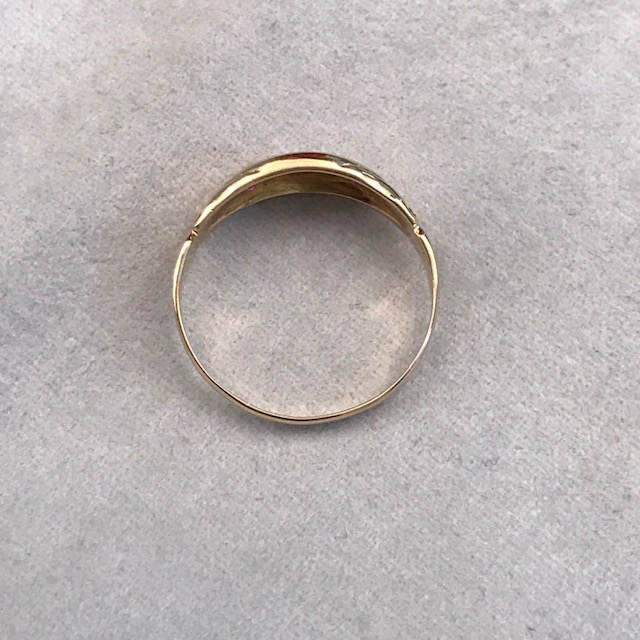 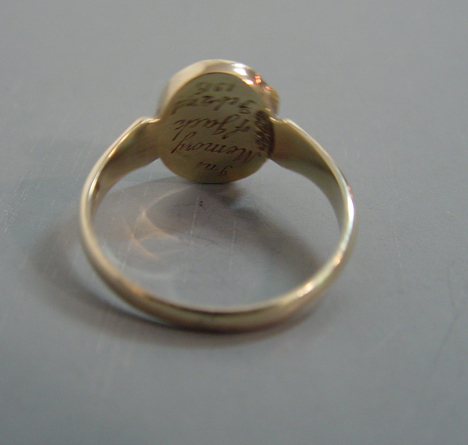 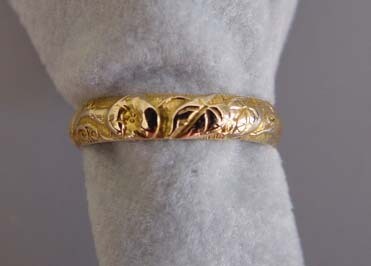 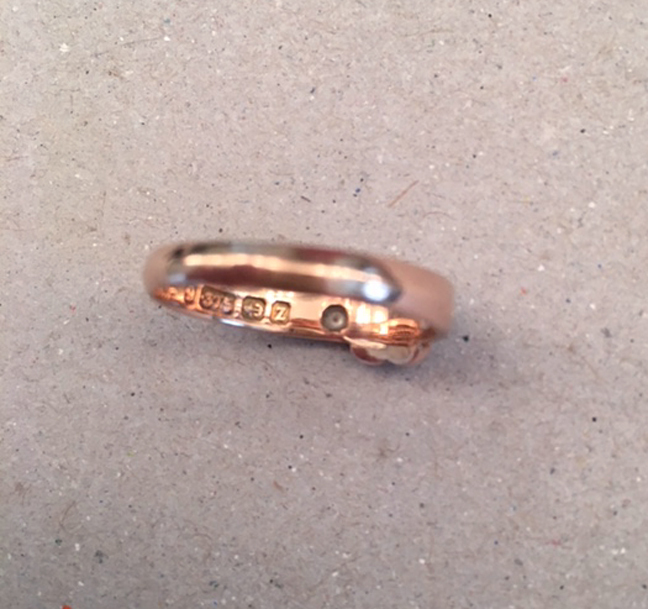 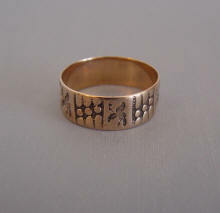 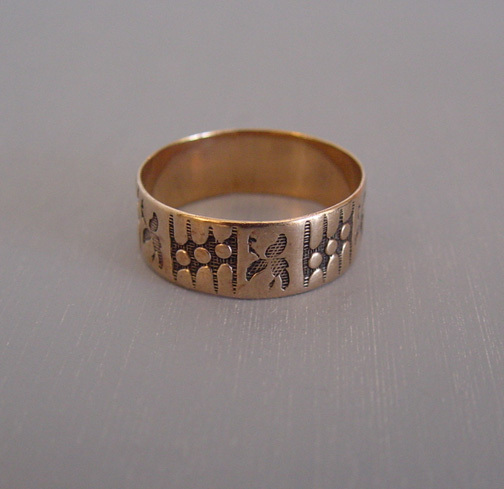 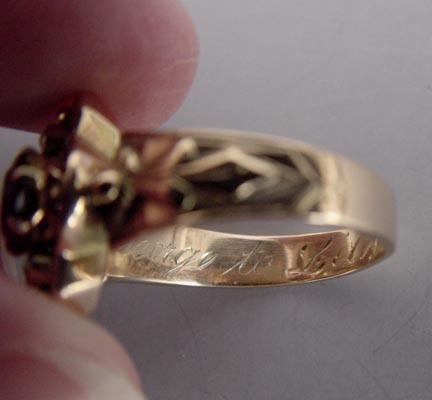 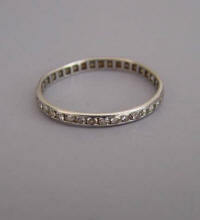 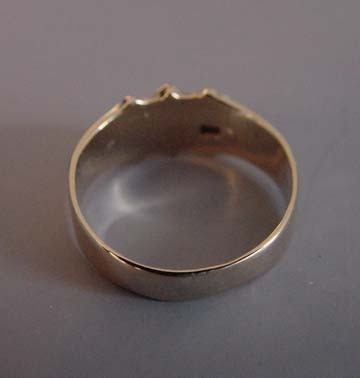 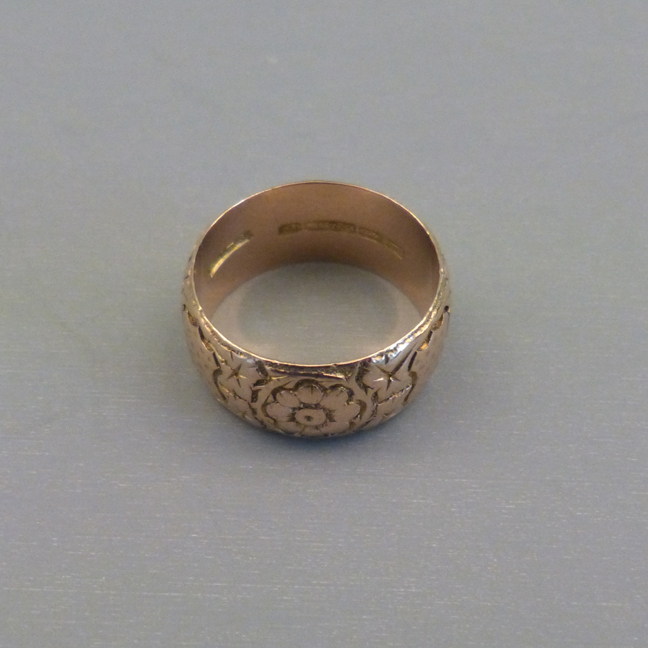 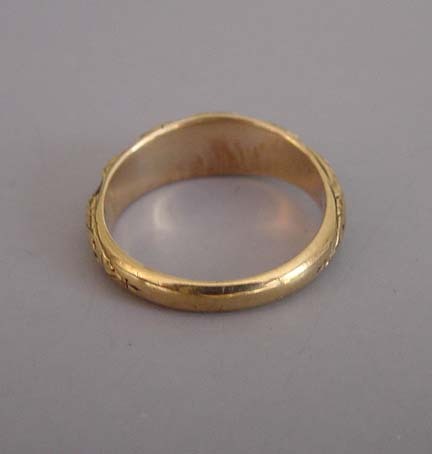 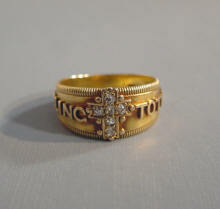 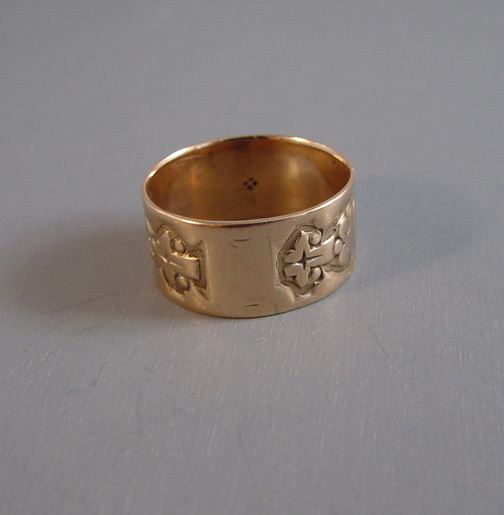 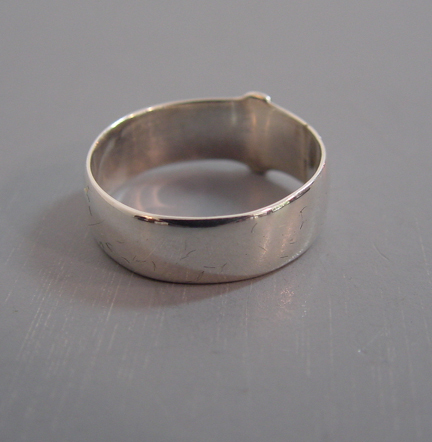 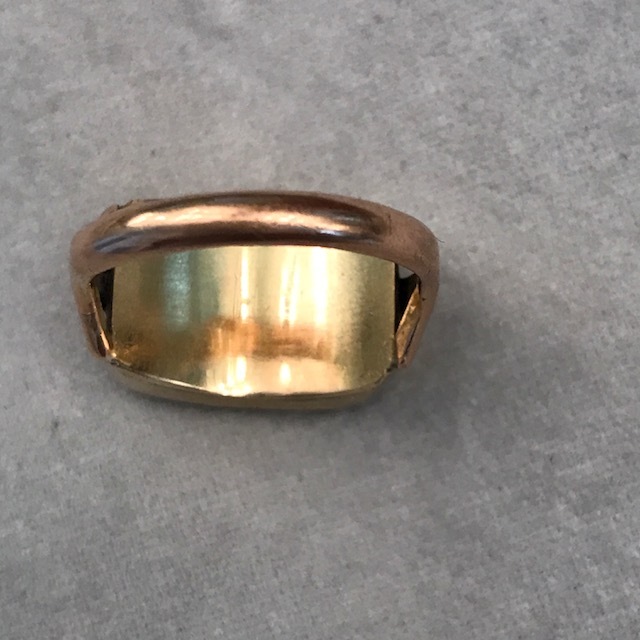 FINE solid gold 10k plump engraved band rings. 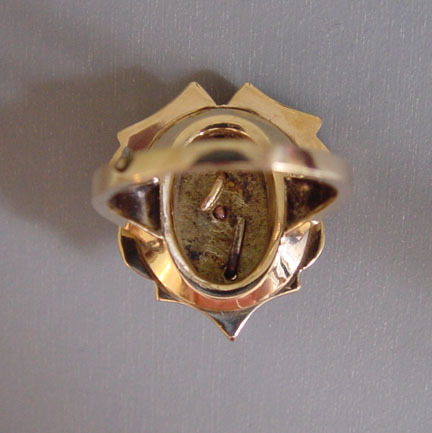 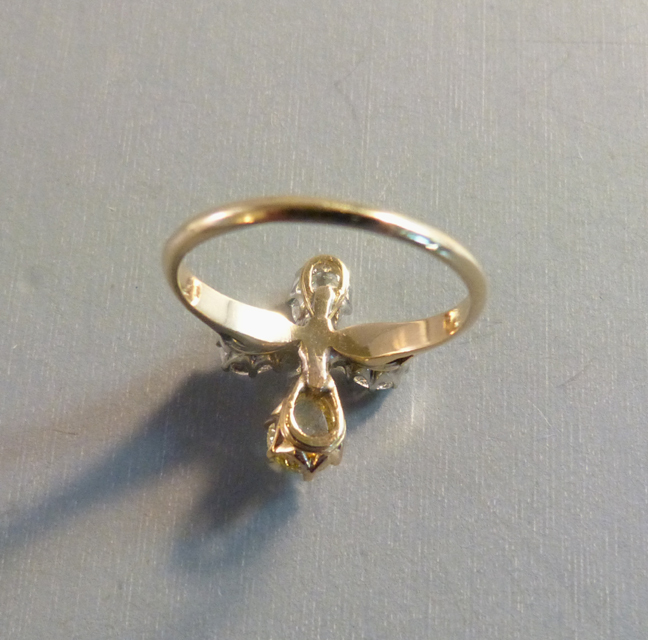 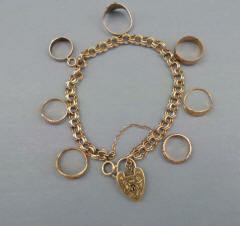 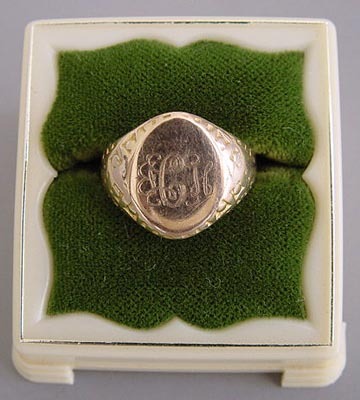 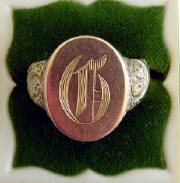 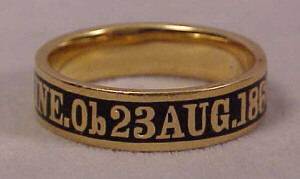 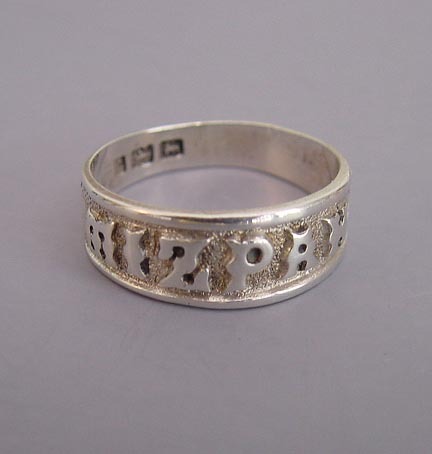 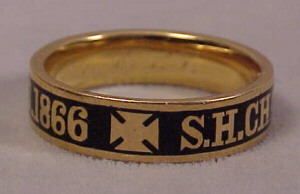 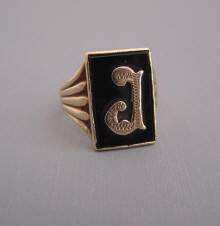 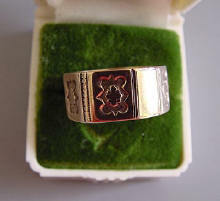 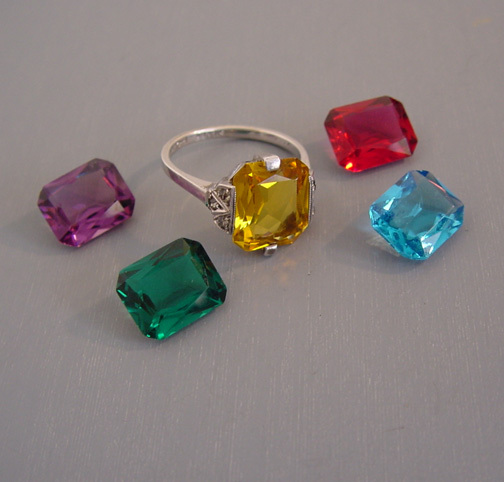 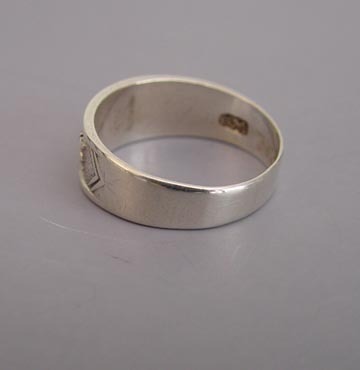 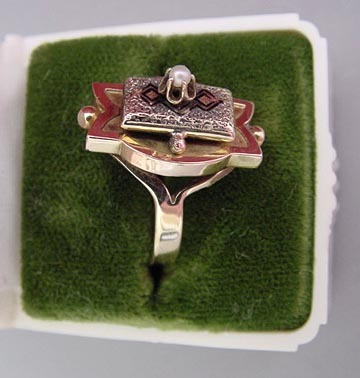 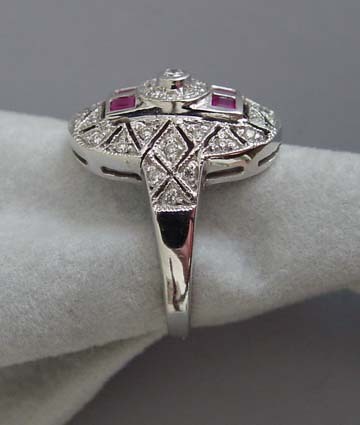 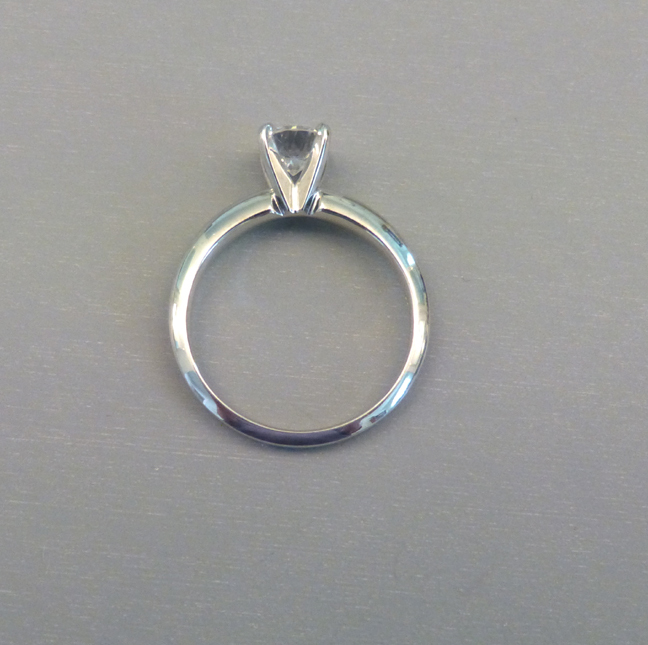 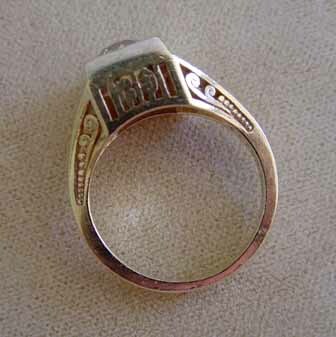 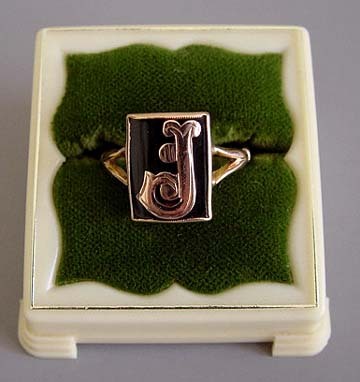 All rings with the letter "A" prefixed to number are 8K fine. 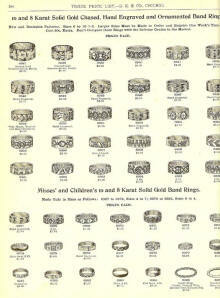 Girls rings, boys rings, baby rings. 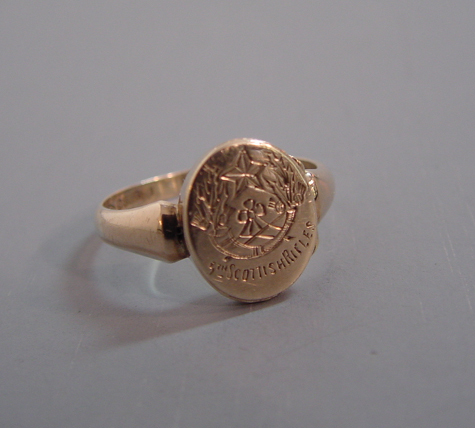 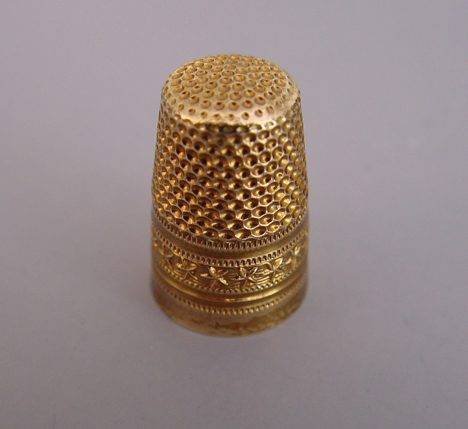 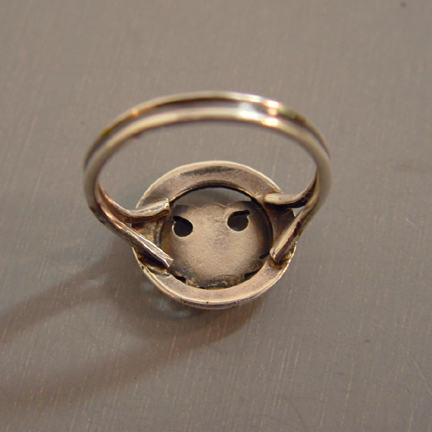 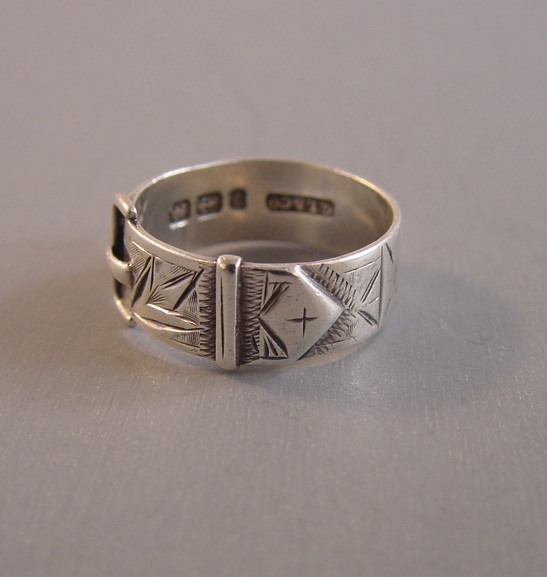 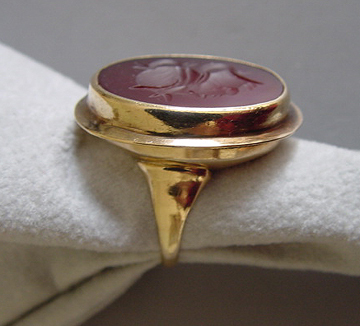 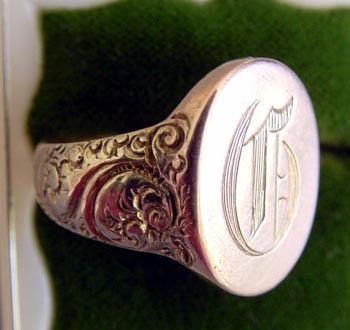 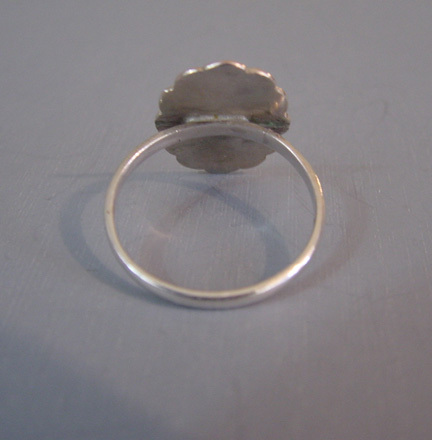 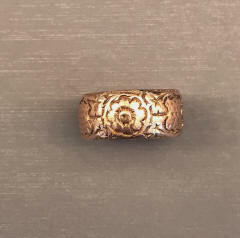 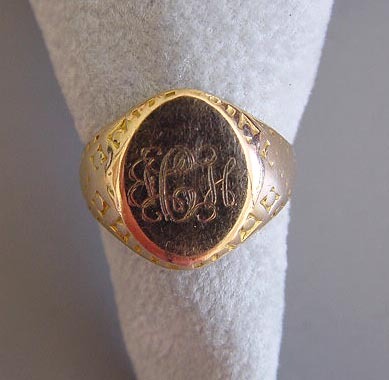 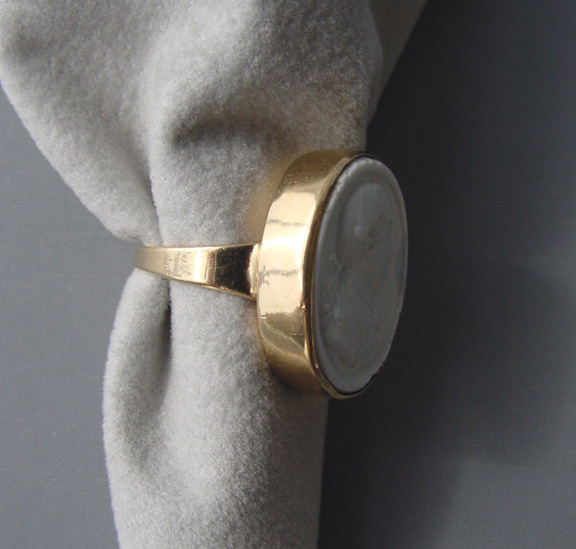 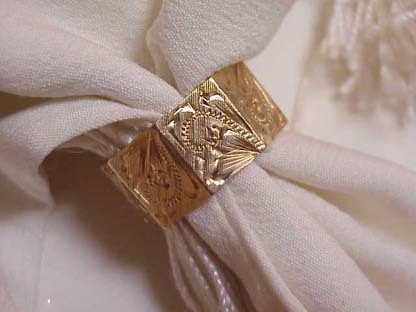 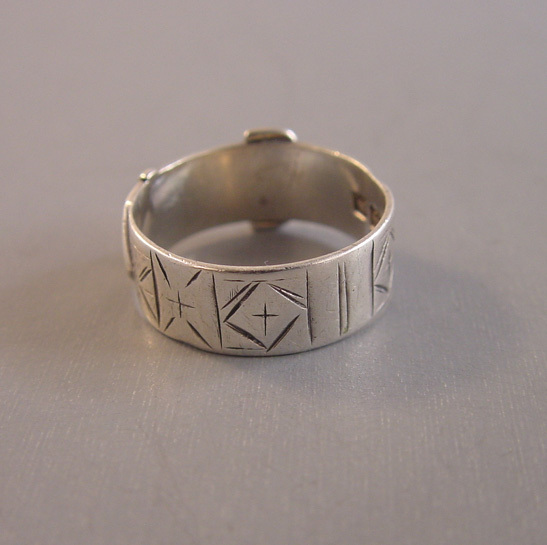 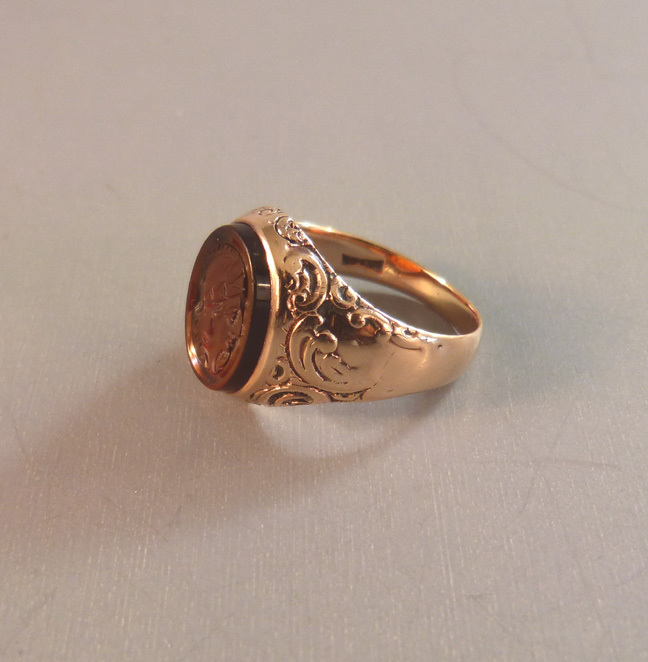 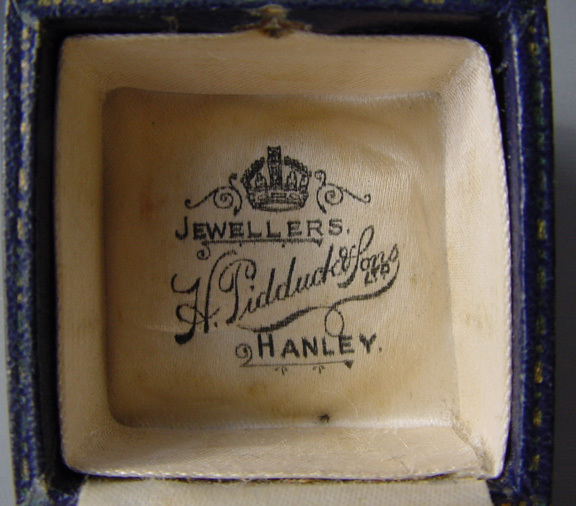 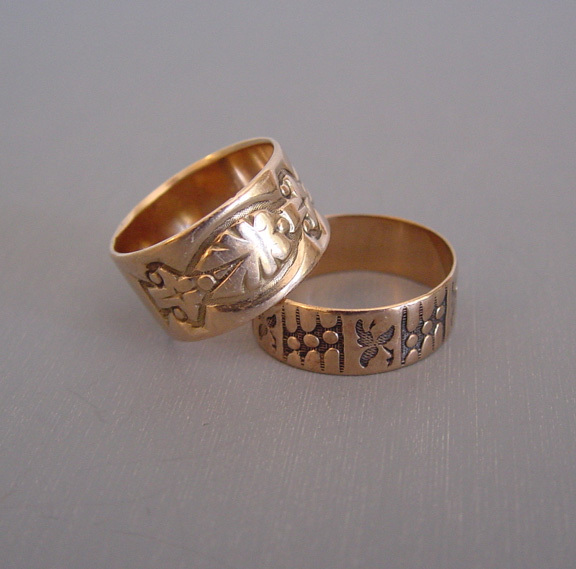 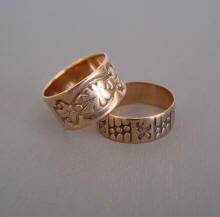 Signet rings, highly carved and plain designs. 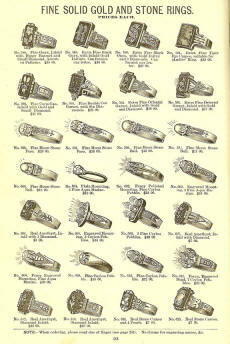 Priced in the catalogue from $ .75 to $16.00 each. 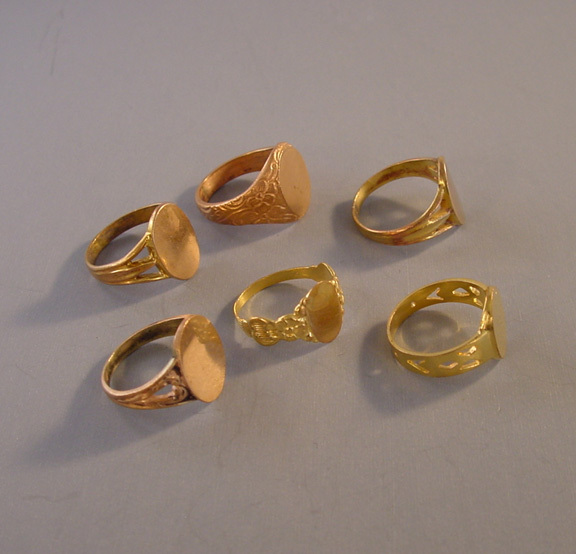 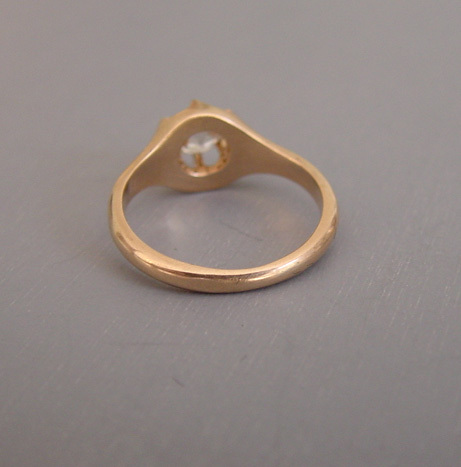 10k "Solid gold" finger rings. 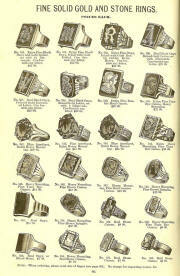 Priced in the catalogue from $1.50 to $25.00 each. 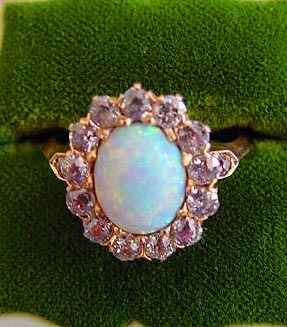 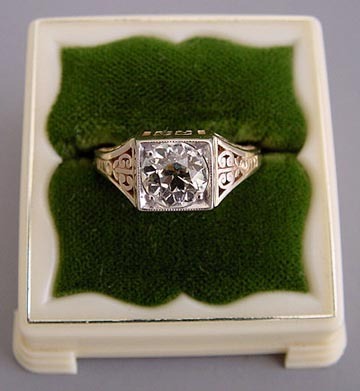 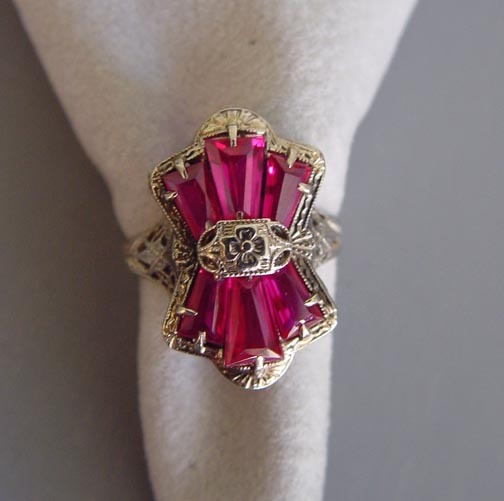 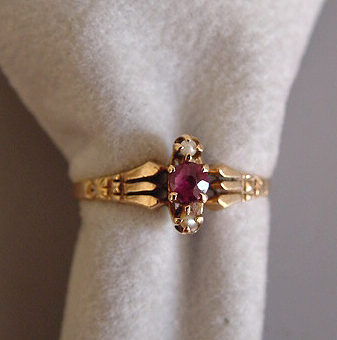 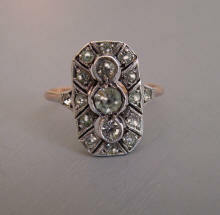 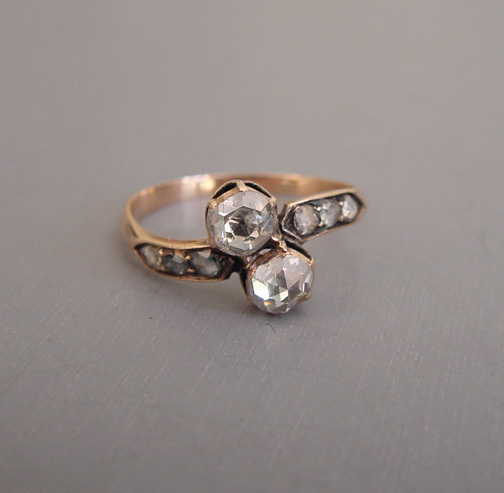 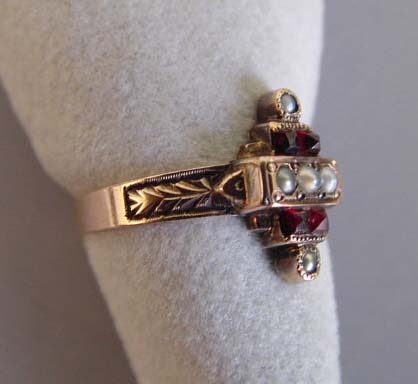 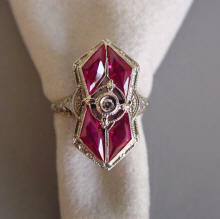 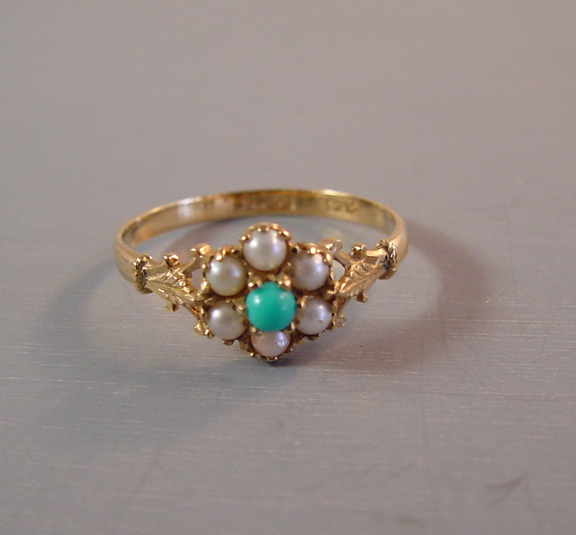 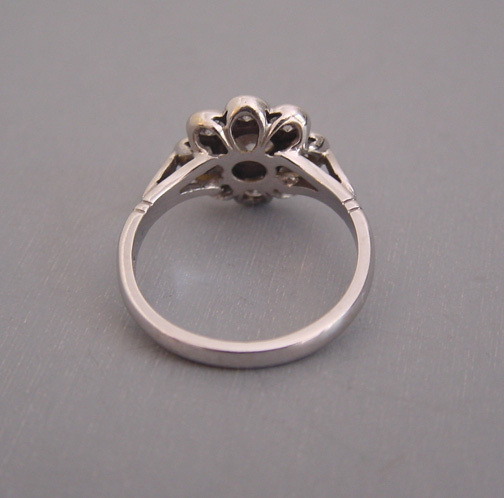 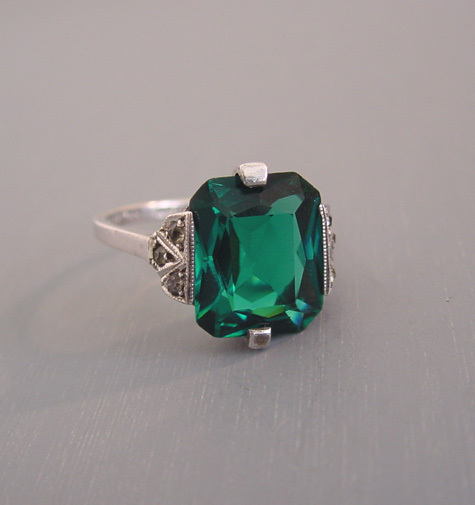 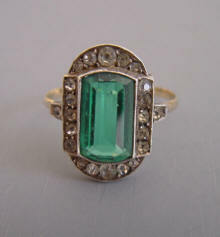 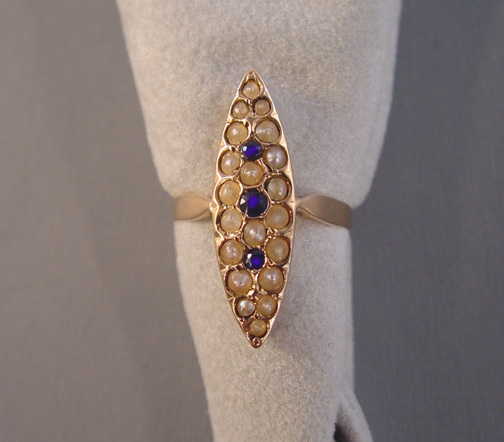 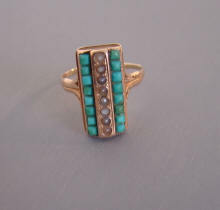 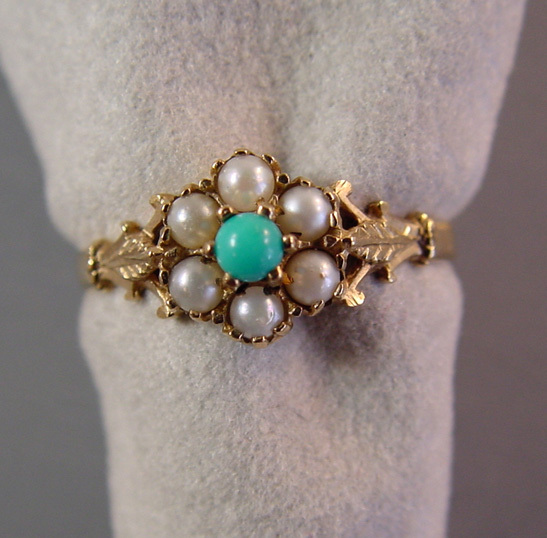 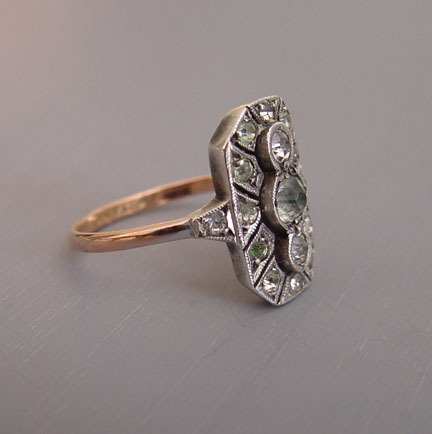 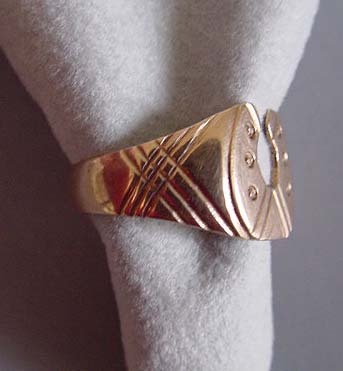 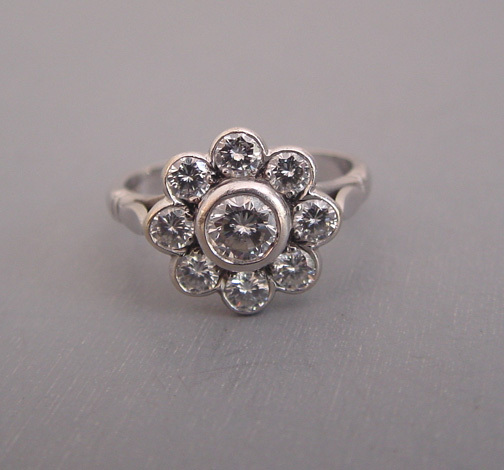 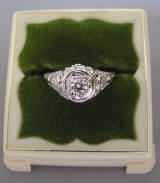 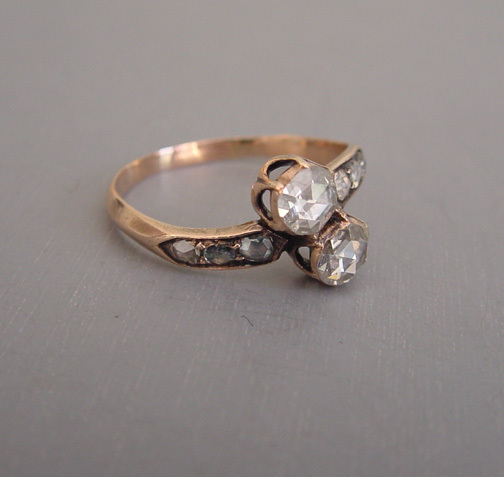 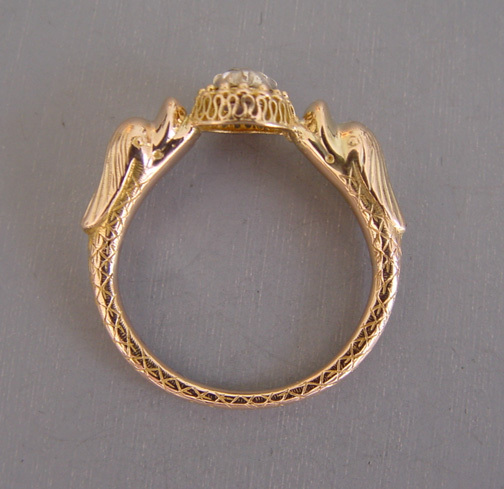 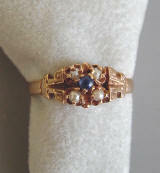 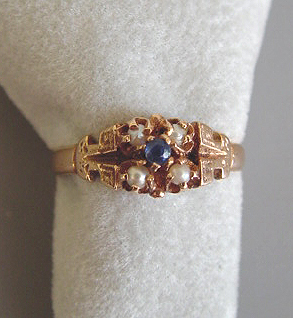 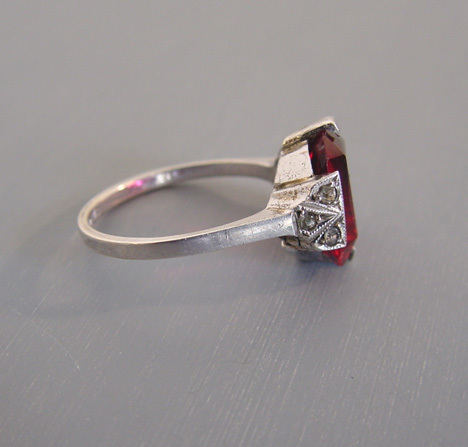 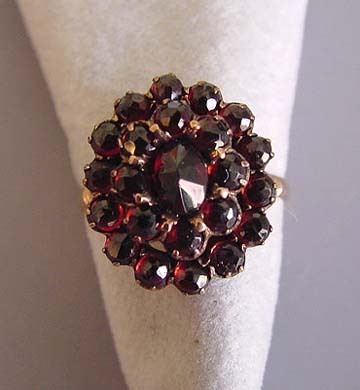 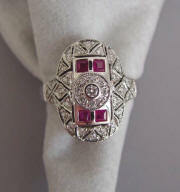 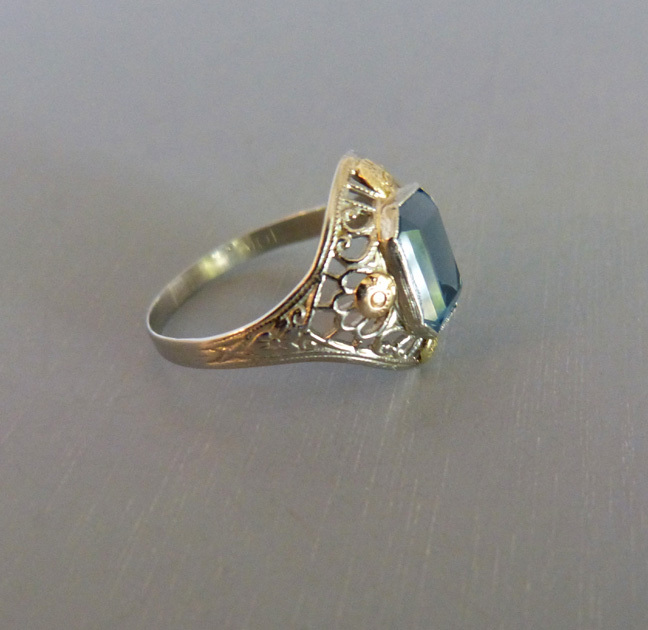 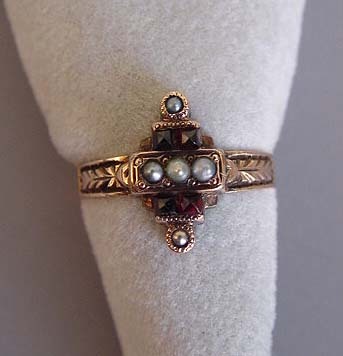 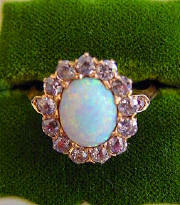 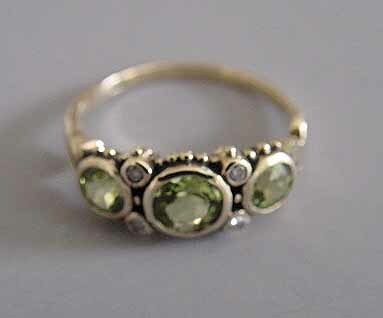 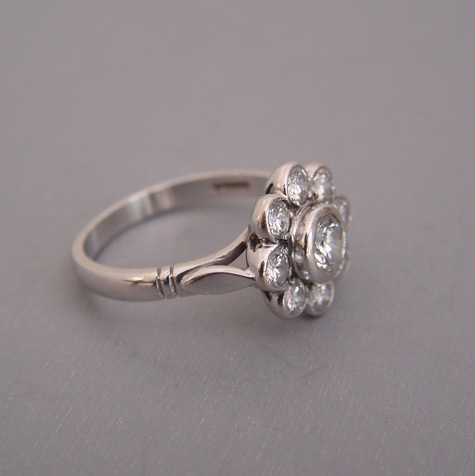 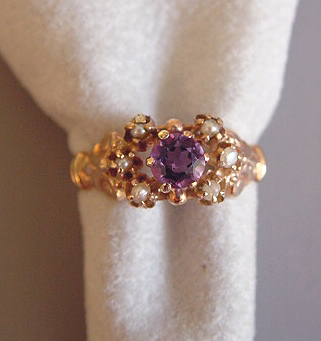 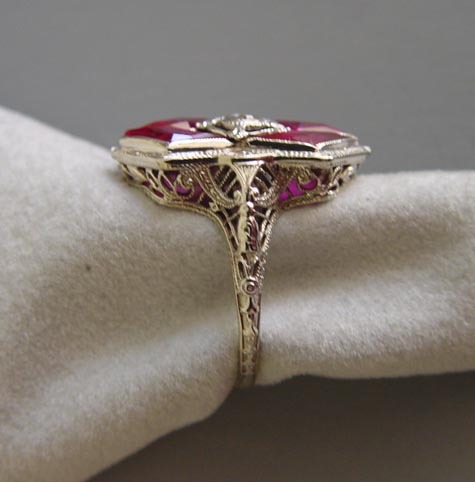 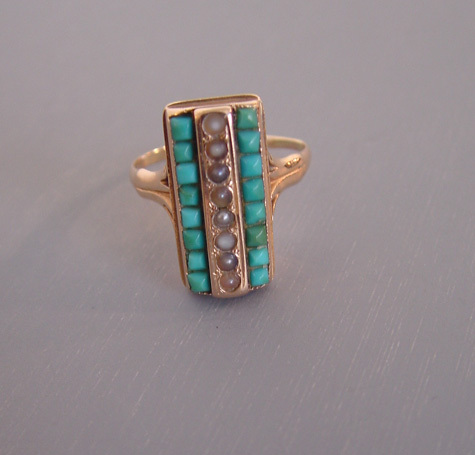 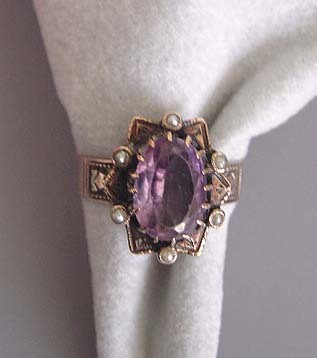 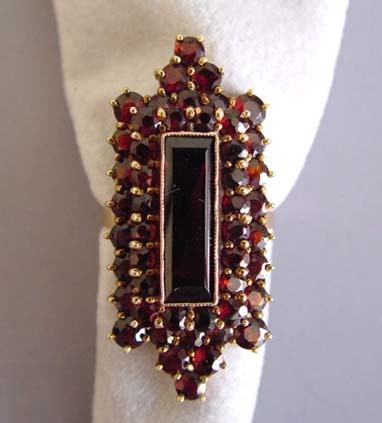 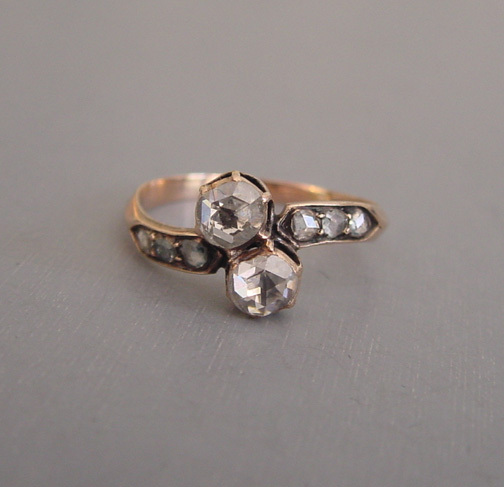 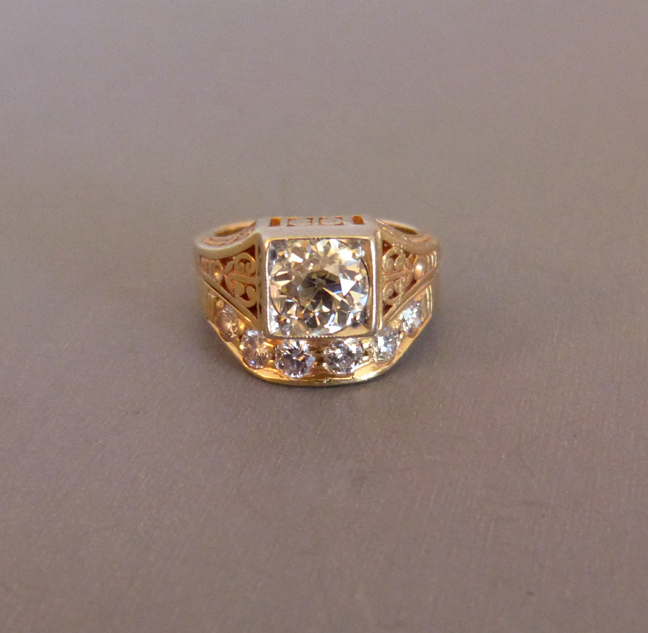 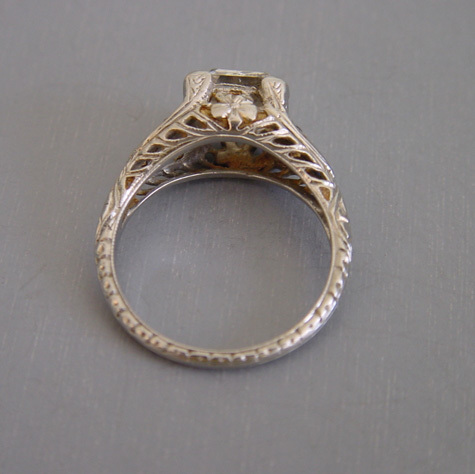 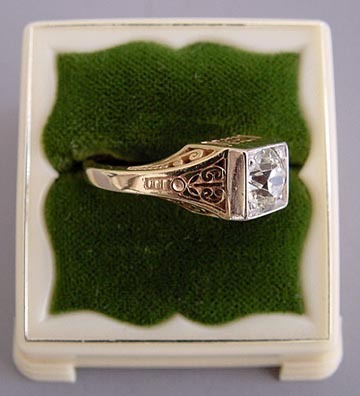 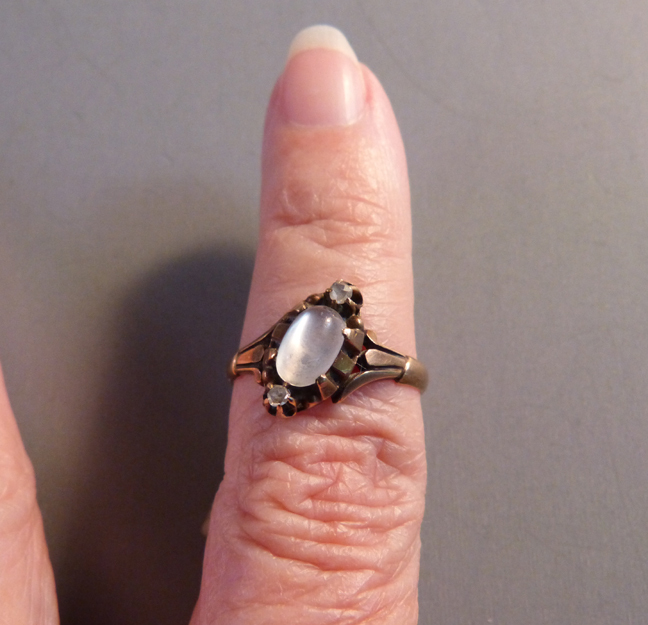 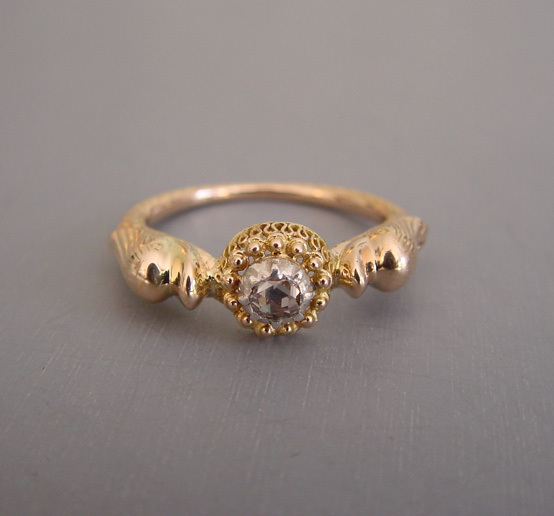 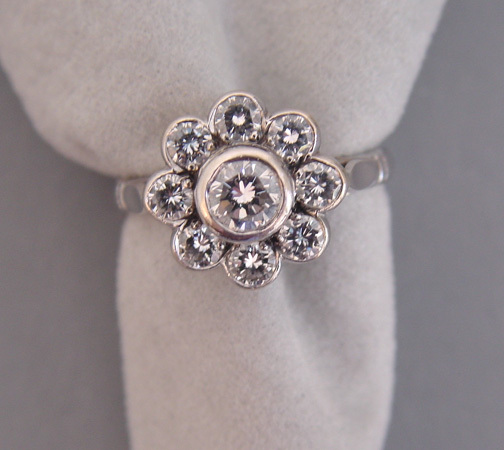 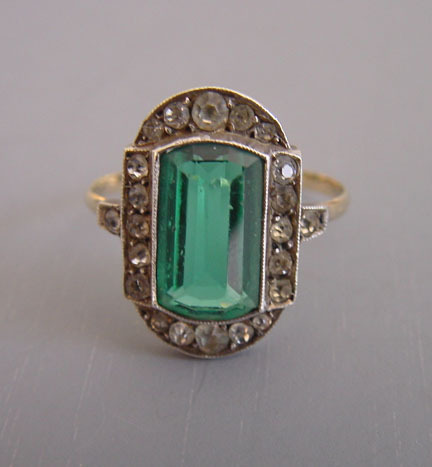 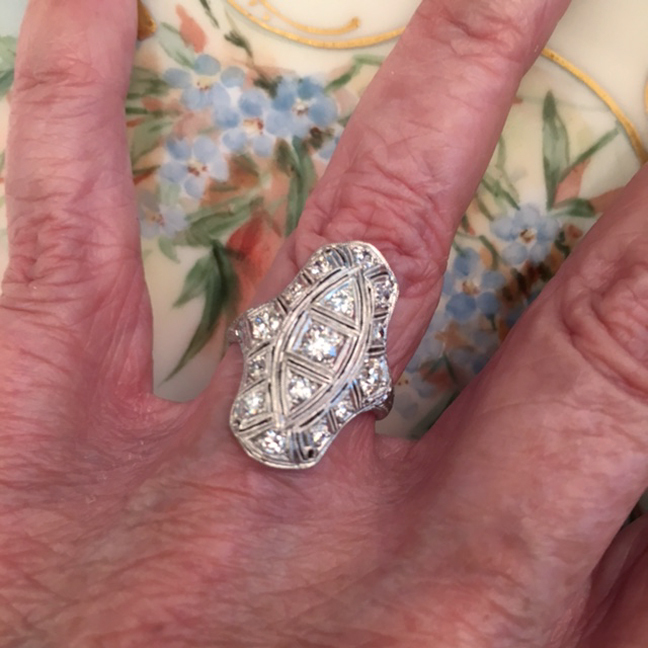 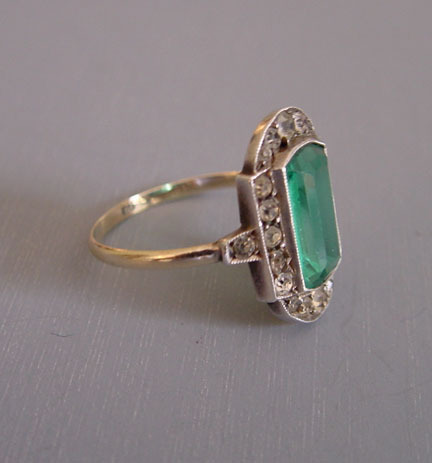 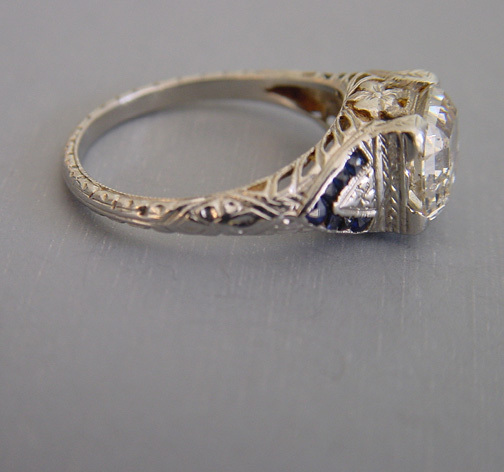 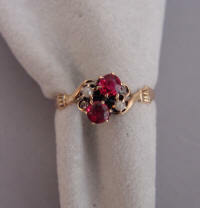 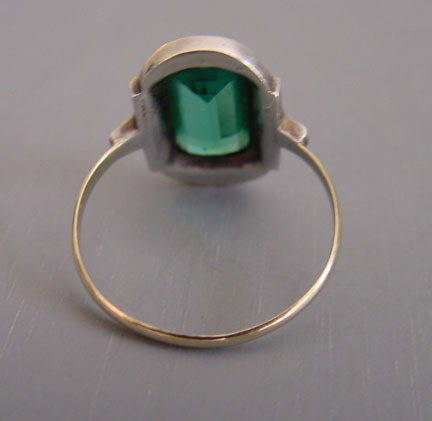 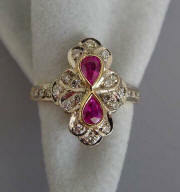 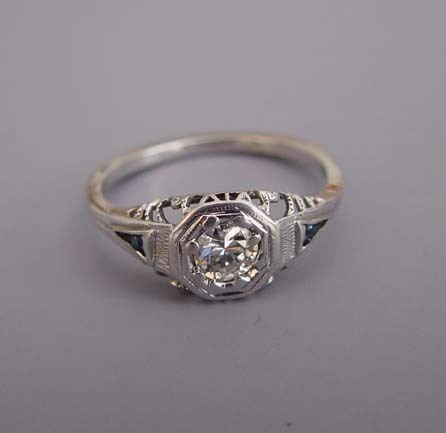 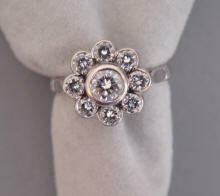 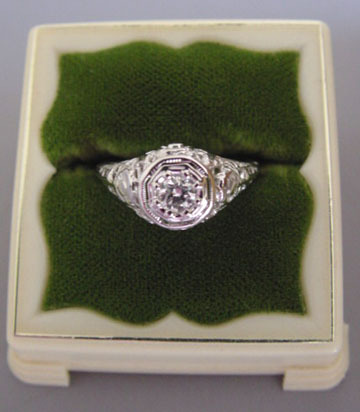 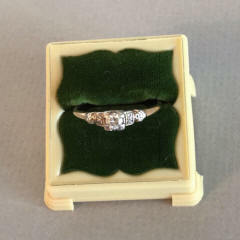 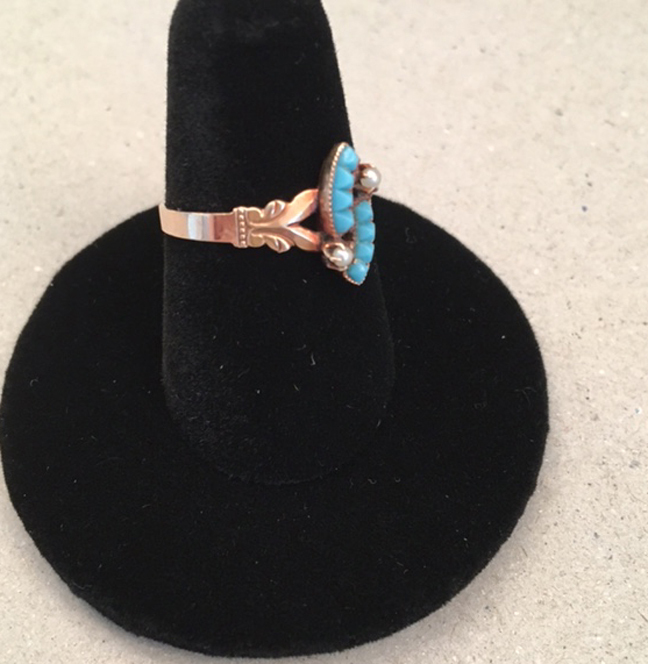 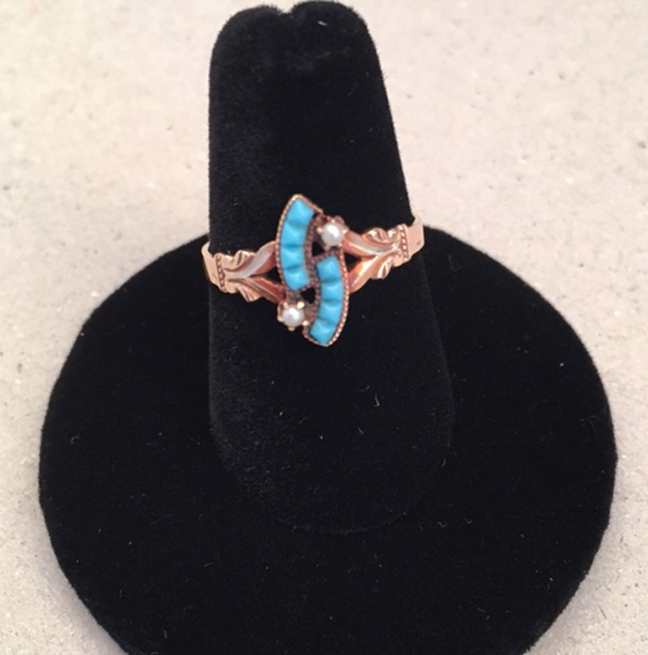 Turn-of-the-century to 1930s rings includes Edwardian through Deco styles. 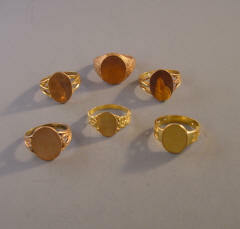 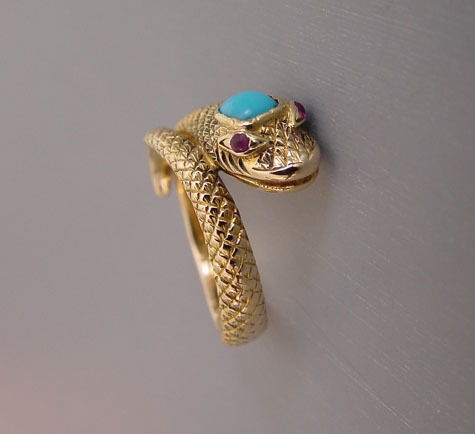 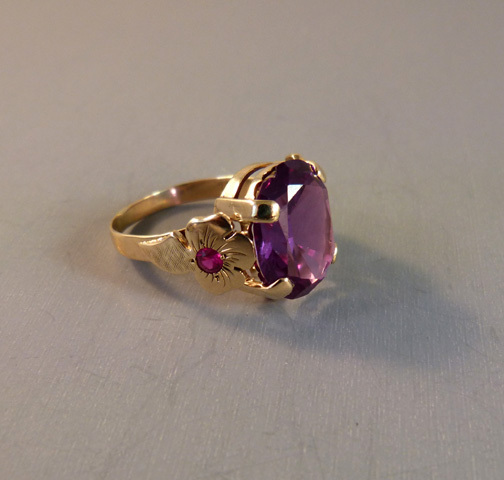 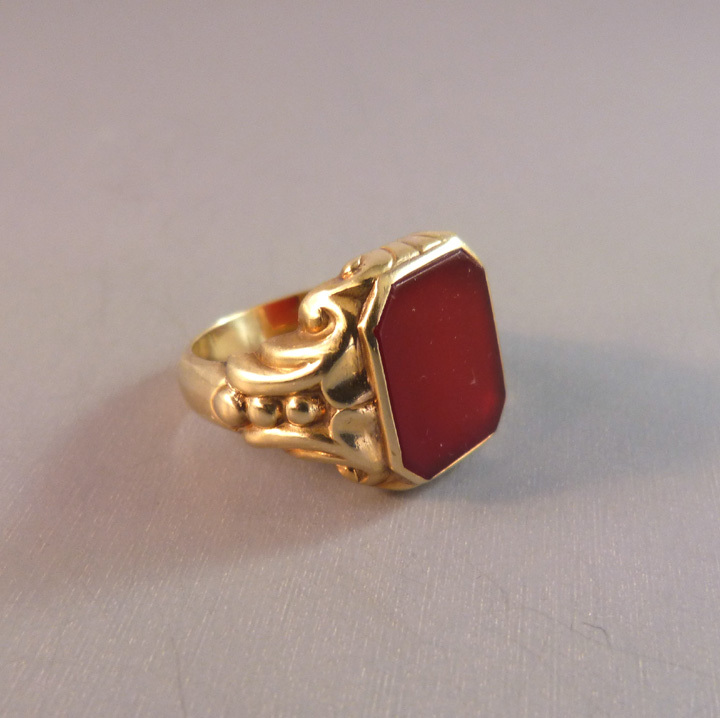 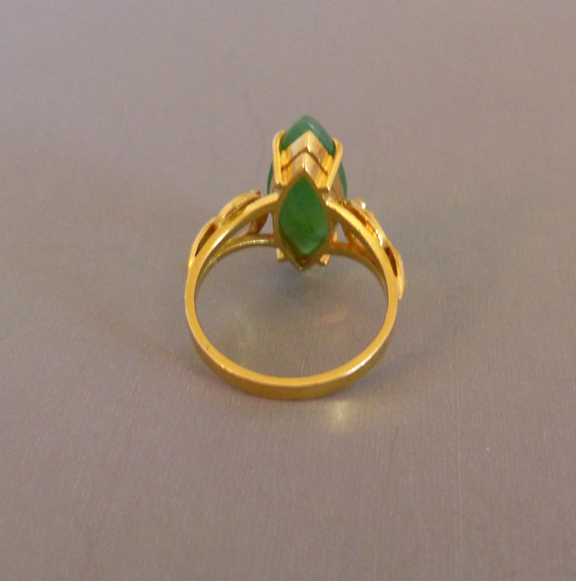 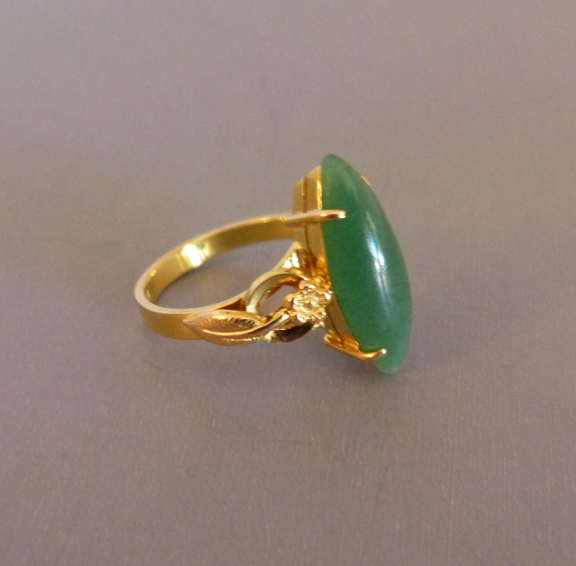 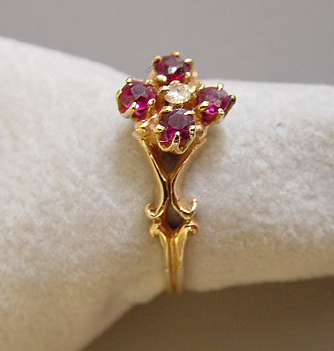 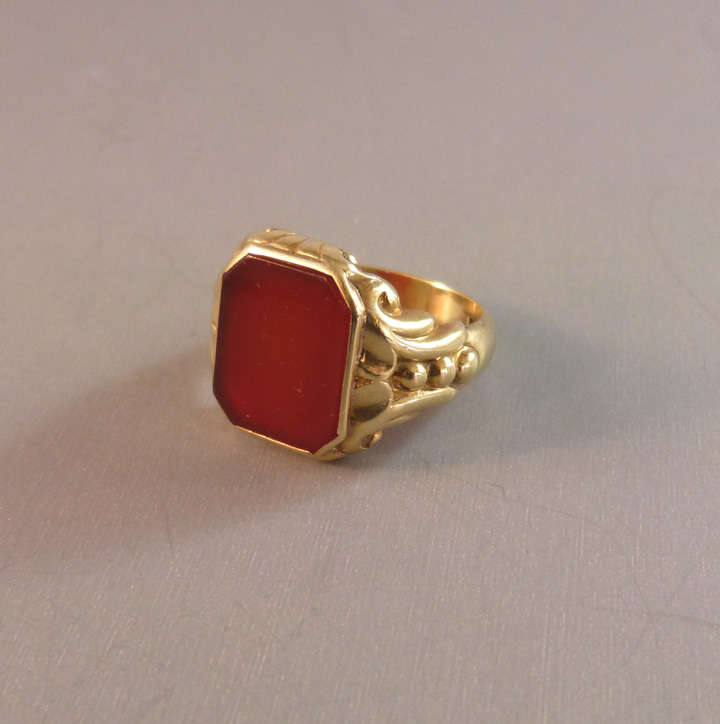 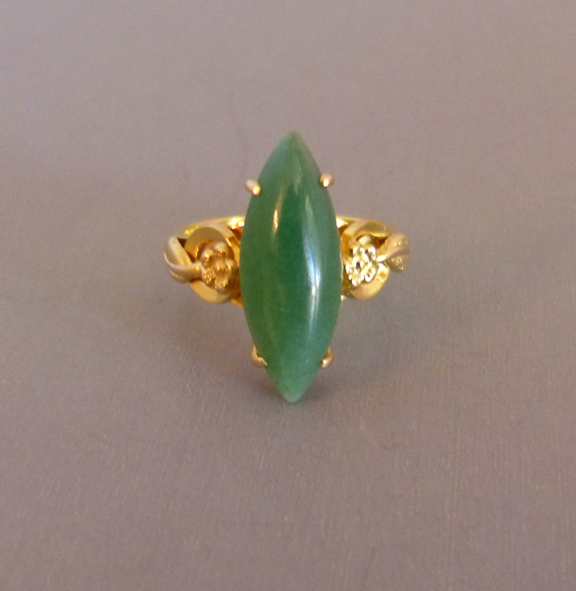 "Fine solid gold and stone rings." 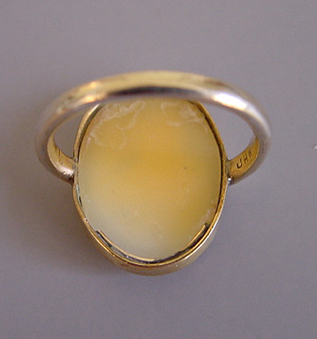 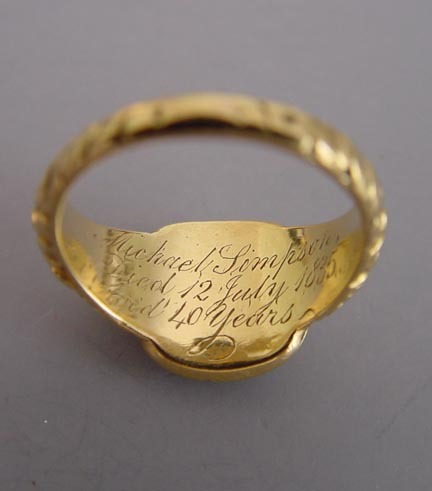 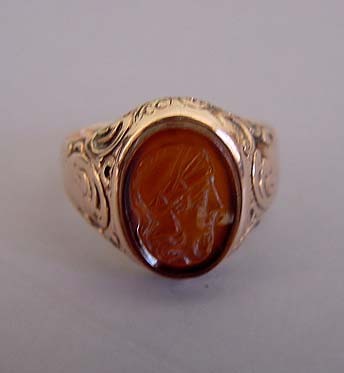 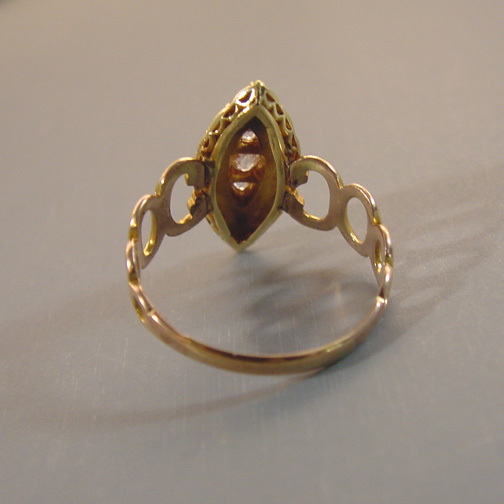 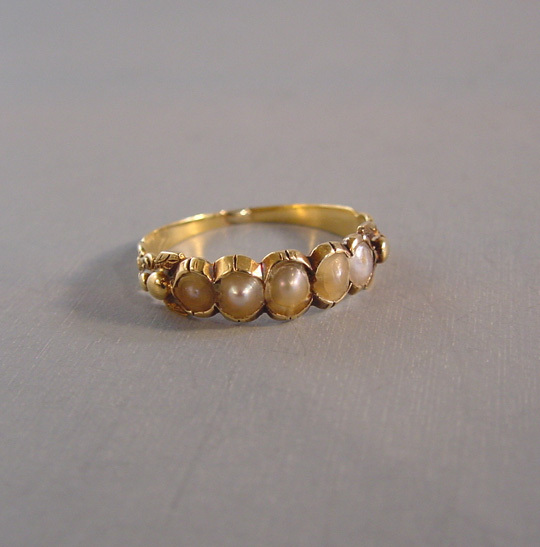 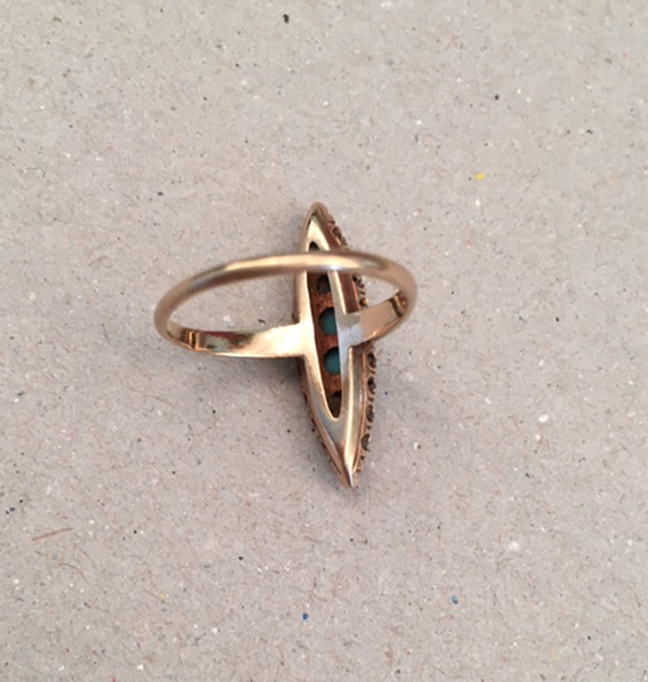 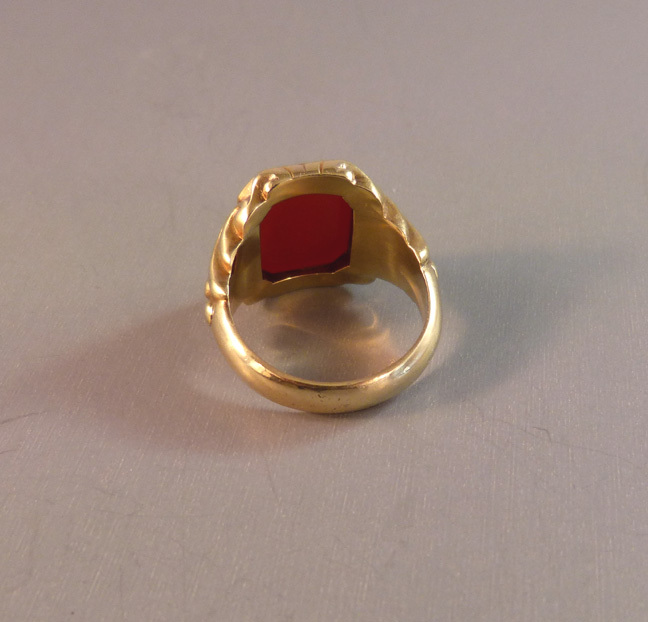 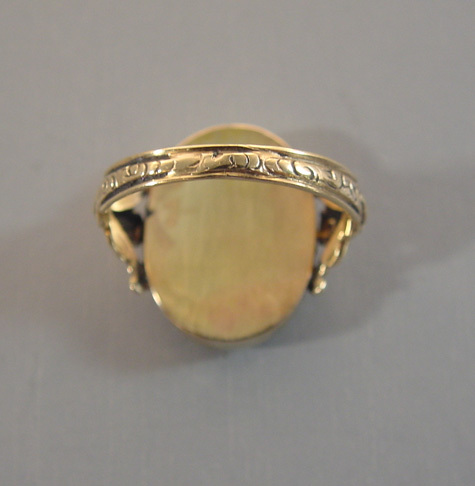 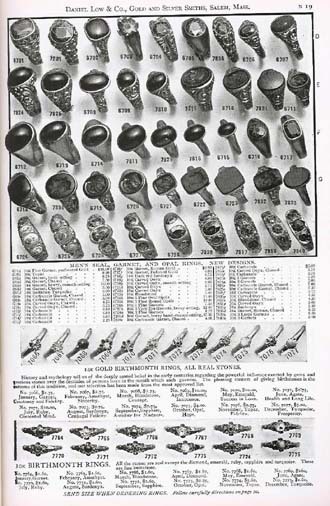 "Fine solid gold and stone rings". 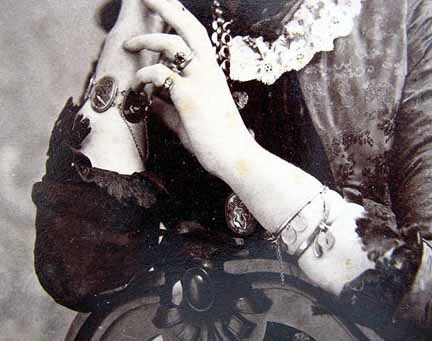 VICTORIAN lady wearing a bar brooch and a chain necklace with rings and coins as charms. 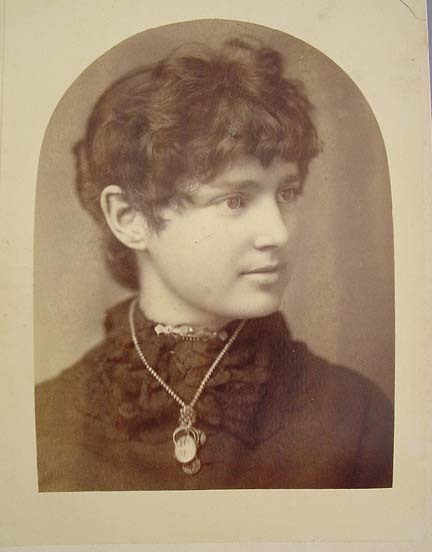 Cabinet card 4-1/4" by 6-1/2" marked "Barron, Sarnia, Ont." 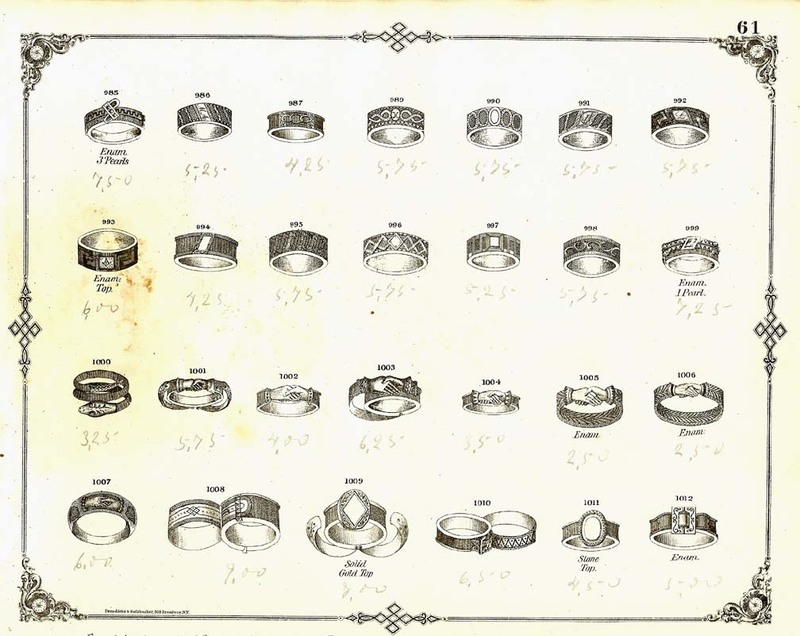 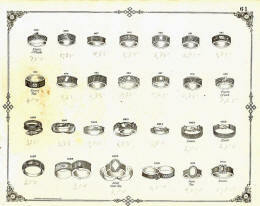 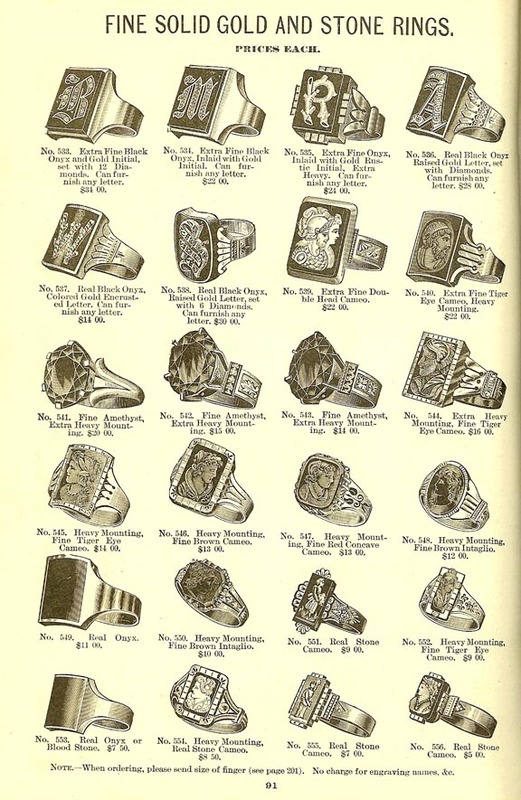 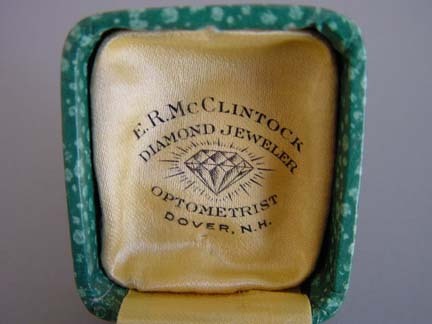 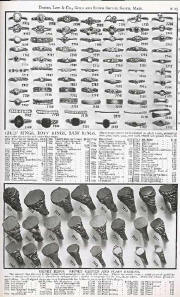 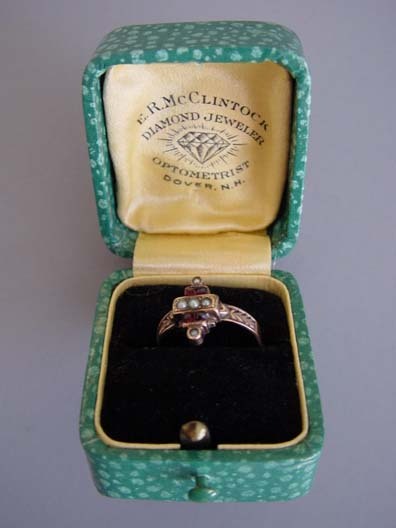 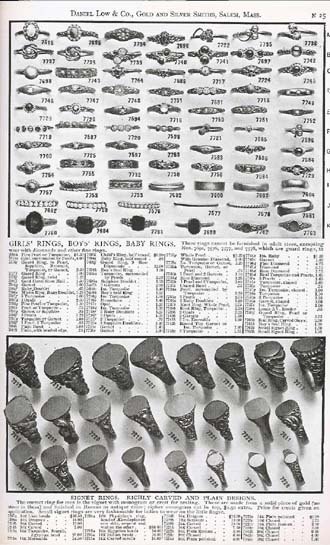 Jewelry catalogues came into vogue along with the mass production of jewelry. 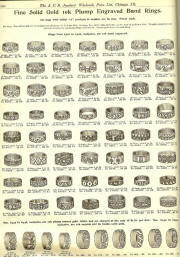 Looking at the illustrations and written descriptions is a definitive way to date pieces. 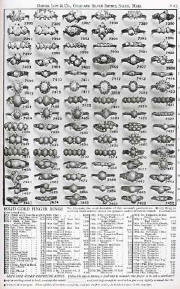 Hair jewelry was still popular and could be fashioned as a home craft or ordered from catalogues. 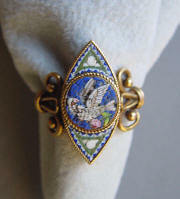 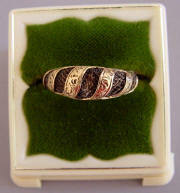 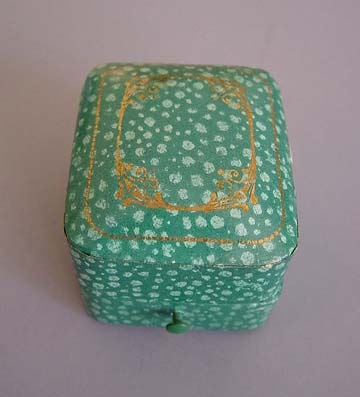 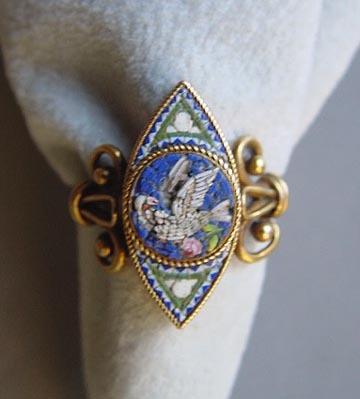 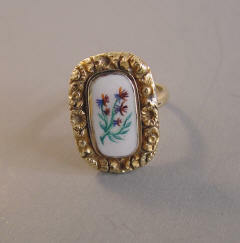 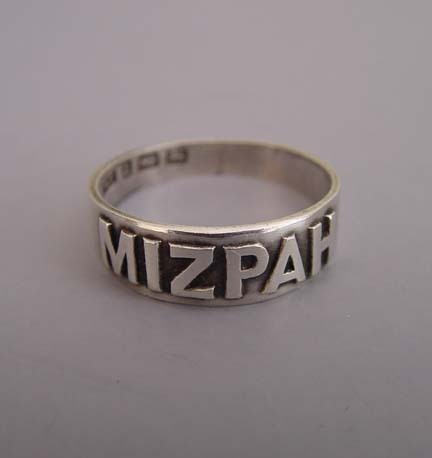 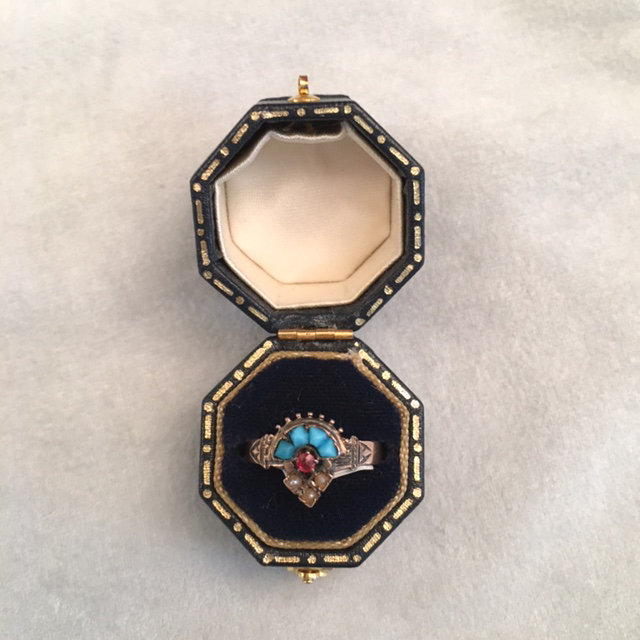 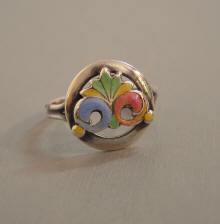 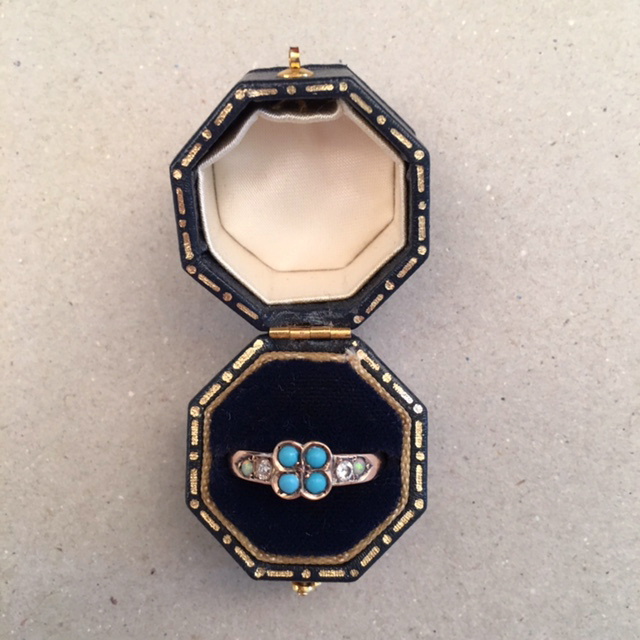 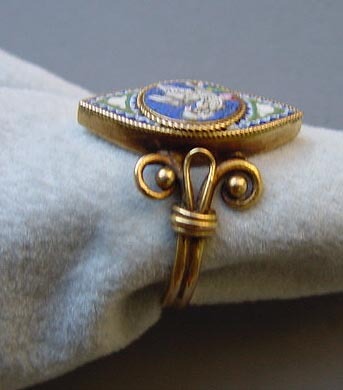 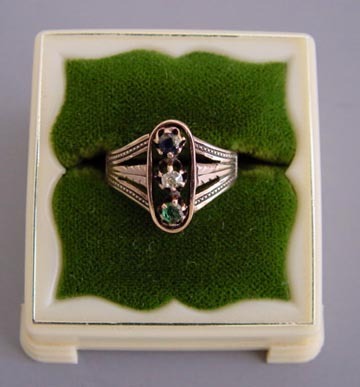 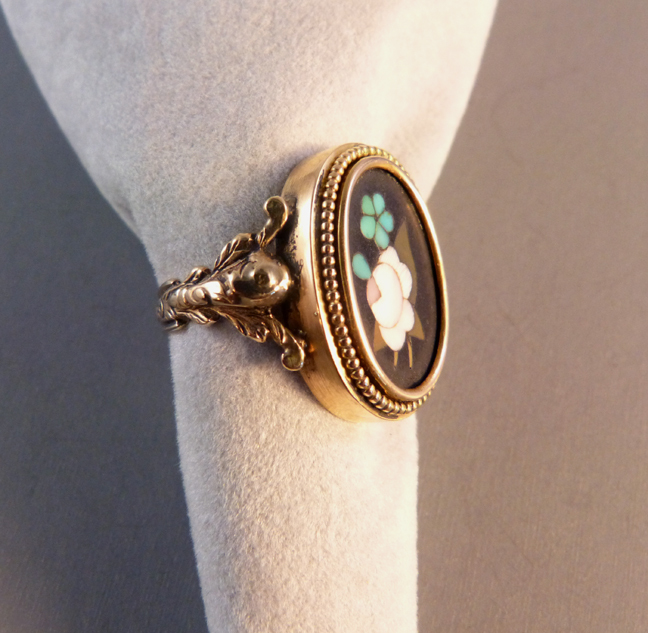 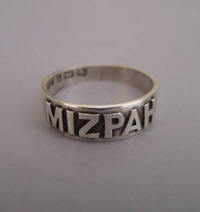 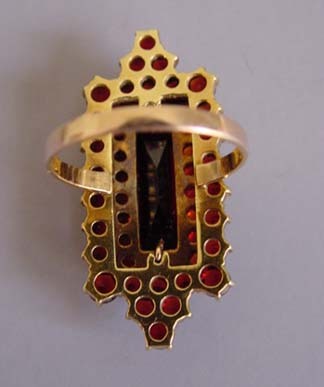 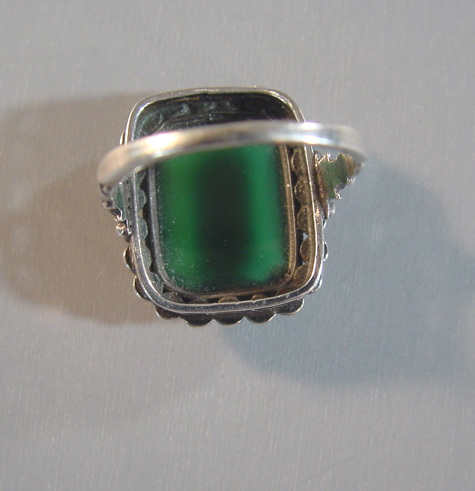 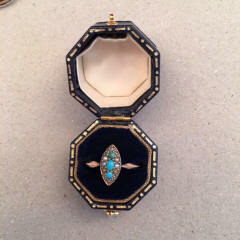 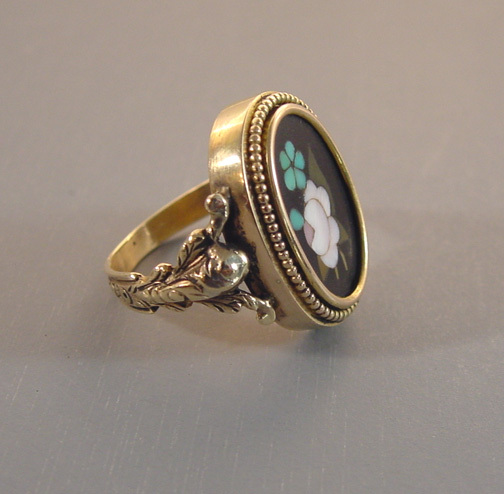 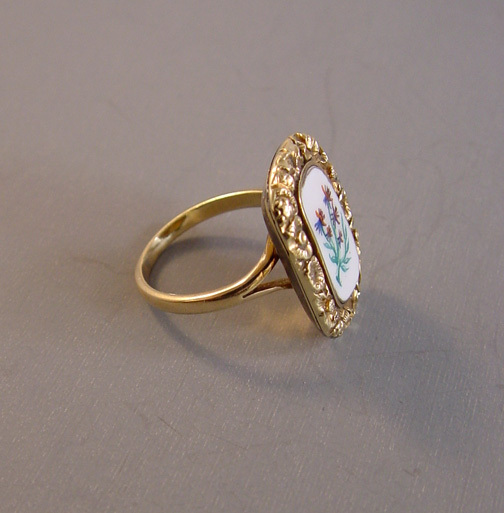 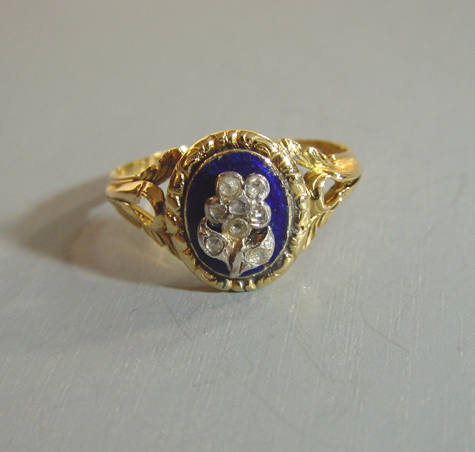 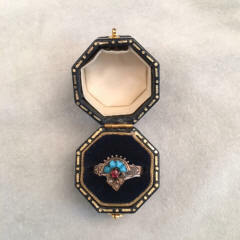 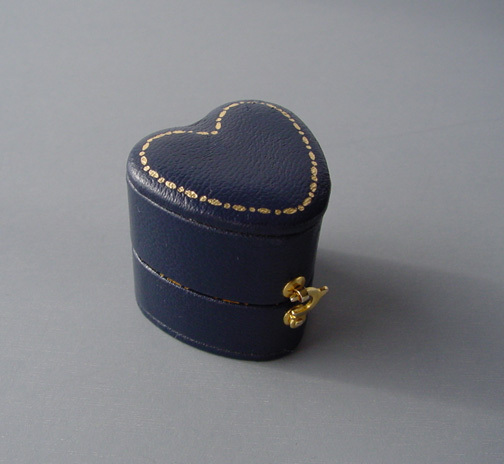 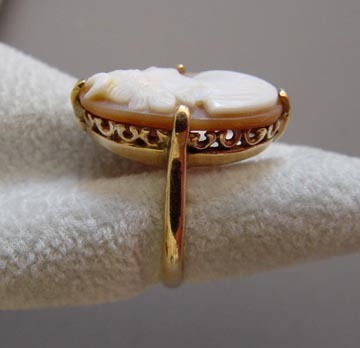 Taille d'epargne enamel work became very popular, as did mosaic and Mizpah rings. 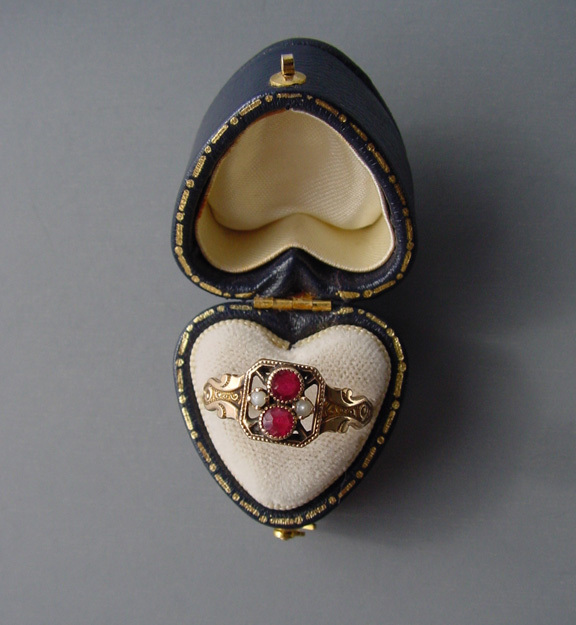 Jewelry of this era can be a bit heavier and more somber that later jewelry.